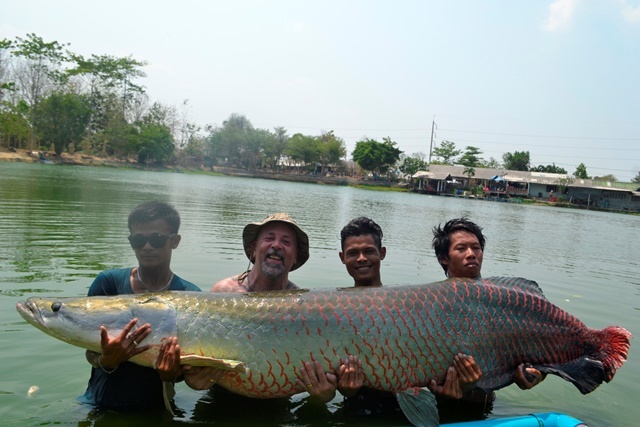 The smile says it all for Richard Clarke as he joined the exclusive Palm Tree Lagoon 400lb Arapaima Club with a much more than awesome monstrous specimen. 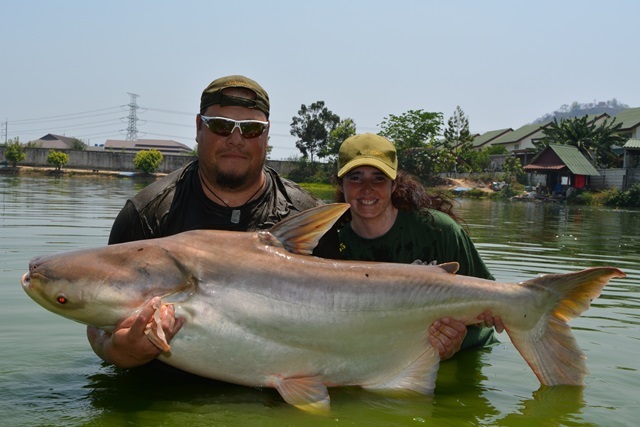 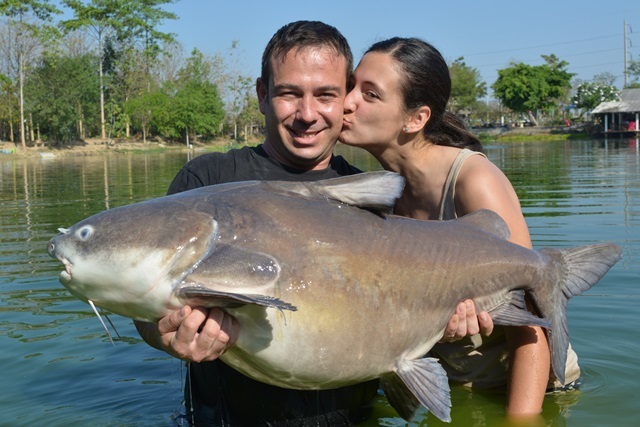 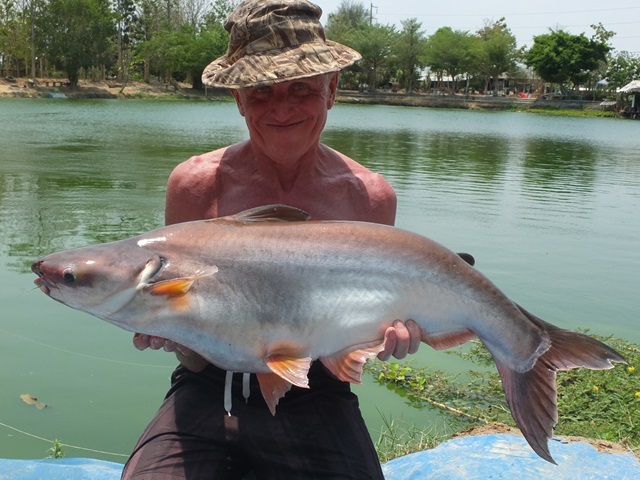 In addition he landed a variety of other great fish that included Mekong catfish, big-Y catfish, rohu, Siamese carp and both Asian and Amazon redtails. 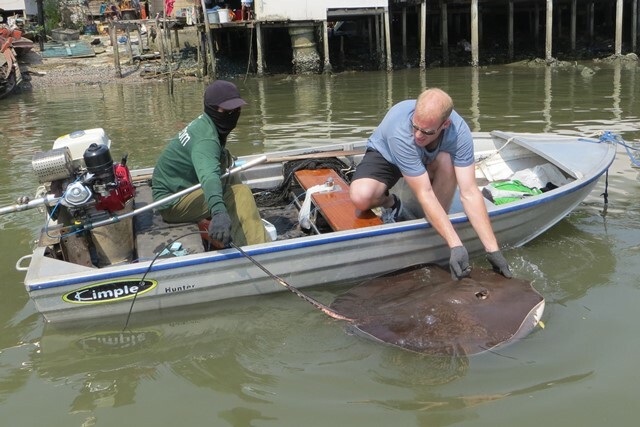 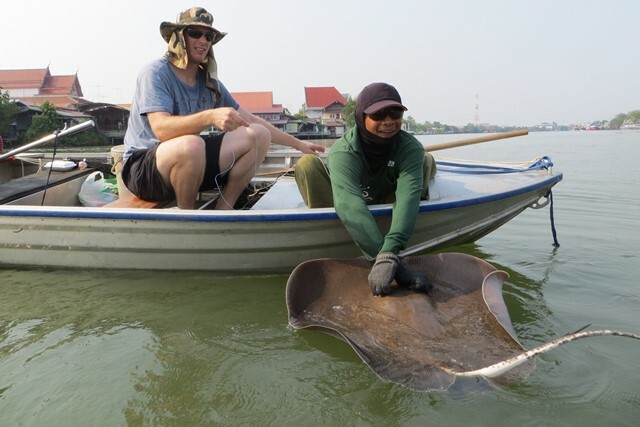 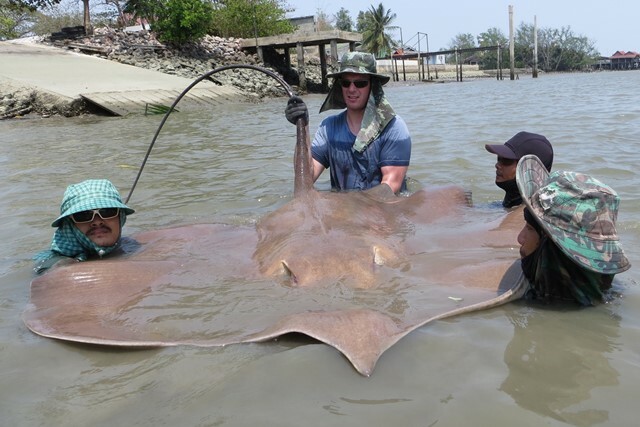 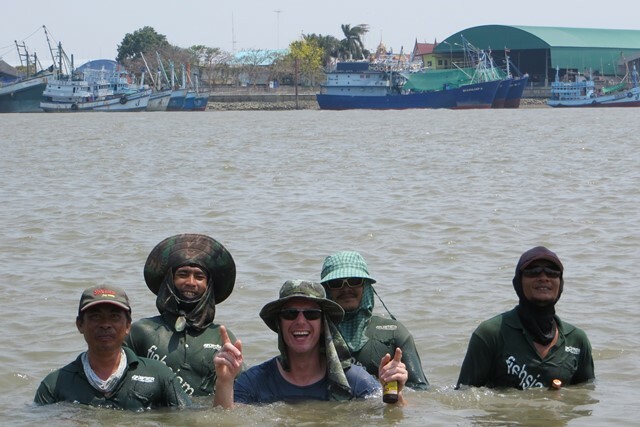 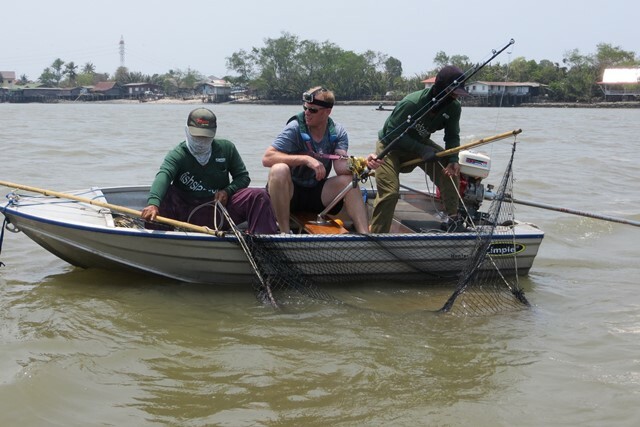 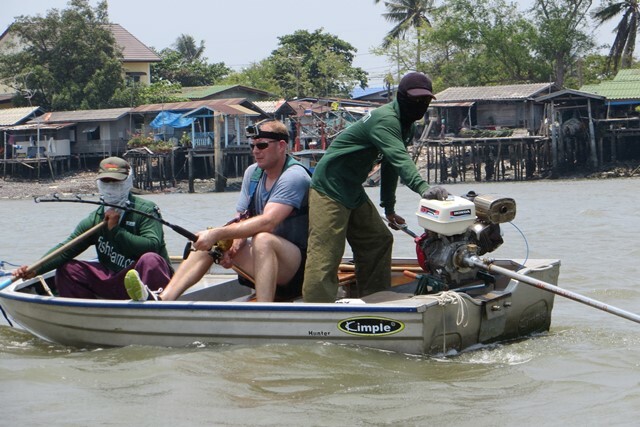 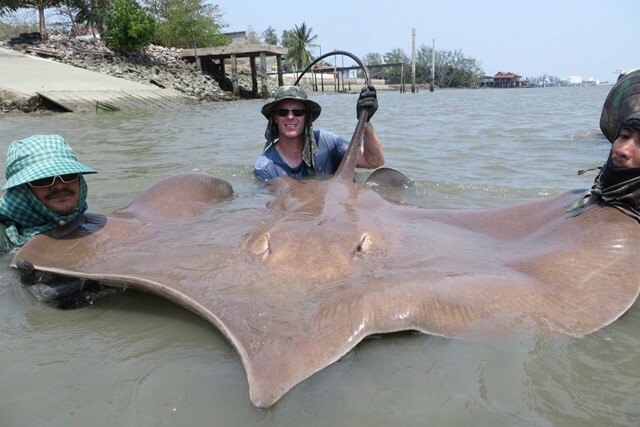 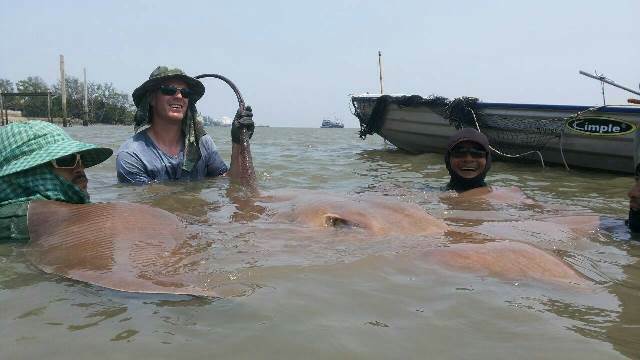 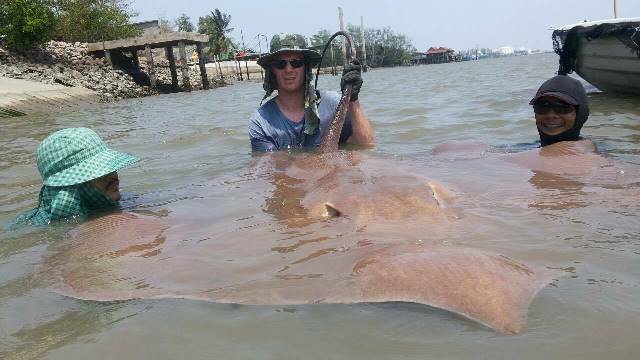 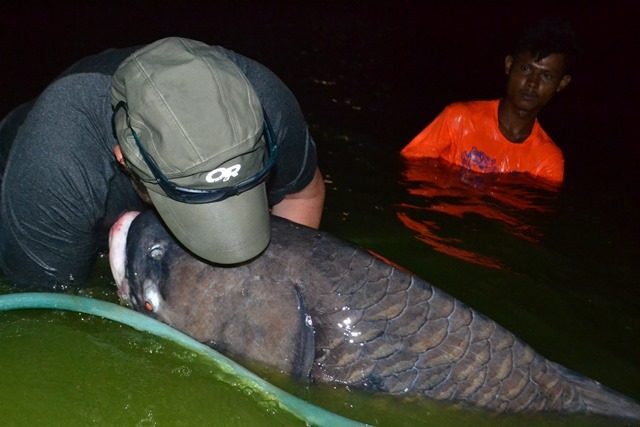 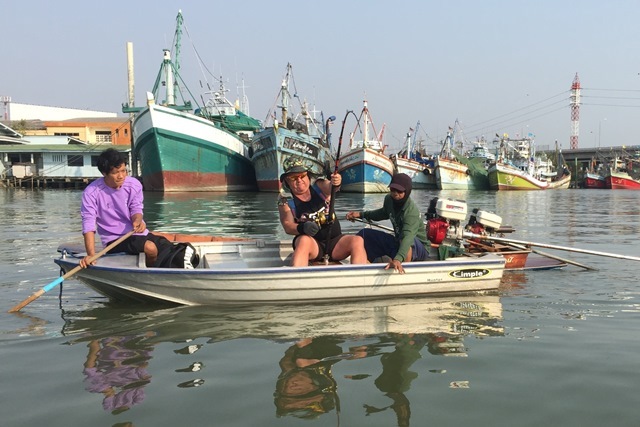 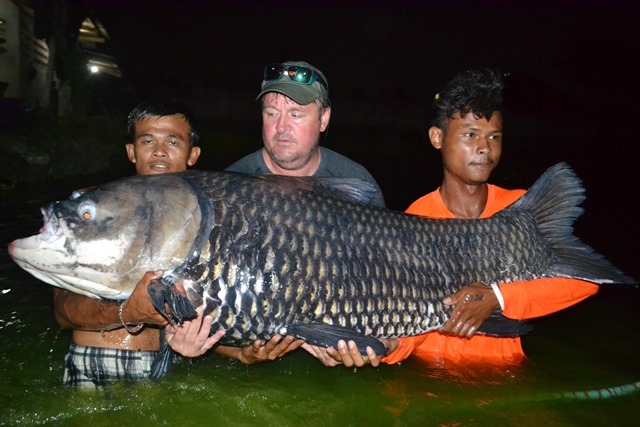 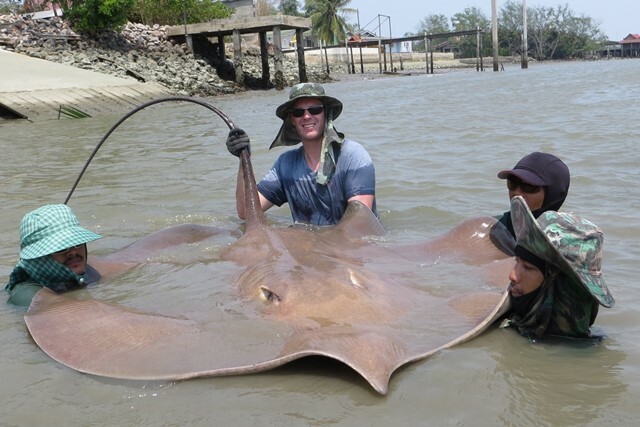 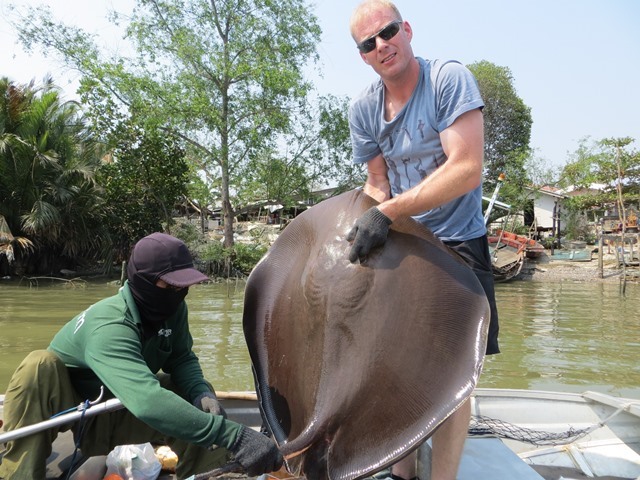 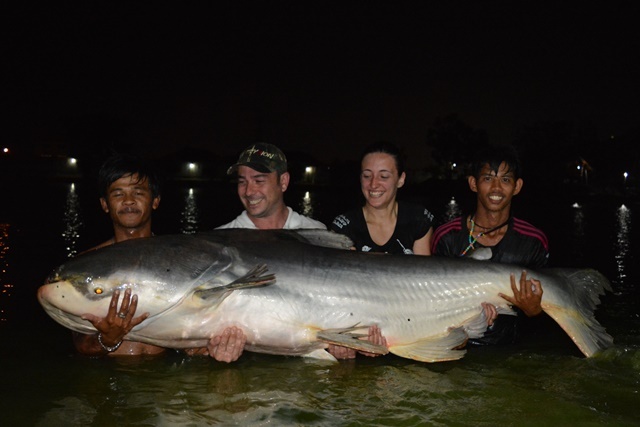 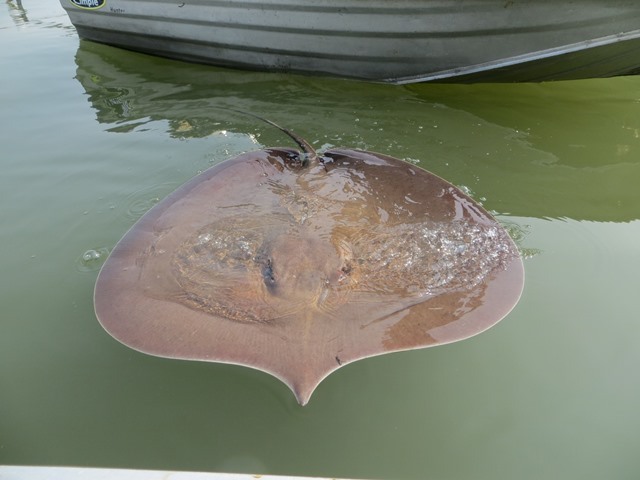 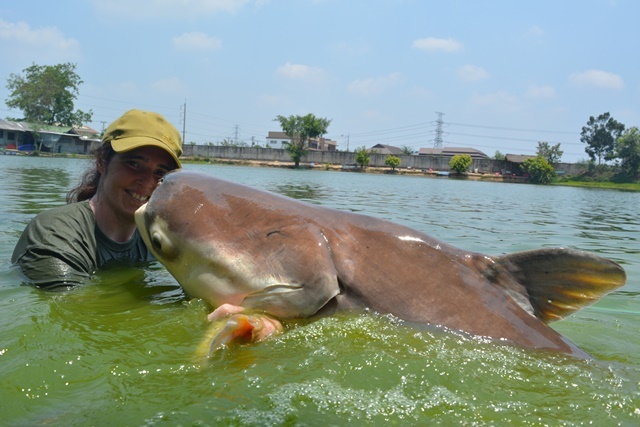 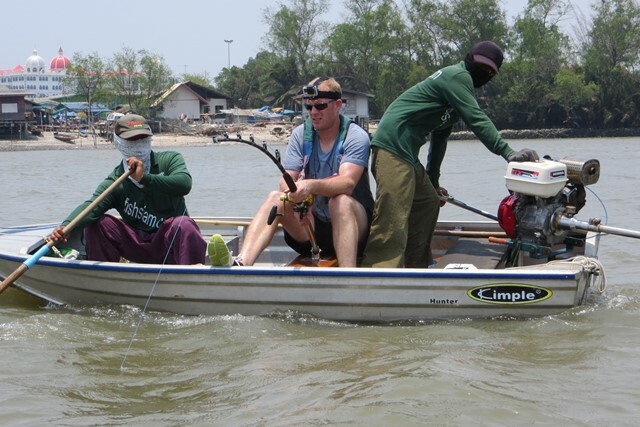 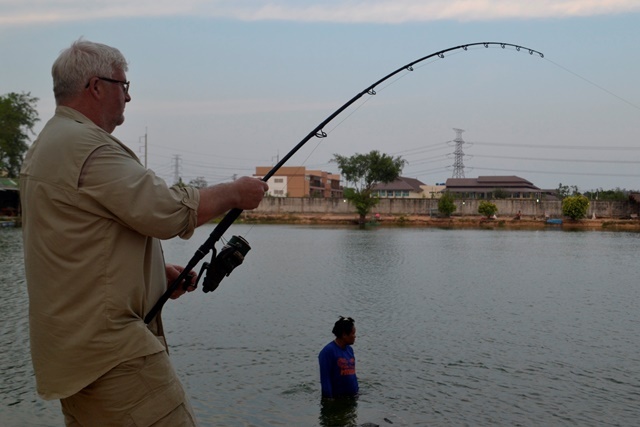 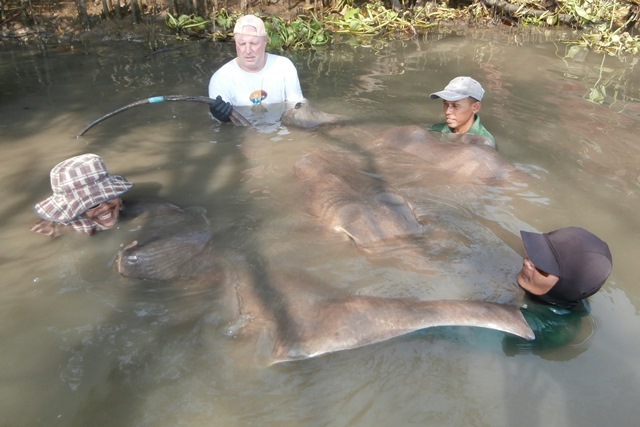 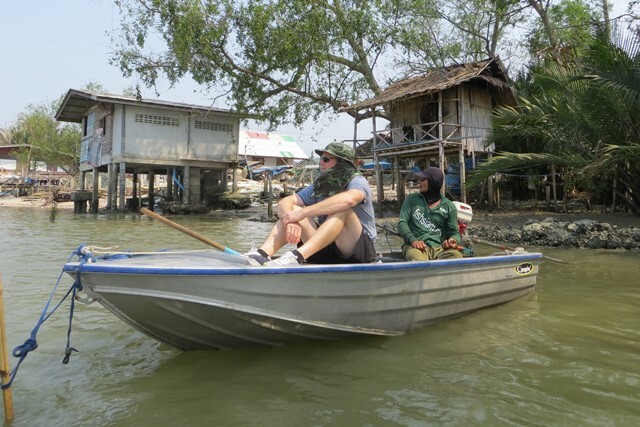 Well what a session Dutch angler Harm Van Holsteijn had fishing on the Mae Klong catching a total of four giant freshwater stingray and a bull shark to boot. 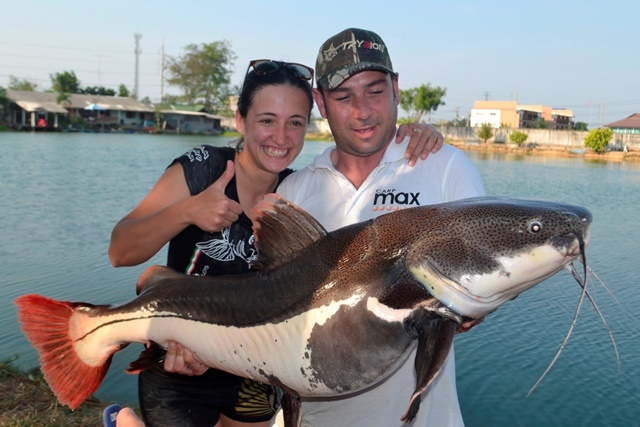 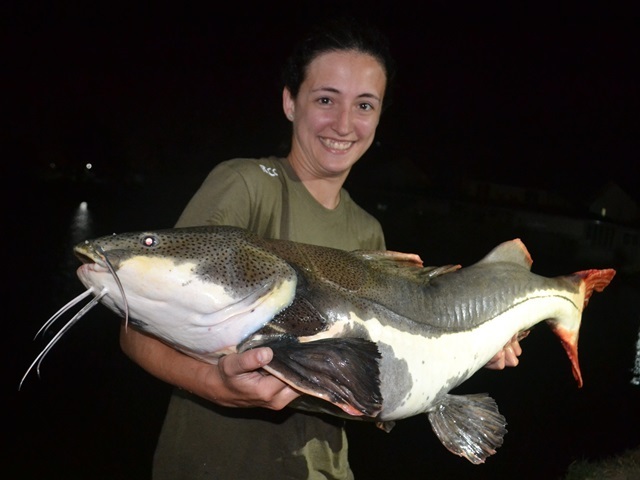 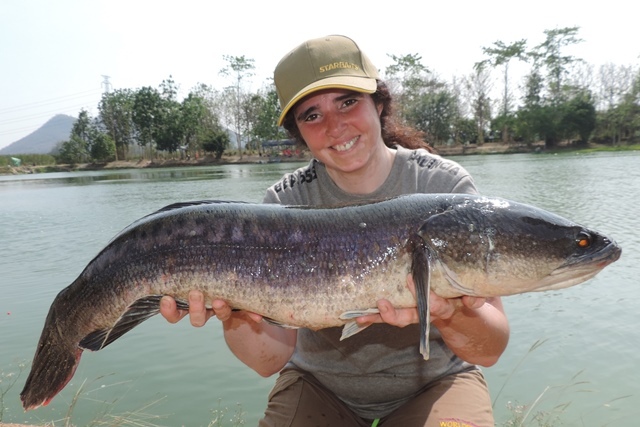 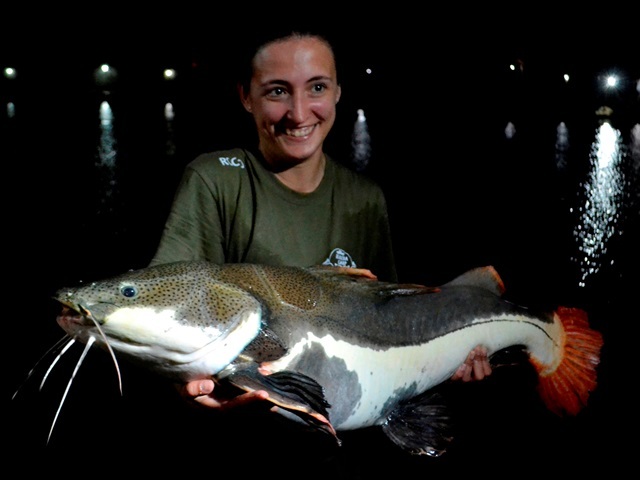 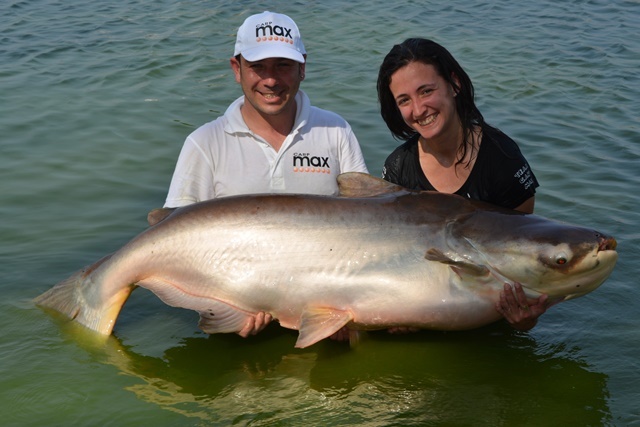 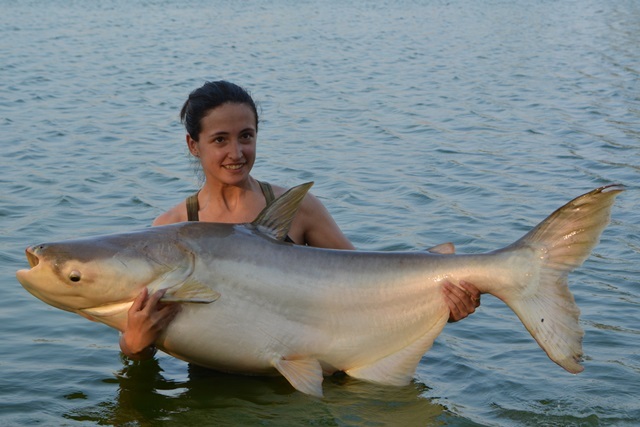 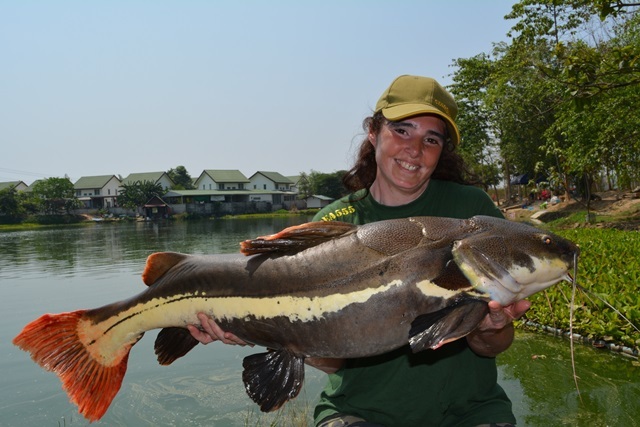 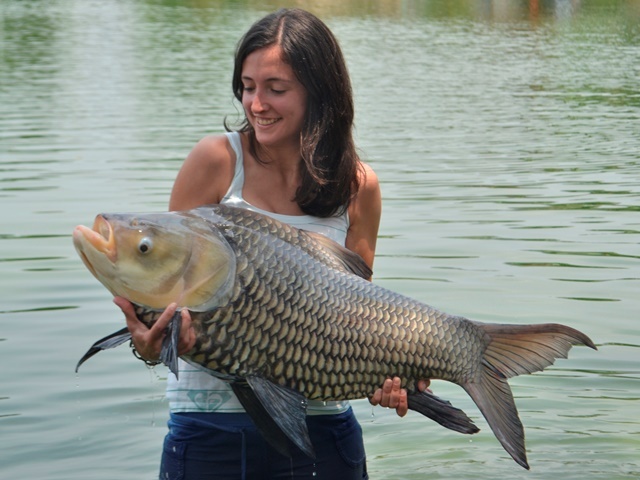 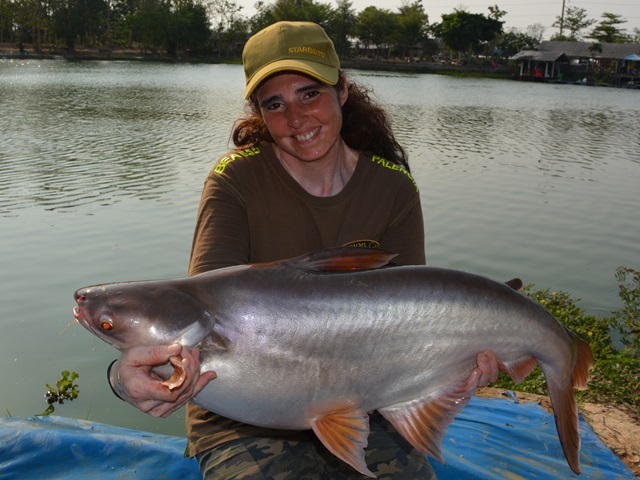 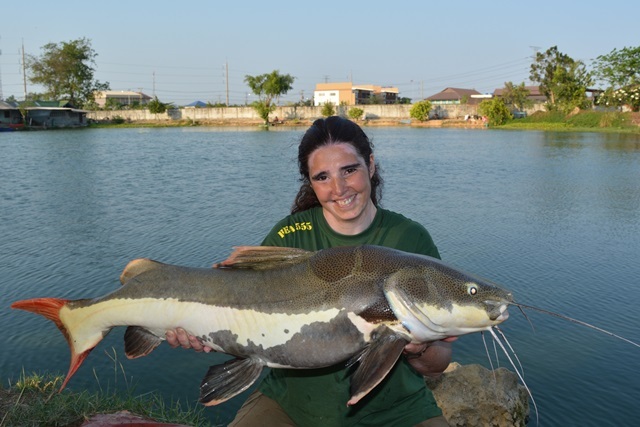 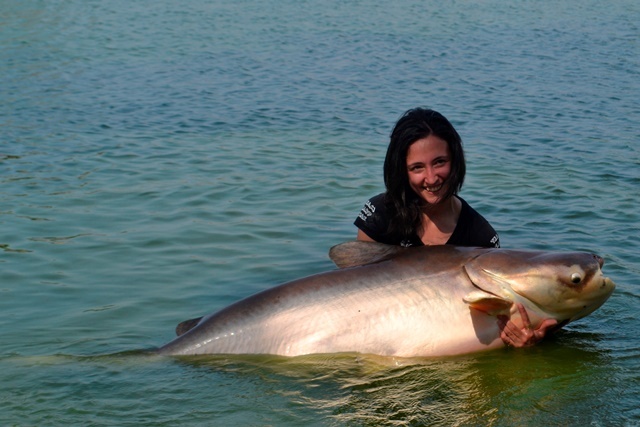 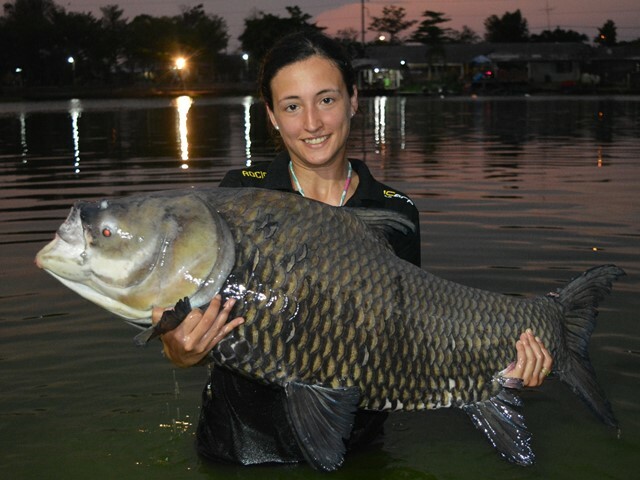 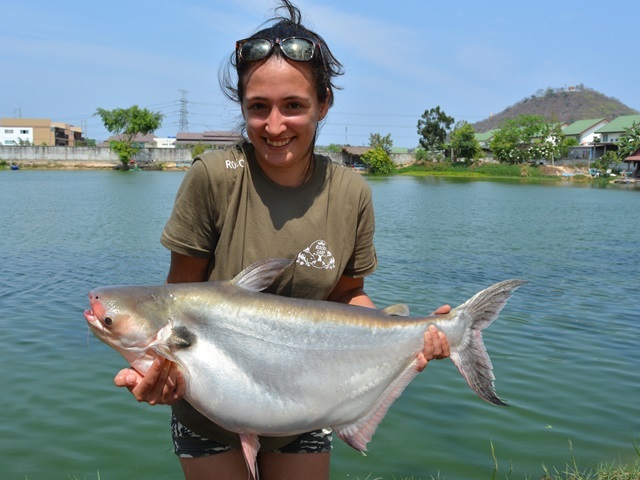 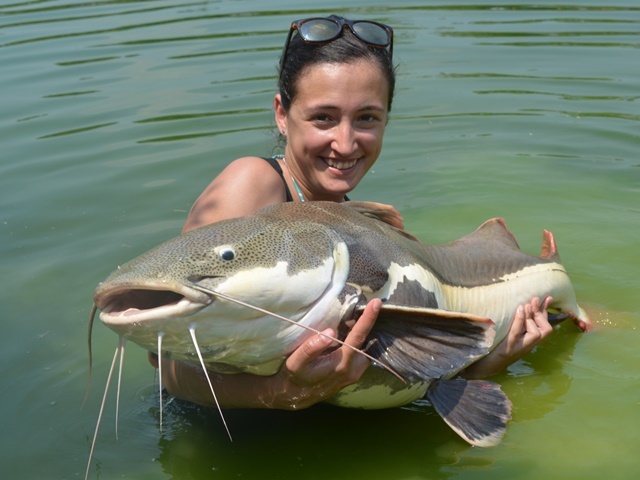 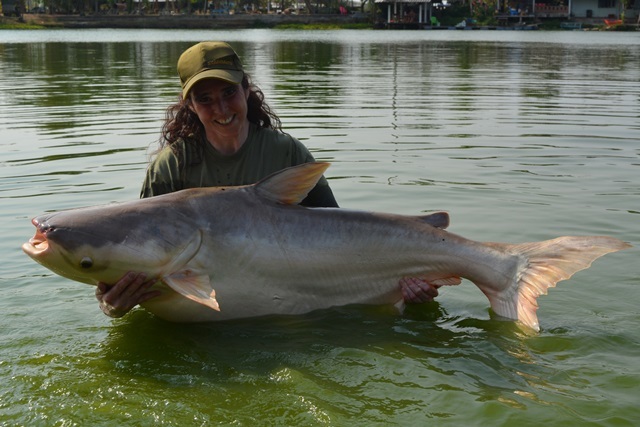 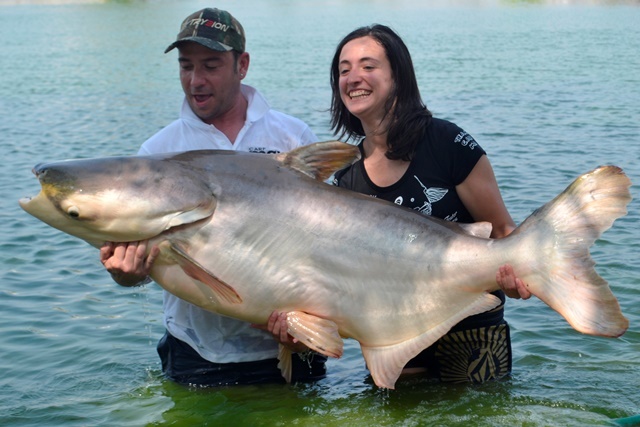 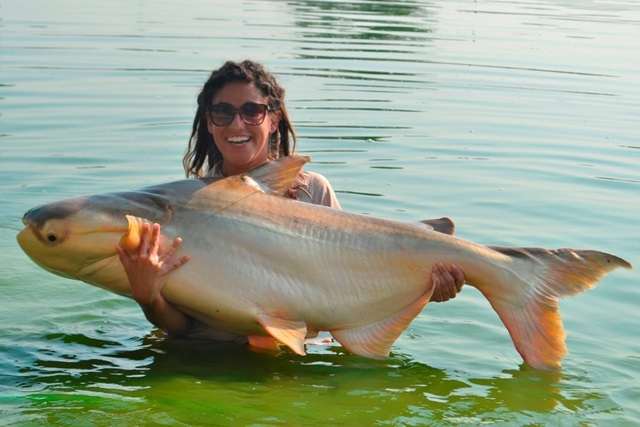 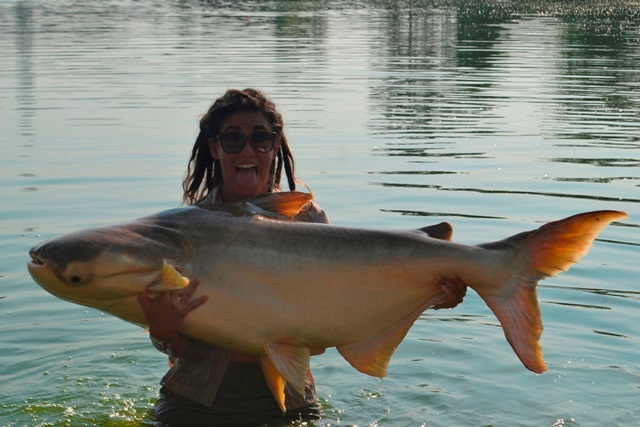 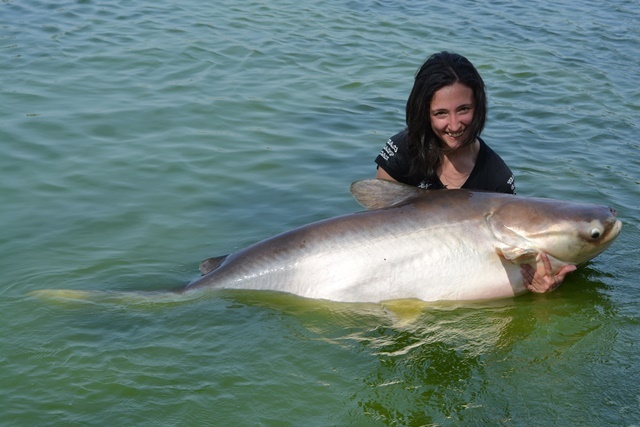 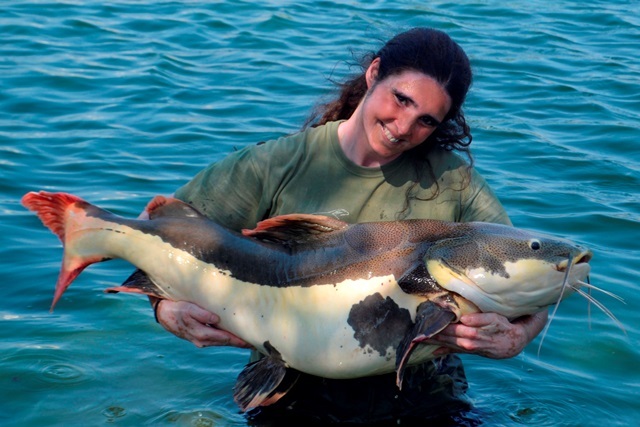 Spanish angler Rocio was off to a great start on her fist day becoming the first female angler to join the Palm Tree Lagoon 300lb Catfish Club after successfully battling the monster fish unaided for over two and a half hours.She was all smiles as she went onto catch a number of other stunning fish that included black ear catfish, alligator gar, Siamese carp, tiger catfish, Juliens golden price carp, albino chao phraya, wallago attu, big-Y catfish and both Thai and Amazon redtails. 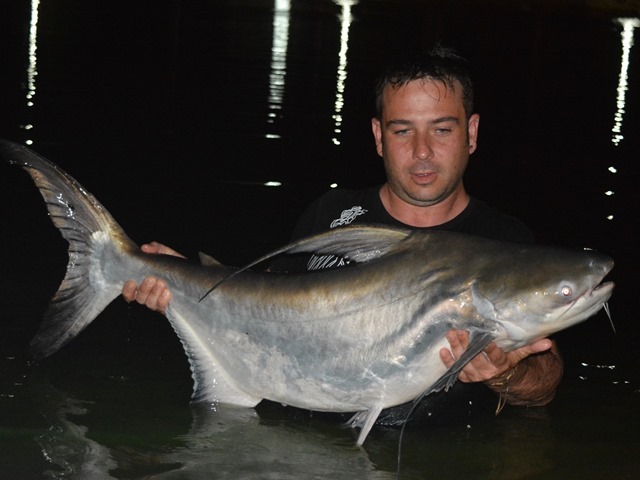 What a great session another Spanish angler Jose Perez Hernandez had. 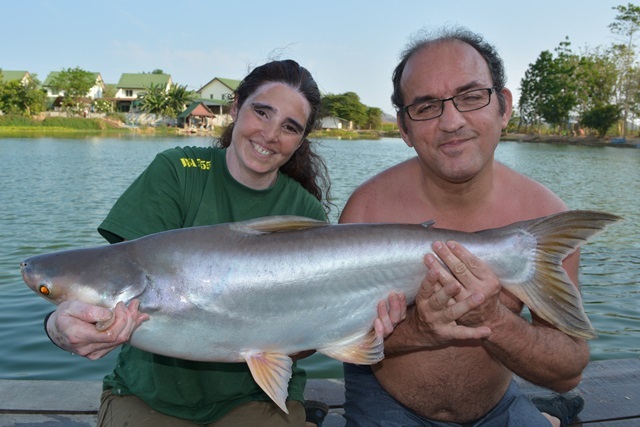 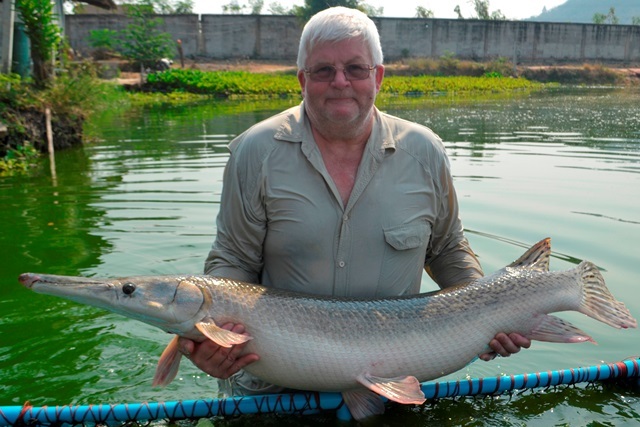 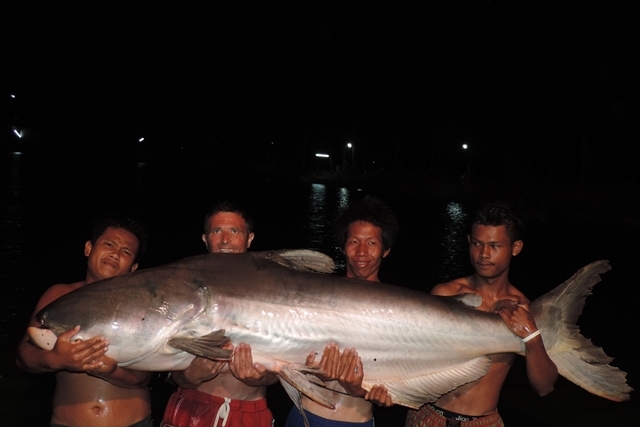 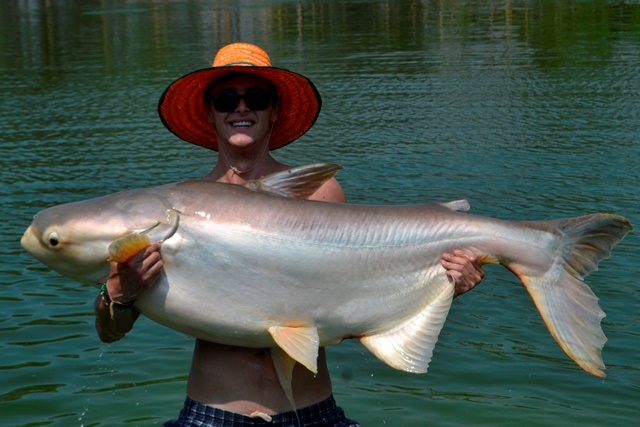 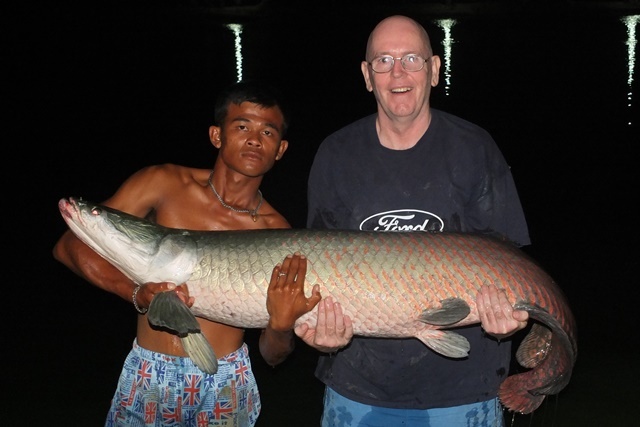 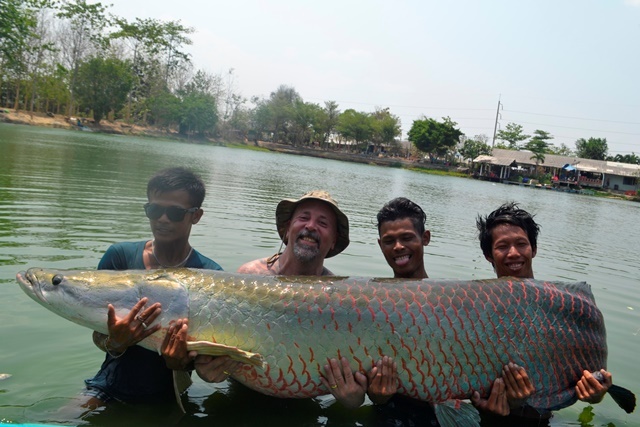 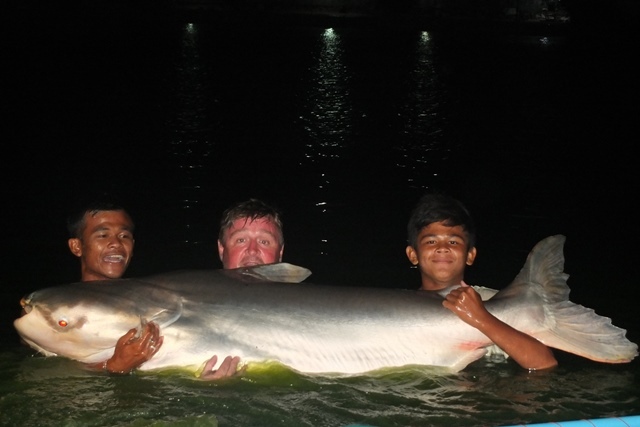 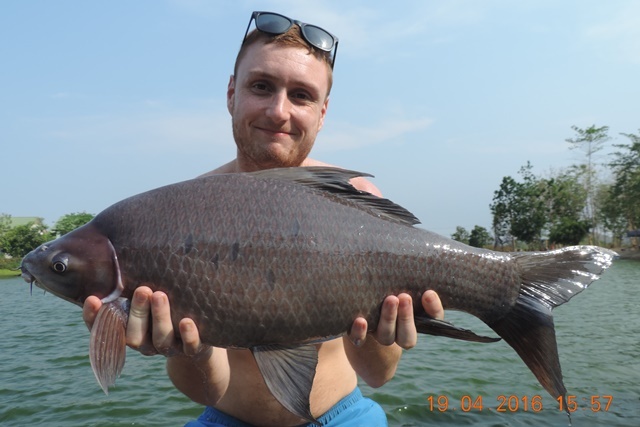 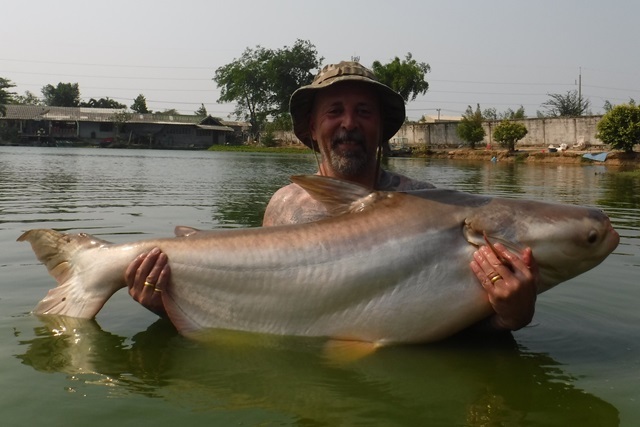 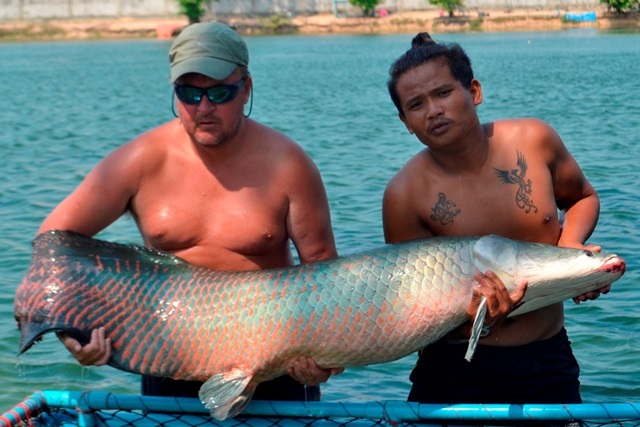 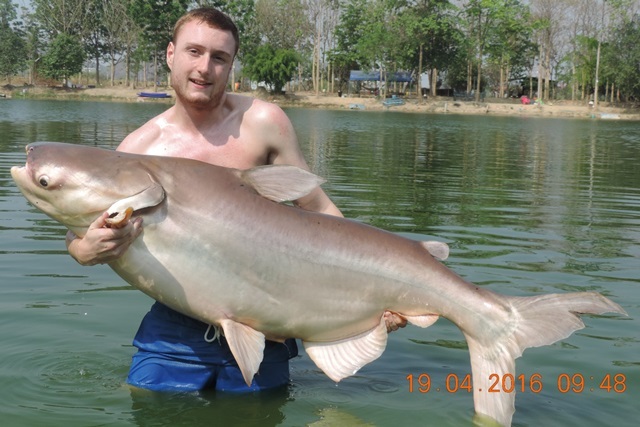 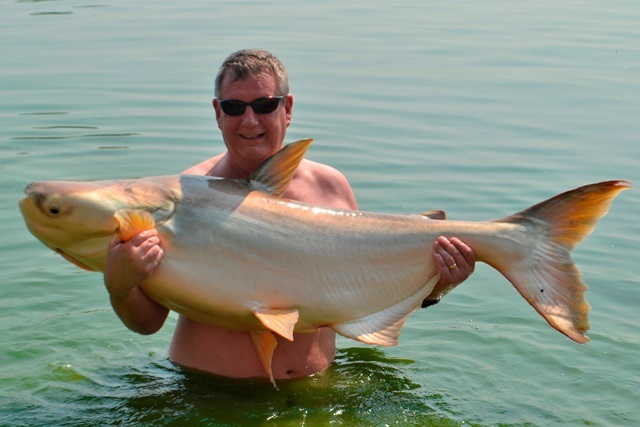 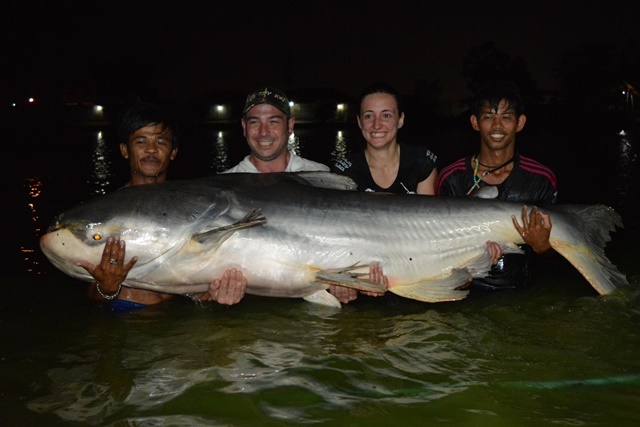 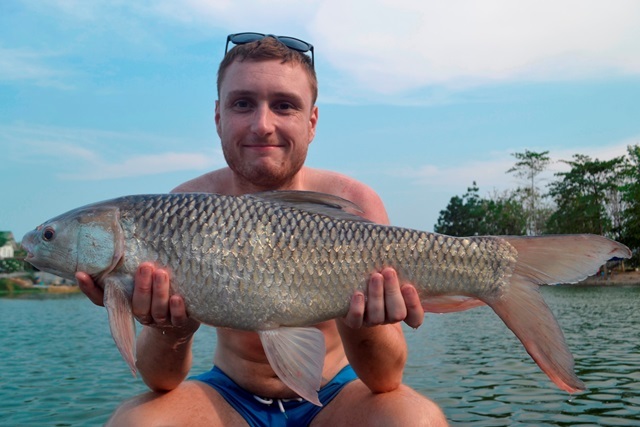 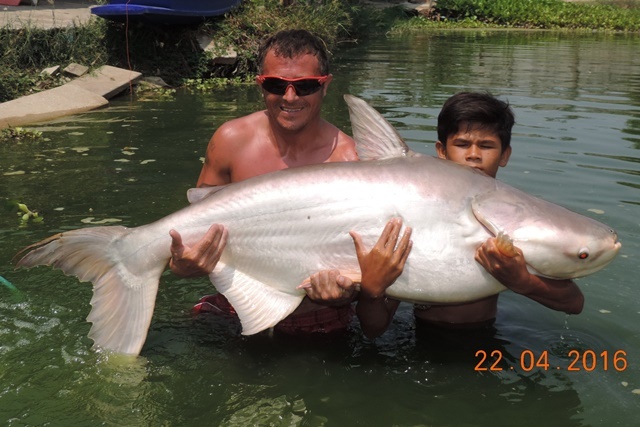 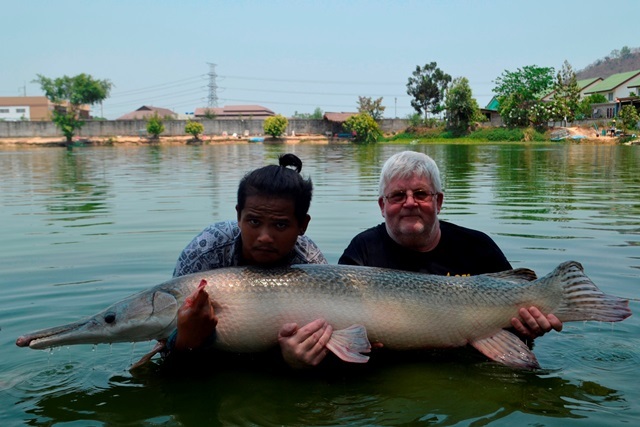 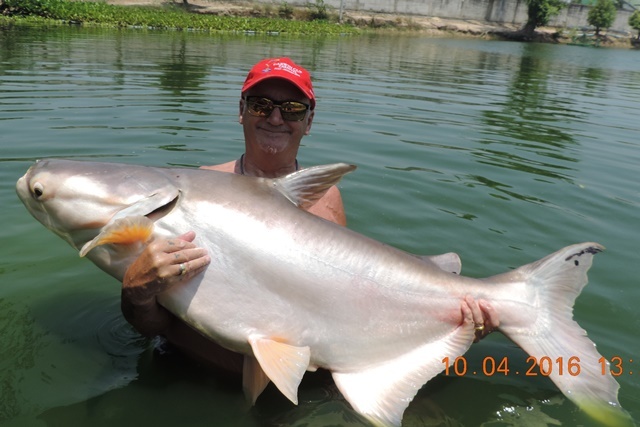 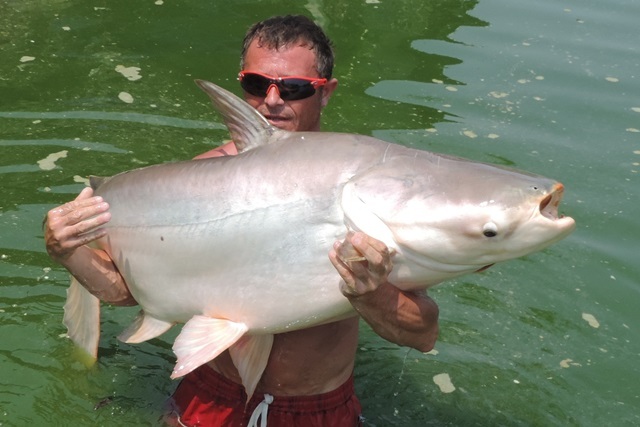 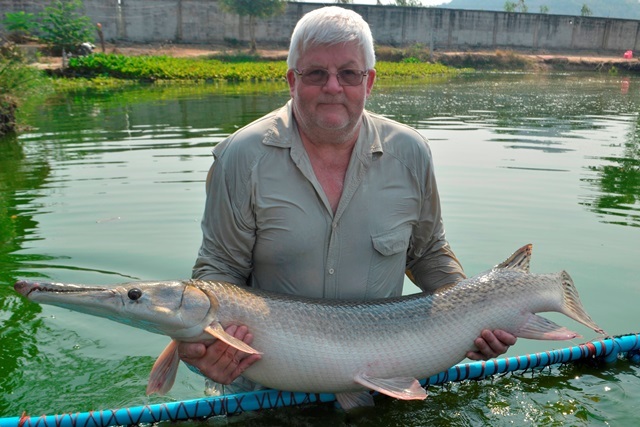 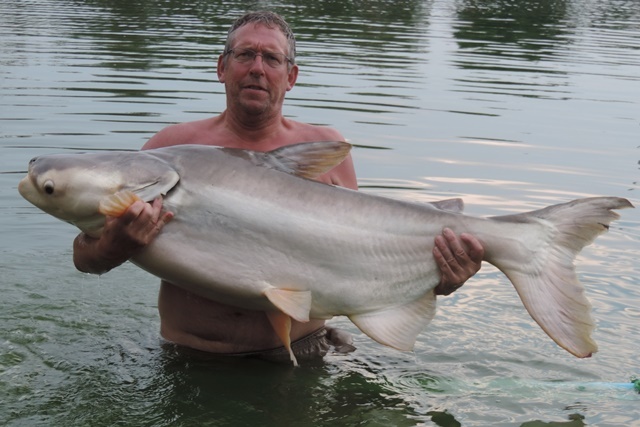 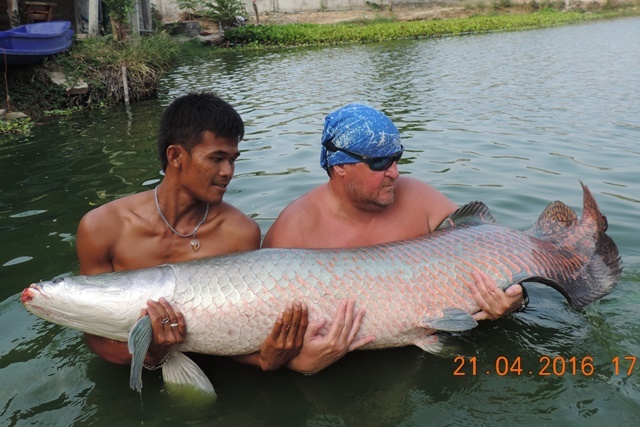 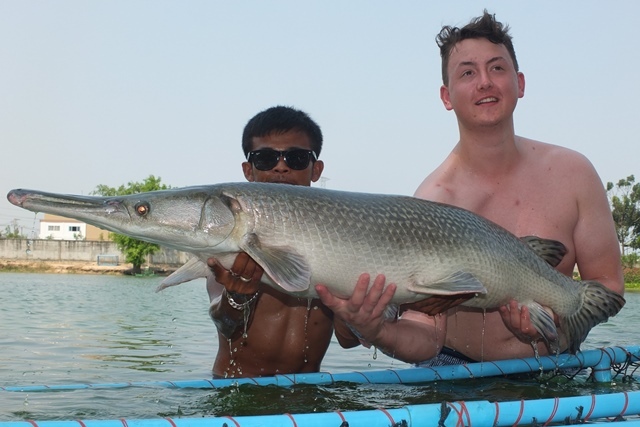 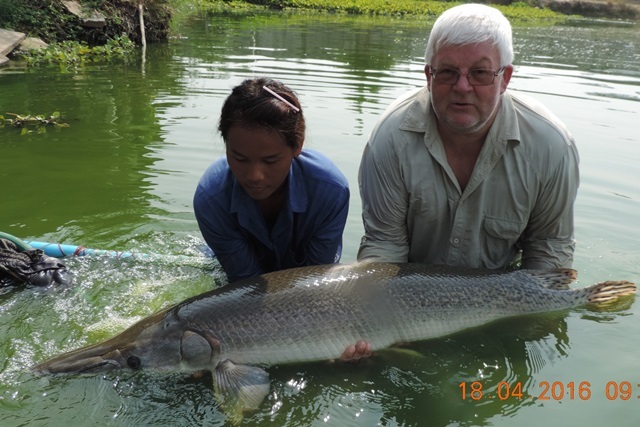 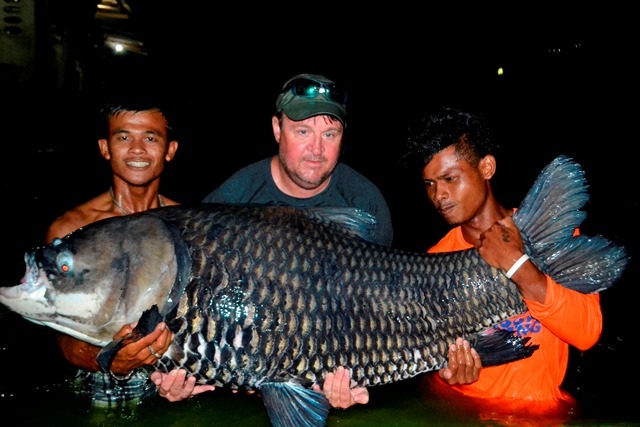 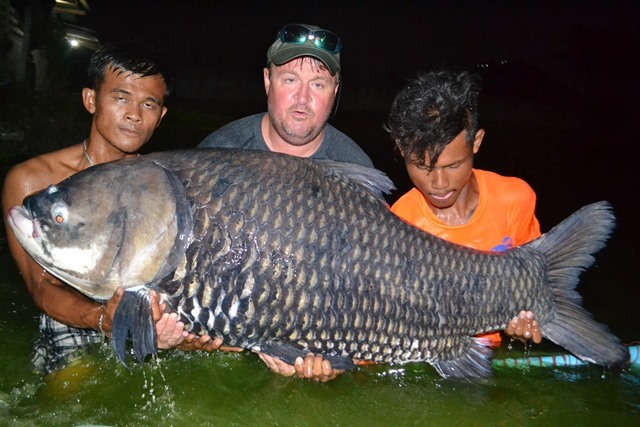 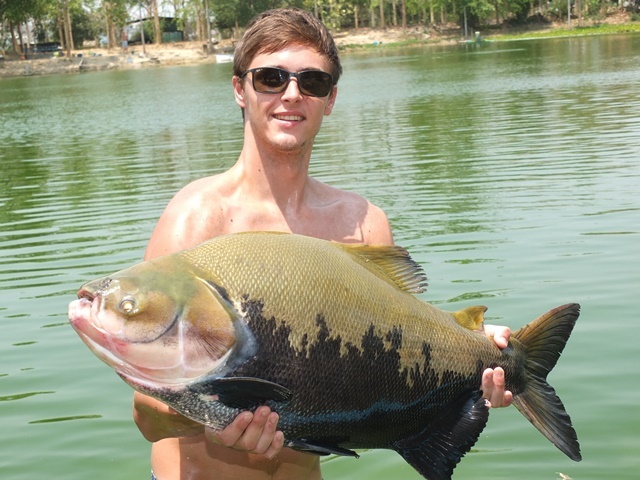 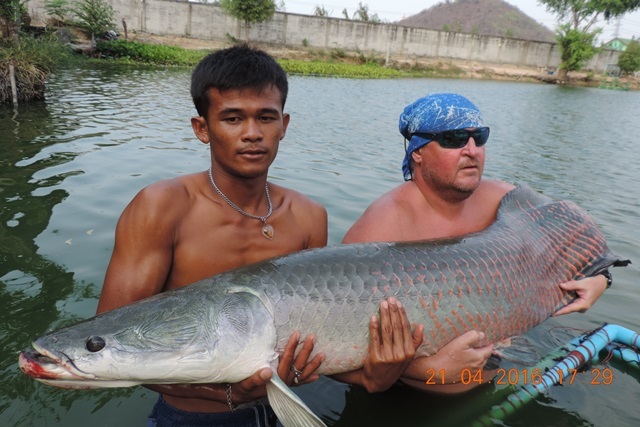 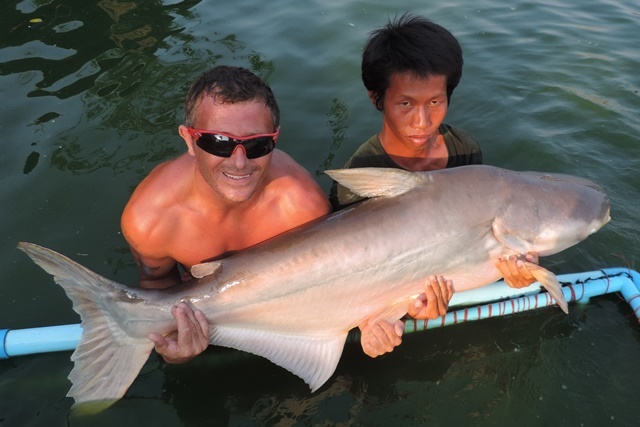 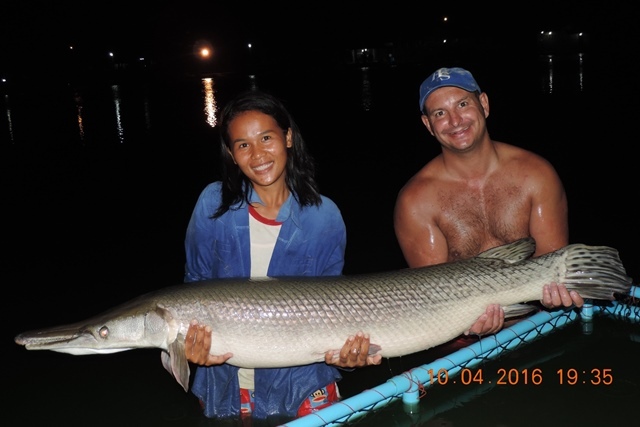 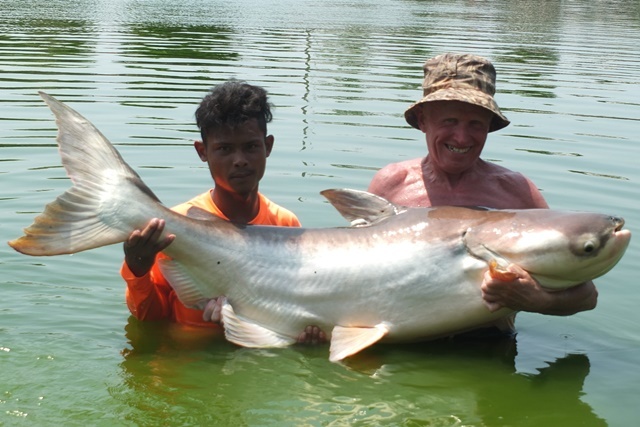 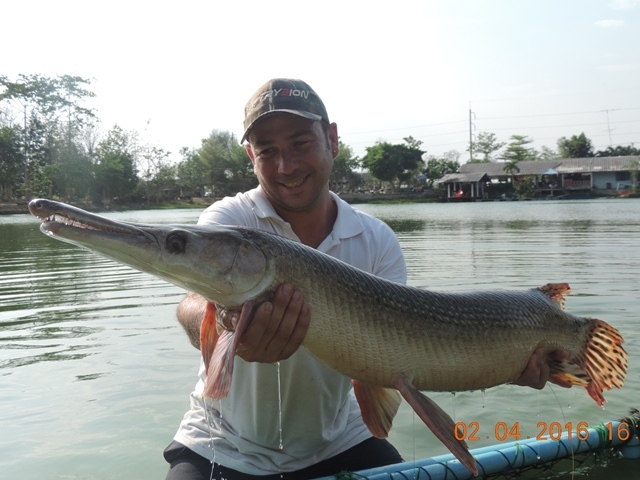 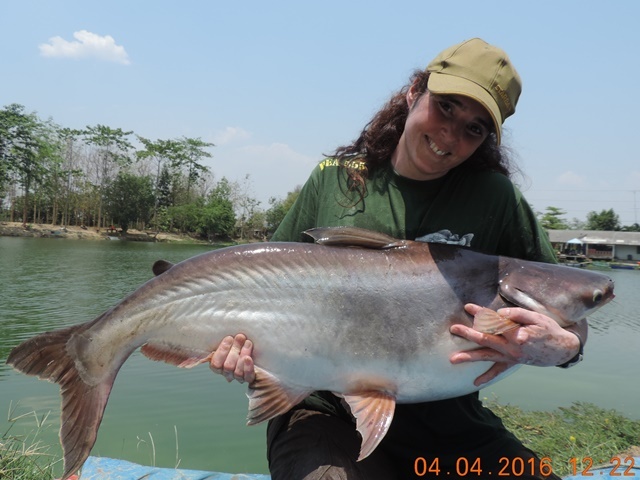 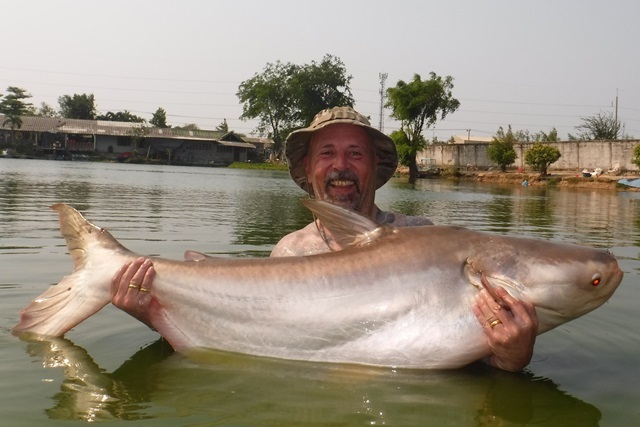 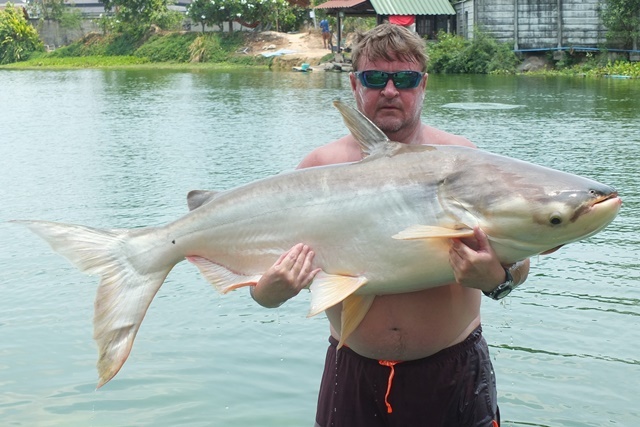 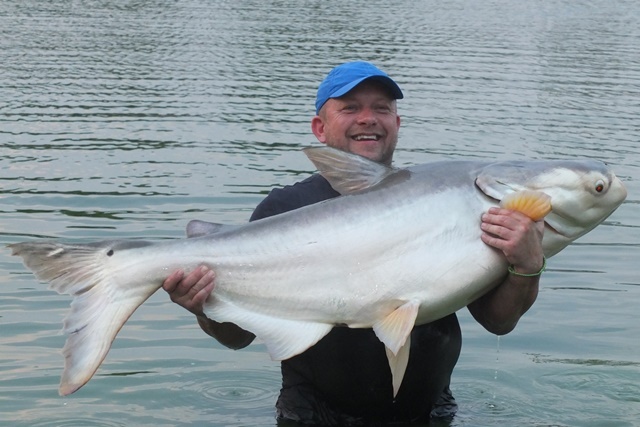 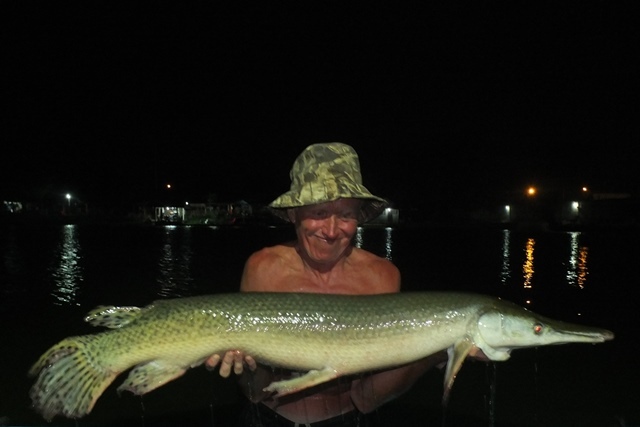 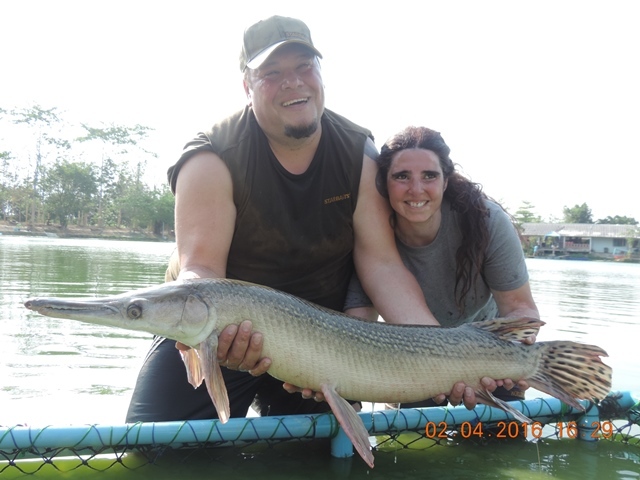 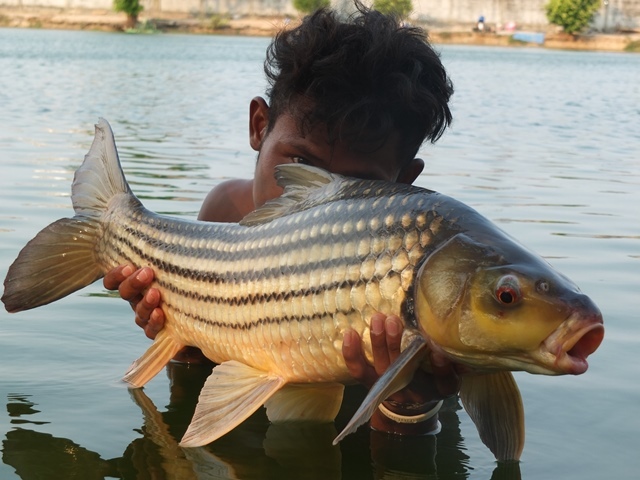 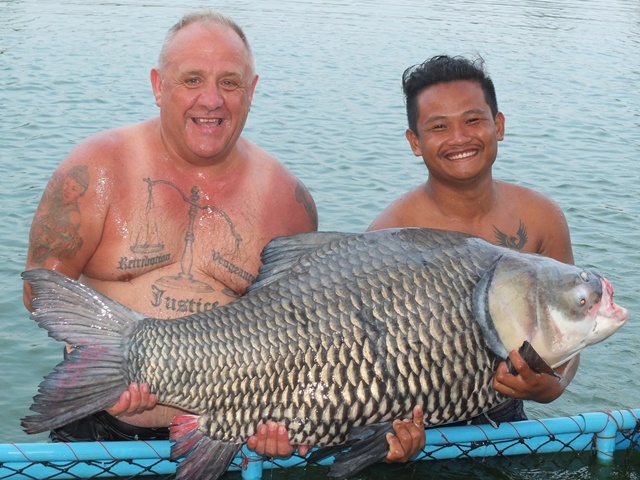 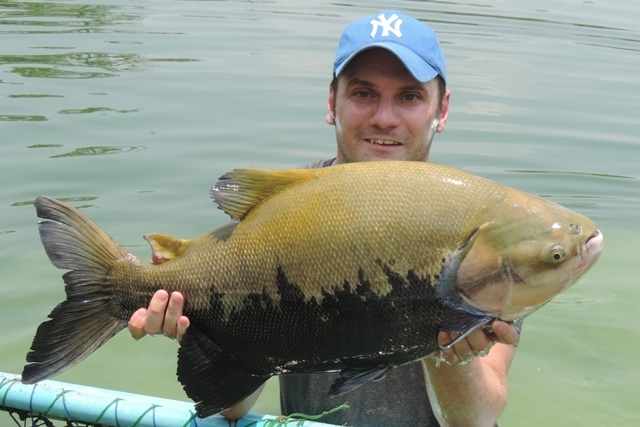 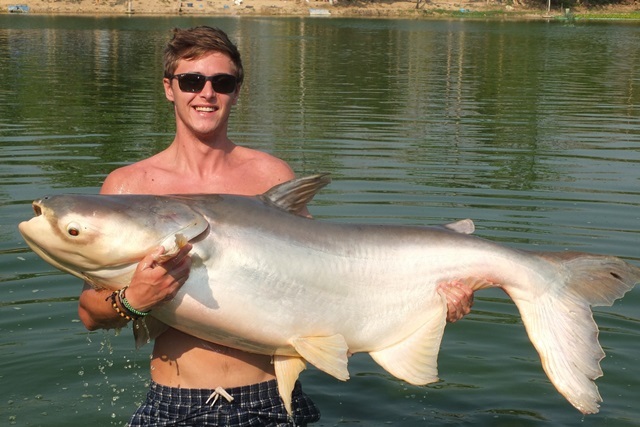 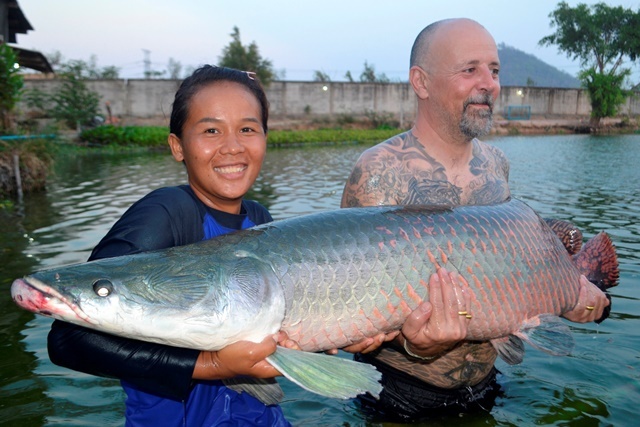 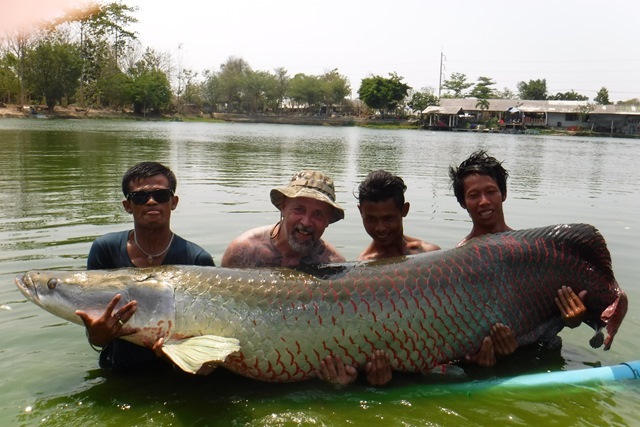 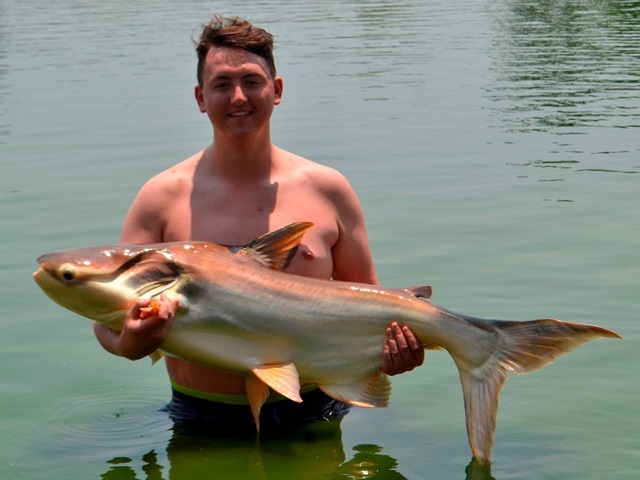 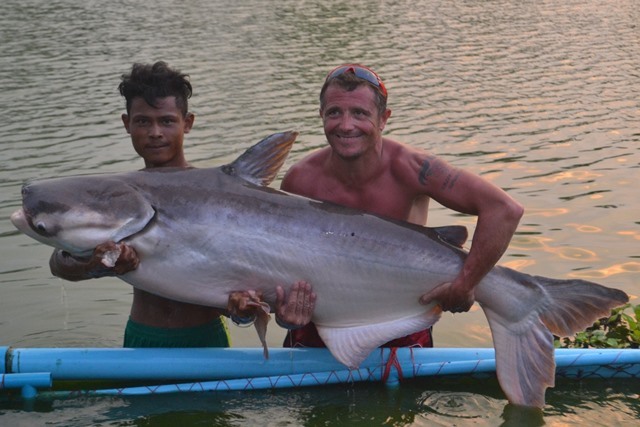 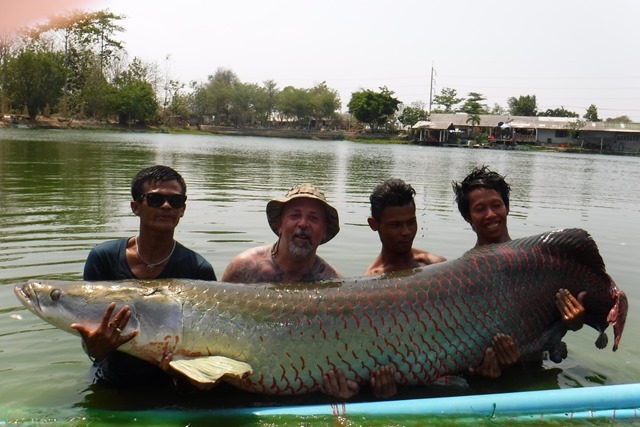 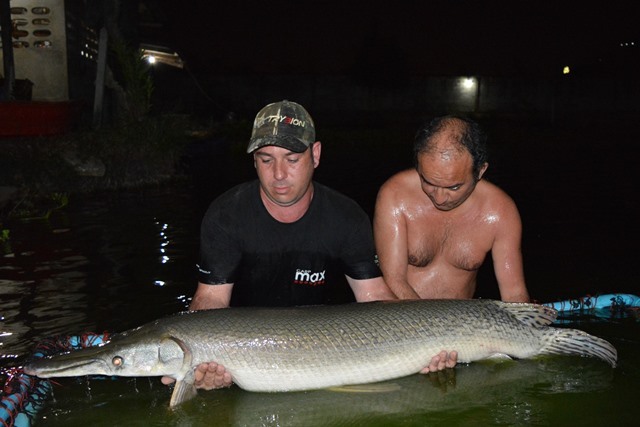 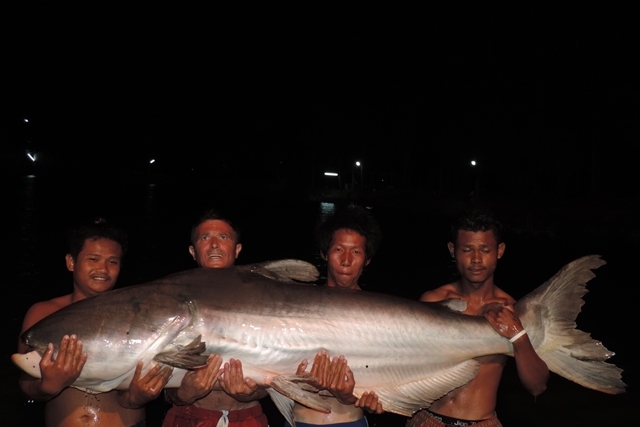 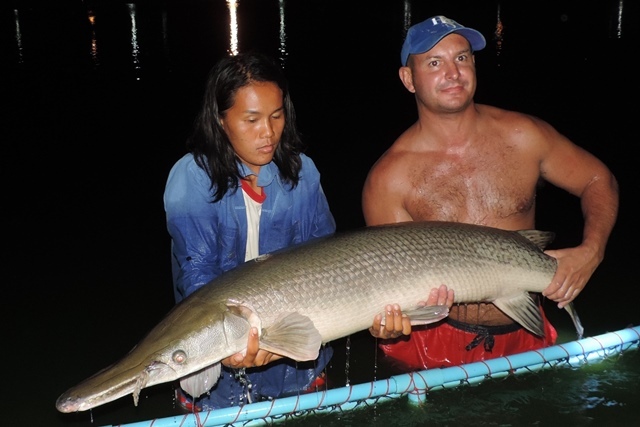 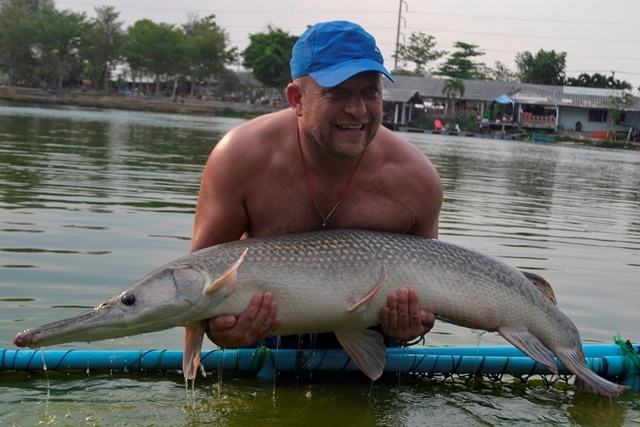 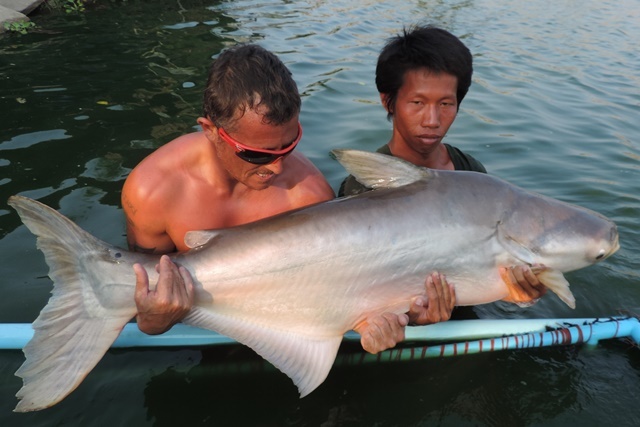 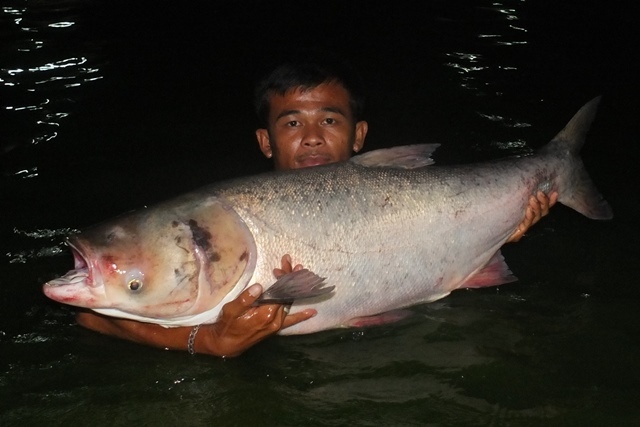 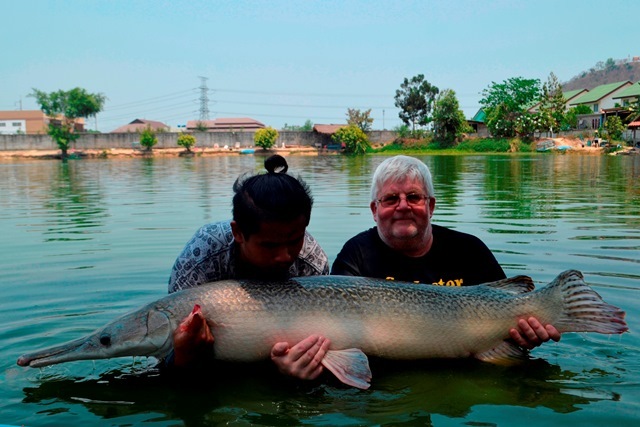 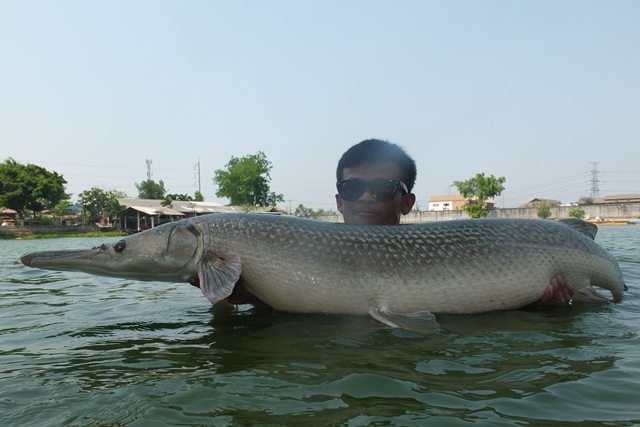 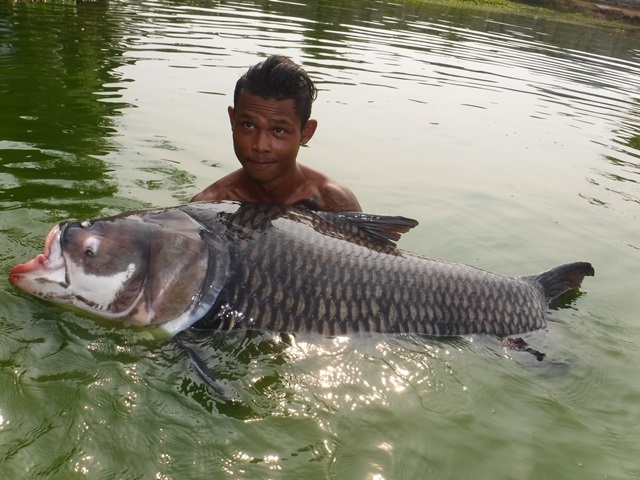 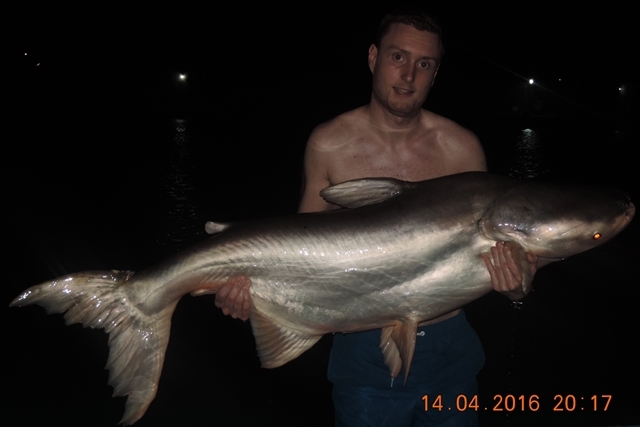 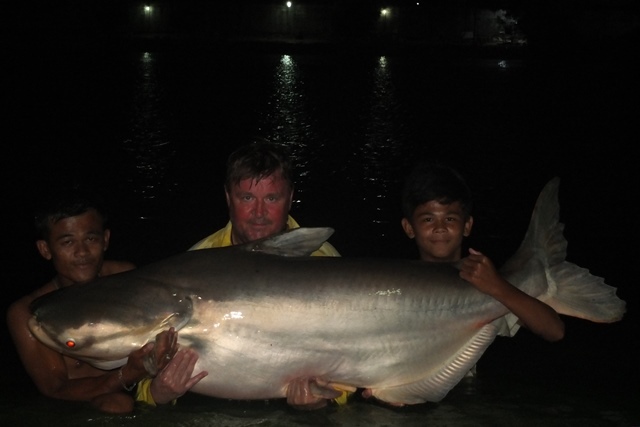 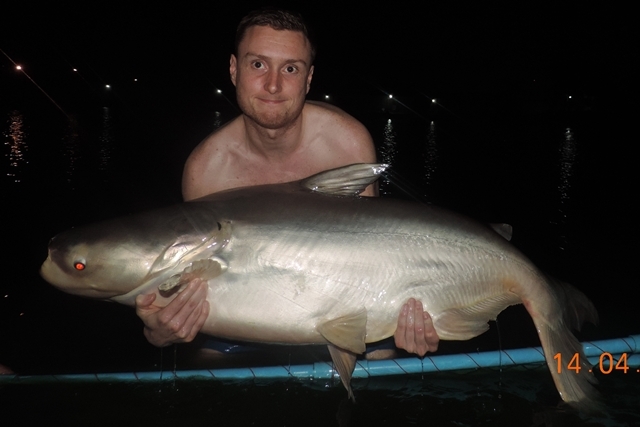 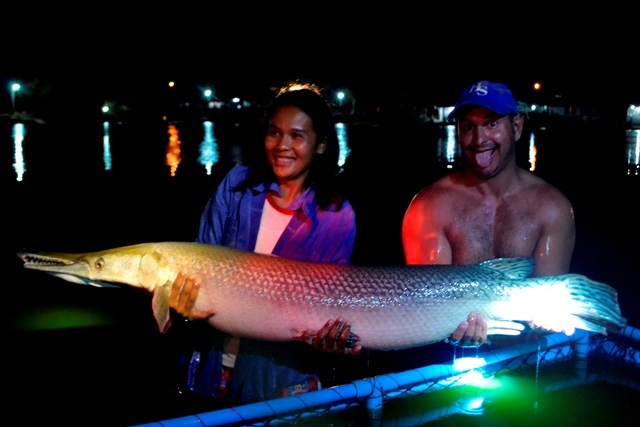 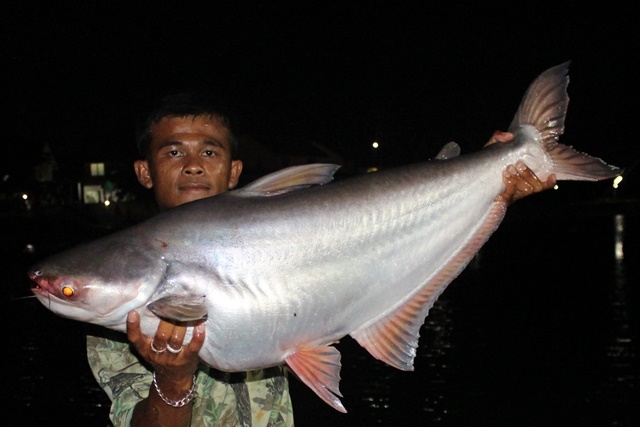 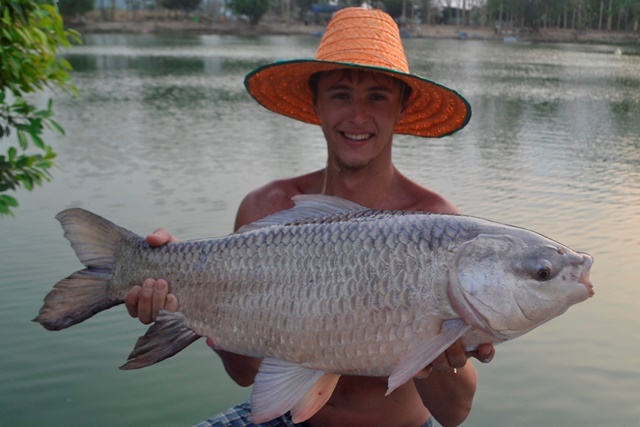 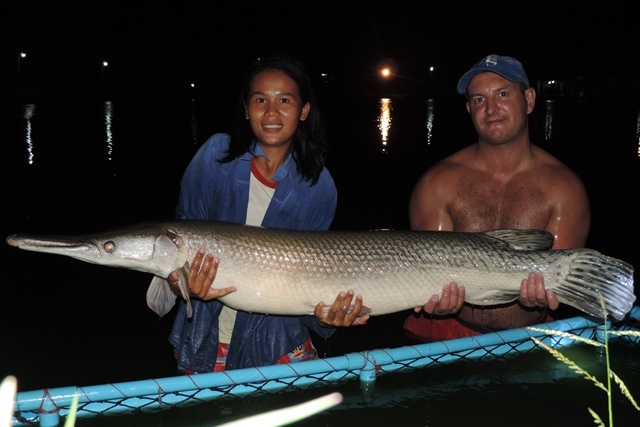 To start will he smashed the Palm Tree Lagoon Salween Rita record with a truly awesome fish of 70lb+., then he caught some stunning barred sorubim and a fantastic albino chao phraya and a huge alligator gar. 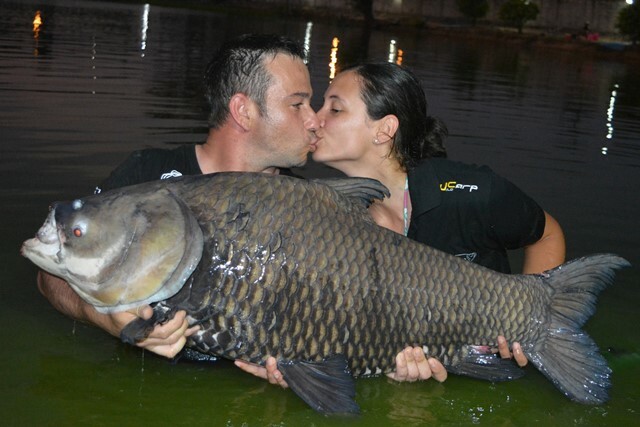 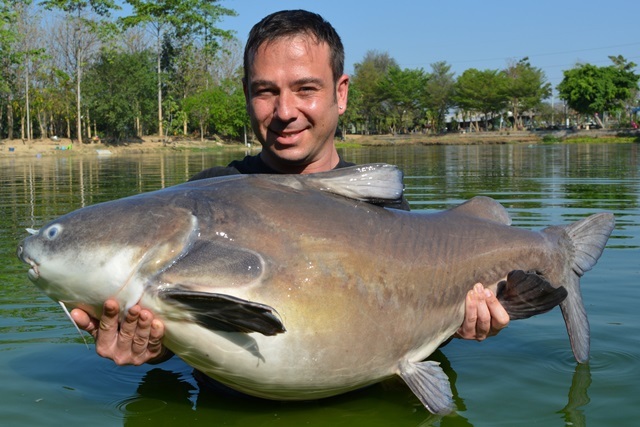 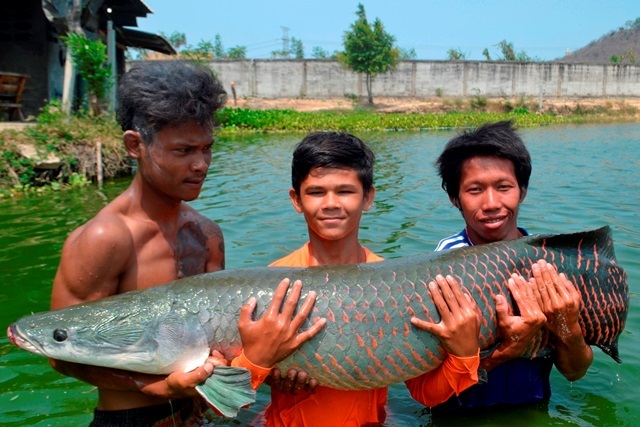 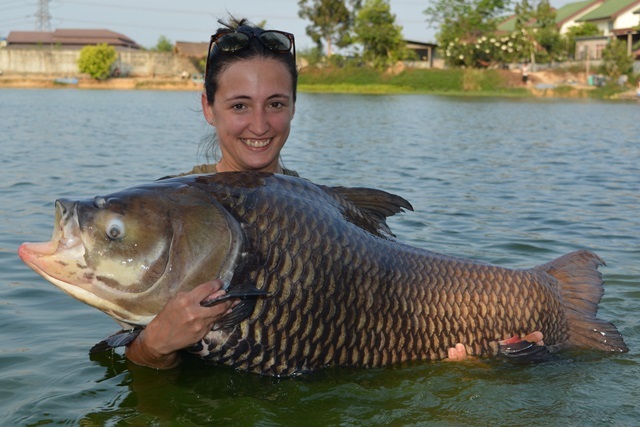 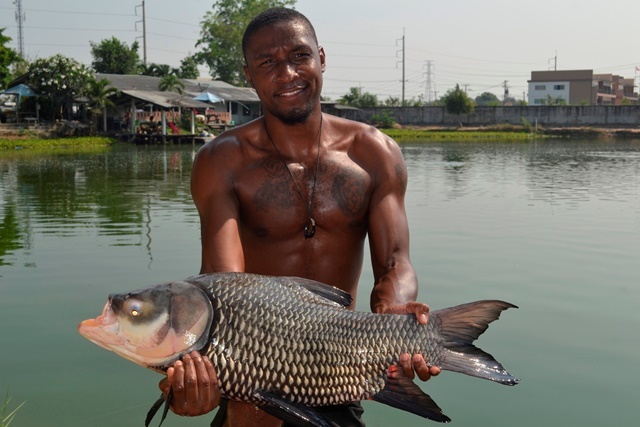 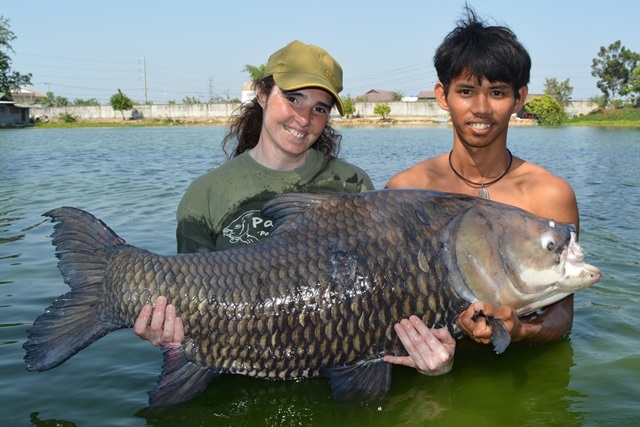 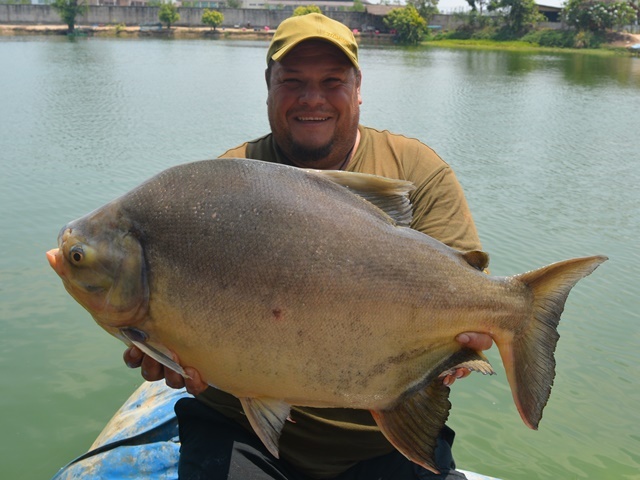 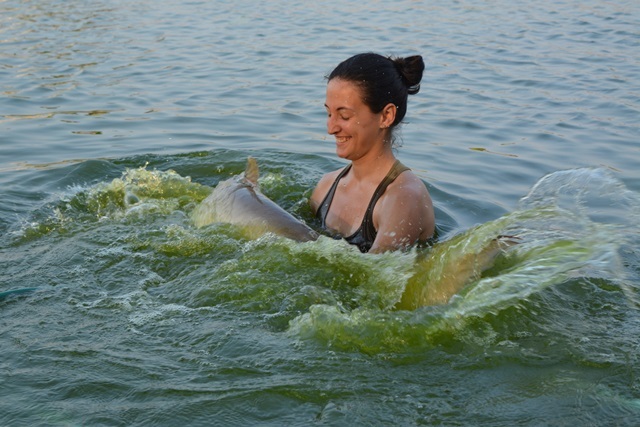 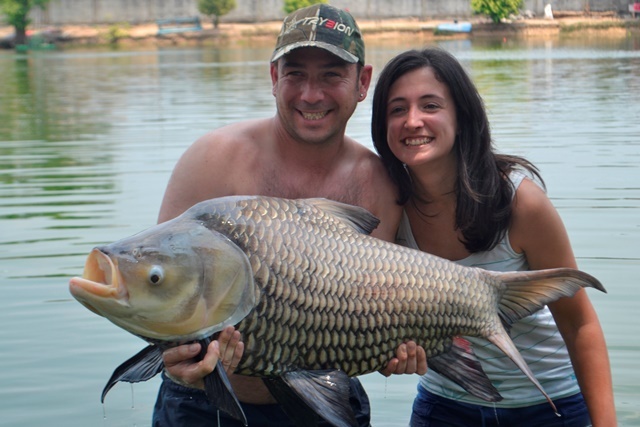 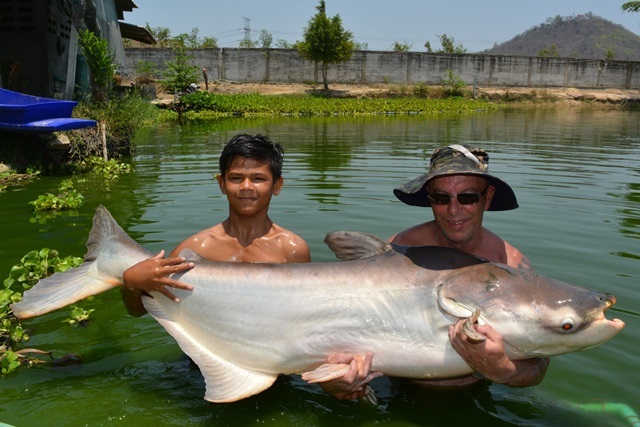 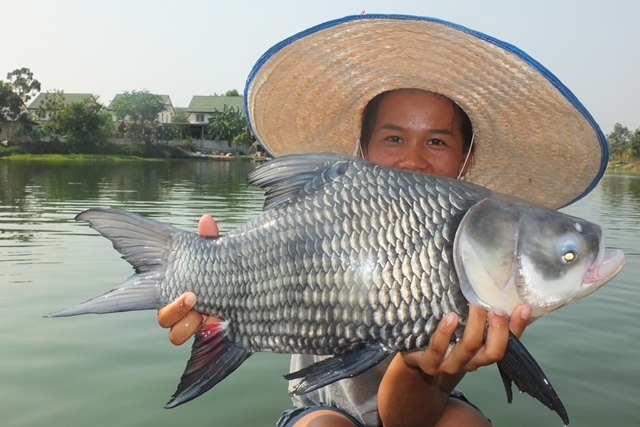 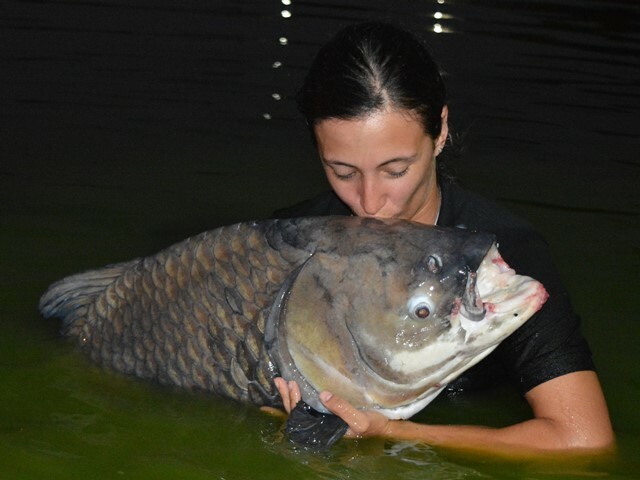 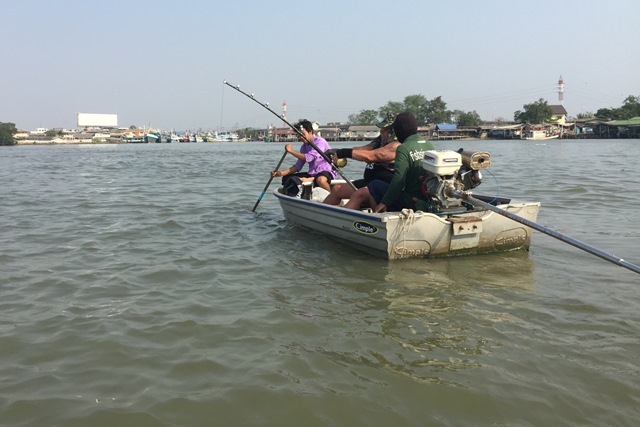 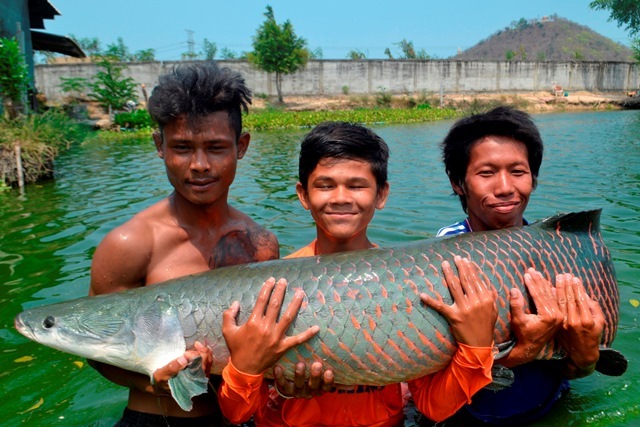 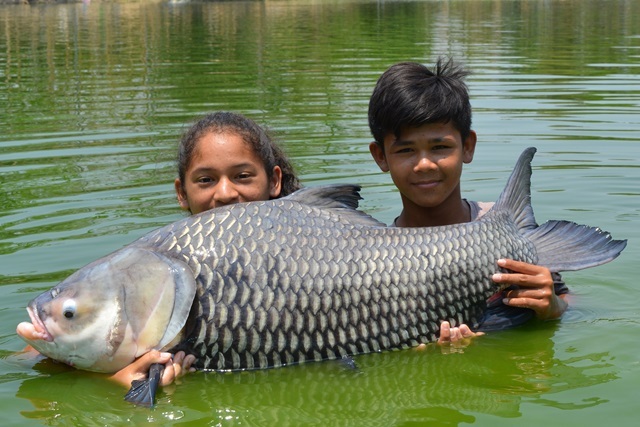 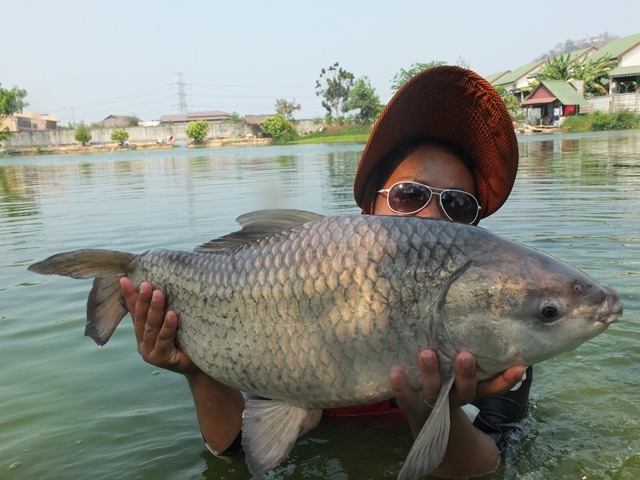 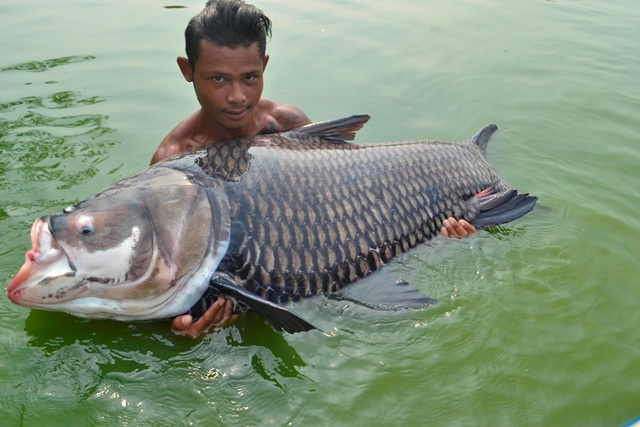 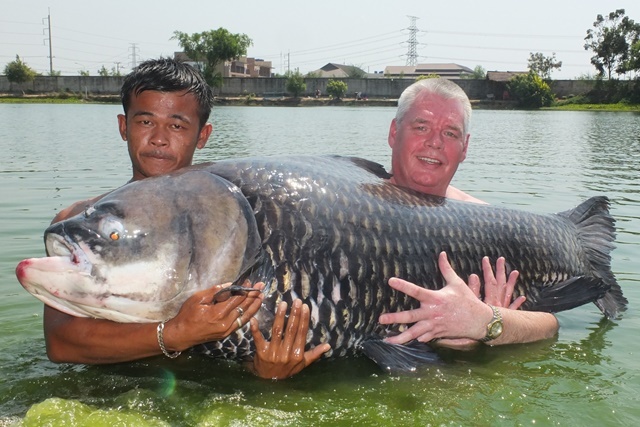 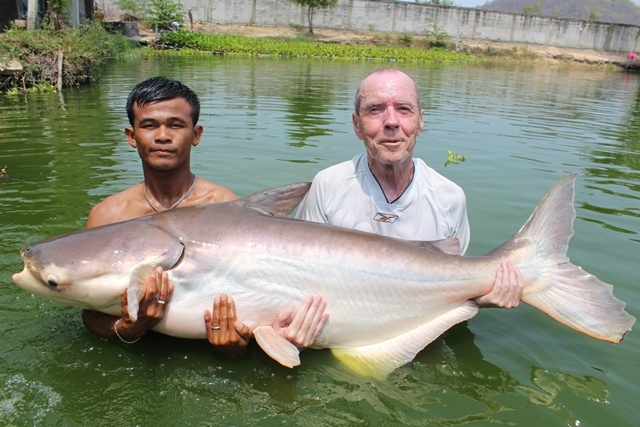 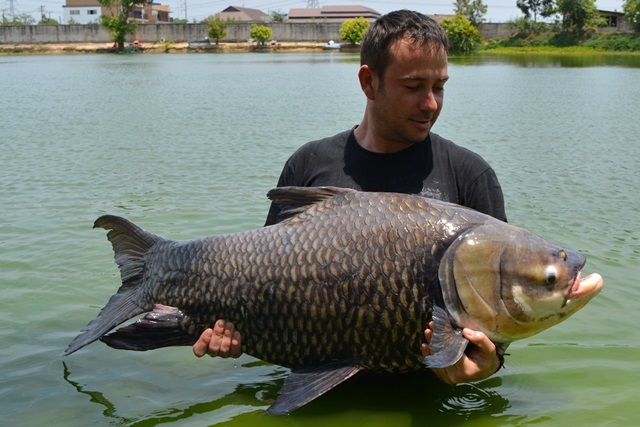 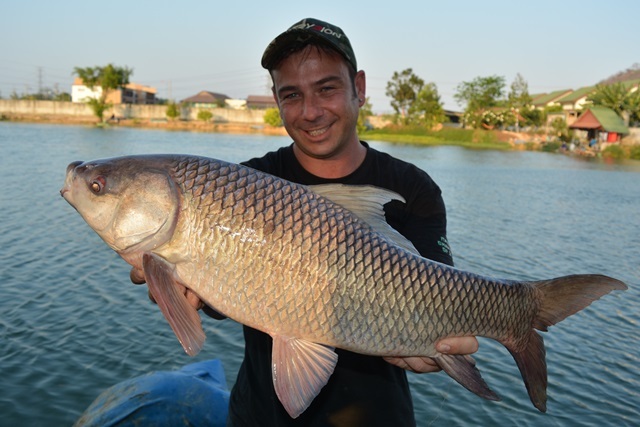 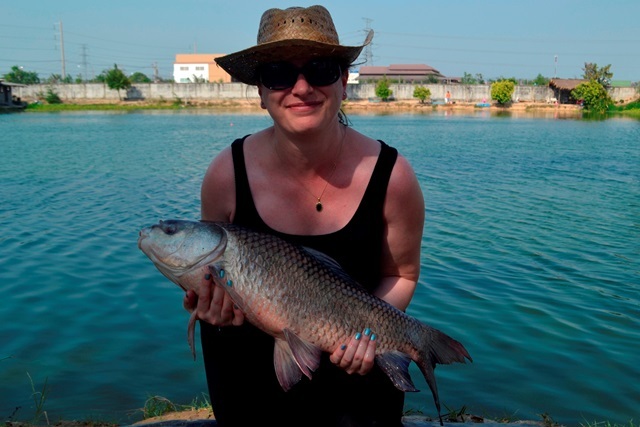 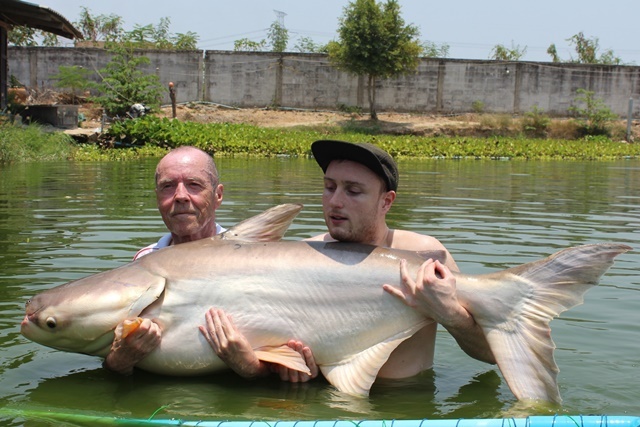 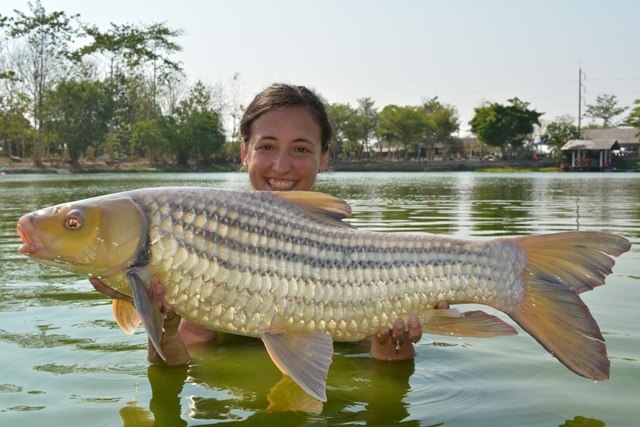 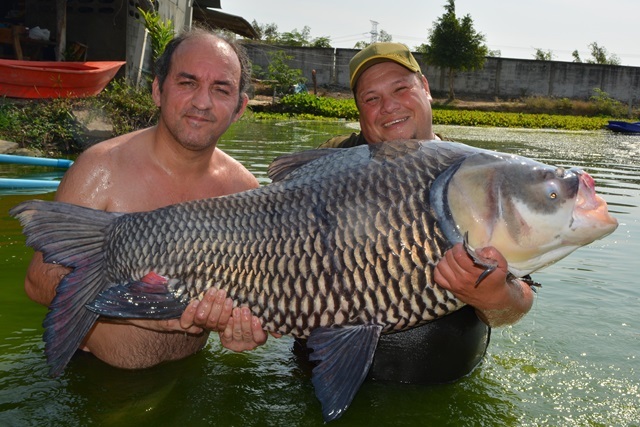 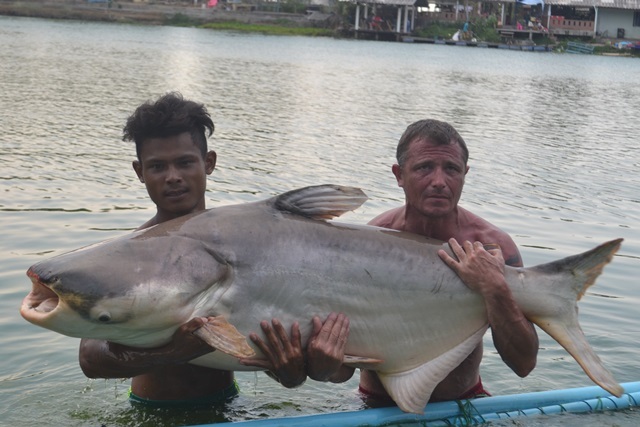 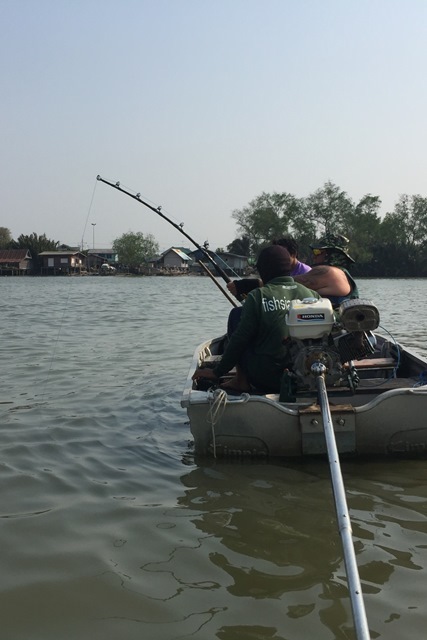 In addition he caught many other species that included Siamese carp, pacu, Mekong catfish, chao phraya catfish, black ear catfish, rohu, catfish shark, Juliens golden price carp, striped catfish as well as both Amazon and Asian redtail. 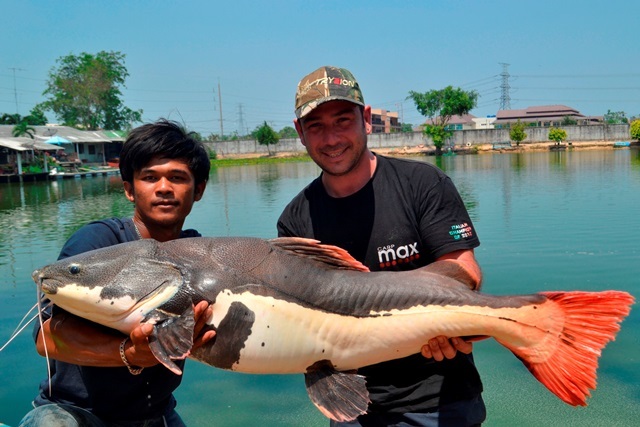 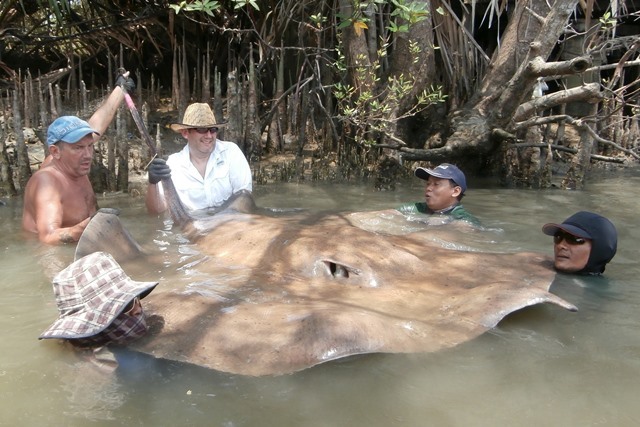 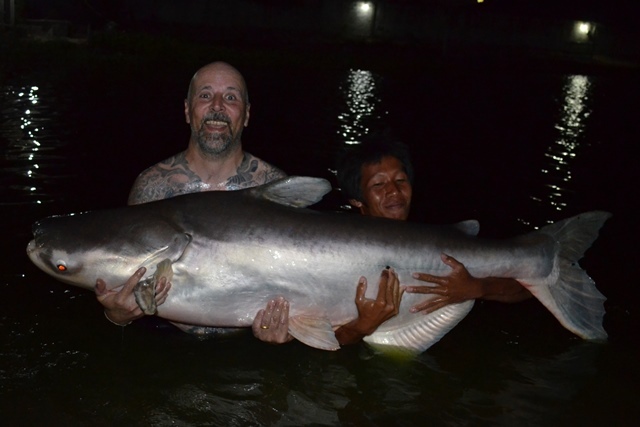 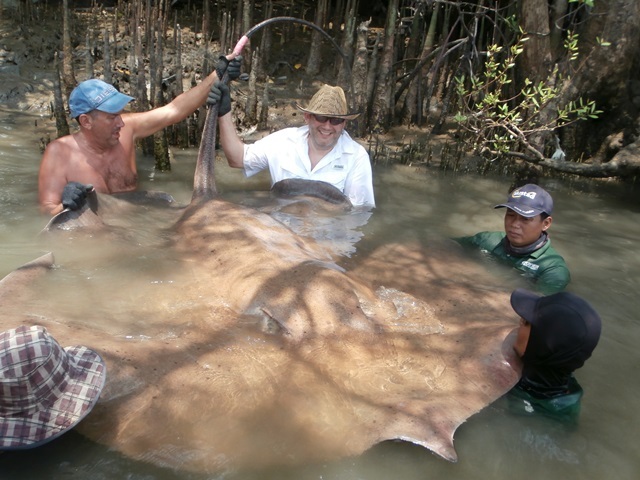 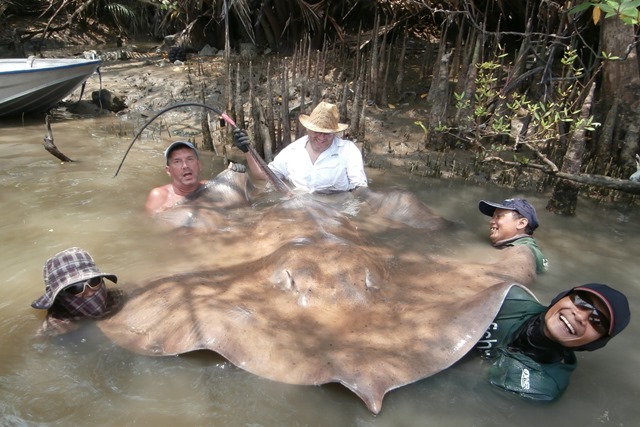 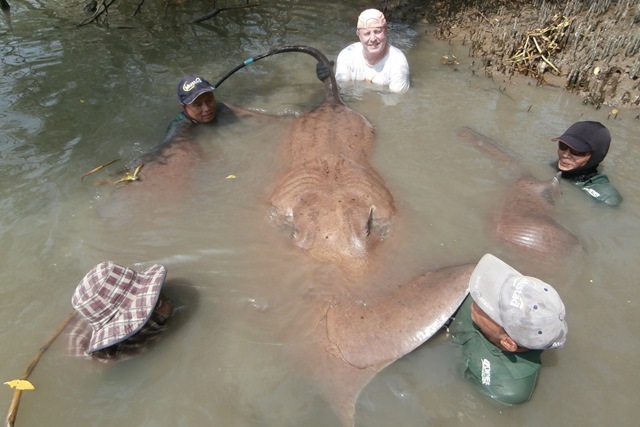 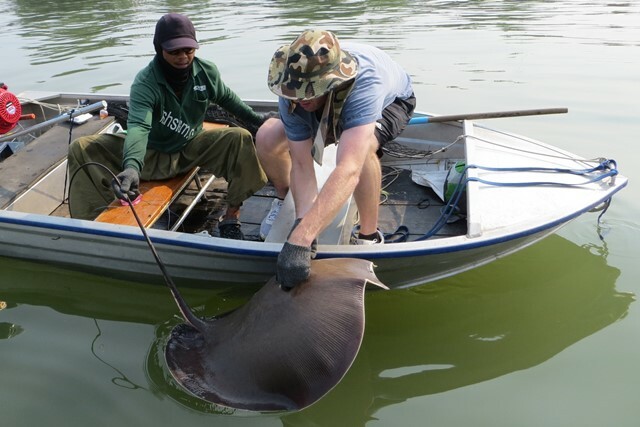 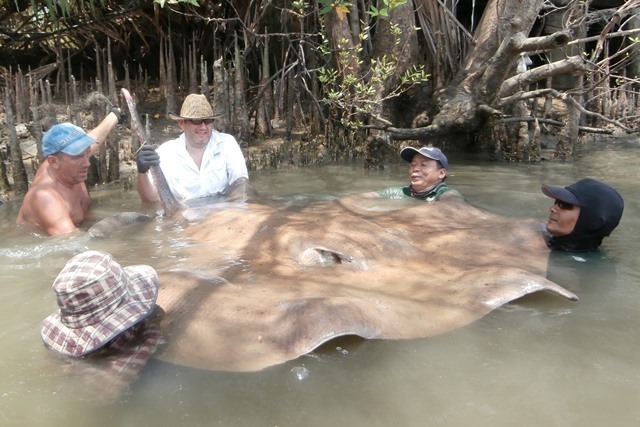 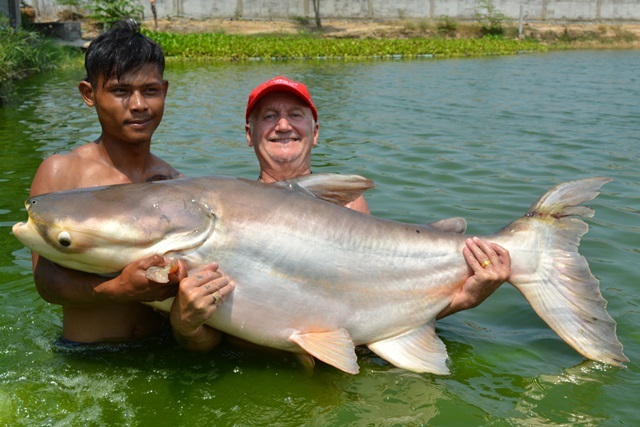 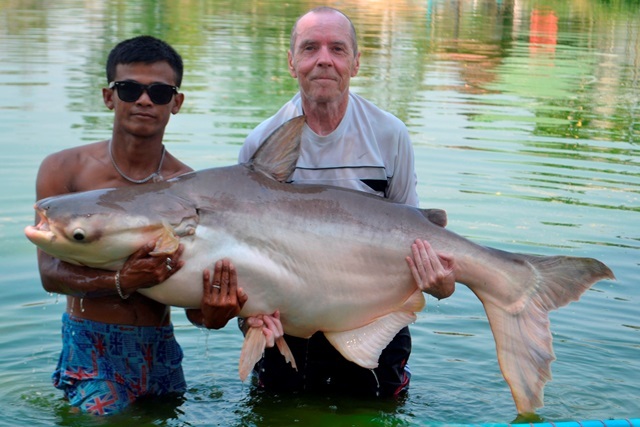 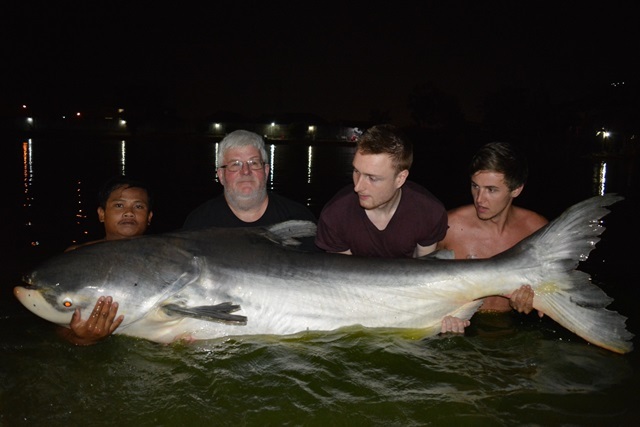 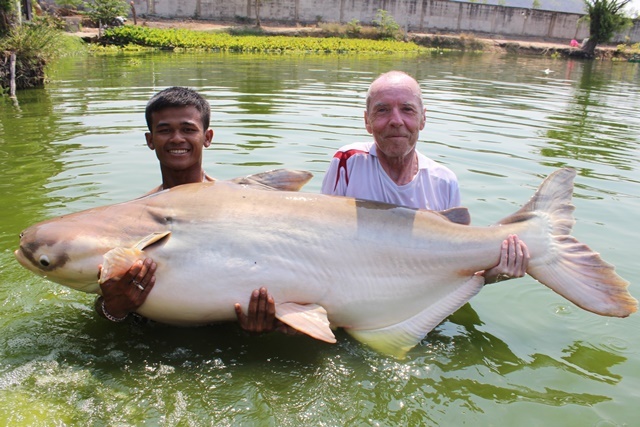 Neil and Peter Cobley went wild fishing for giant freshwater stingray on the mighty Mae Klong River and successfully caught this river monster. 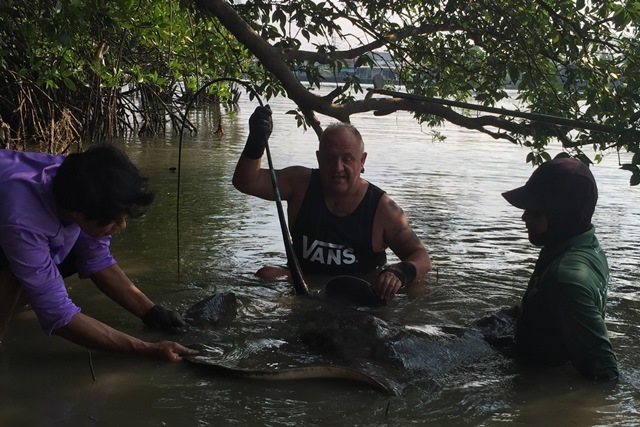 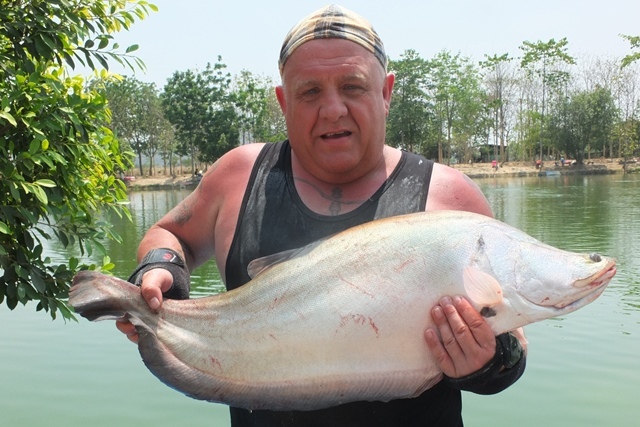 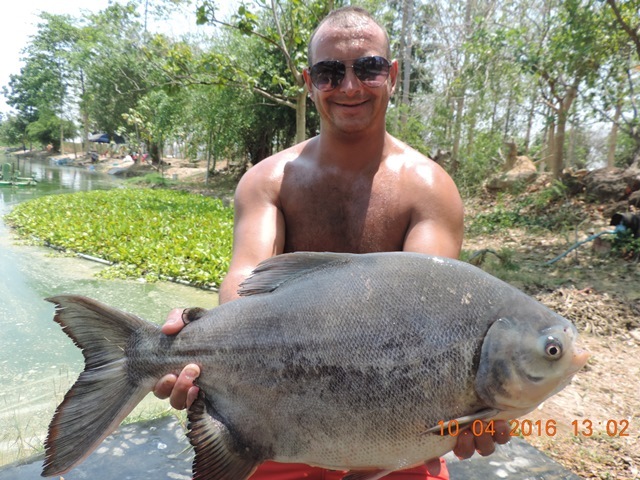 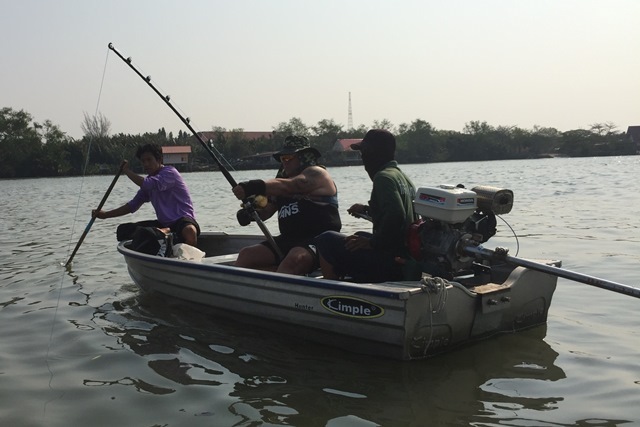 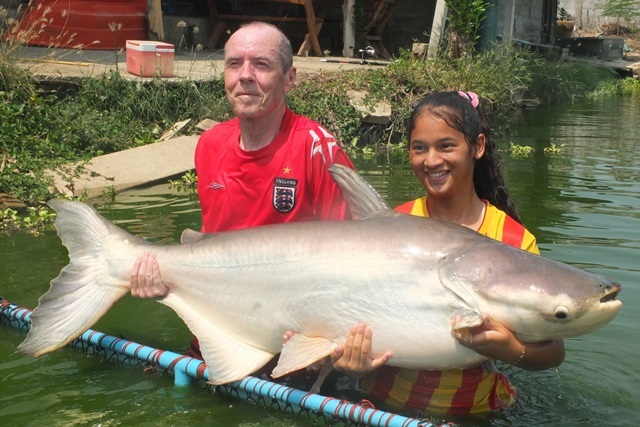 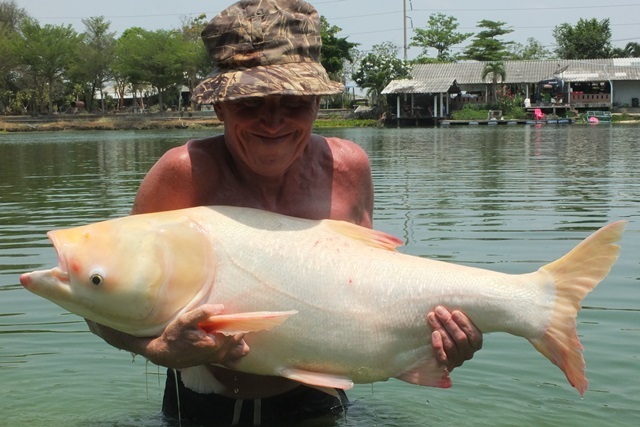 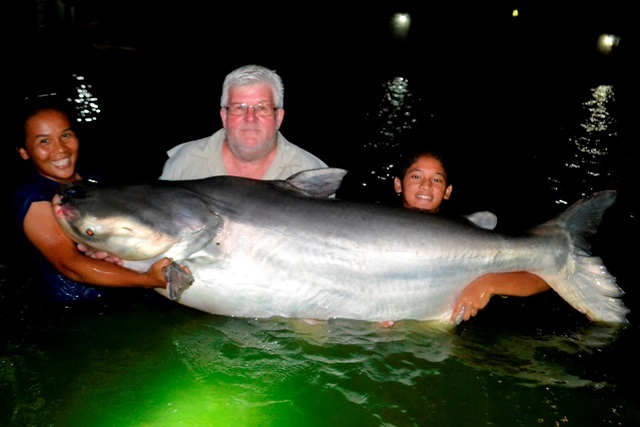 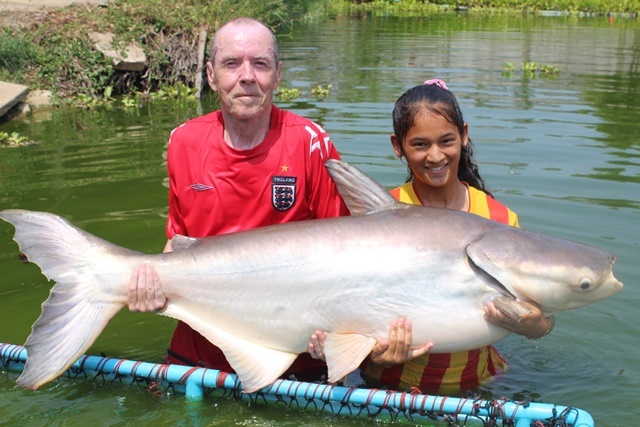 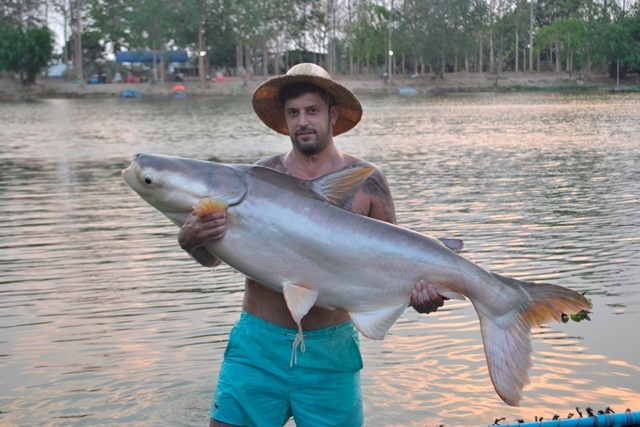 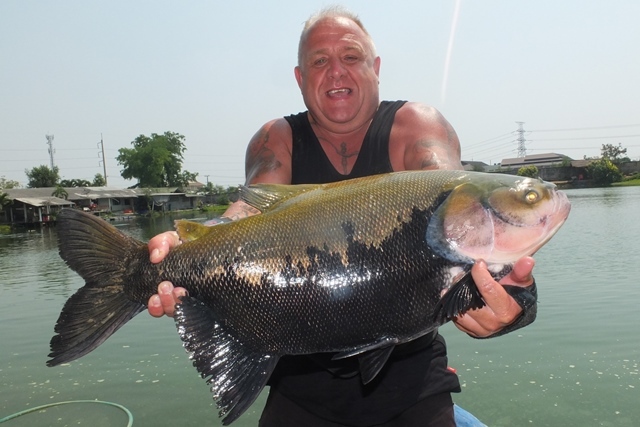 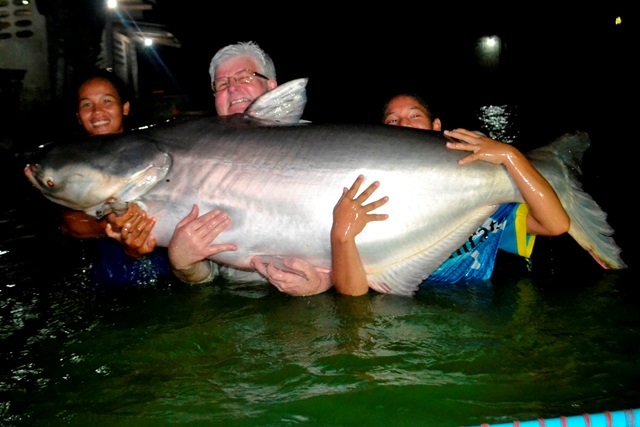 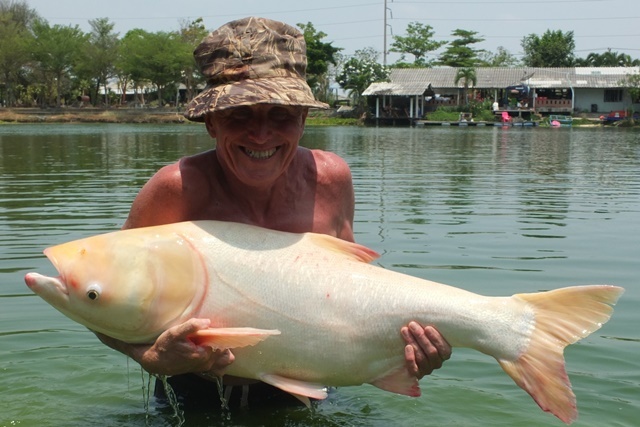 Mick Mickey who stays in Bang Pong was another angler to have a successful trip on the Mae KLong River giant freshwater stingray fishing during the month. 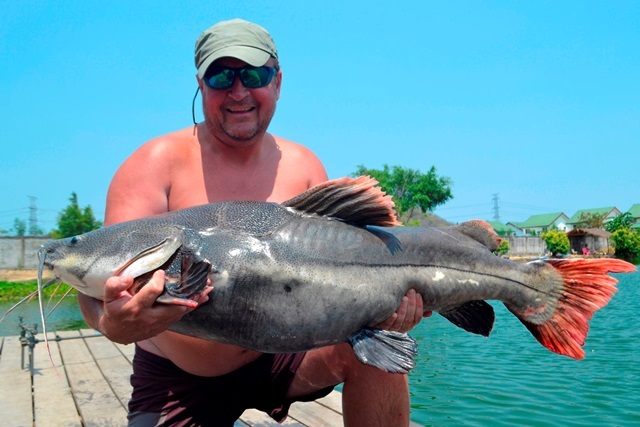 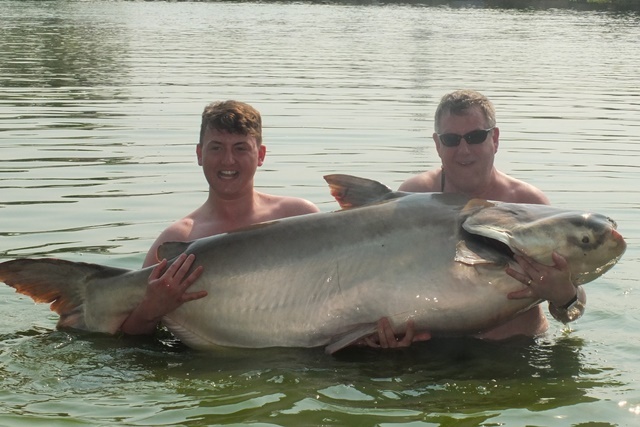 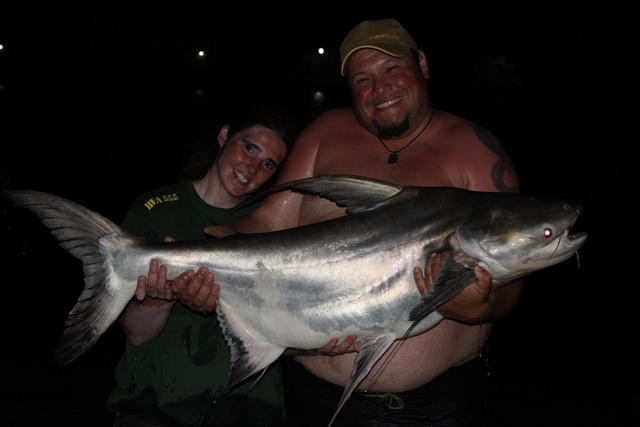 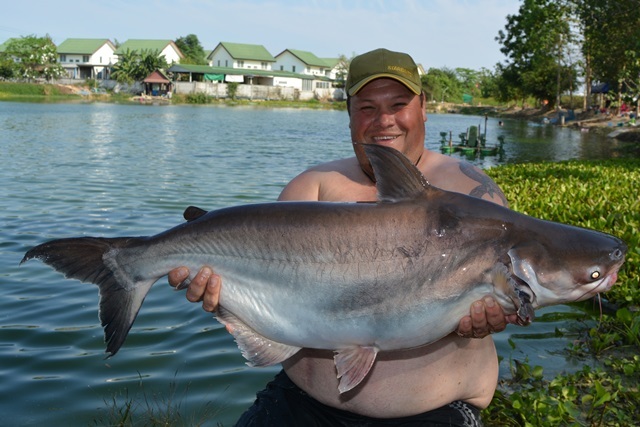 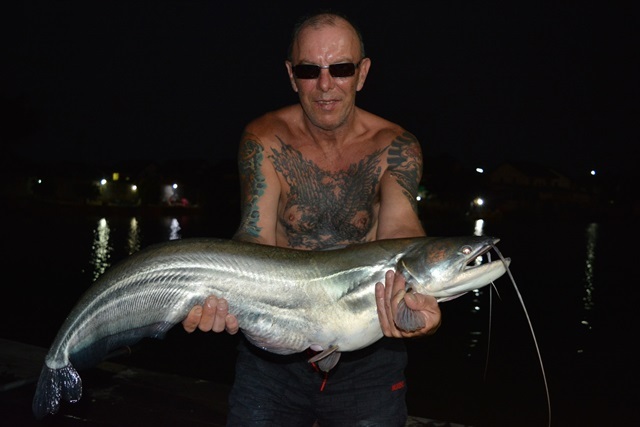 Neil of Khaolak Fishing Adventures customer -Carl Blanckley and his fishing buddy left is to the last moment to catch their best fish of the session which then took over two hours to land and in the process qualified Carl for the Palm Tree Lagoon 300lb Catfish Club. 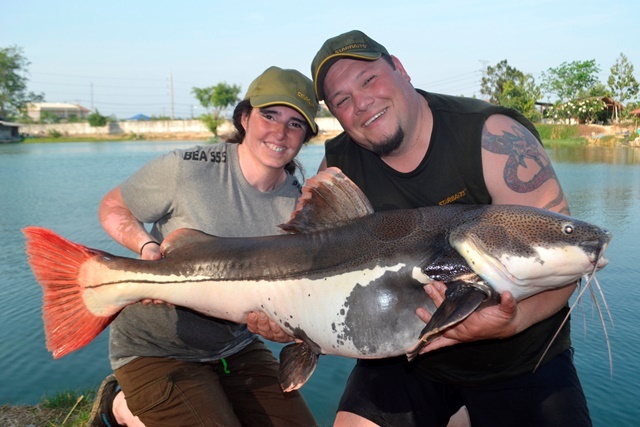 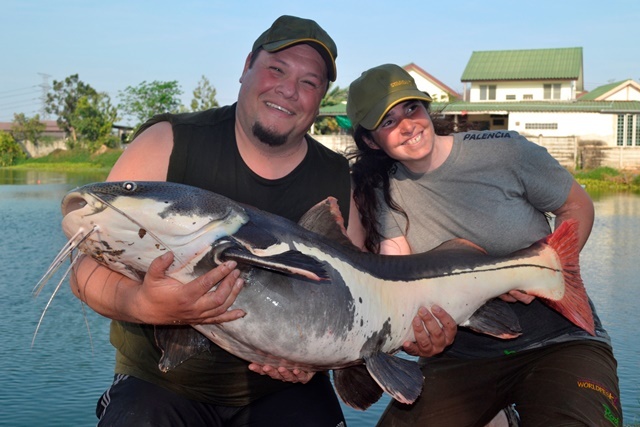 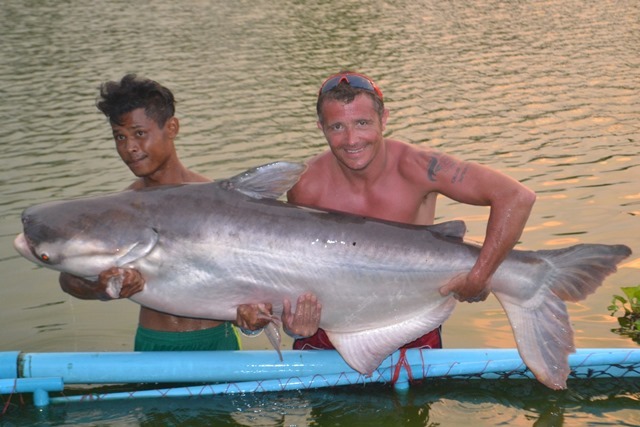 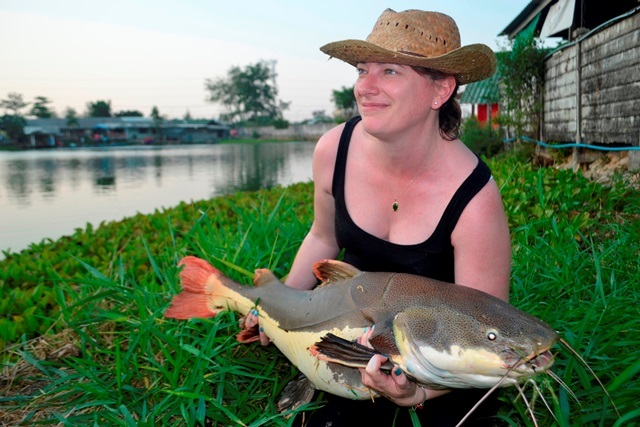 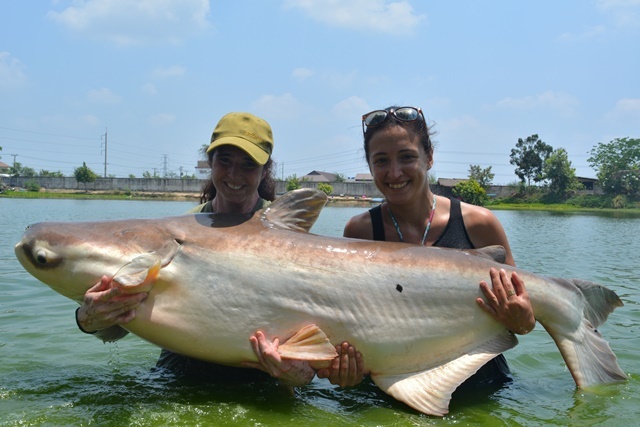 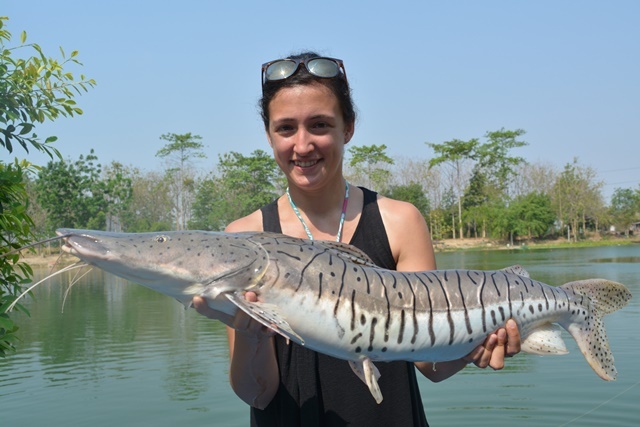 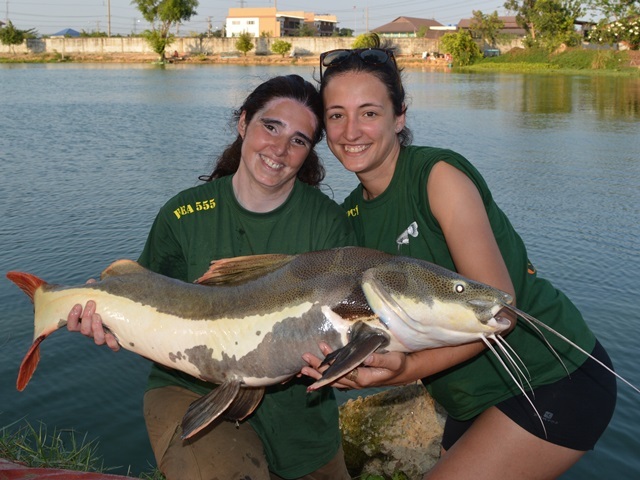 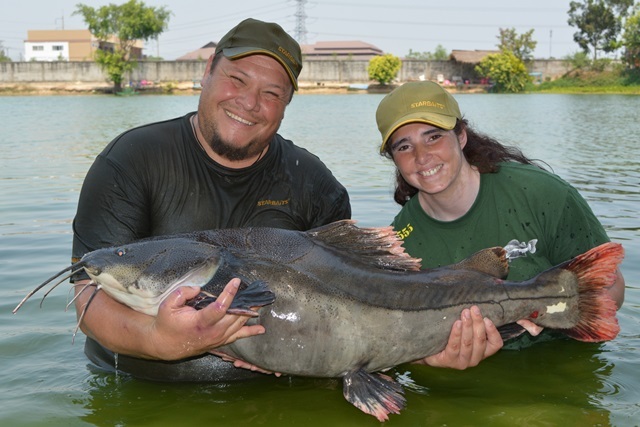 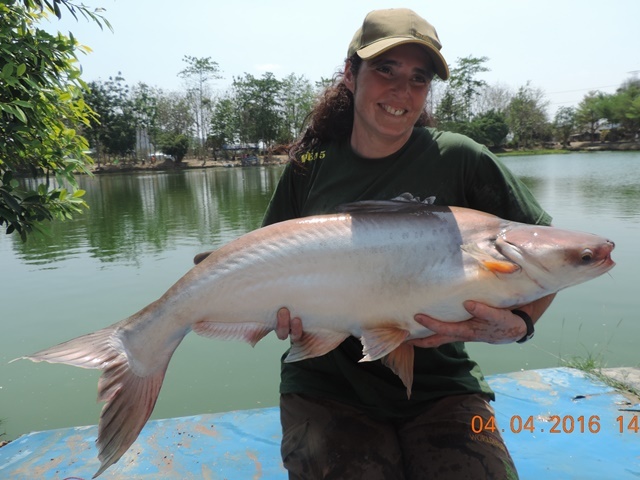 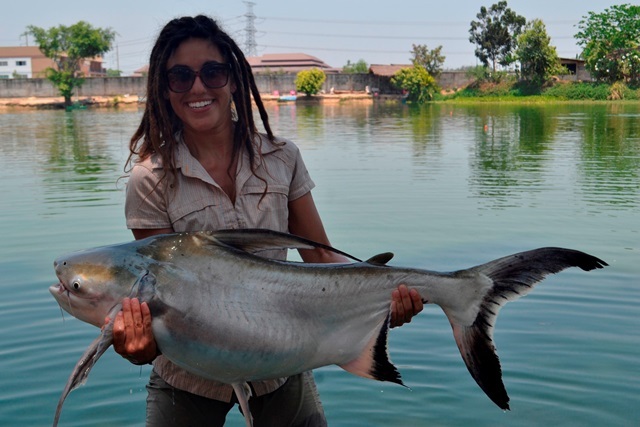 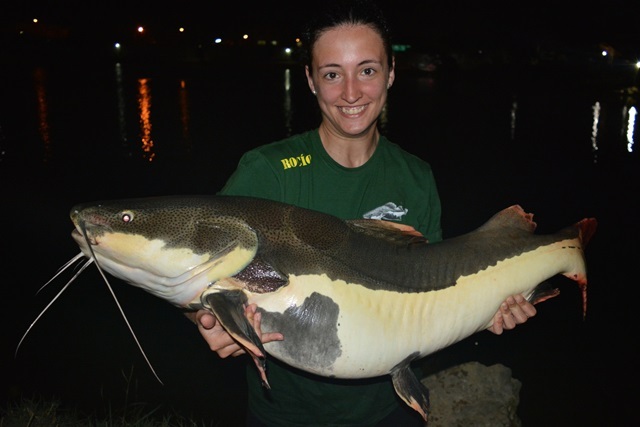 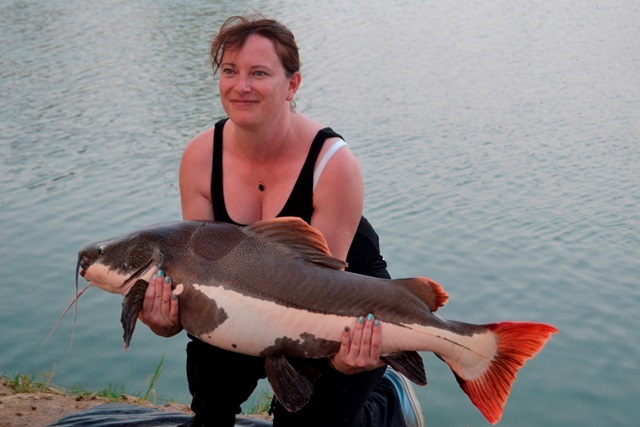 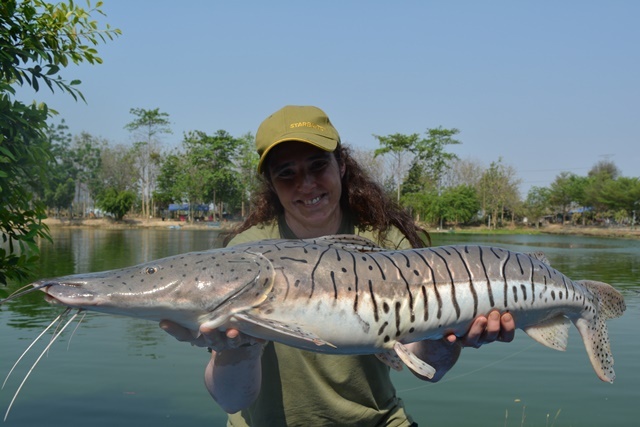 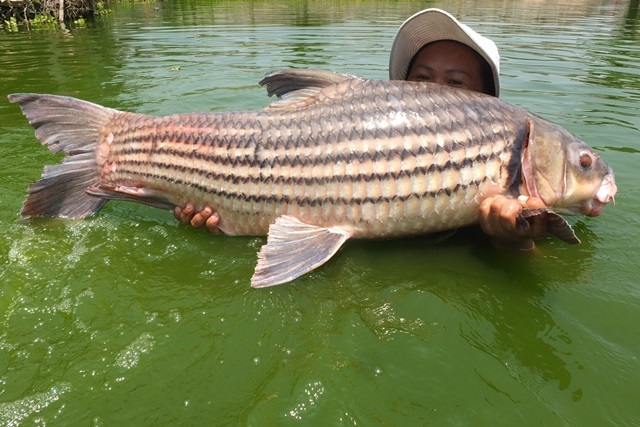 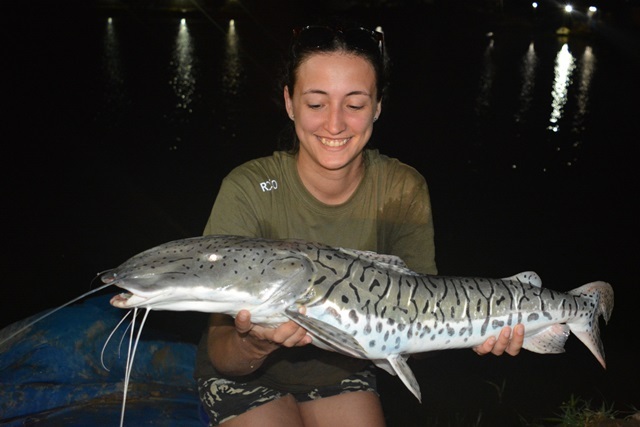 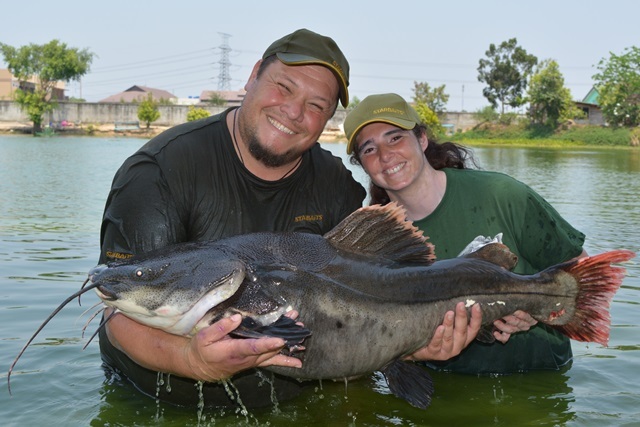 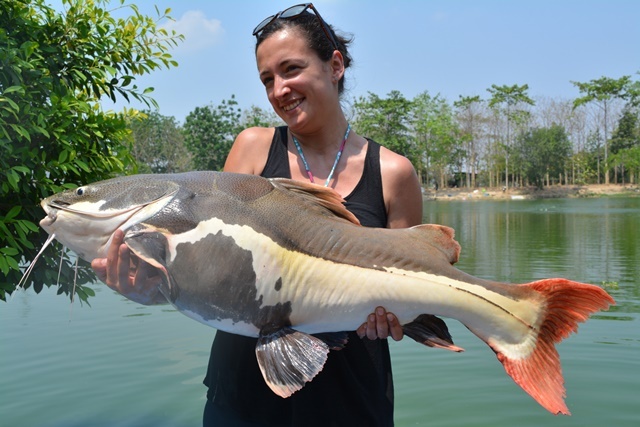 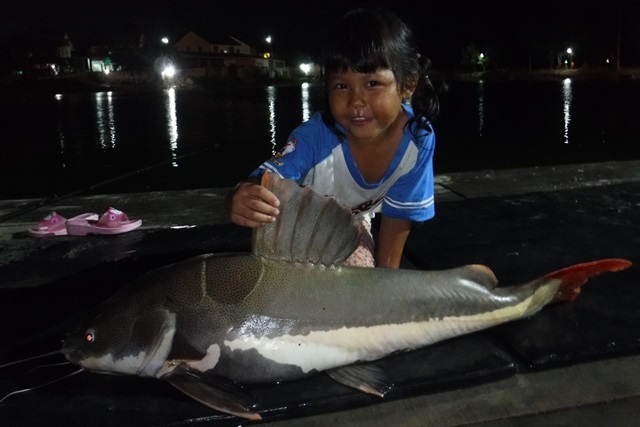 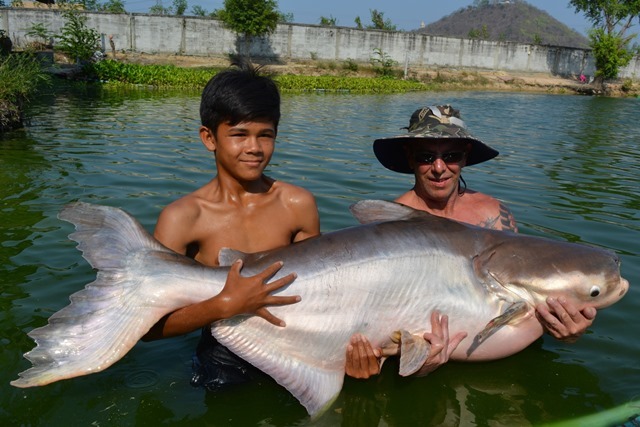 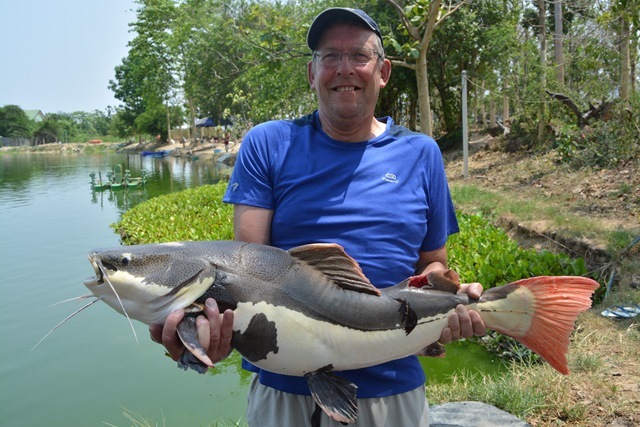 In addition to this awesome catch they also caught more Mekong catfish, striped catfish and Amazon redtail. 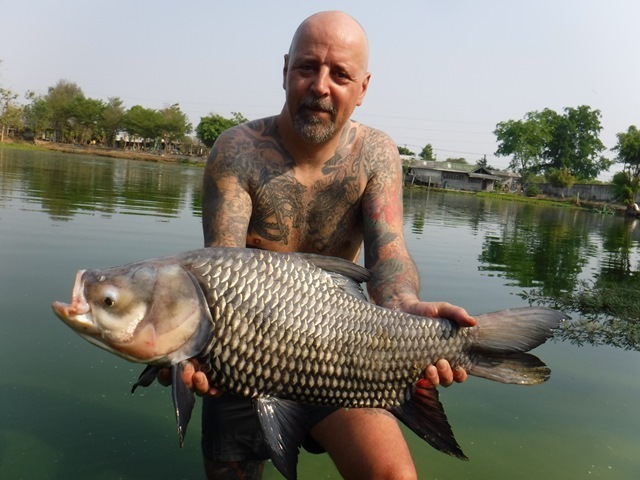 Wayne Murray returned for one if his bi-annual visits and as usual was into some awesome fish that included a 120lb carp caught right on his last afternoon. 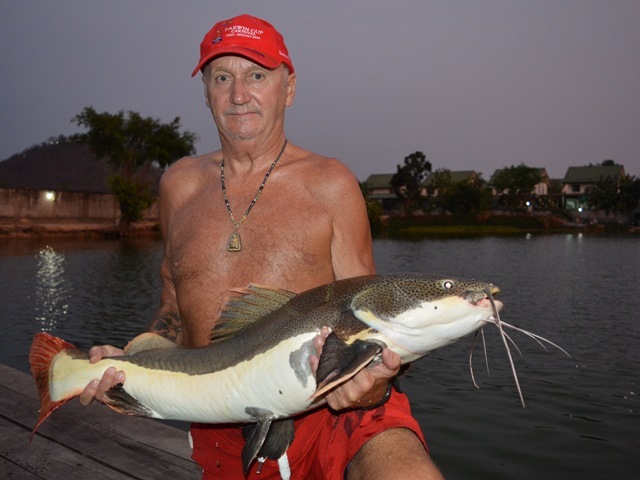 He also caught Mekong catfish, yellow catfish, pacu, giant snakehead, tambaqui, giant featherback and Amazon redtails. 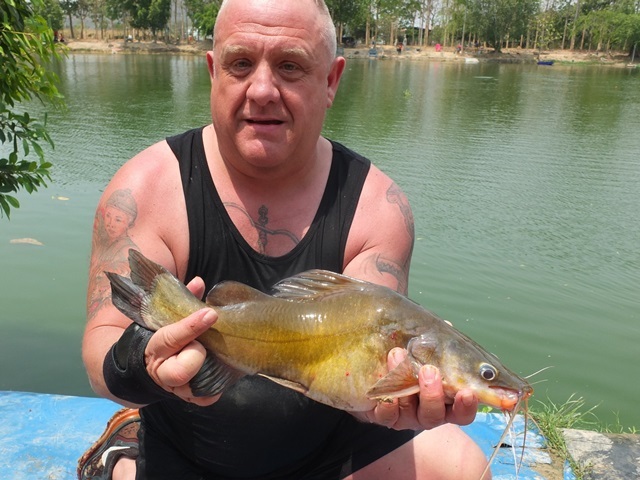 Mick Dundon finally made it down for his first session and was after a juliens golden price carp in particular, not really the time of the year for them to be caught at Palm Tree but he did get in a photo with one we were stocking that had been caught out of the Mae Klong river. 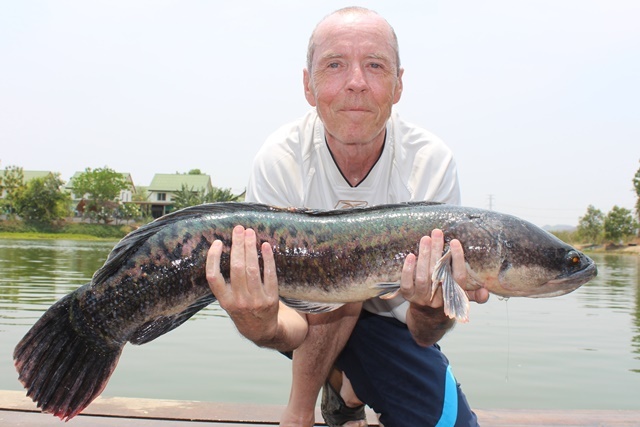 However, he did however catch some wonderful fish that included his first giant snakehead, Mekong catfish, big-Y catfish, his first Chinese bighead carp, catfish shark, striped catfish, Siamese carp, rohu as well as both Asian and Amazon redtails. 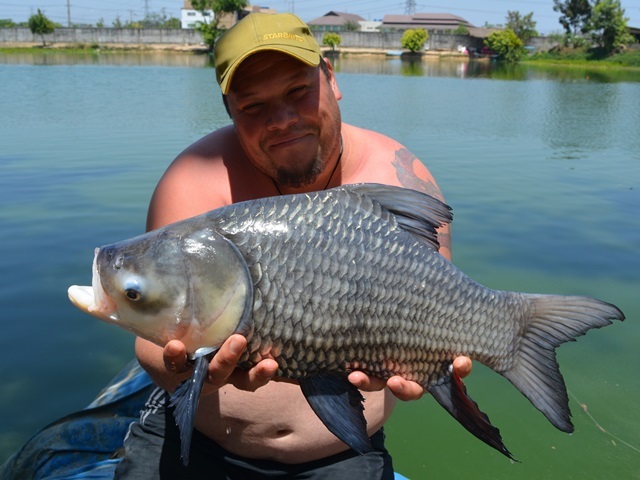 He promised to be back in the rainy season to continue his quest for a Juliens carp. 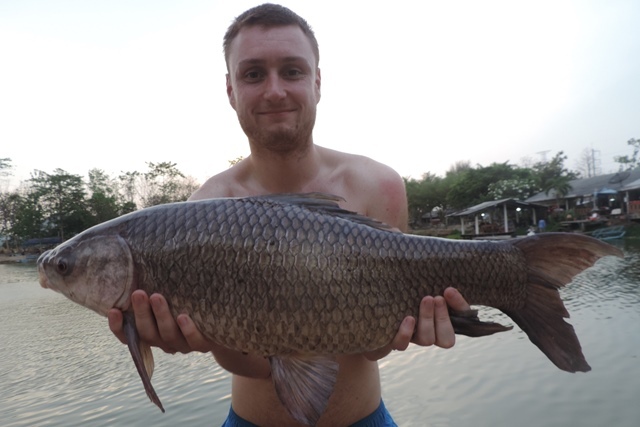 The highlight of Paul and Kyle Muir was a stunning Chinese black carp, in addition they caught a number of other great catches that included alligator gar, rohu, tambaqui, pacu, and Amazon redtail. 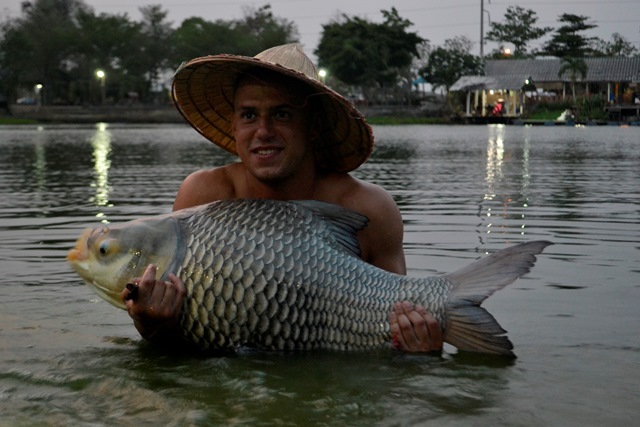 Ian Soutar was off to a great start catching a rare elephant ear gourami. 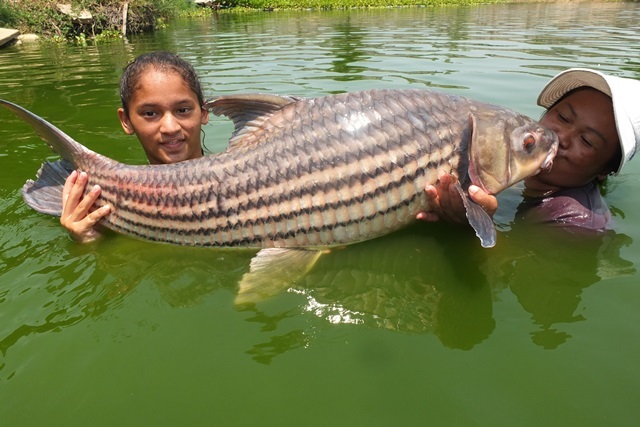 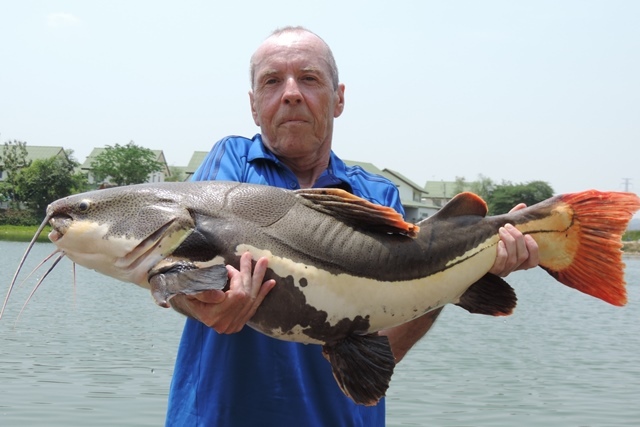 He then went on to catch a number of other great catches such as Mekong catfish, black shark minnow, rohu, Siamese carp, big-Y catfish, striped catfish and Amazon redtail. 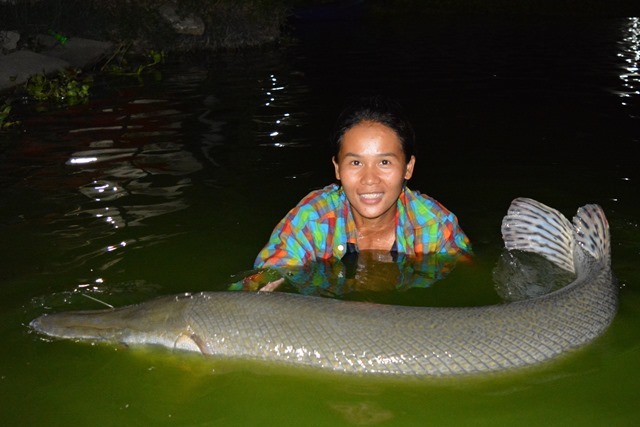 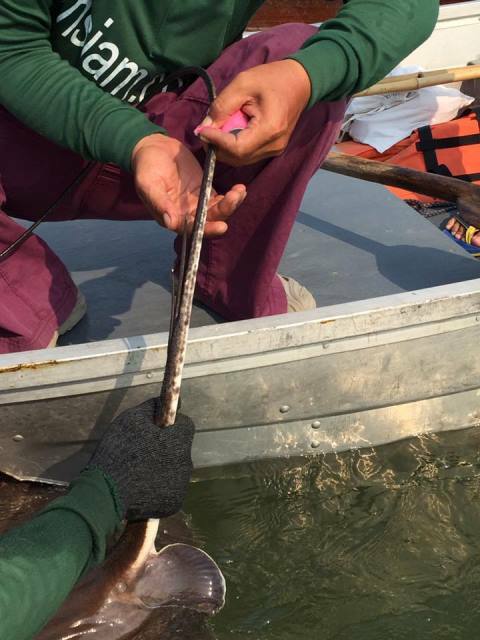 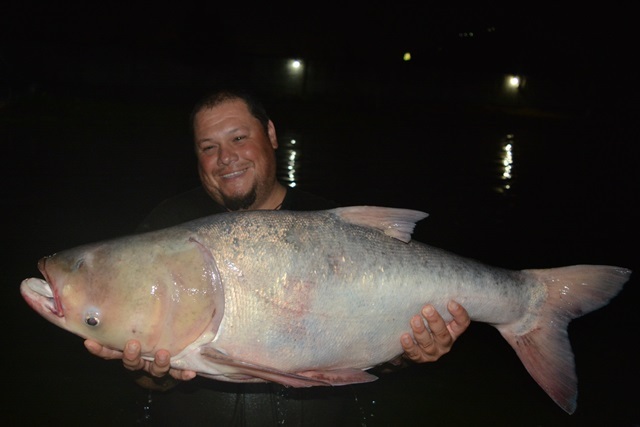 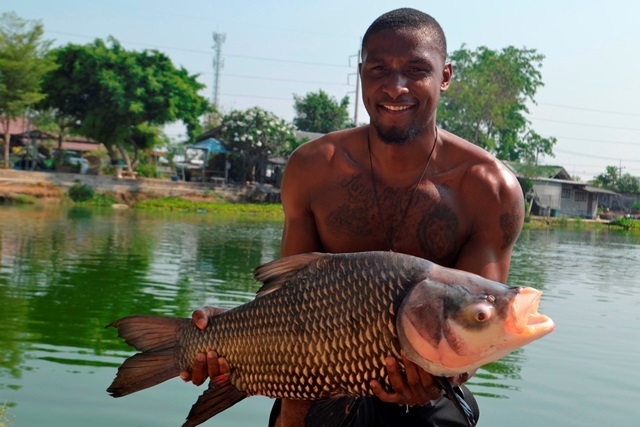 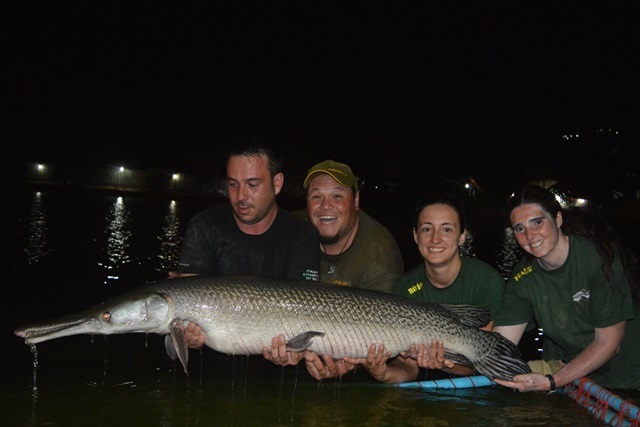 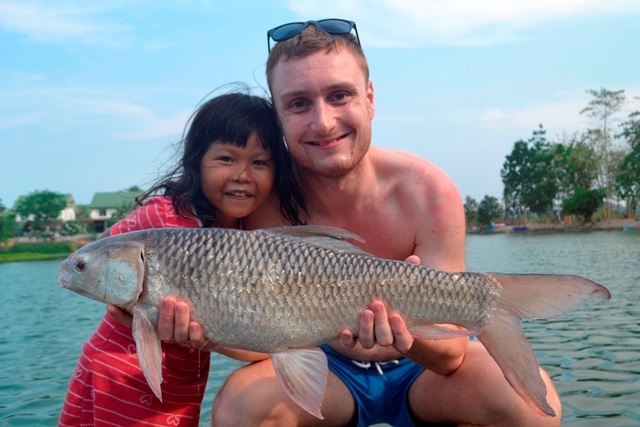 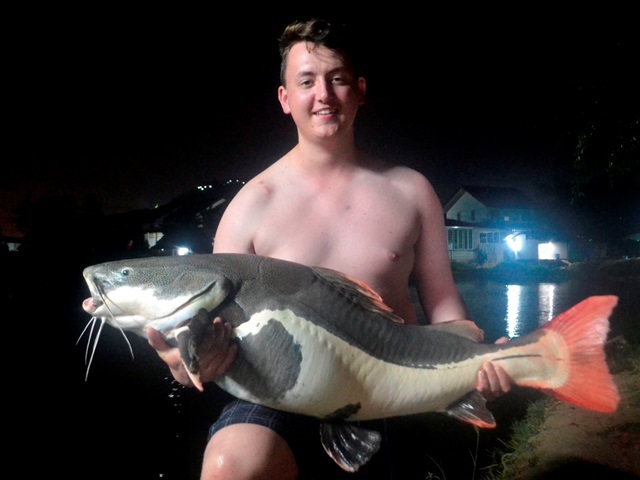 Tap's third and last trip of the month turned out to be his best, with his customers catching a huge Mekong catfish as well as a big alligator gar, Siamese carp, parapatinga, big-Y catfish, mollycot and Amazon redtail. 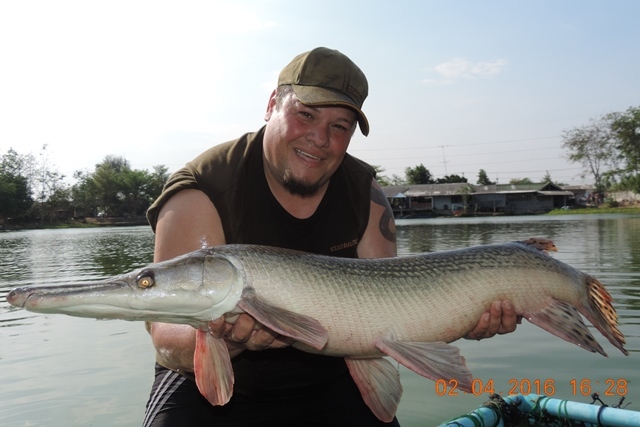 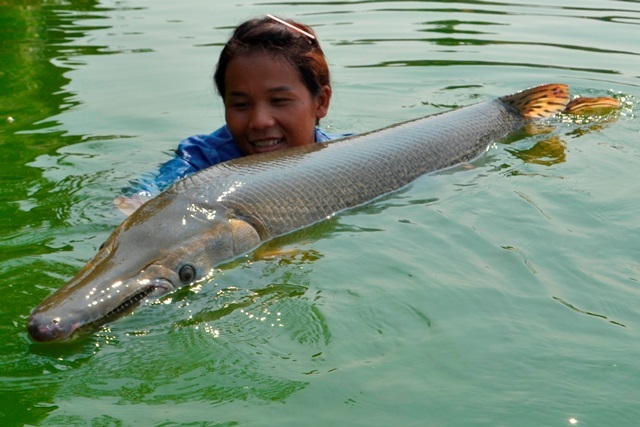 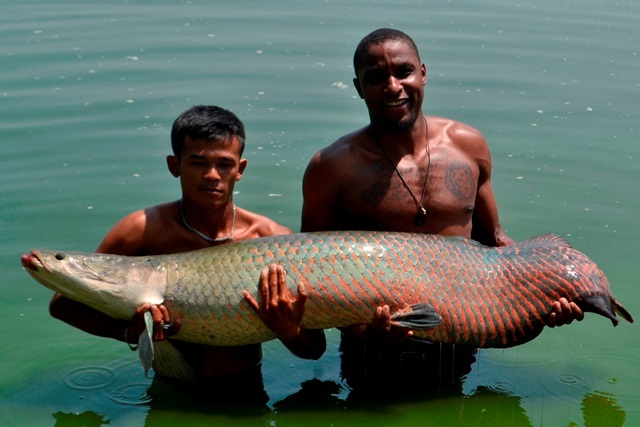 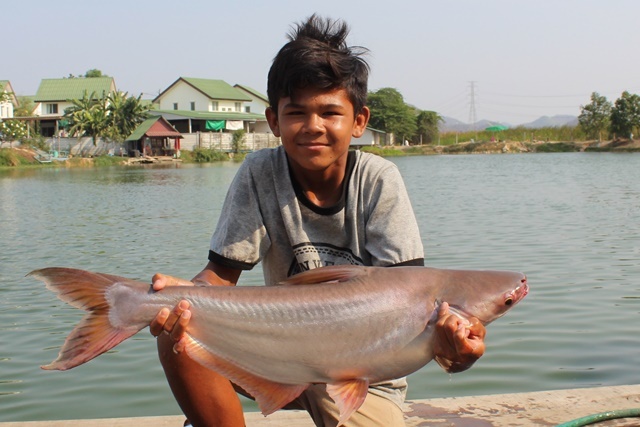 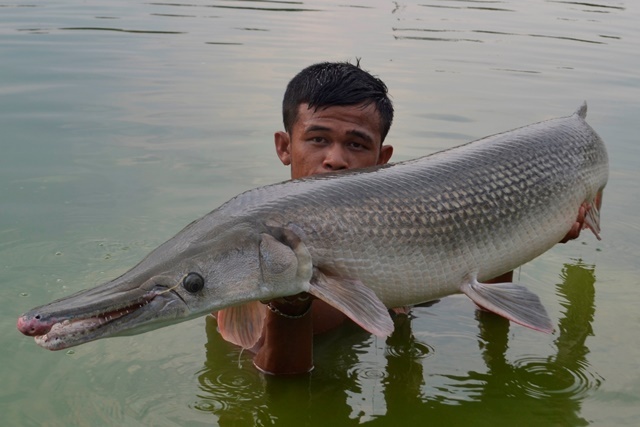 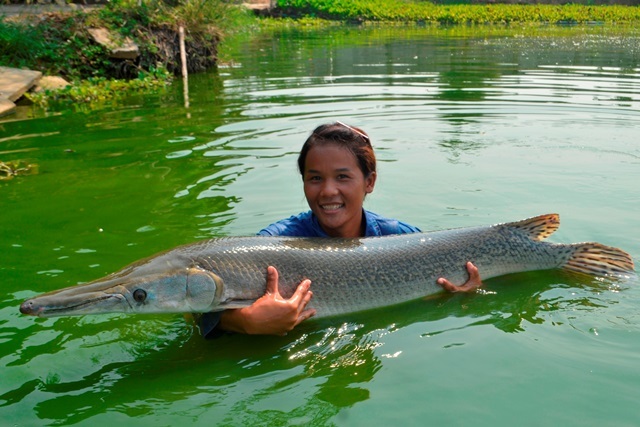 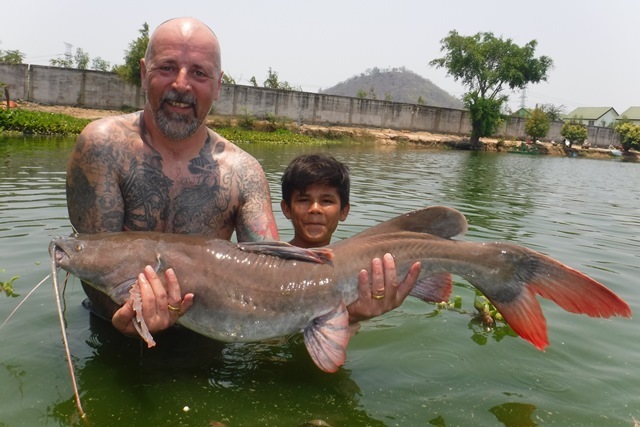 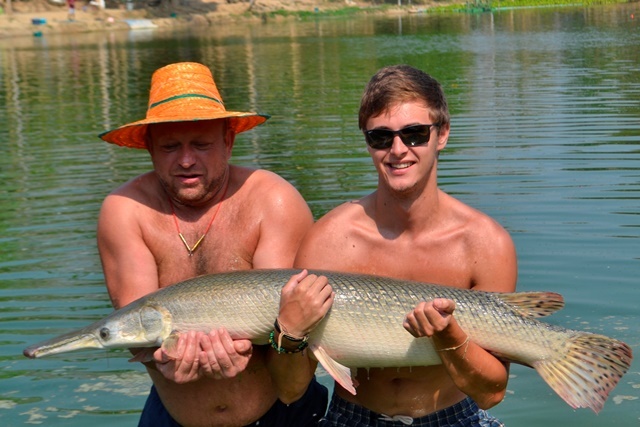 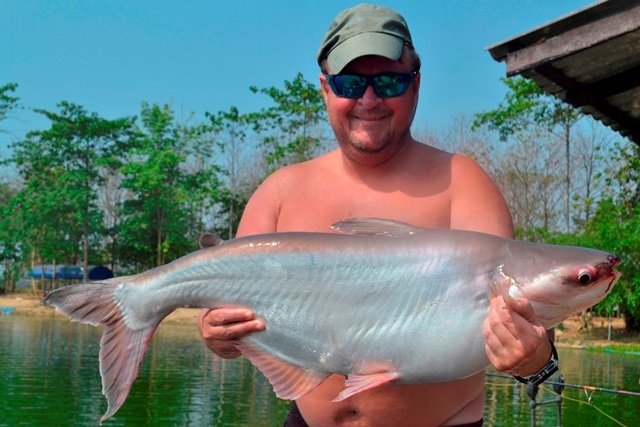 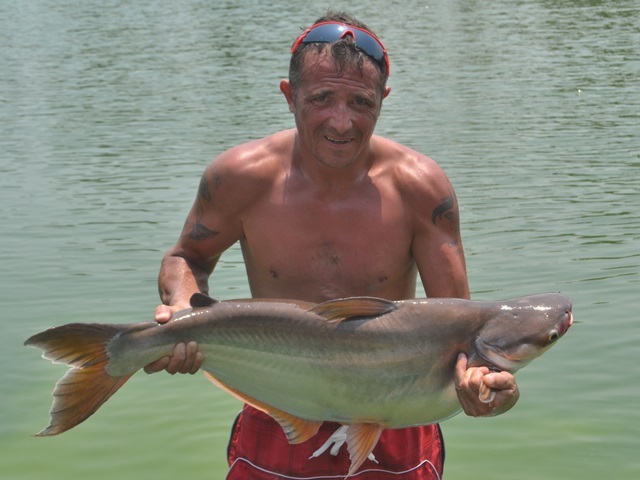 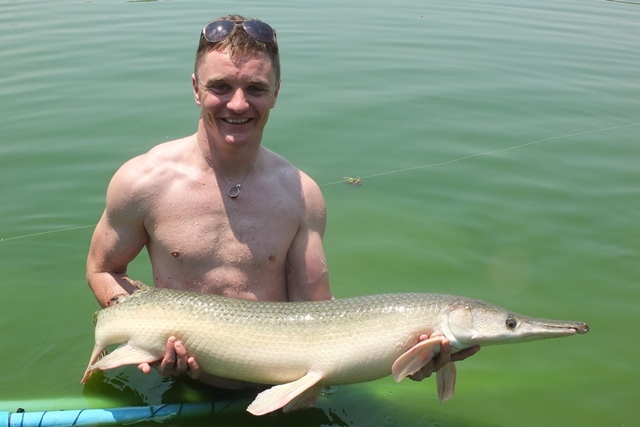 Rickie Wheeler made a couple of day trip up from Pattaya during the month the highlights of his catches being an awesome alligator gar and a big Mekong catfish. 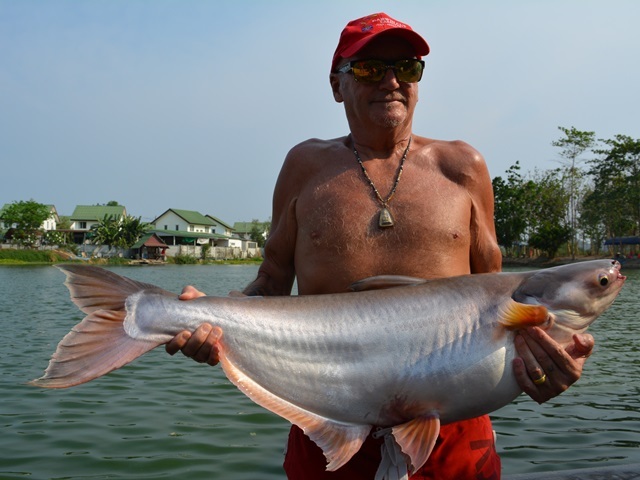 He also caught pacu, striped catfish, rohu and Amazon redtail. 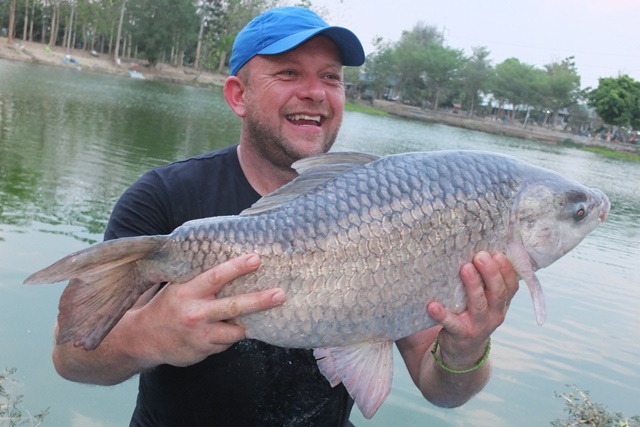 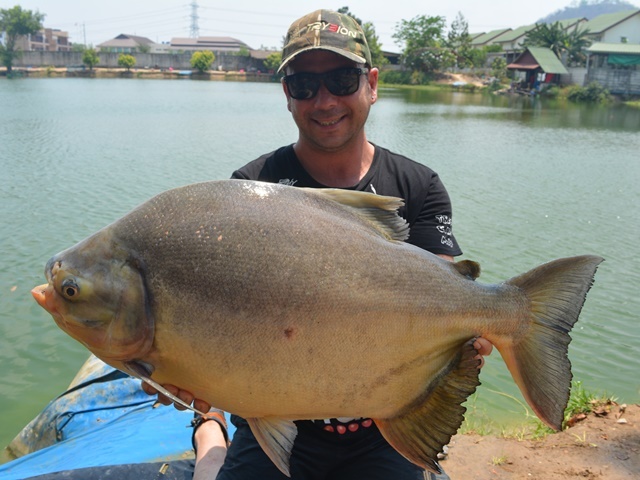 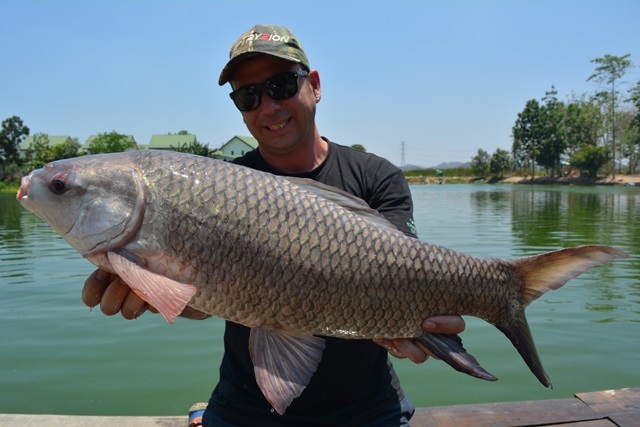 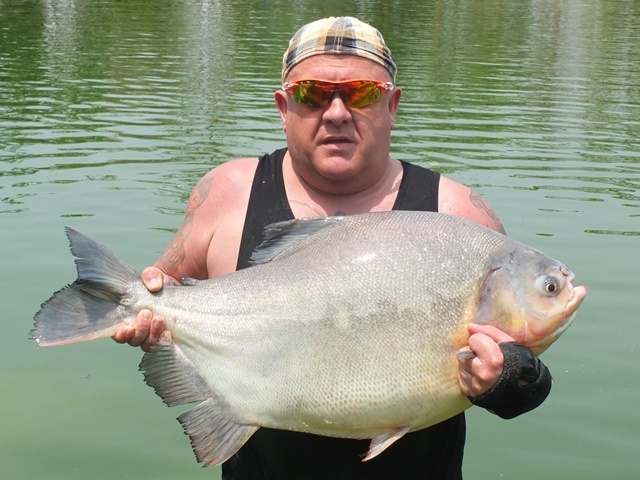 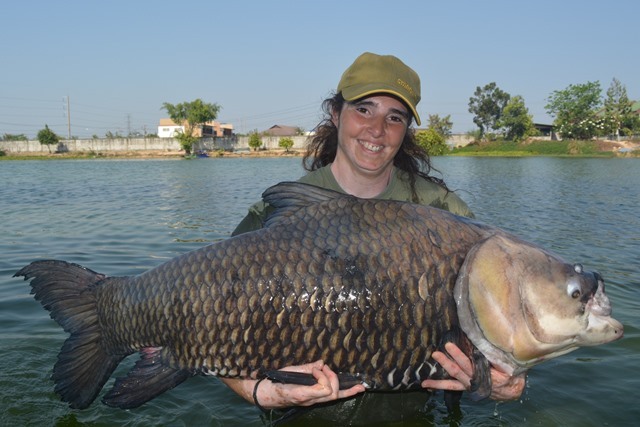 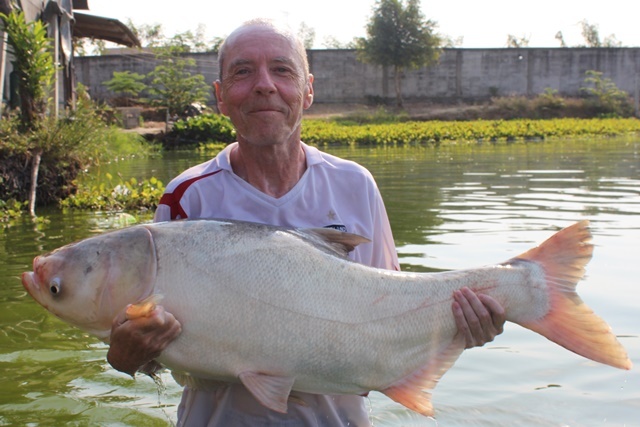 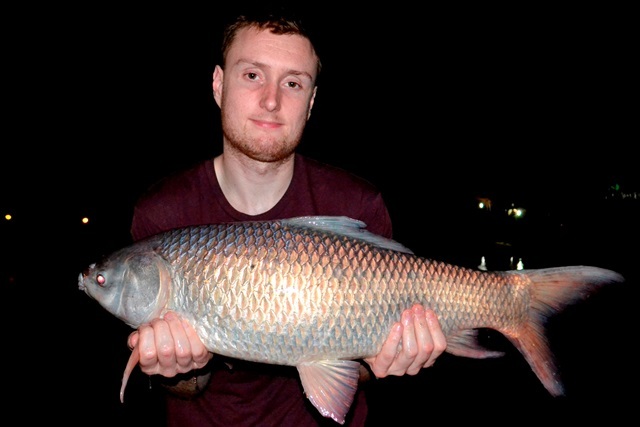 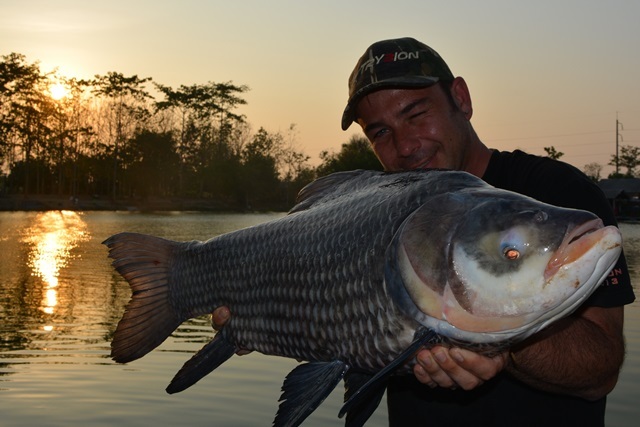 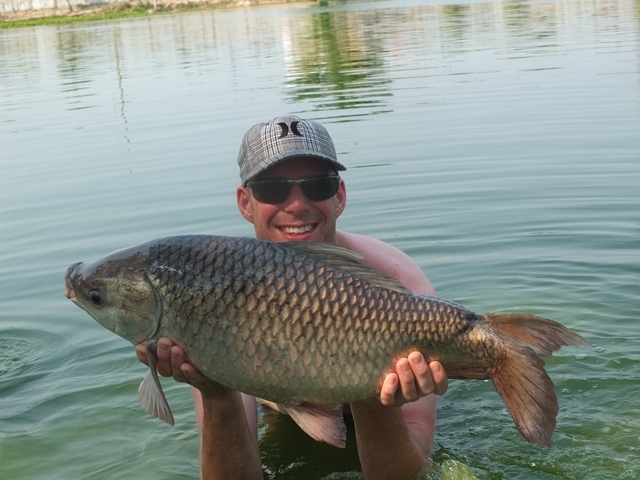 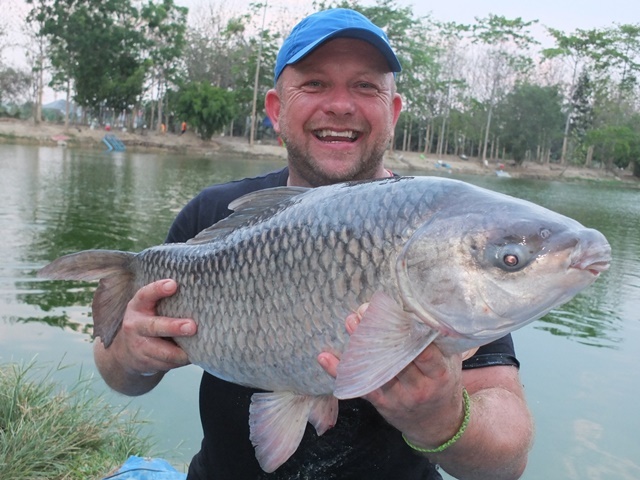 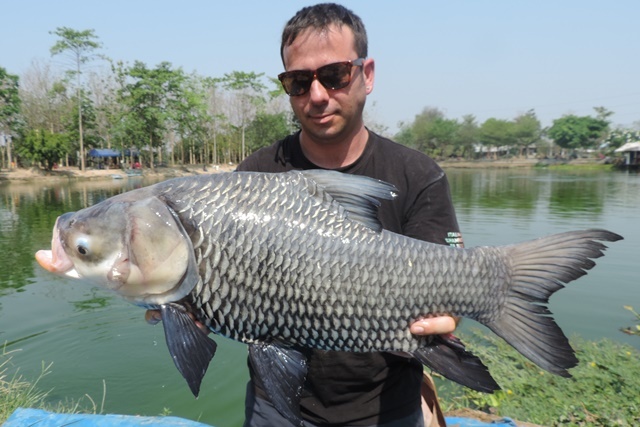 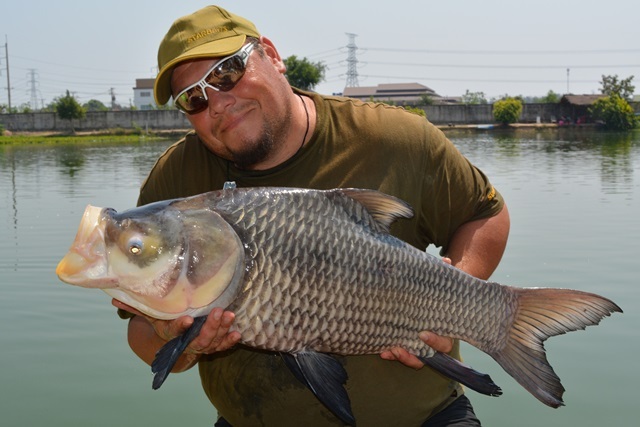 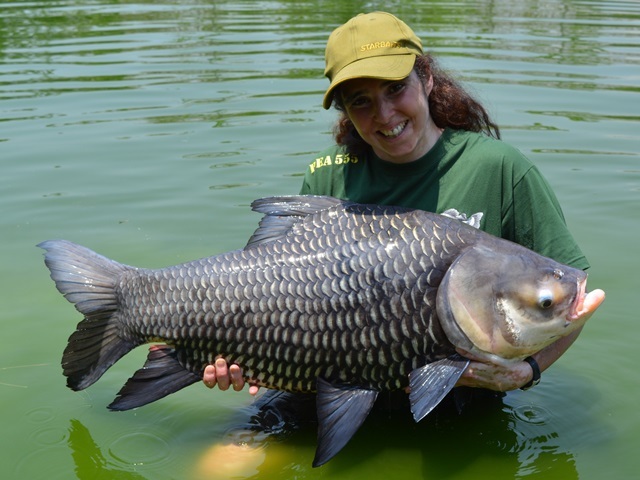 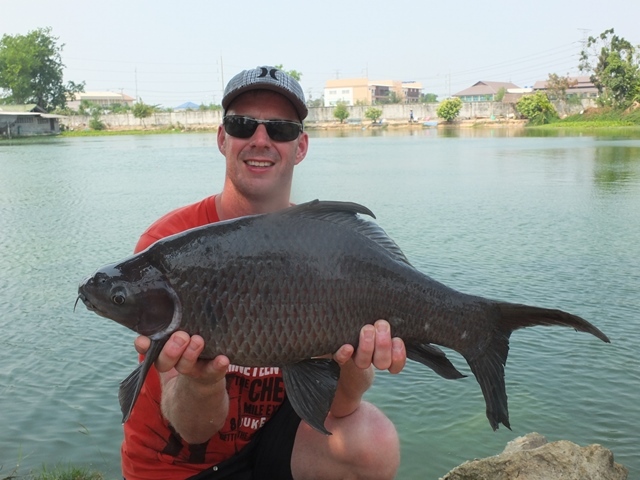 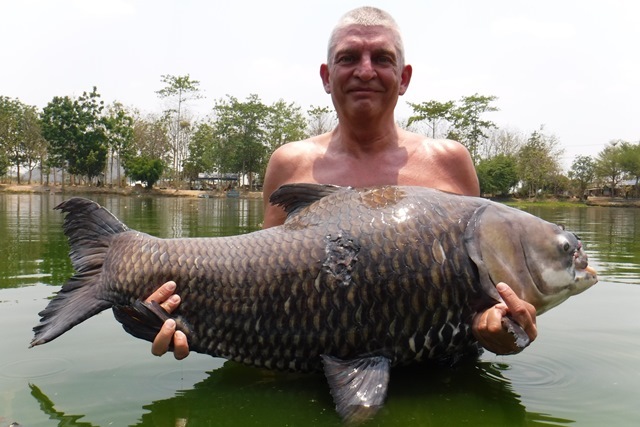 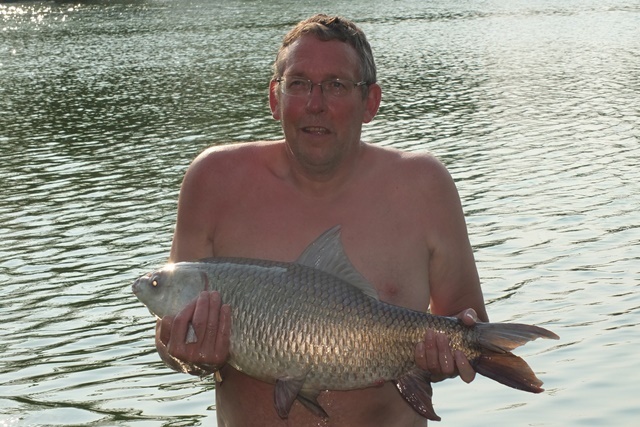 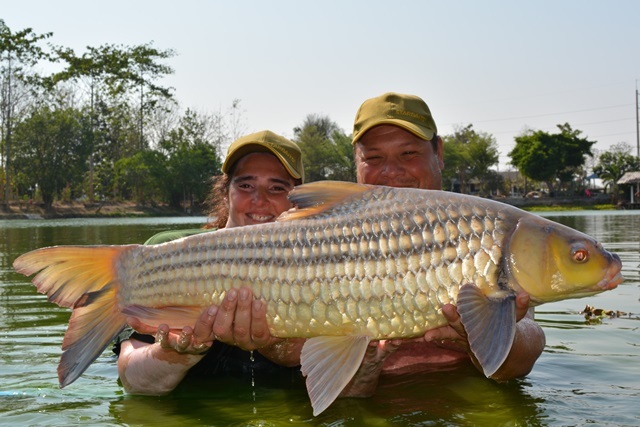 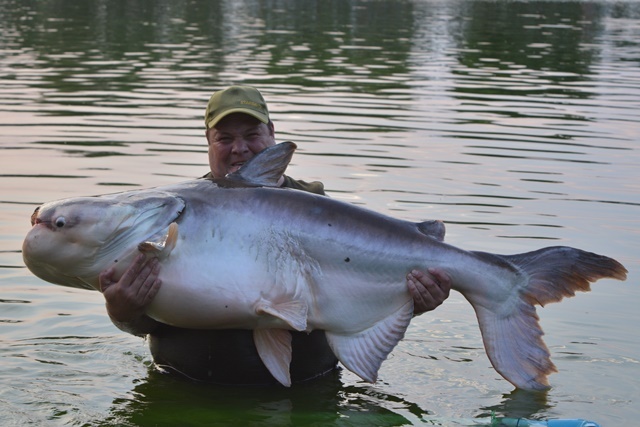 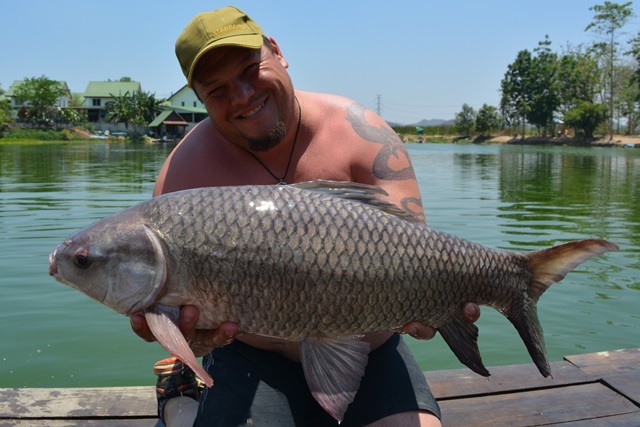 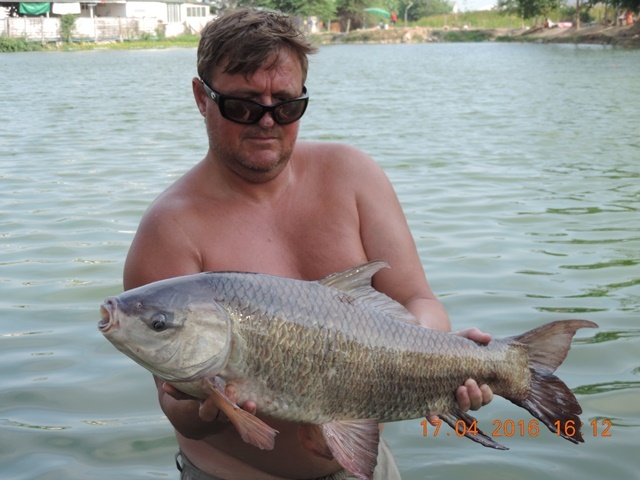 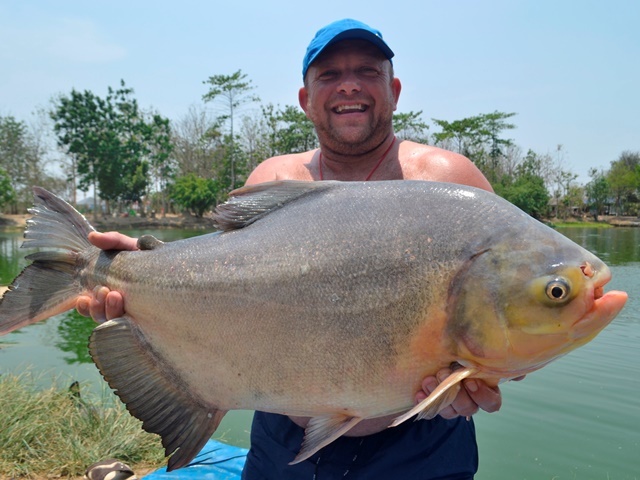 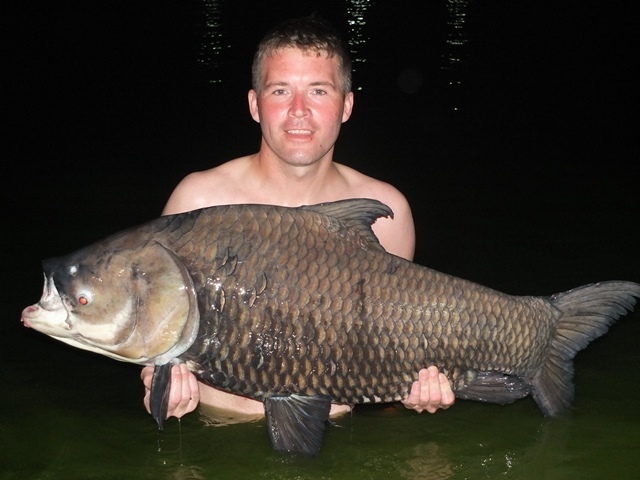 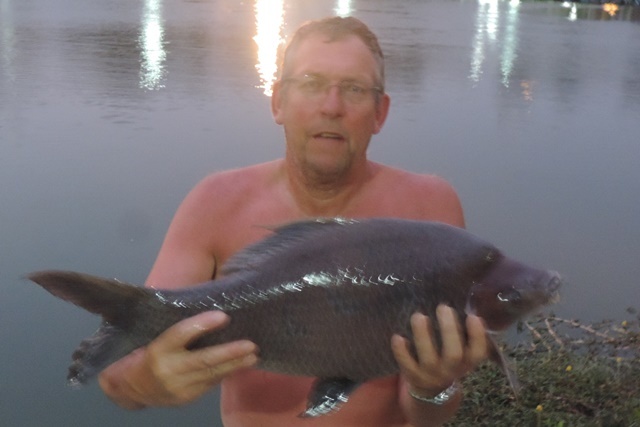 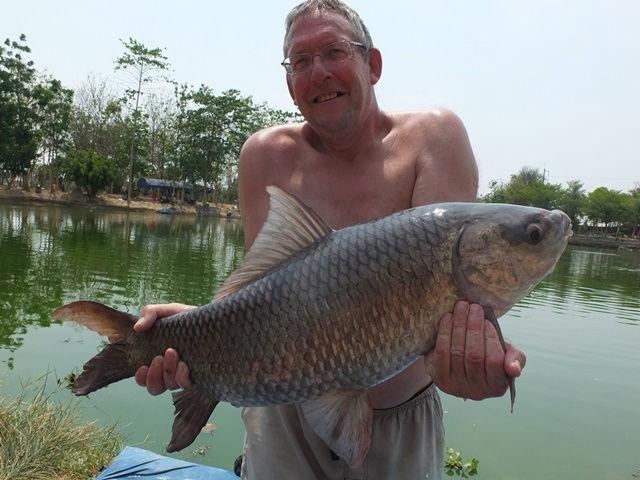 Dutch angler Harm Van Holsteijn was another angler who caught some great catches topped off by a Chinese bighead carp and a mint black shark minnow. 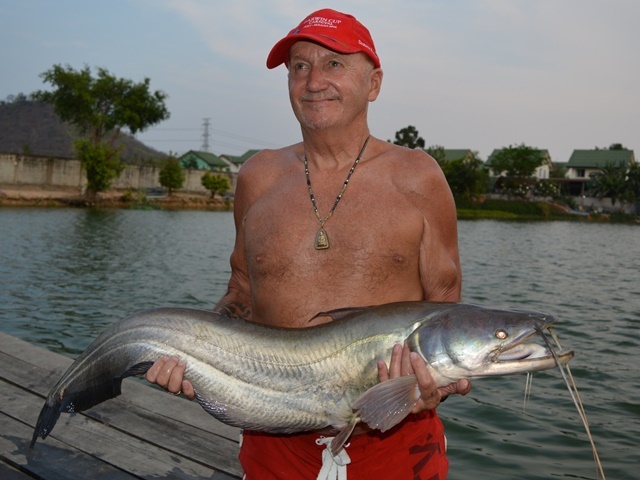 He also caught rohu, Mekong catfish, Amazon redtail and a good sized chao phraya catfish. 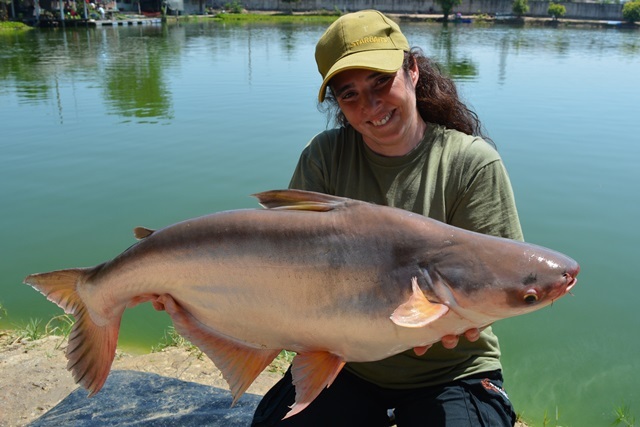 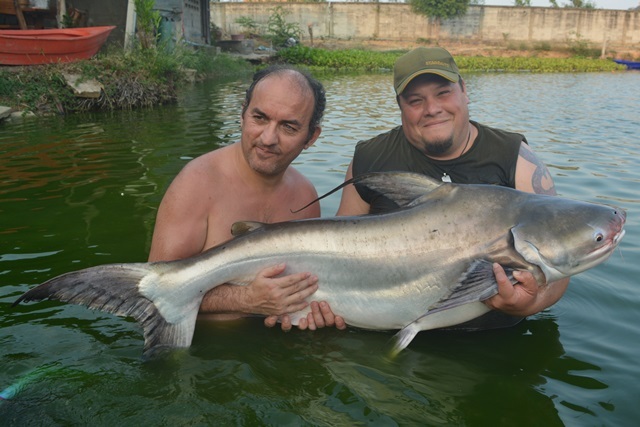 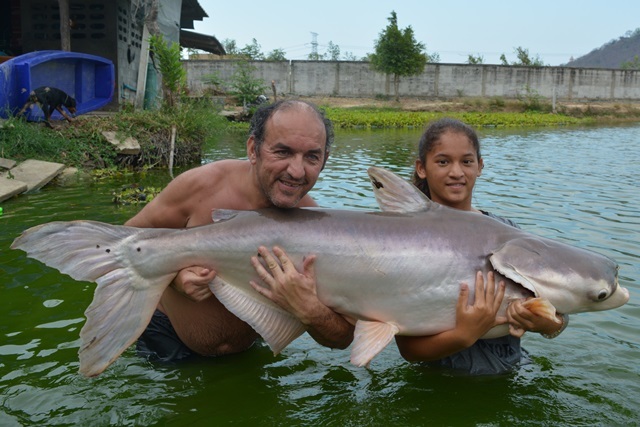 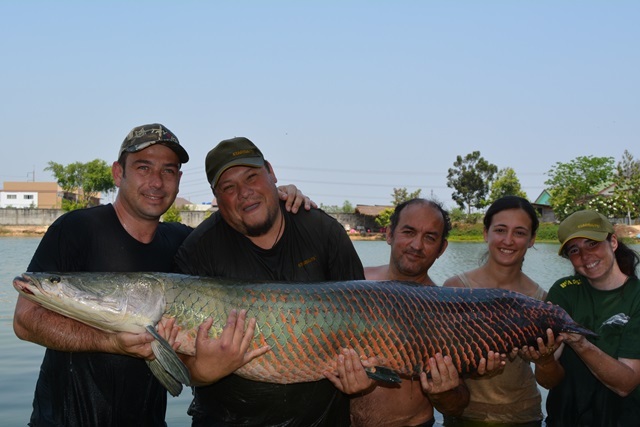 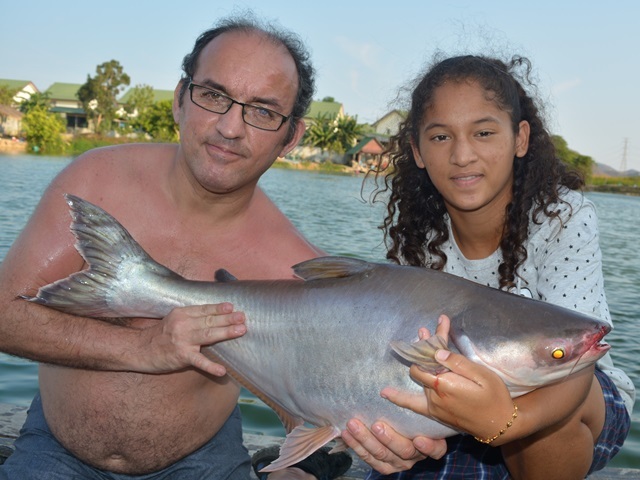 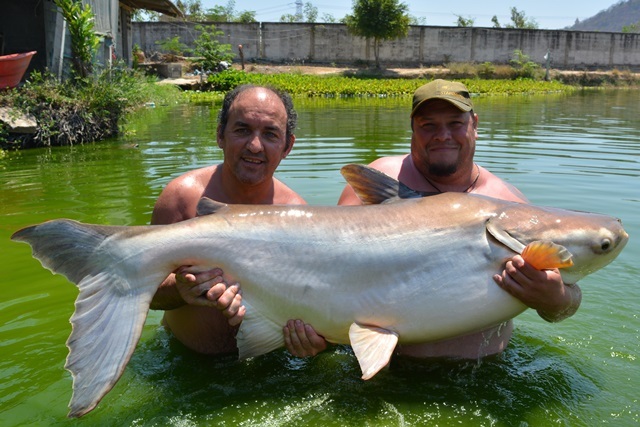 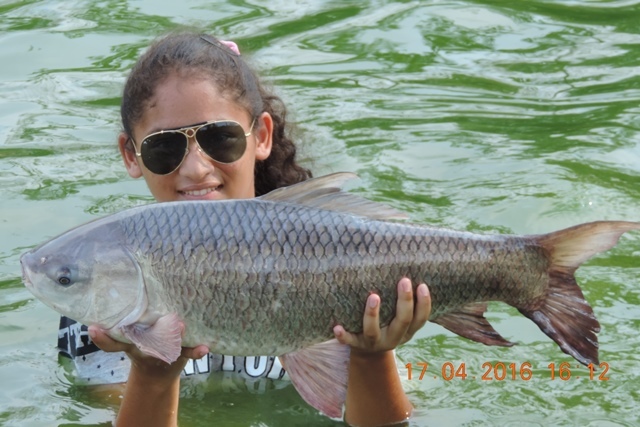 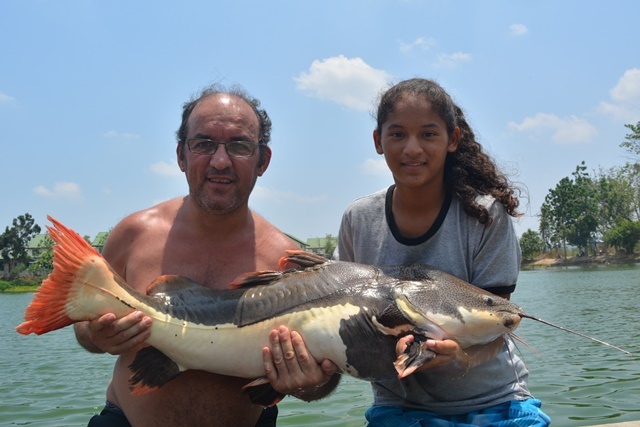 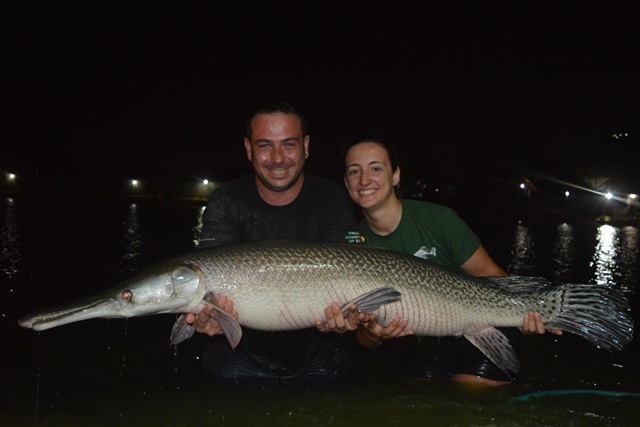 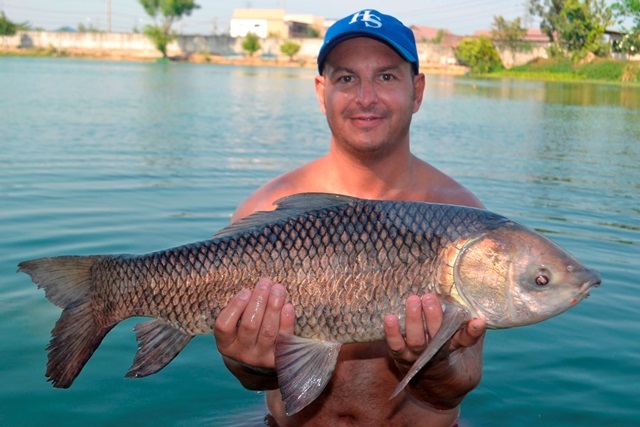 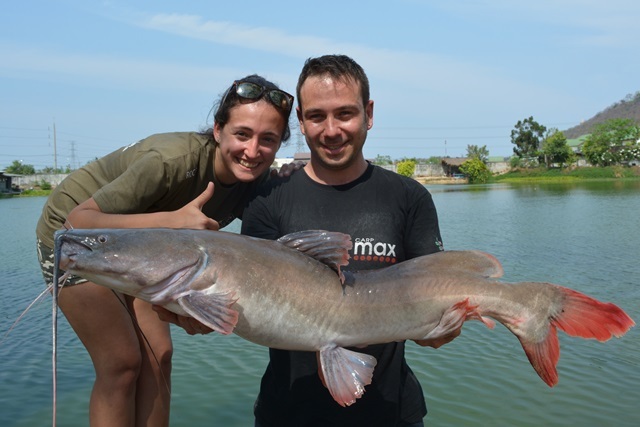 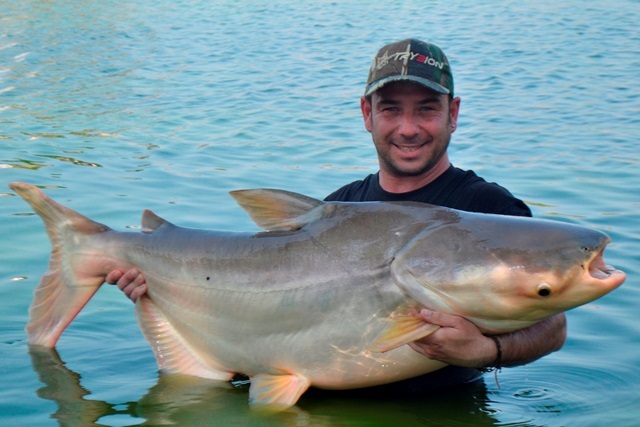 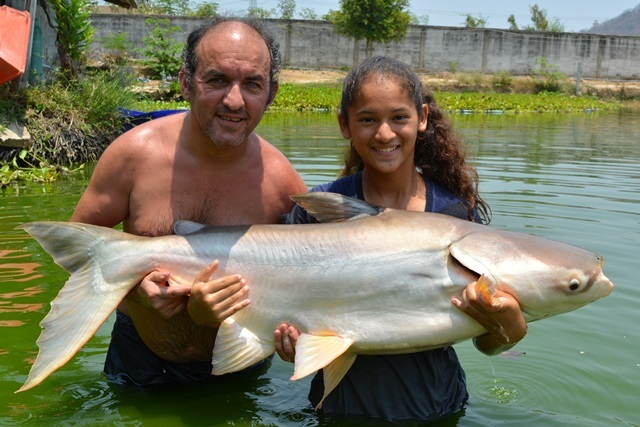 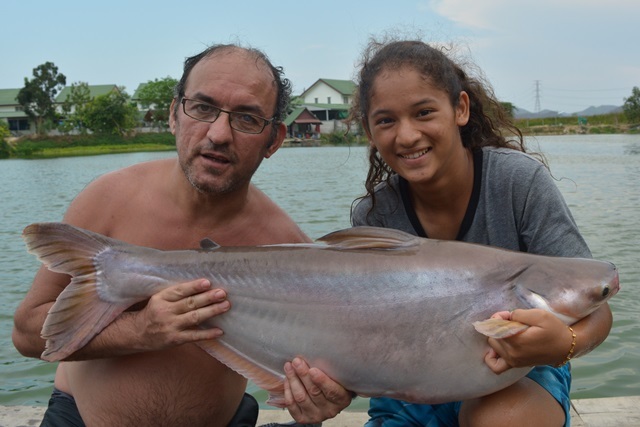 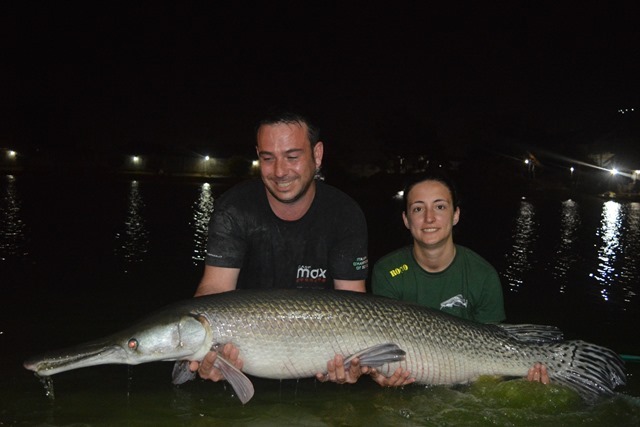 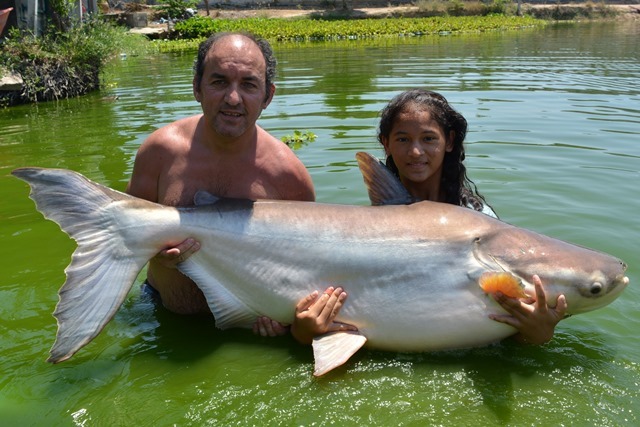 Luis Perez from Spain had an eventful week catching a number of great catches that included a 120lb Siamese carp and a stunning alligator gar. 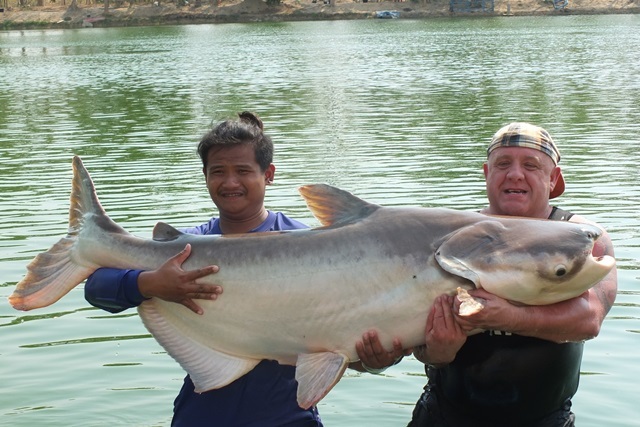 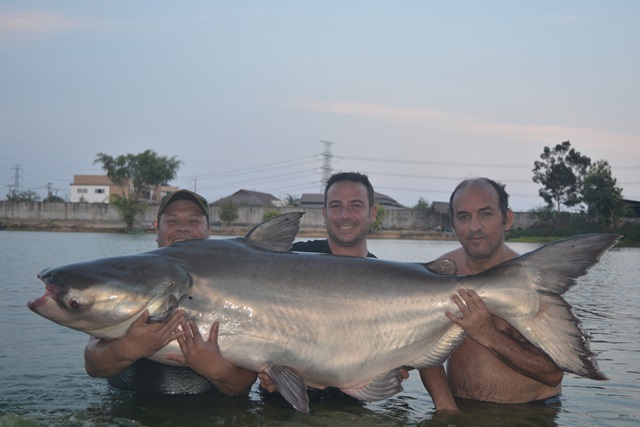 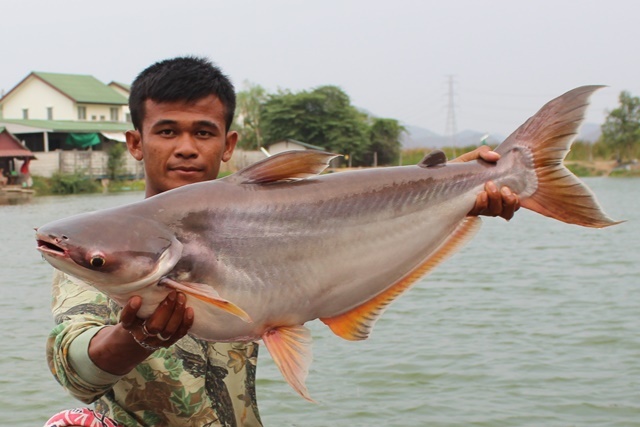 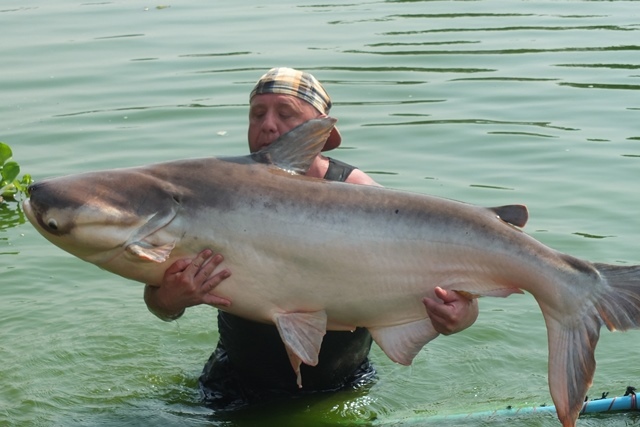 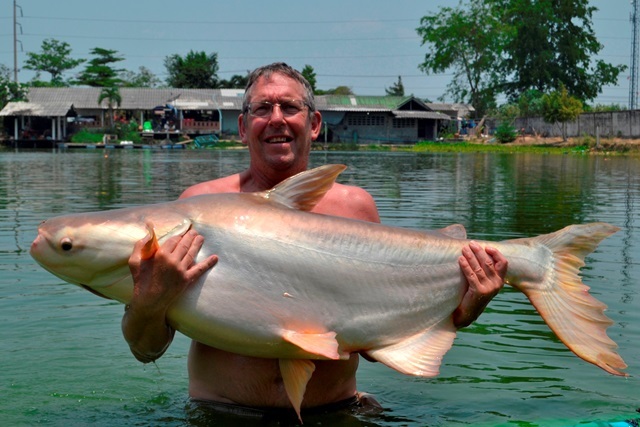 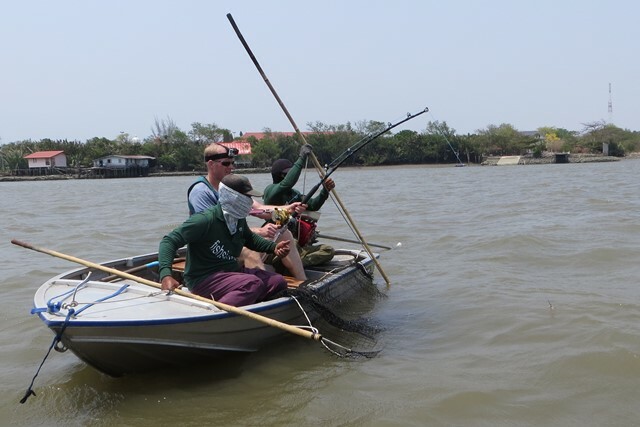 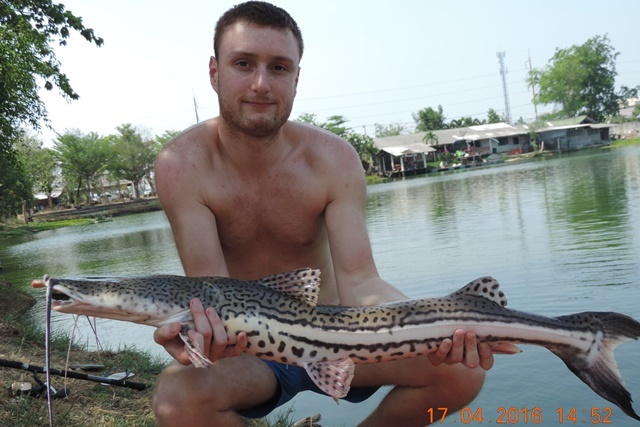 In addition he caught big-Y catfish, Mekong catfish, striped catfish, catfish shark, suckermouth catfish, rohu, tambaqui, chao phraya catfish as well as both Thai and Amazon redtails. 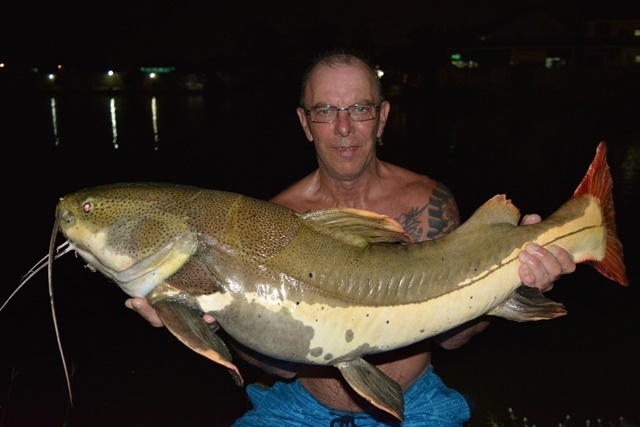 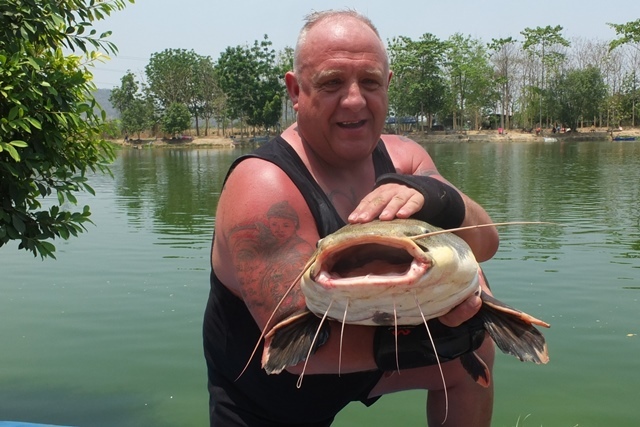 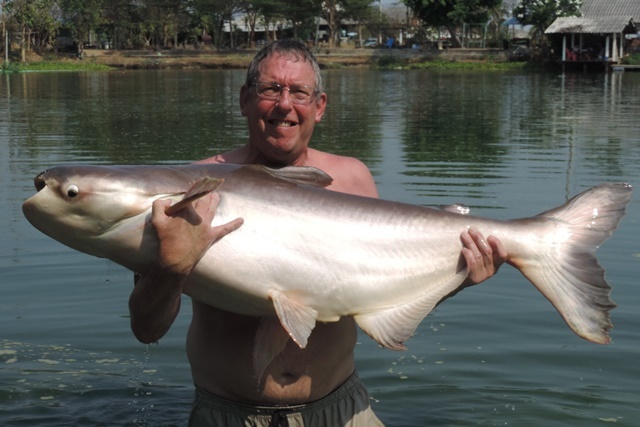 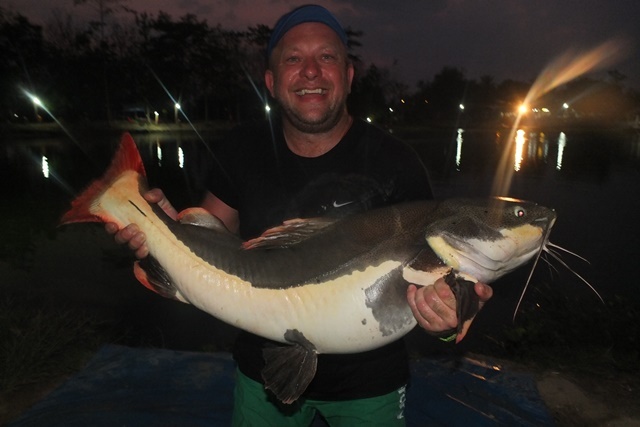 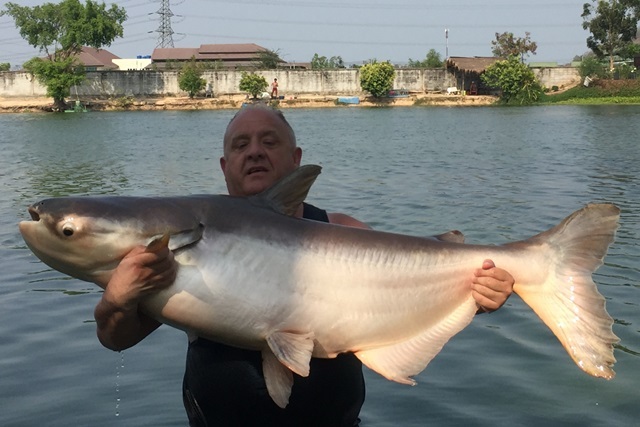 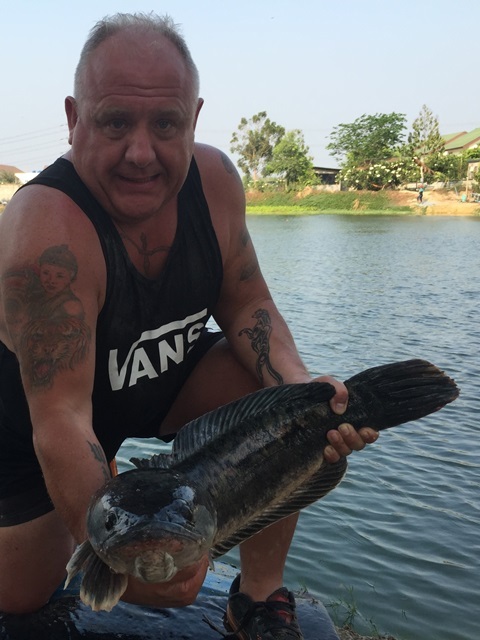 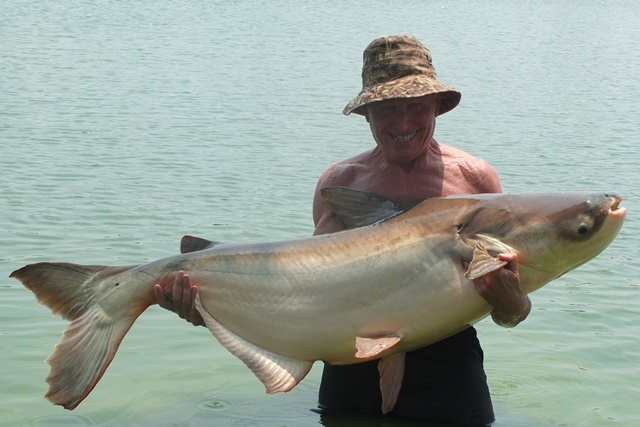 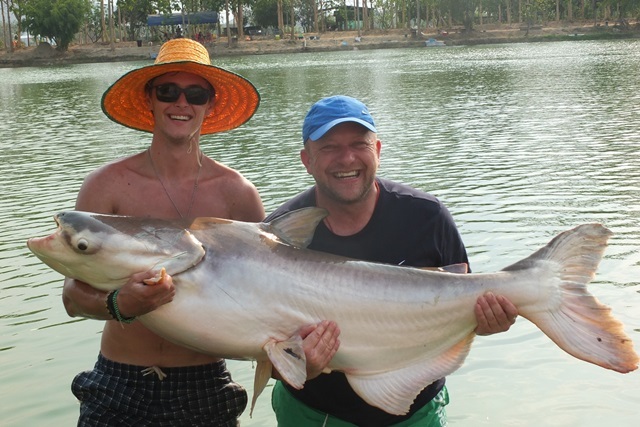 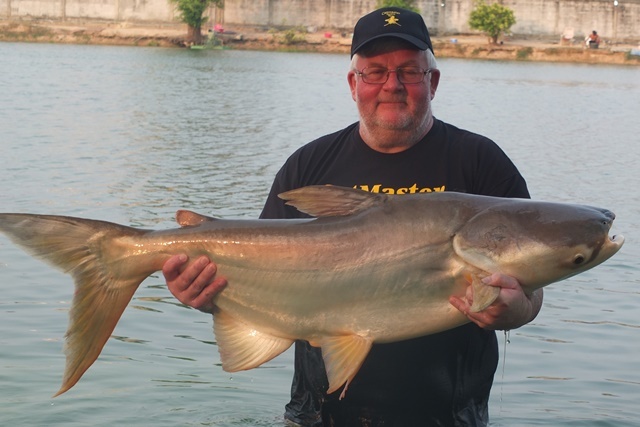 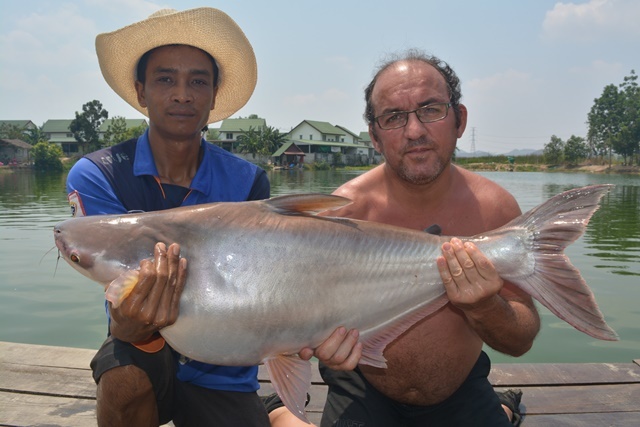 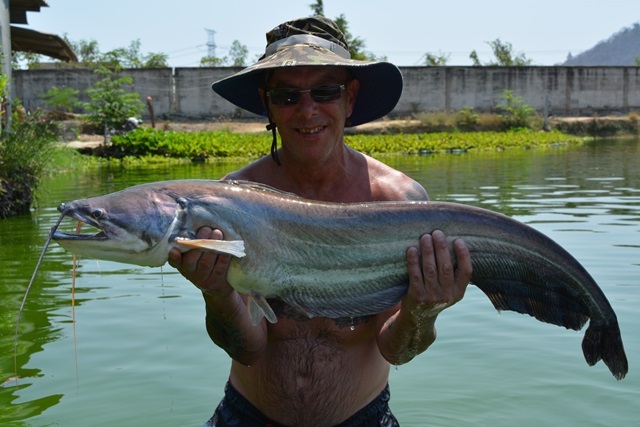 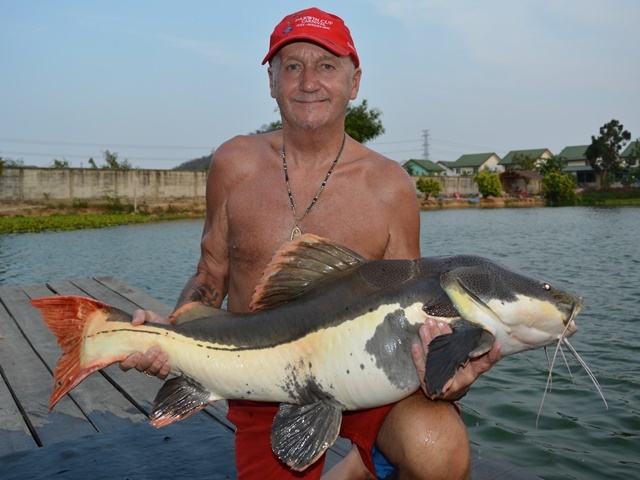 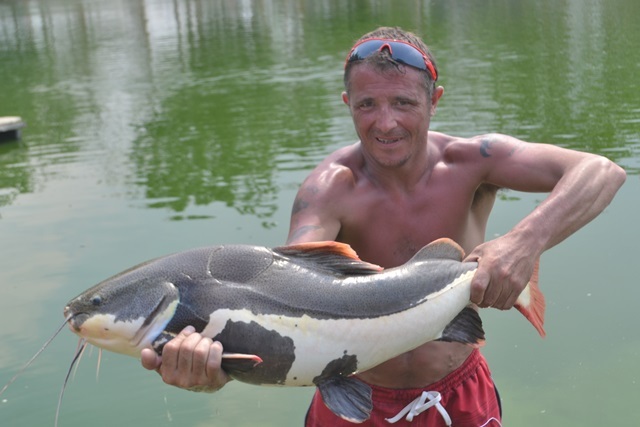 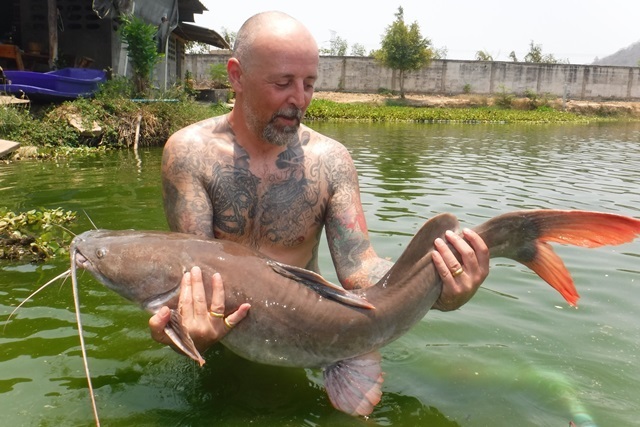 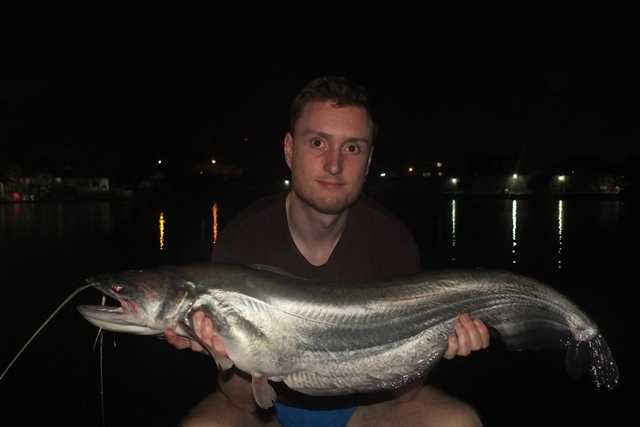 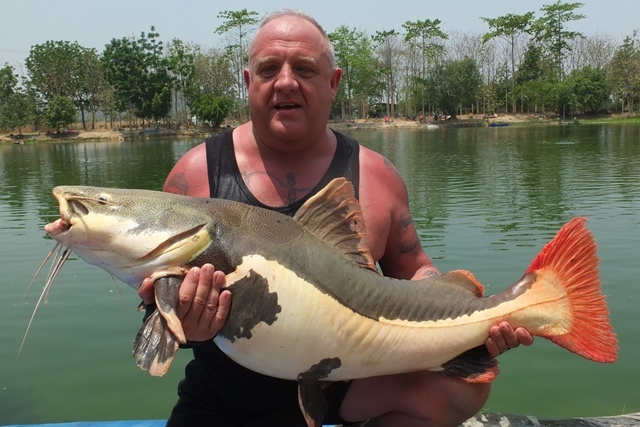 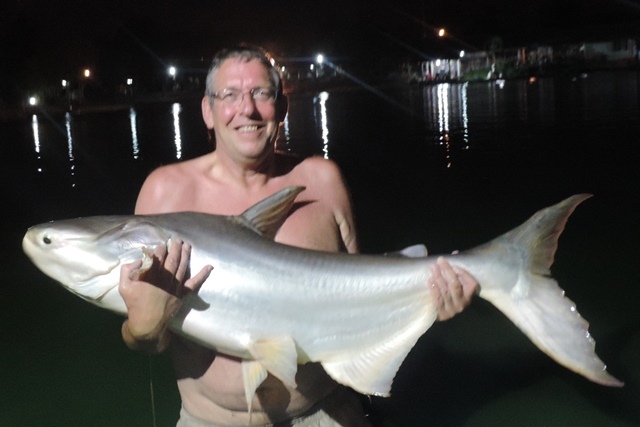 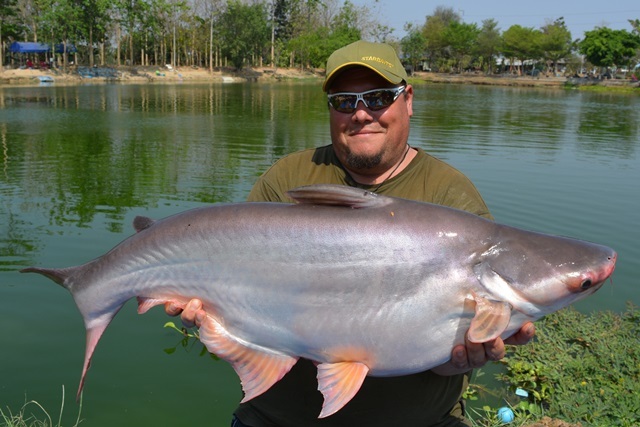 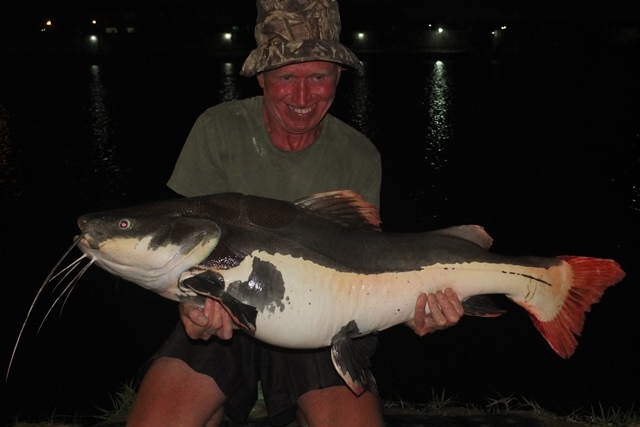 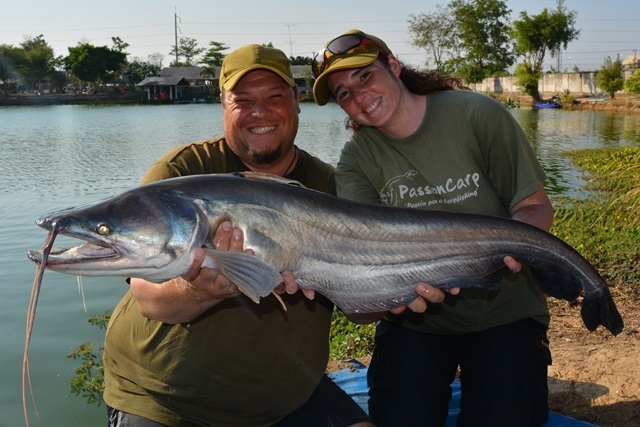 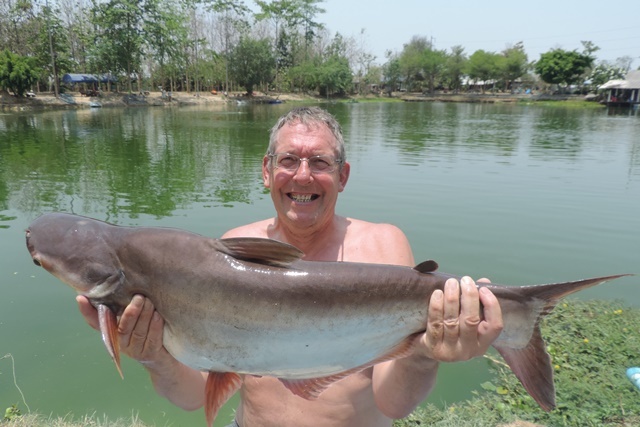 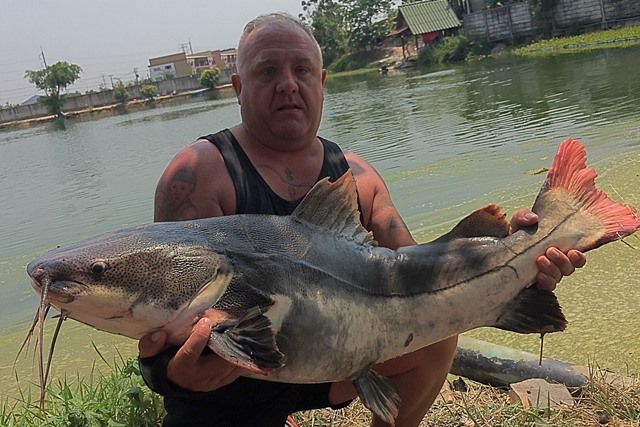 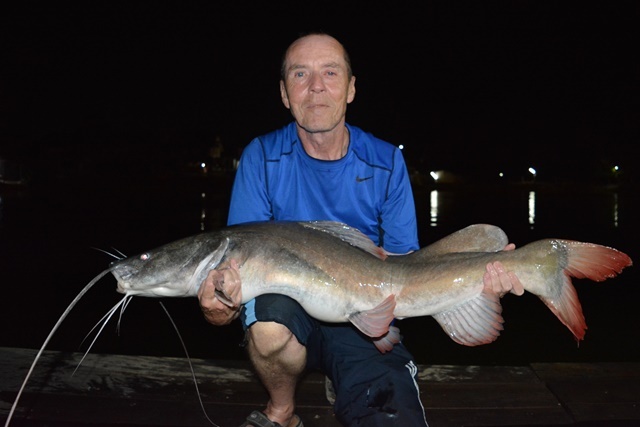 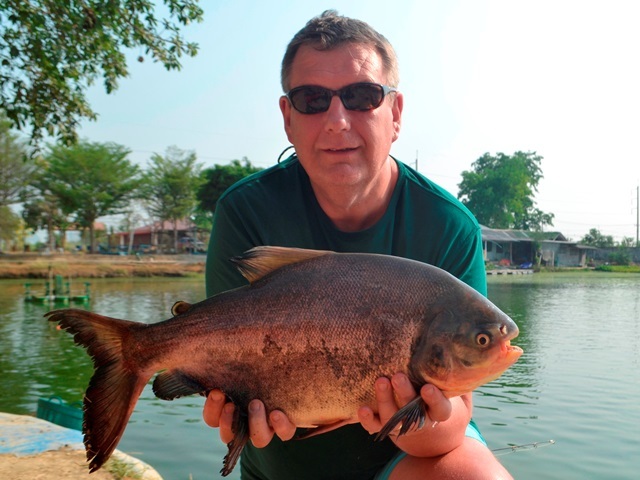 Peter Butler from Pattaya made his first trip to Palm Tree looking for somewhere different to fish and thoroughly enjoyed his session promising to be back soon after landing Mekong catfish, big-Y catfish, wallago attu, striped catfish and Amazon redtail. 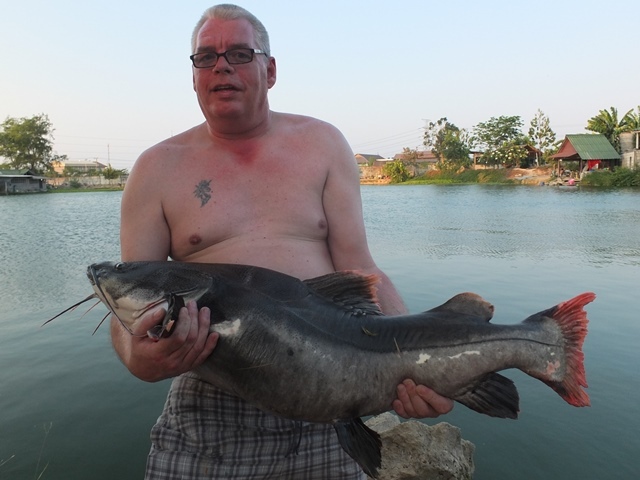 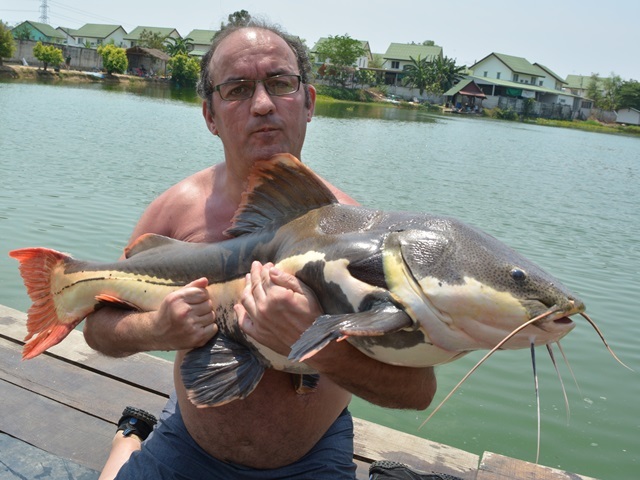 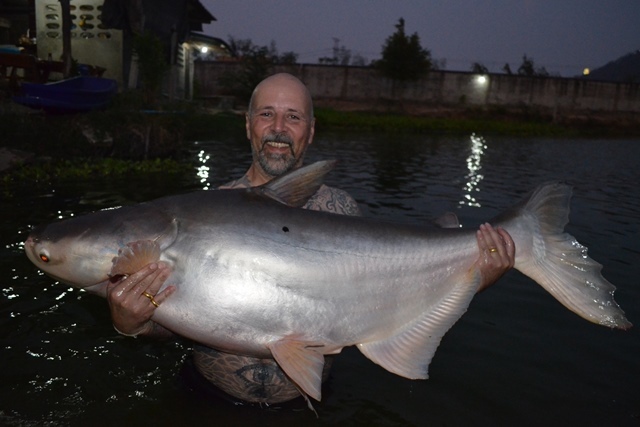 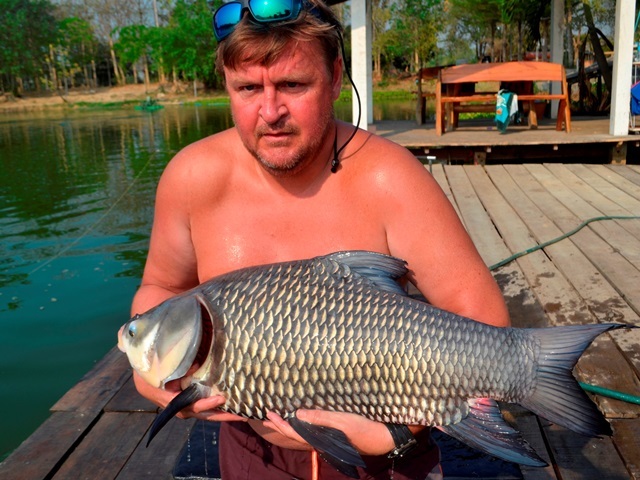 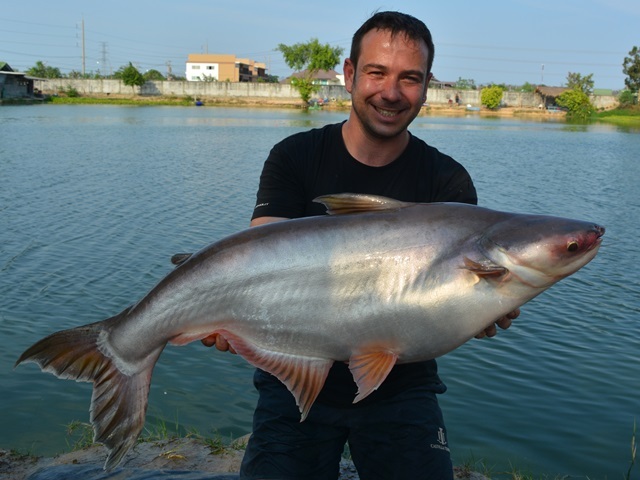 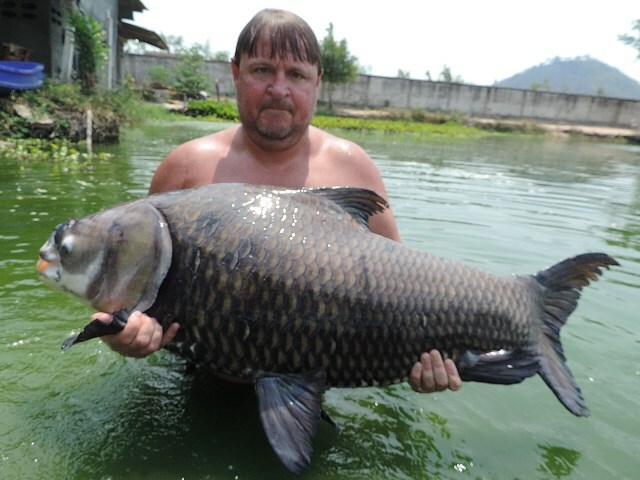 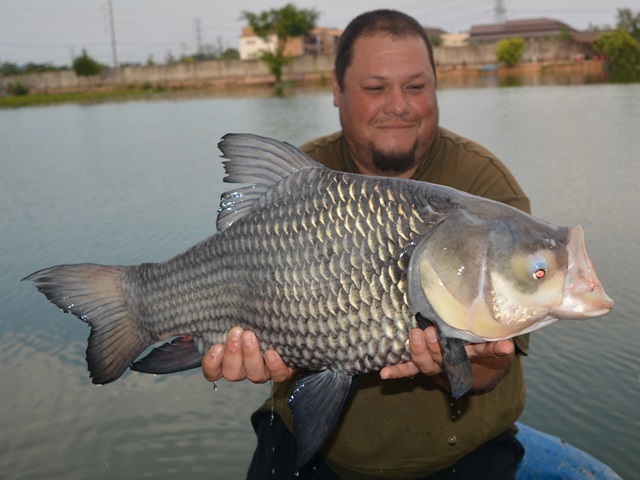 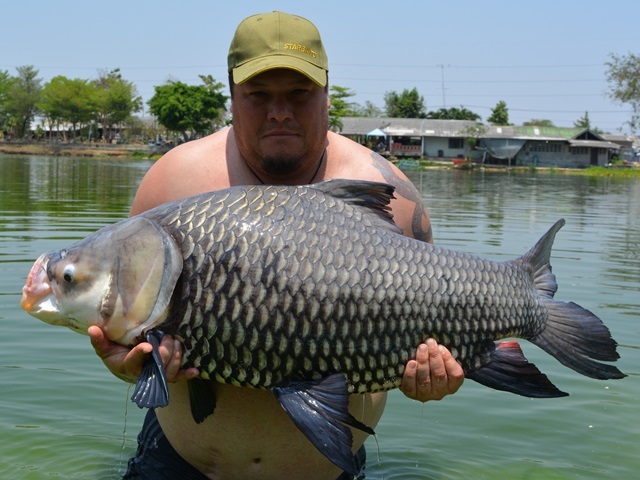 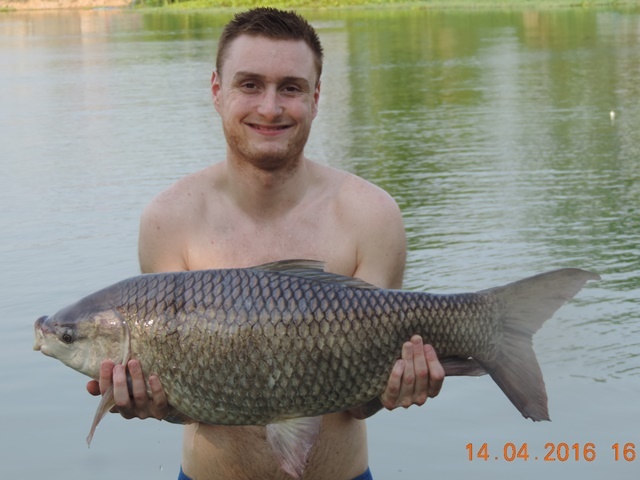 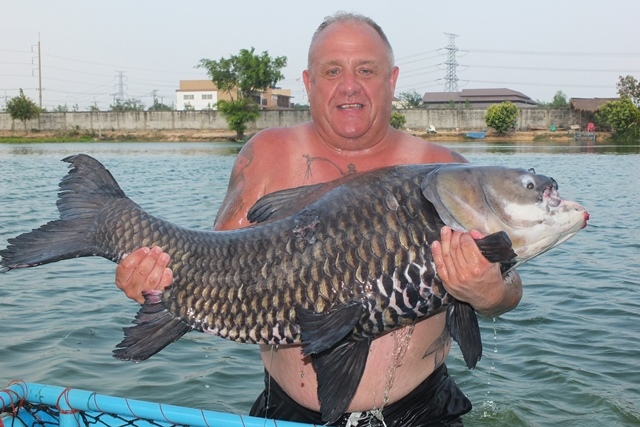 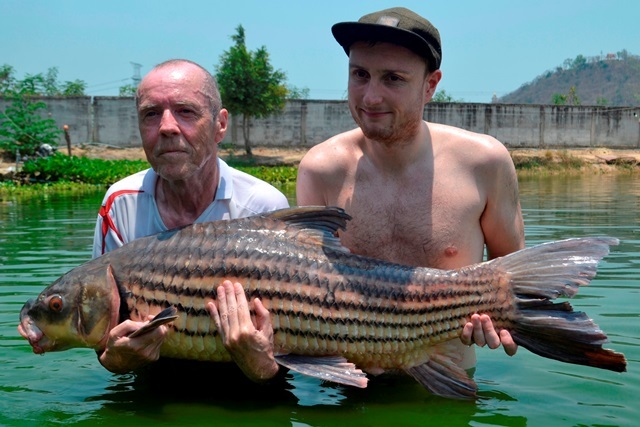 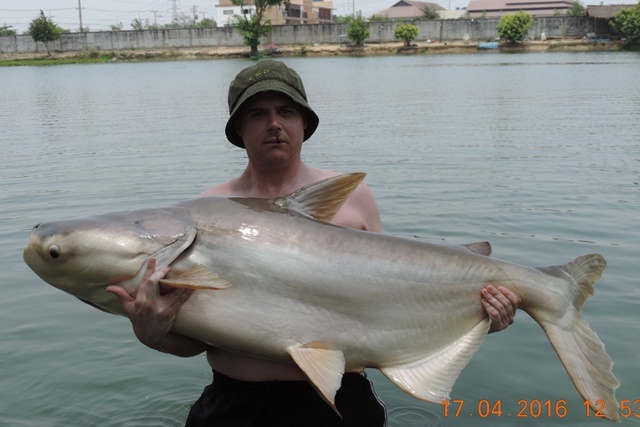 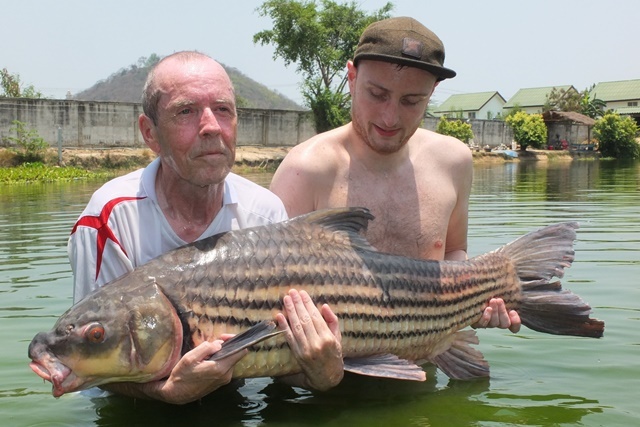 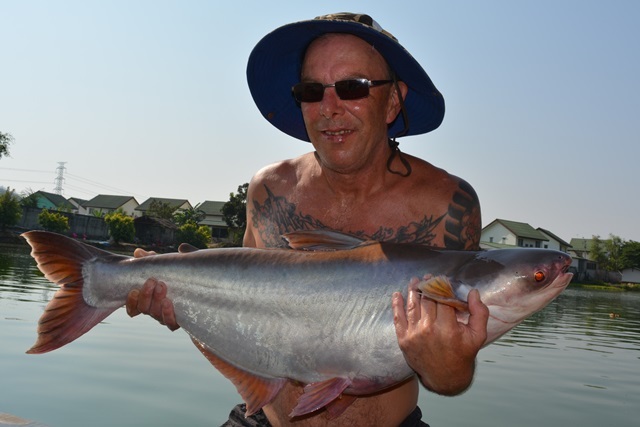 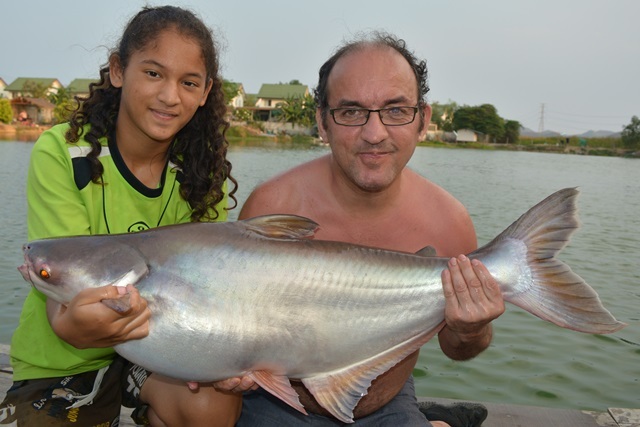 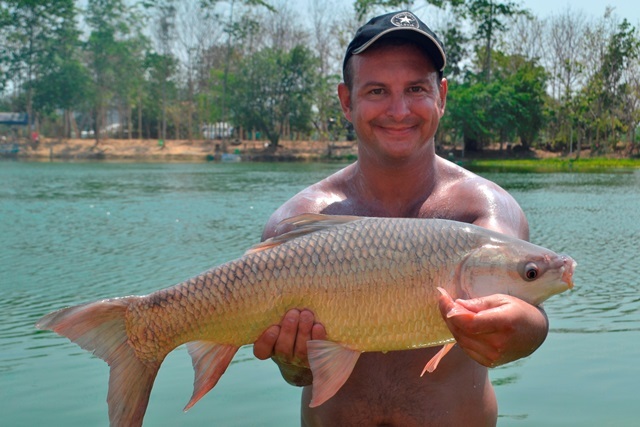 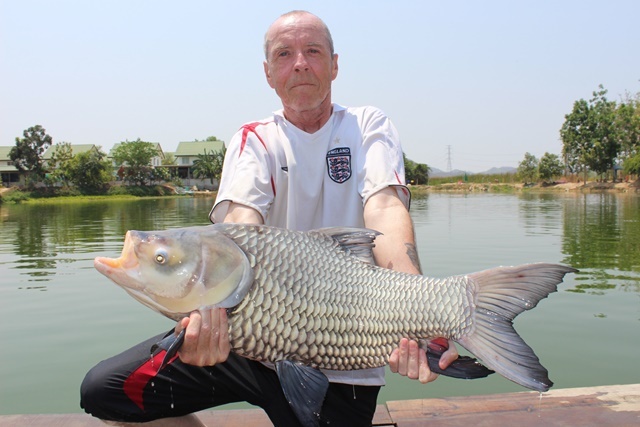 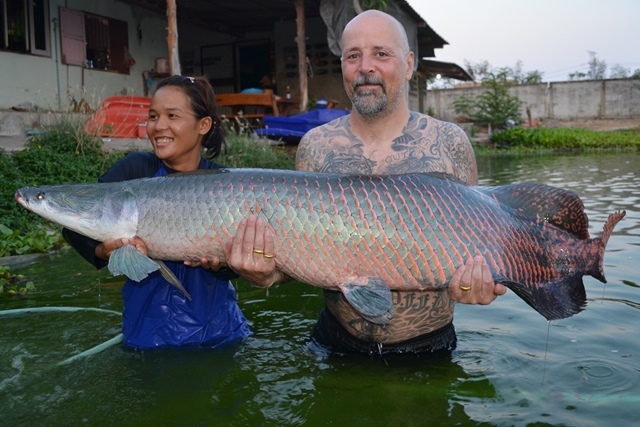 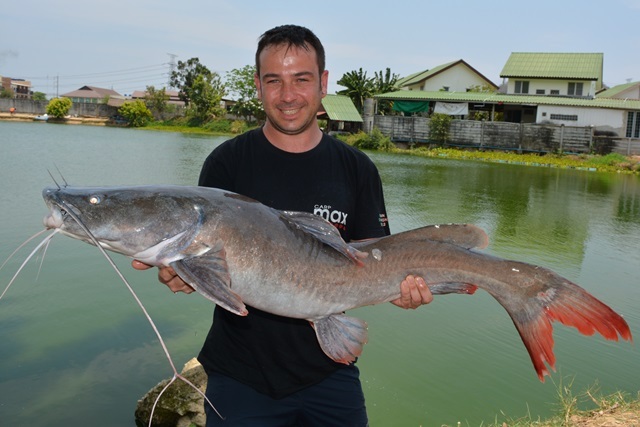 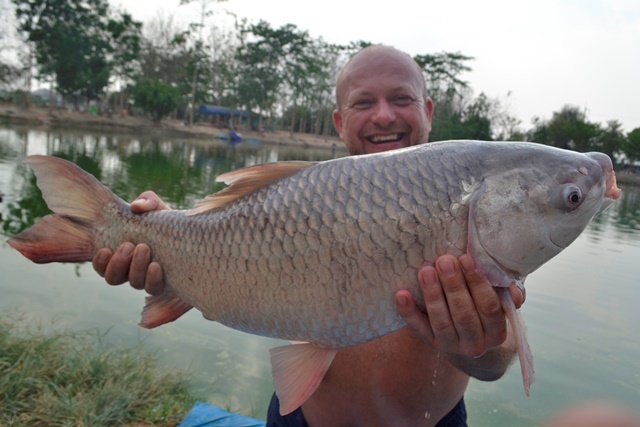 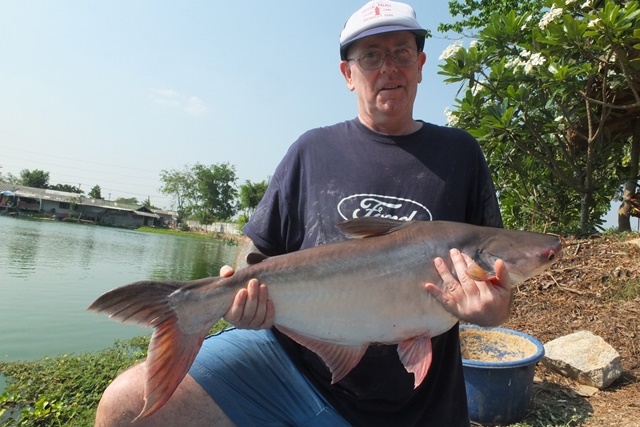 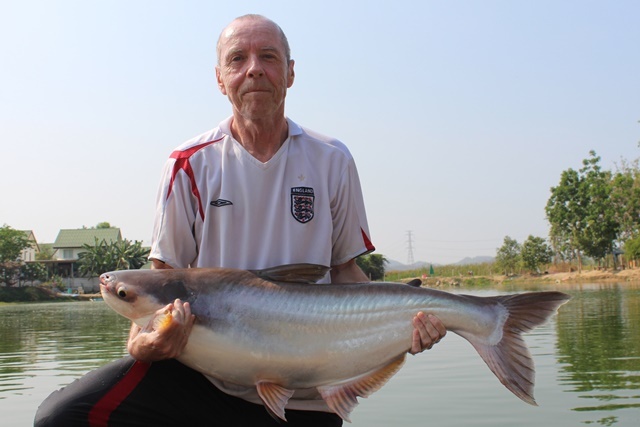 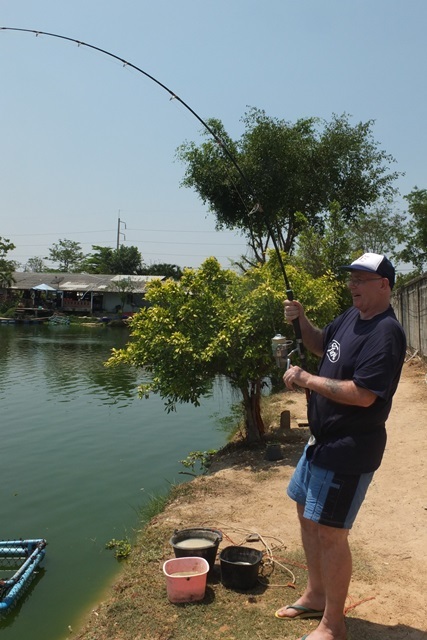 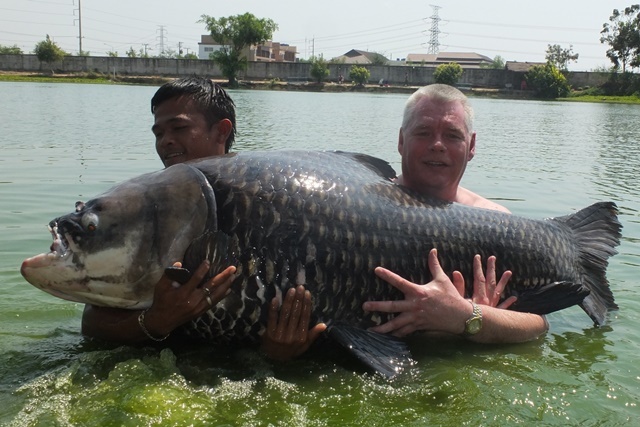 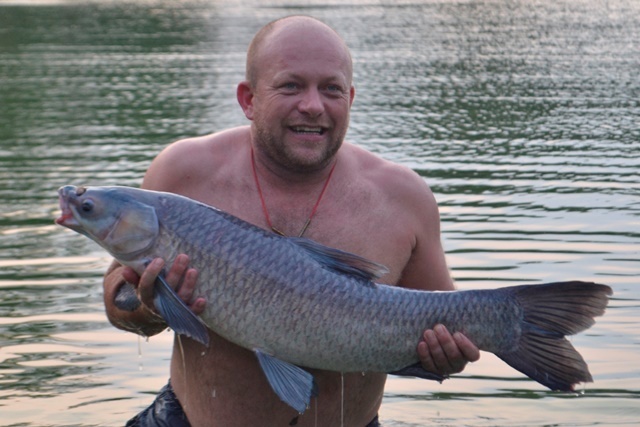 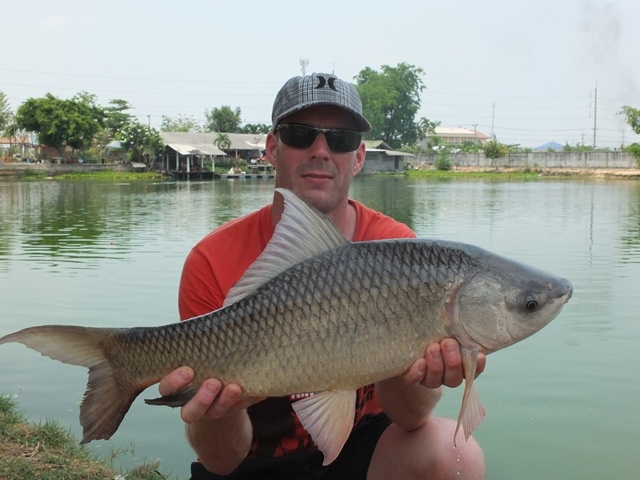 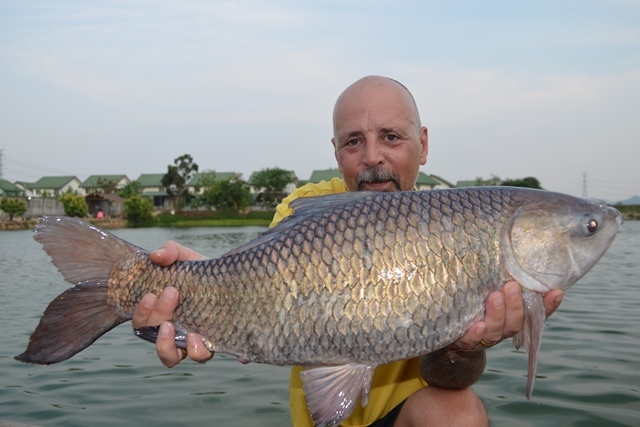 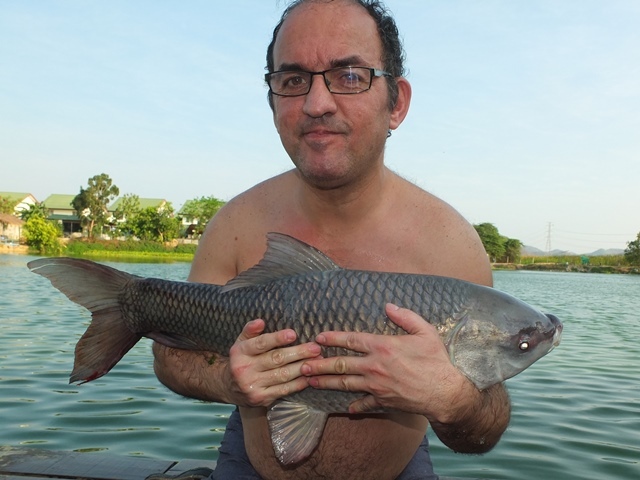 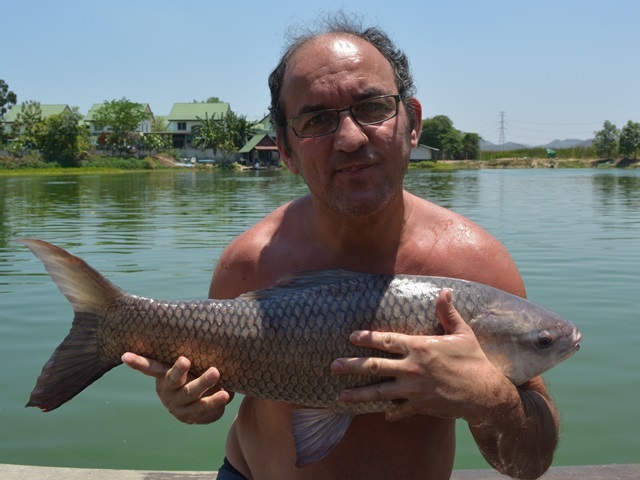 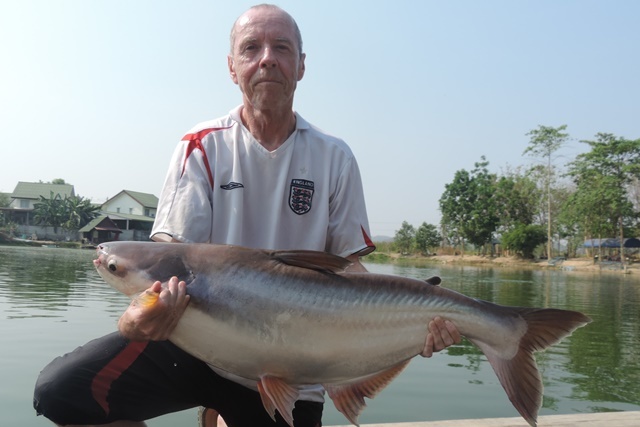 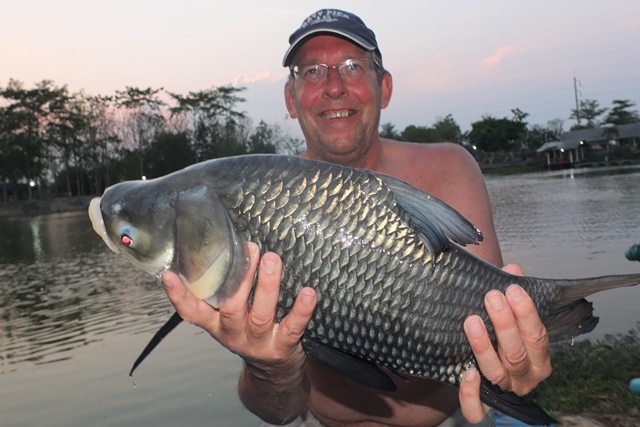 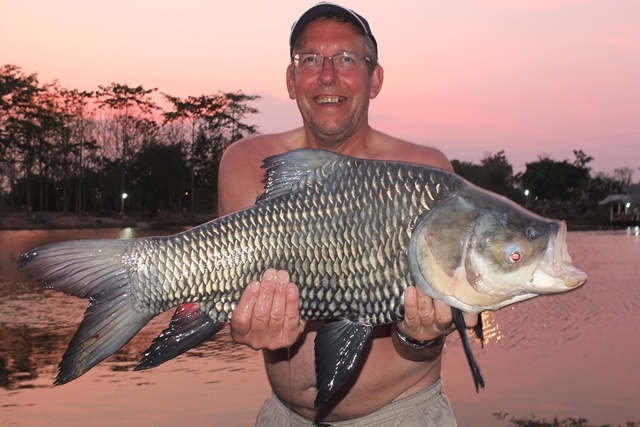 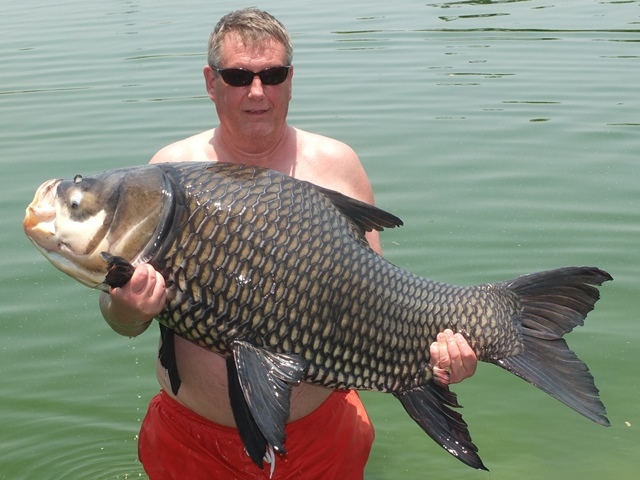 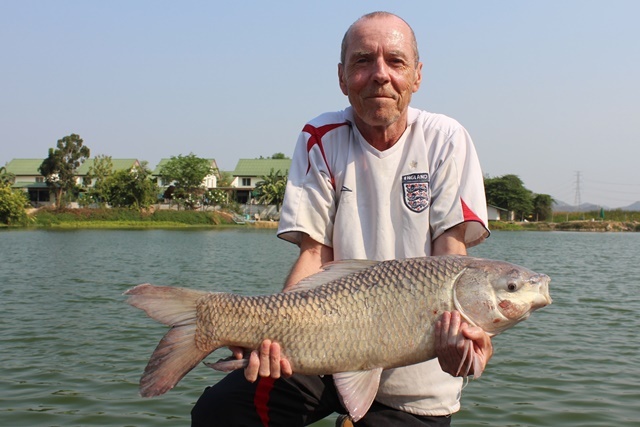 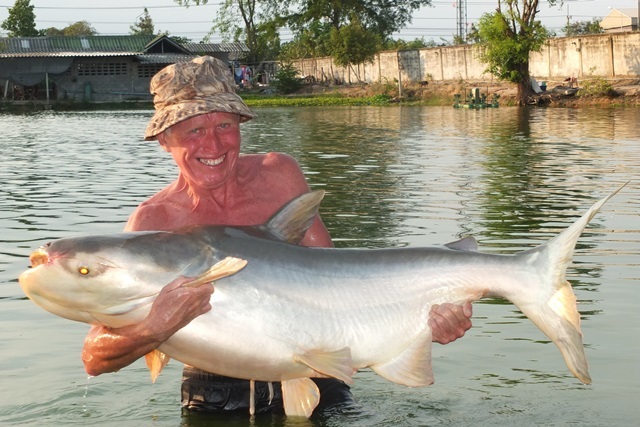 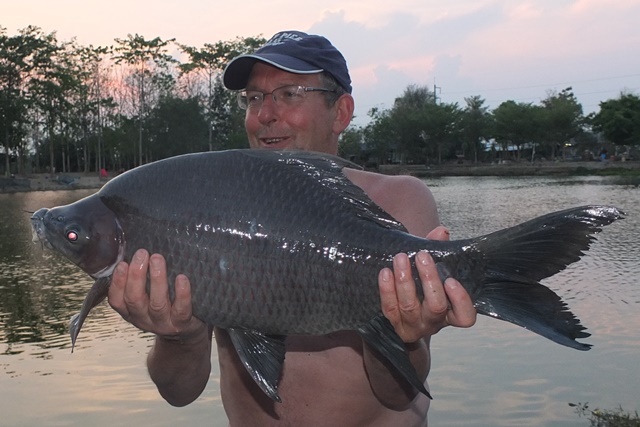 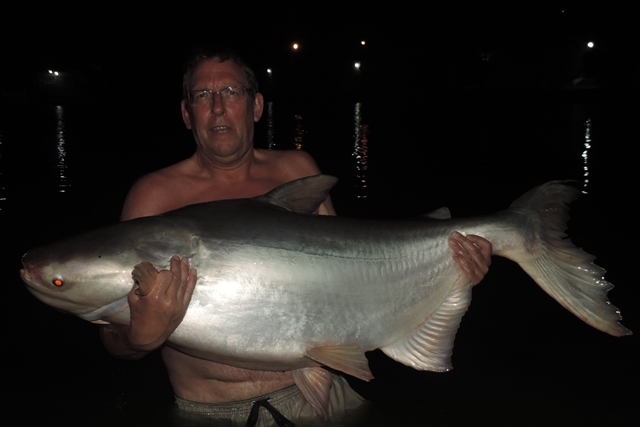 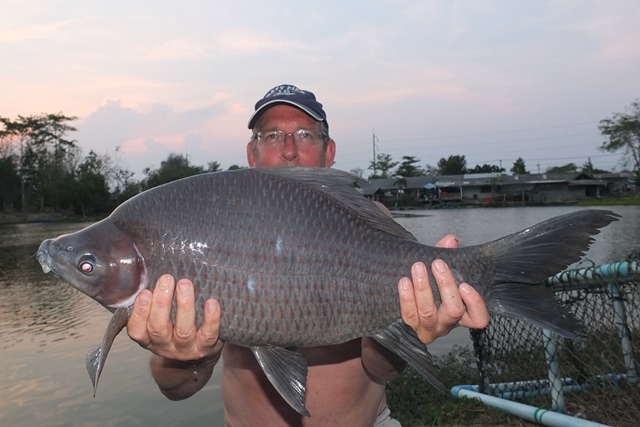 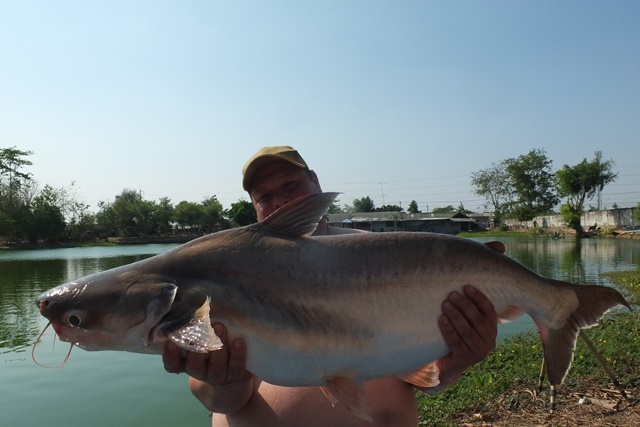 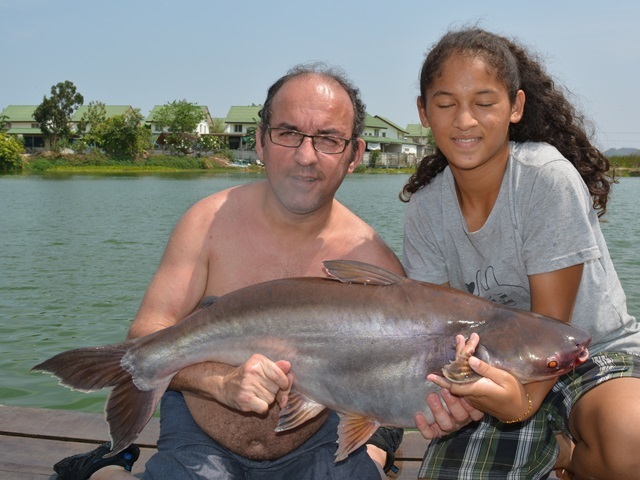 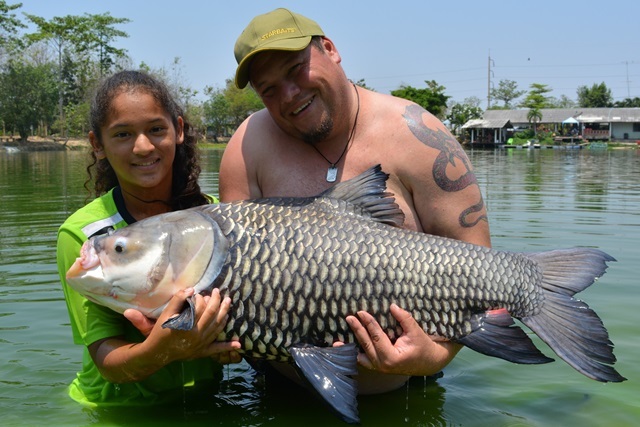 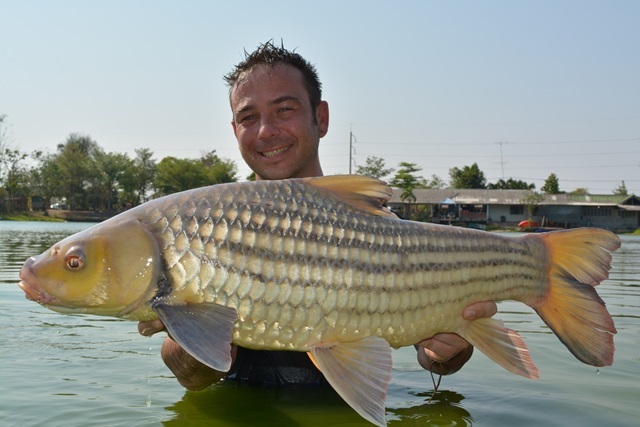 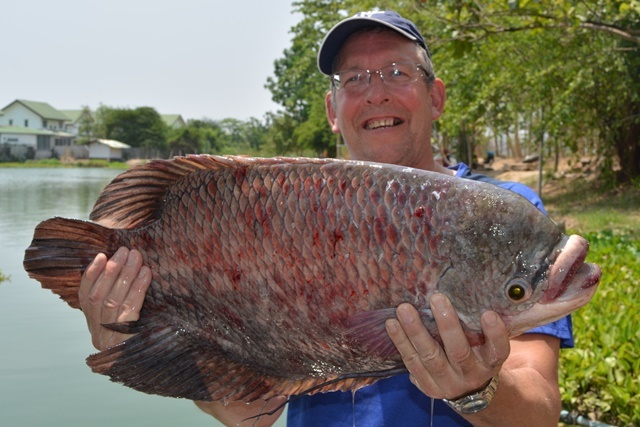 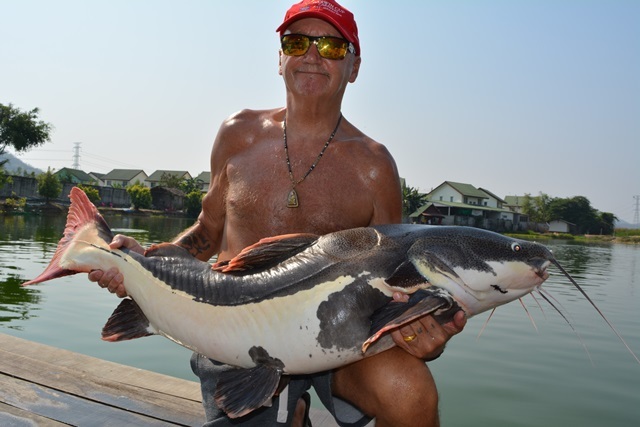 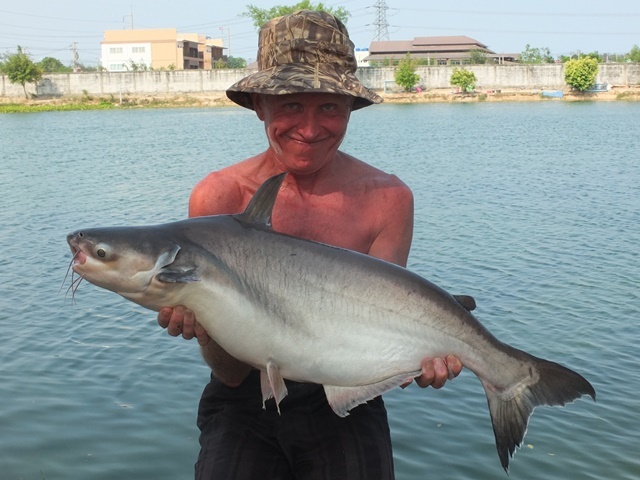 John Harper another angler who lives in Bangkok came down and had a good day catching some nice fish that included arapaiama, Mekong catfish, striped catfish, Siamese carp and Amazon redtail. 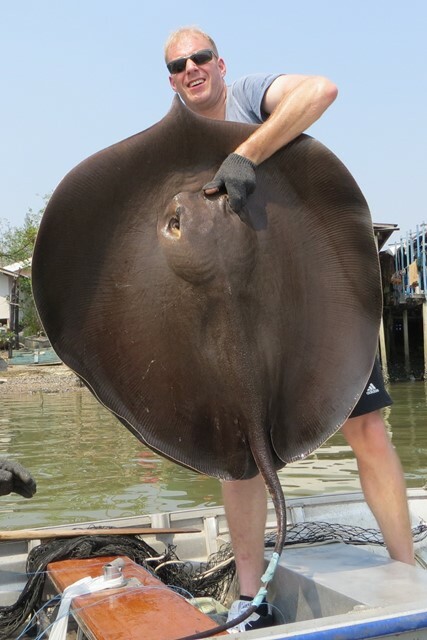 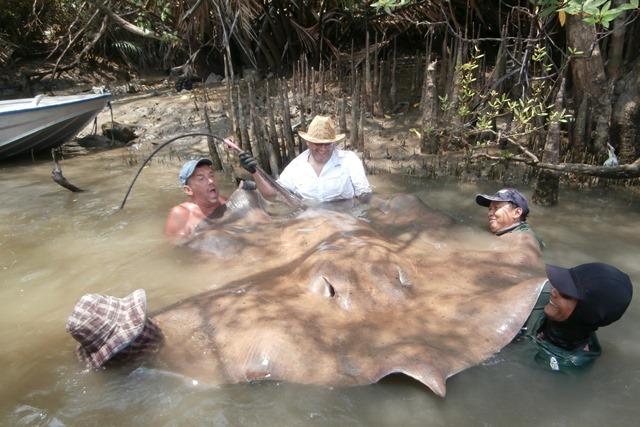 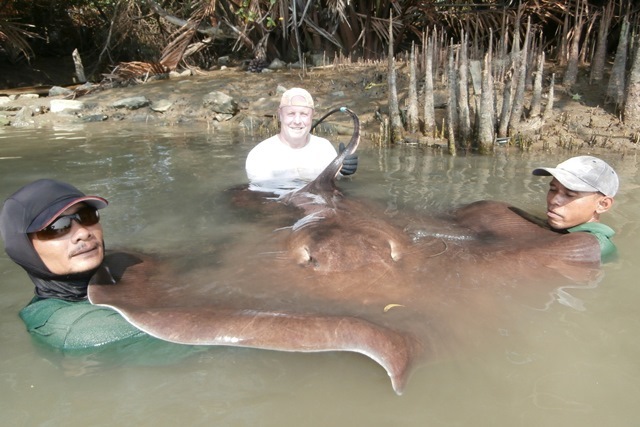 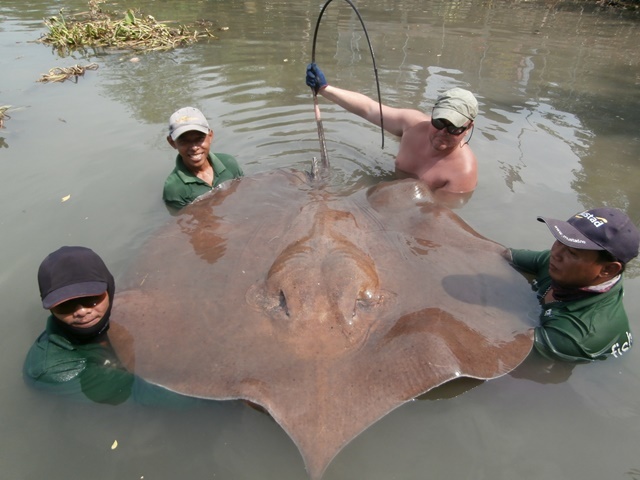 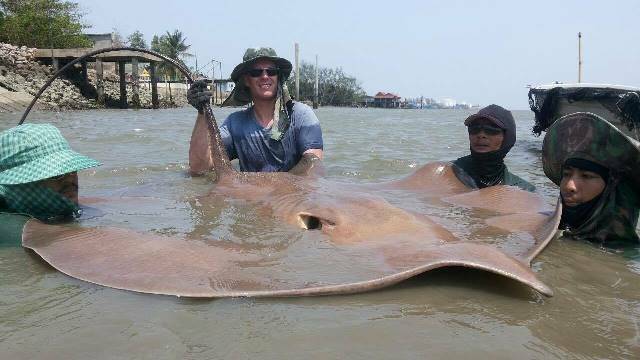 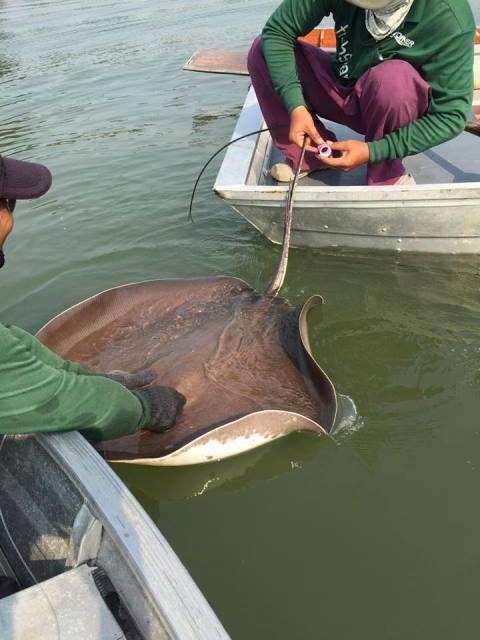 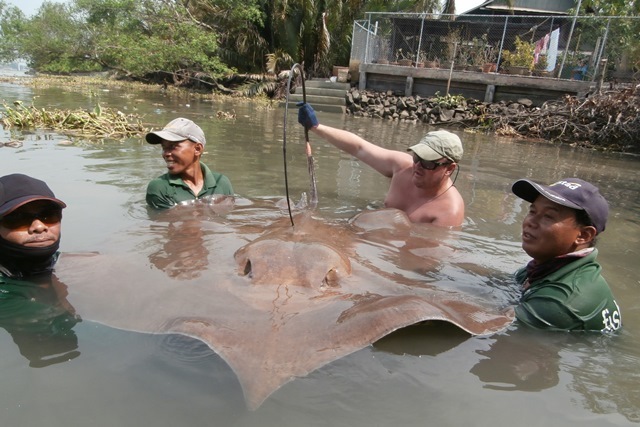 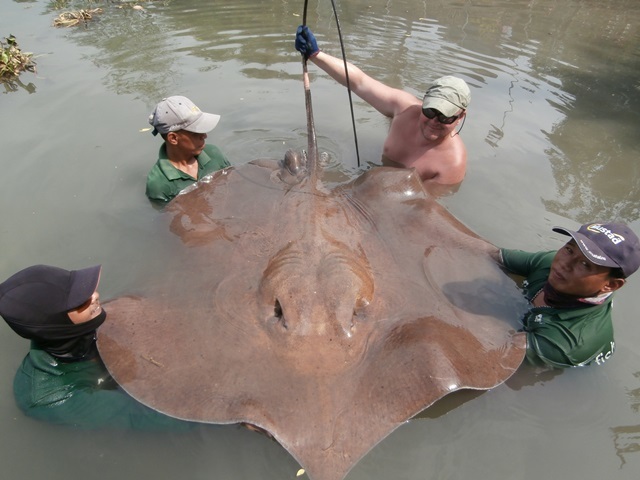 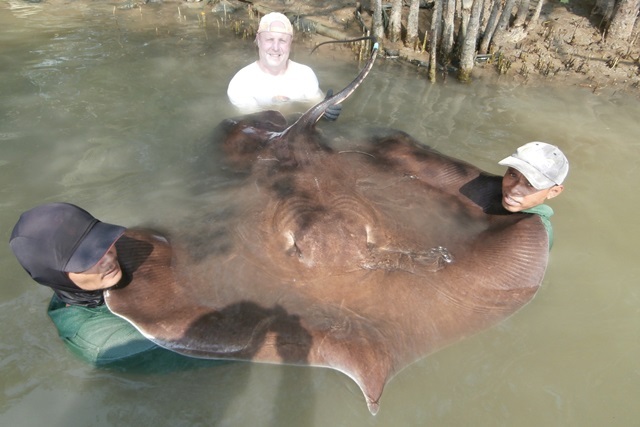 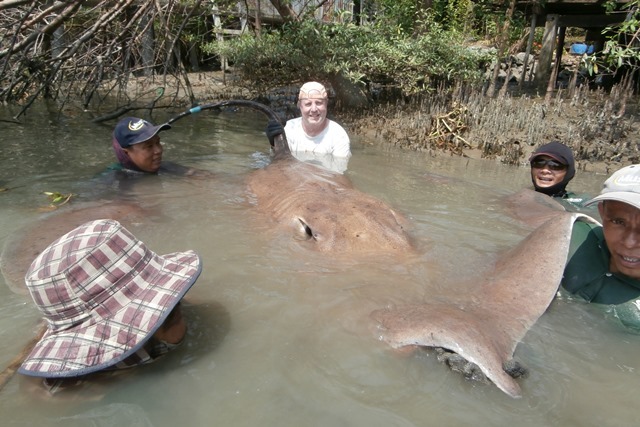 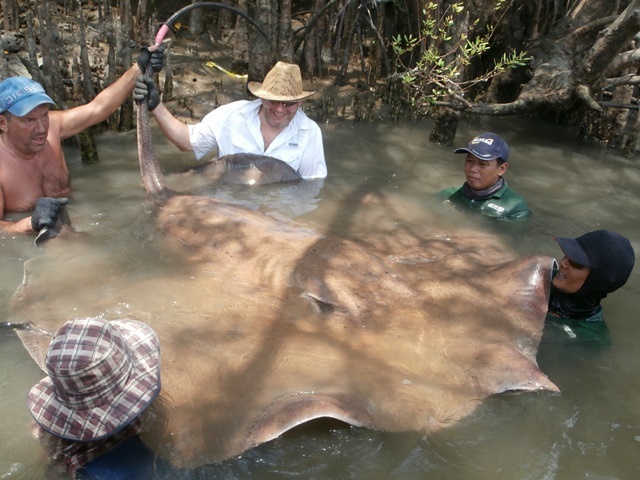 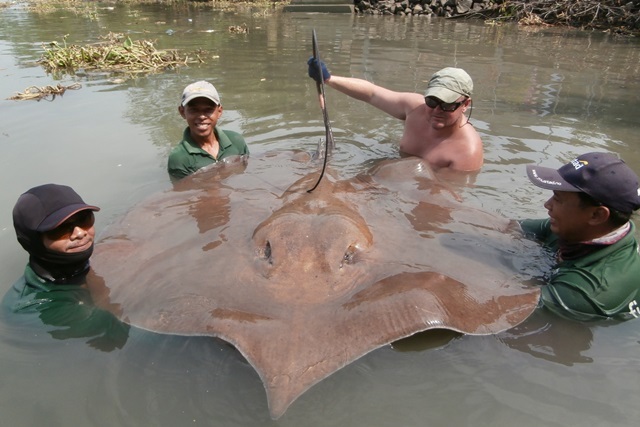 Karrl Jones was another angler who was successful at trying his hand at giant freshwater stingray fishing on the Mae Klong River. 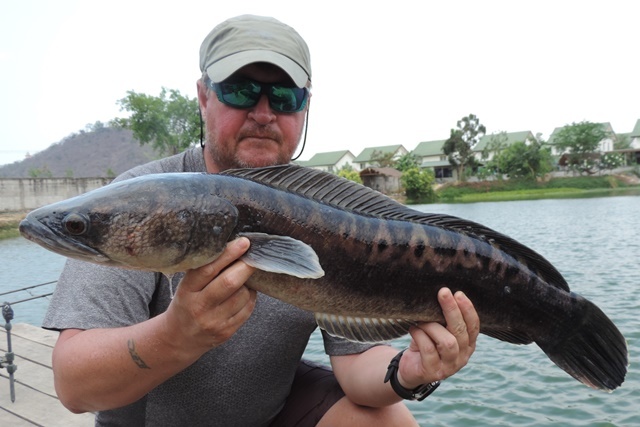 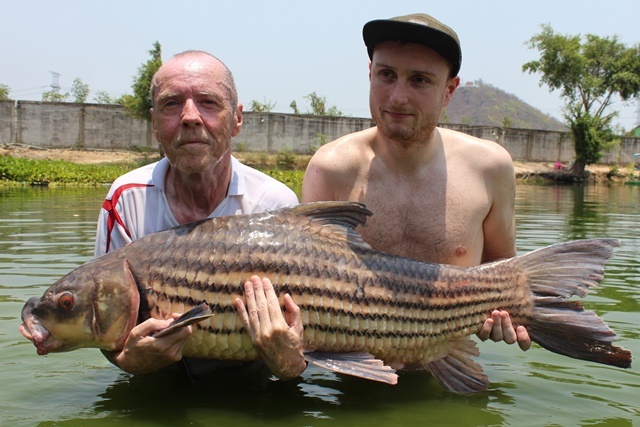 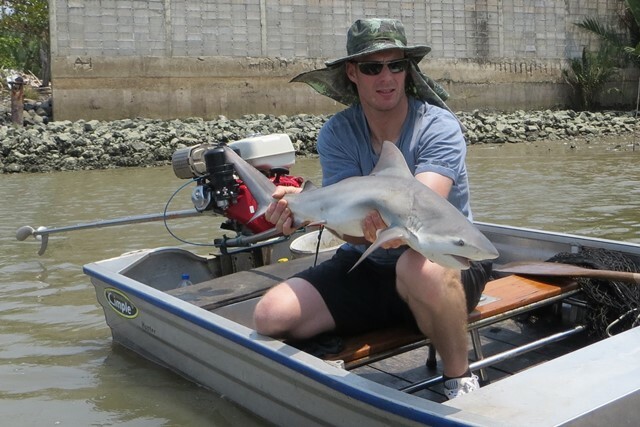 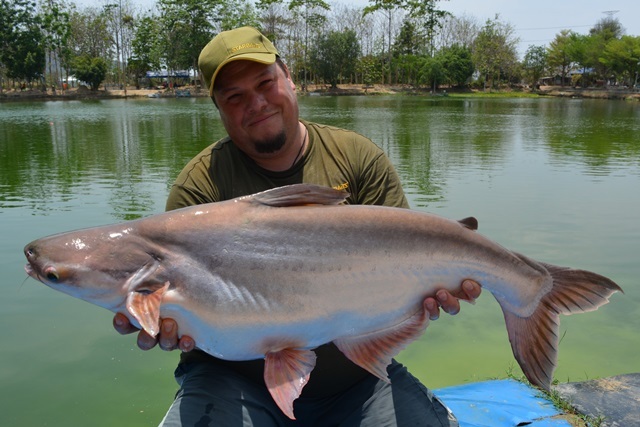 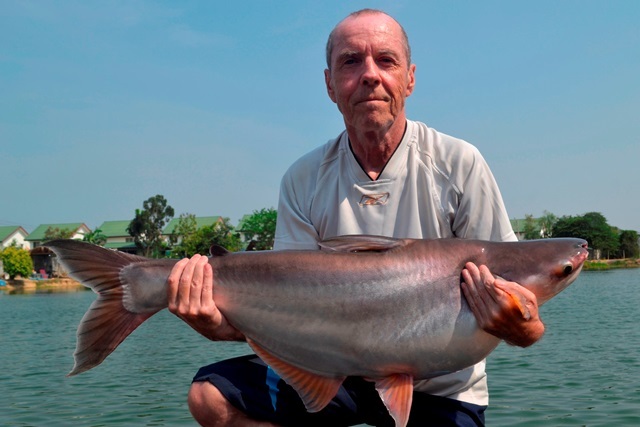 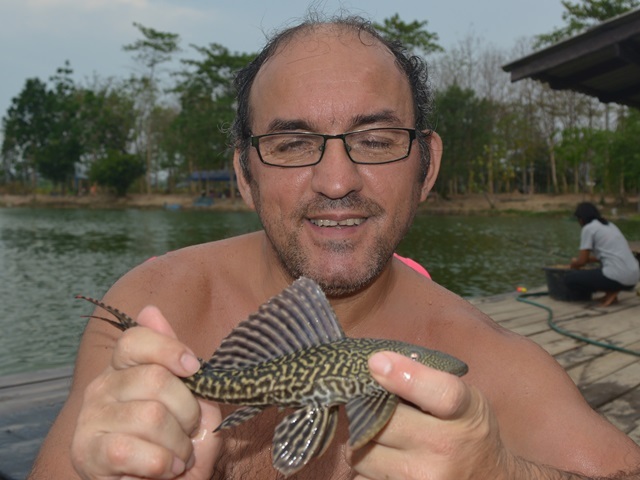 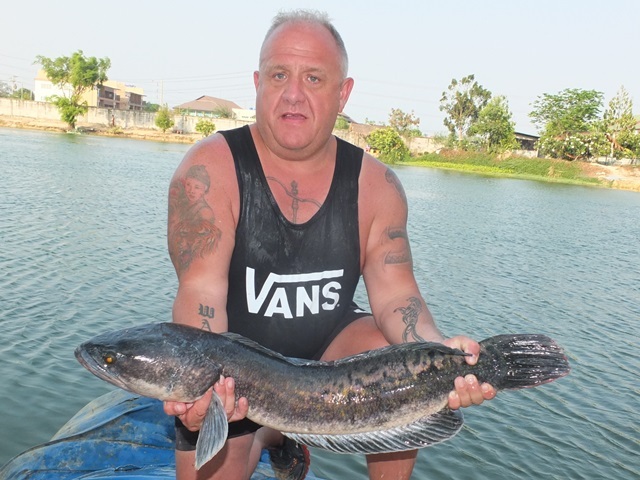 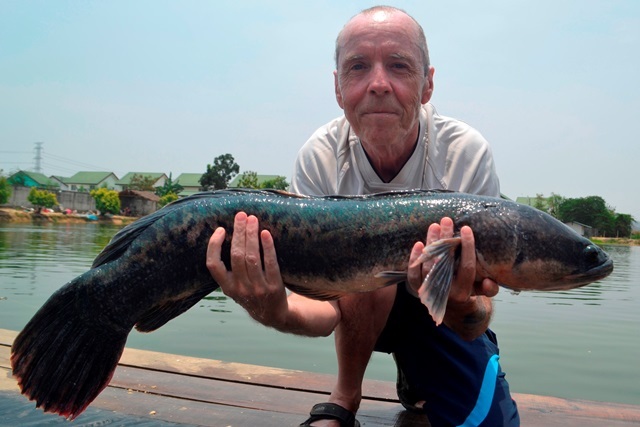 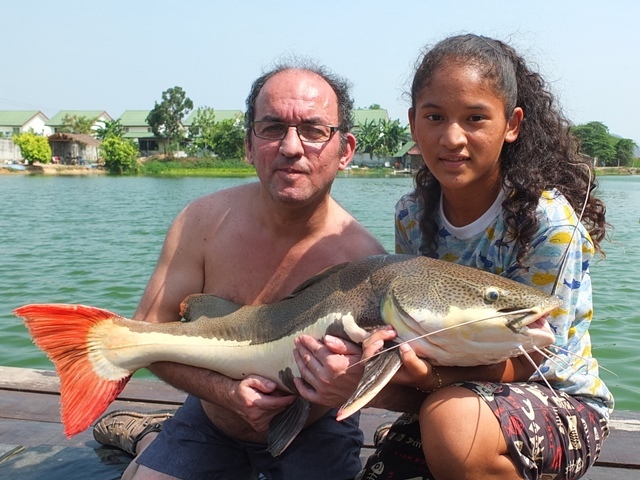 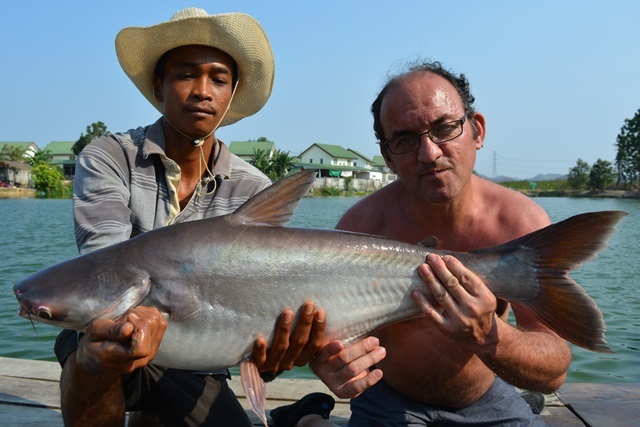 Philip Jewby came down for his first session on the recommendation of John Wilson and seemed more than satisfied with his catches of Mekong catfish, wallago attu, striped catfish and Amazon redtail. 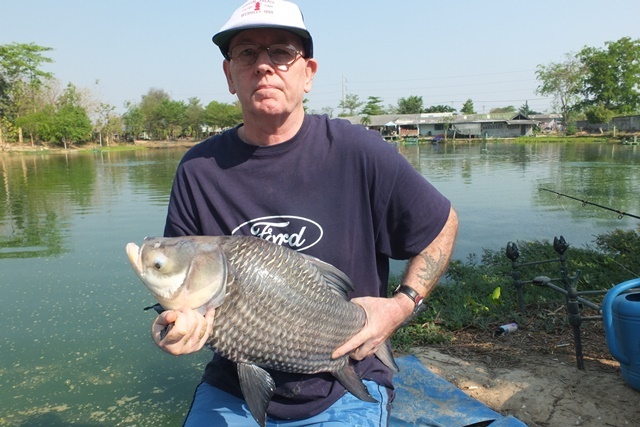 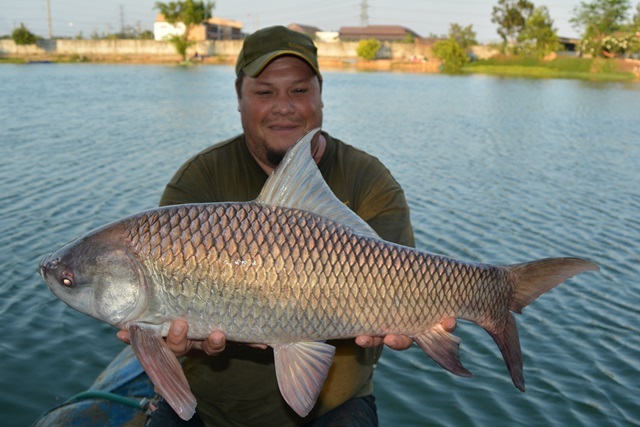 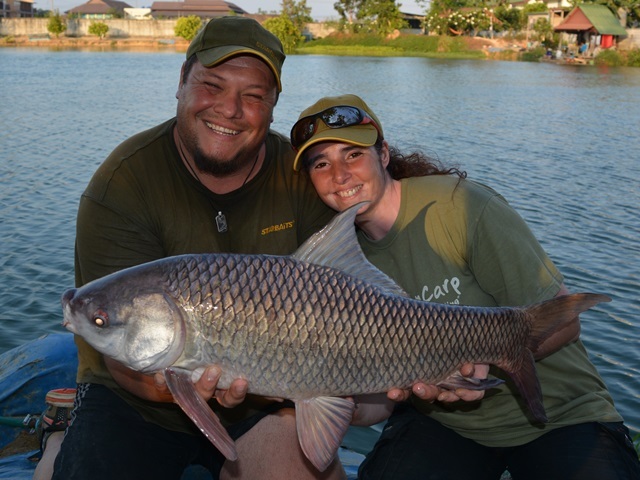 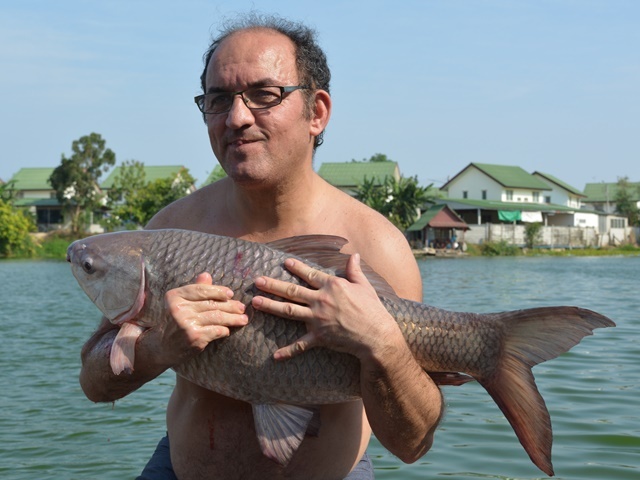 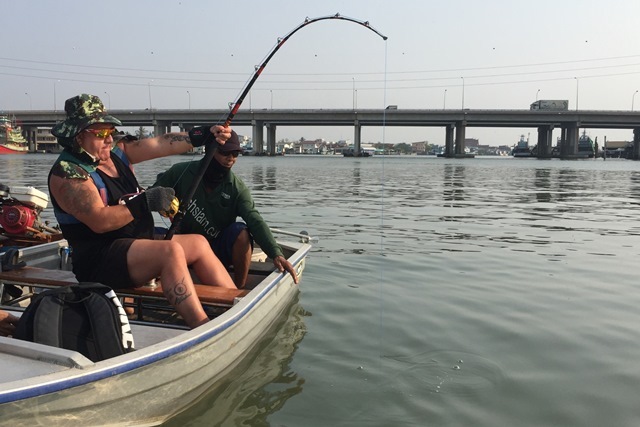 Tap's first session of the month resulted in his delighted customers catching a number of nice fish that included arapaima, chao phraya, Mekong catfish, Siamese carp and Amazon redtail. 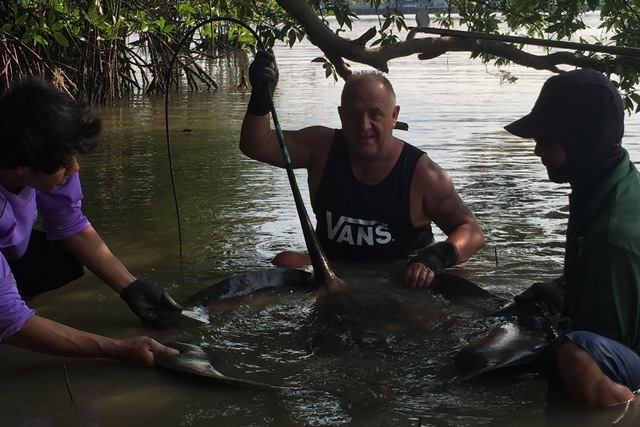 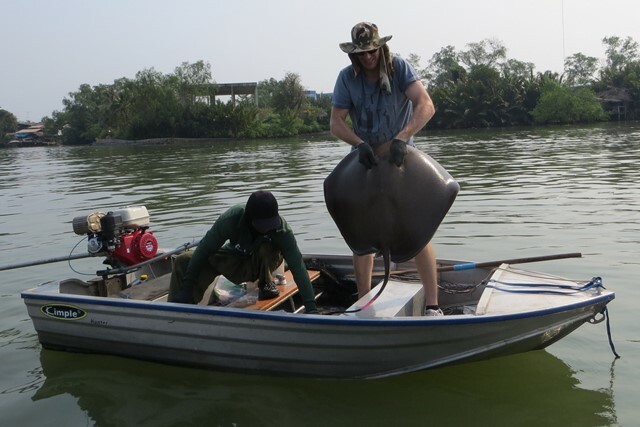 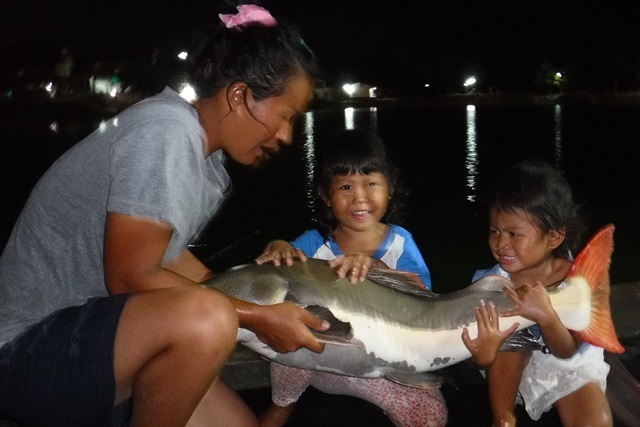 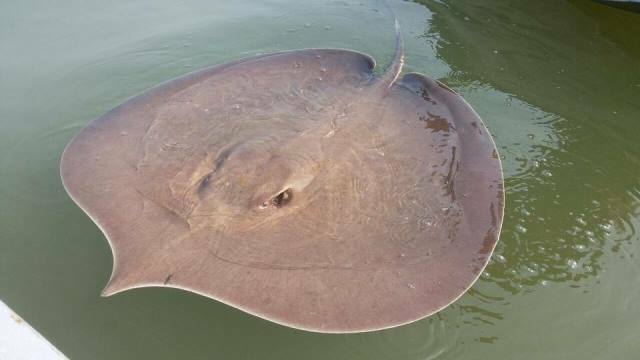 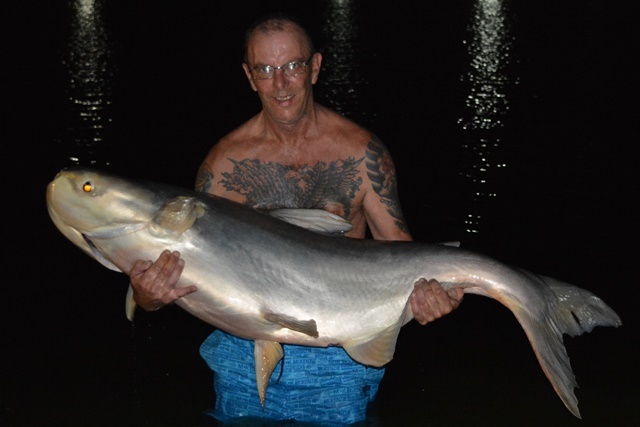 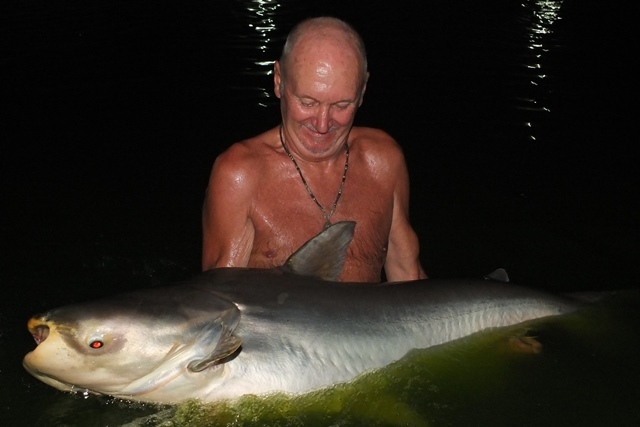 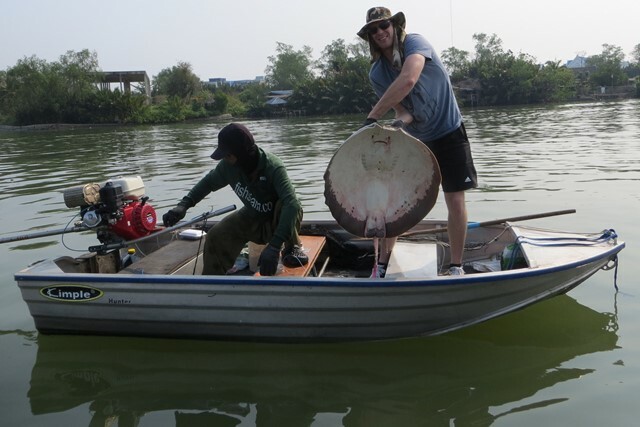 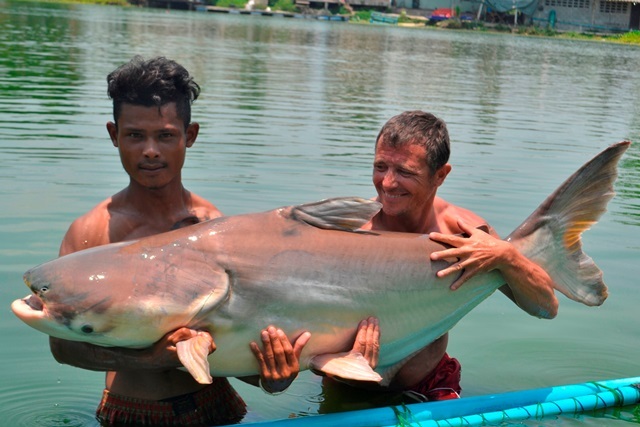 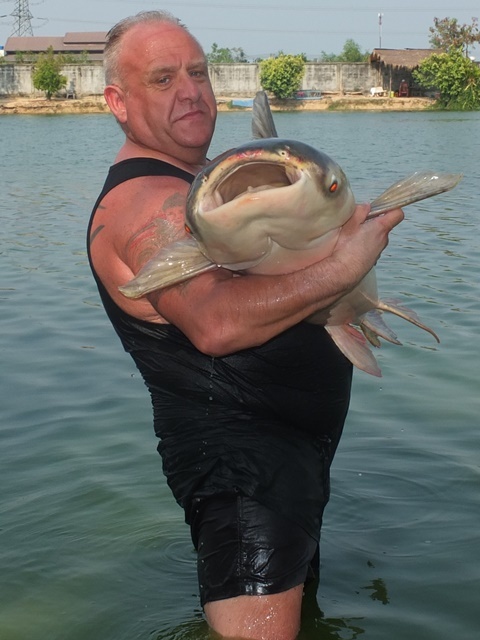 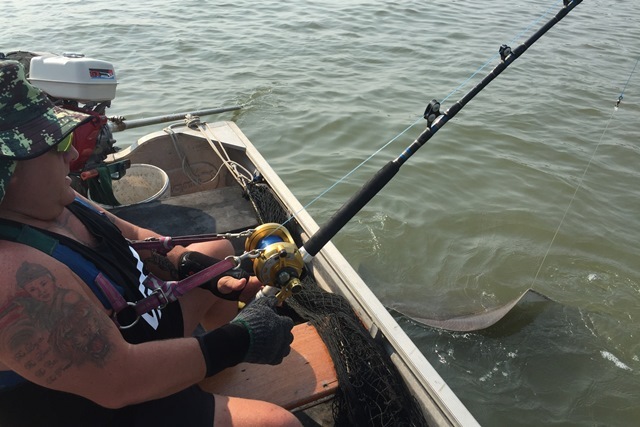 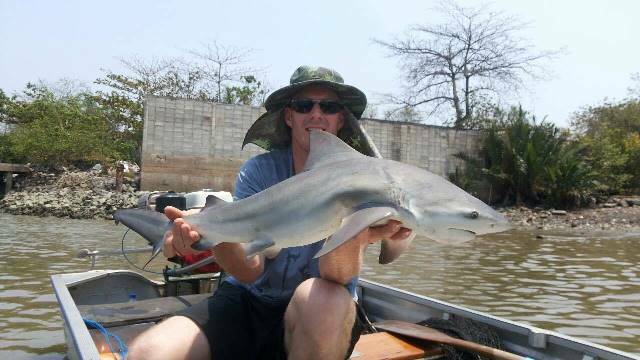 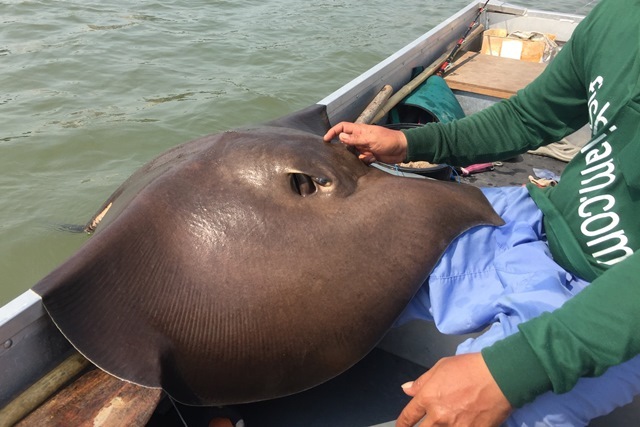 Wayne Murray turned his hand at giant freshwater stingray fishing on the Mae Klong River, no monsters this time but he did land several small ones and a bull shark. 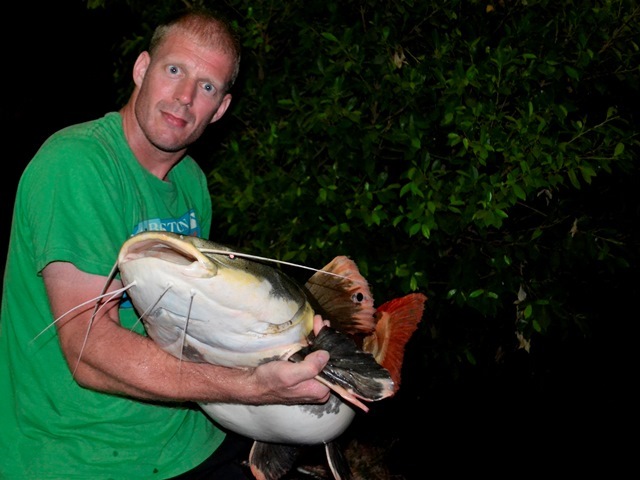 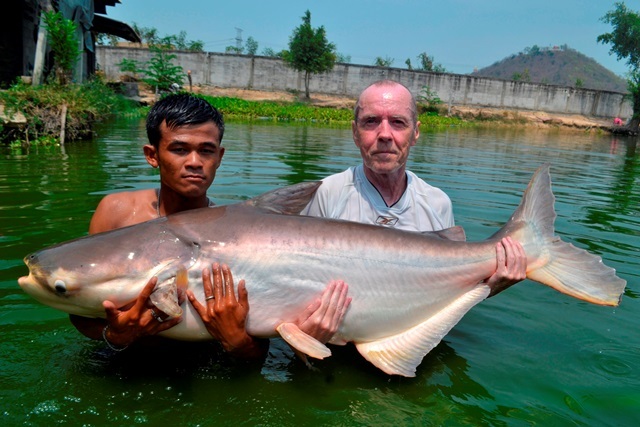 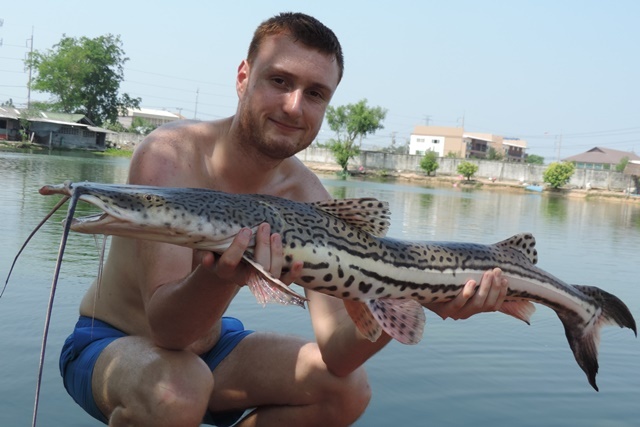 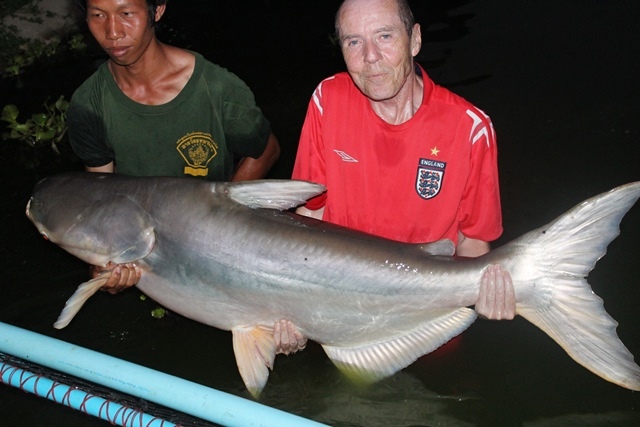 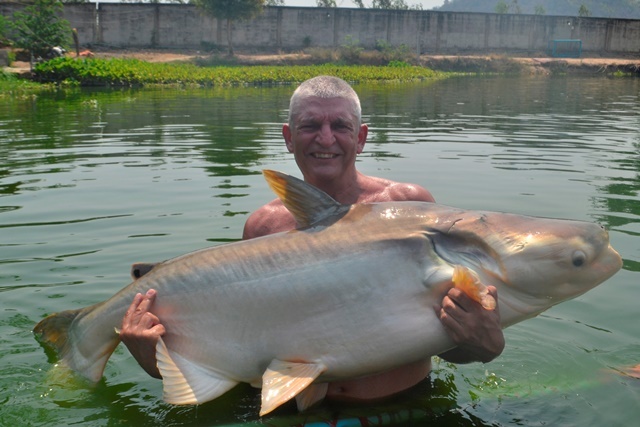 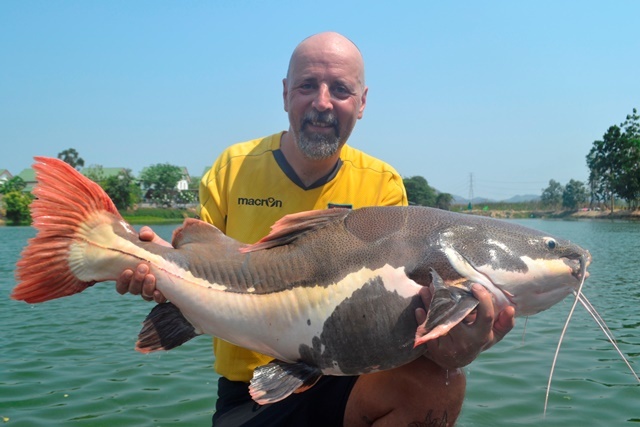 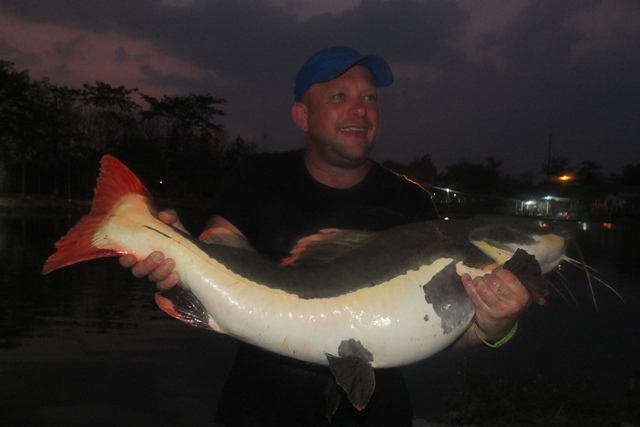 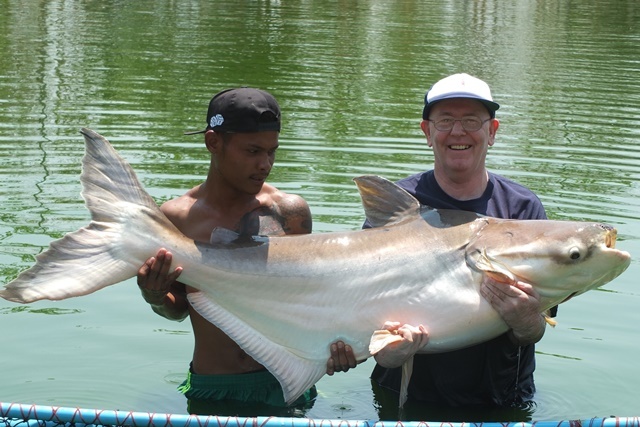 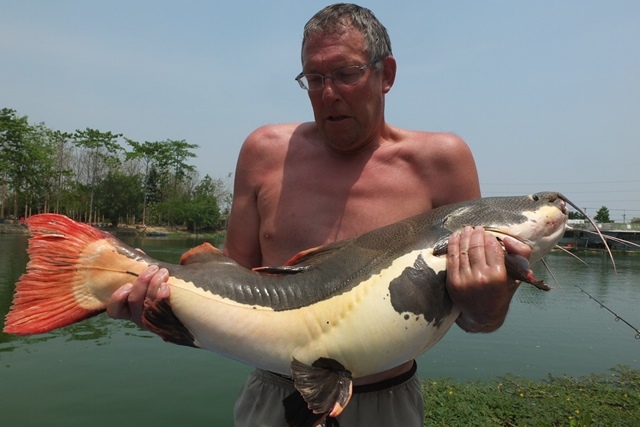 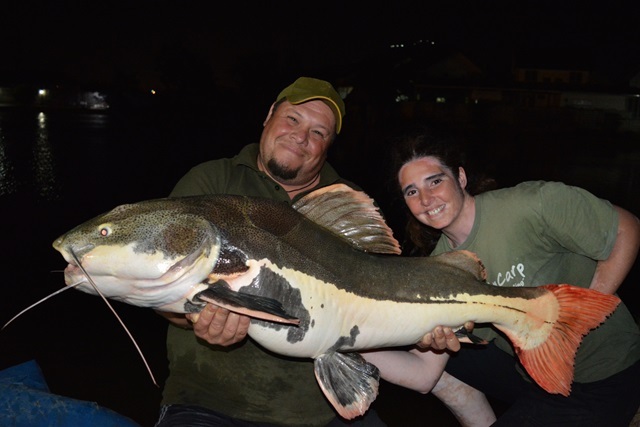 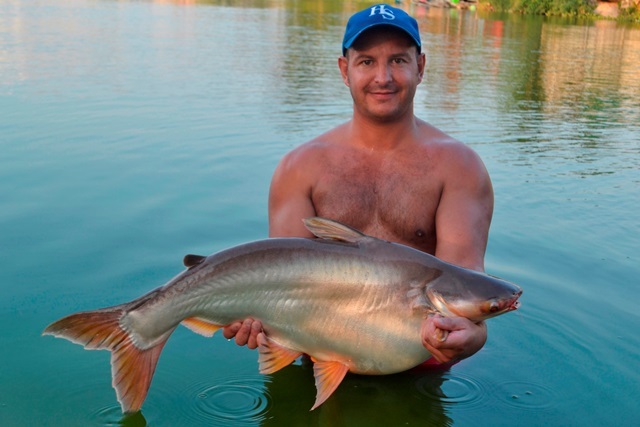 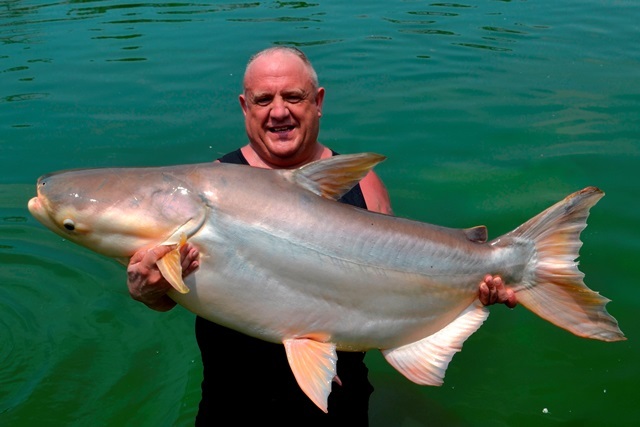 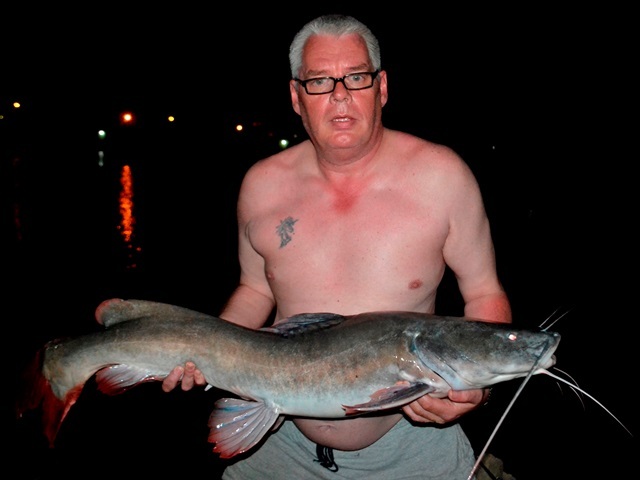 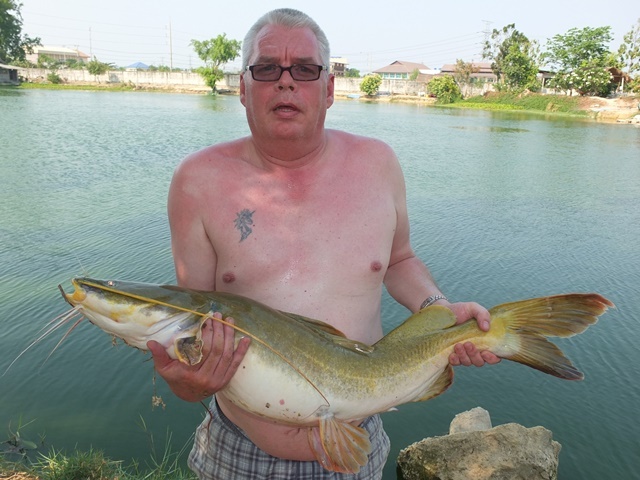 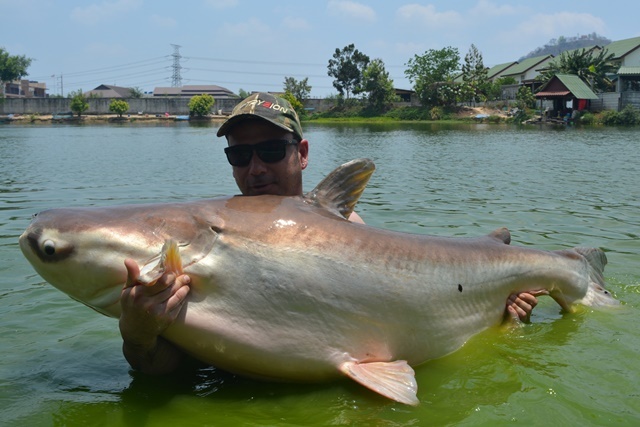 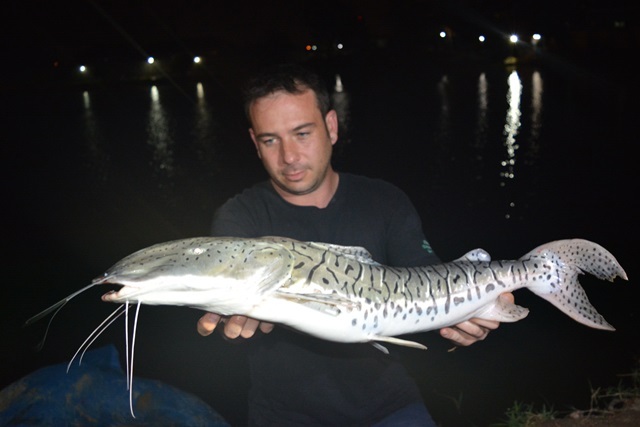 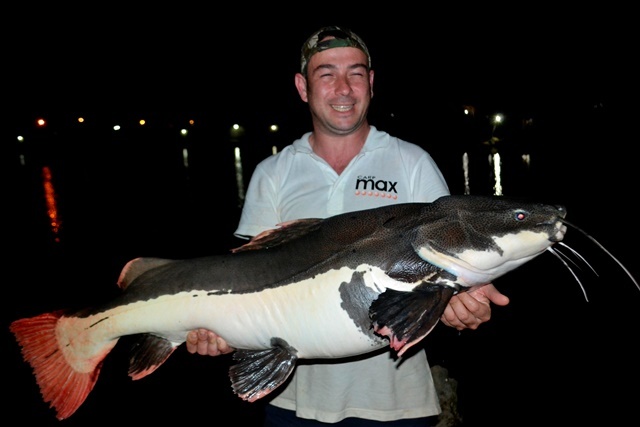 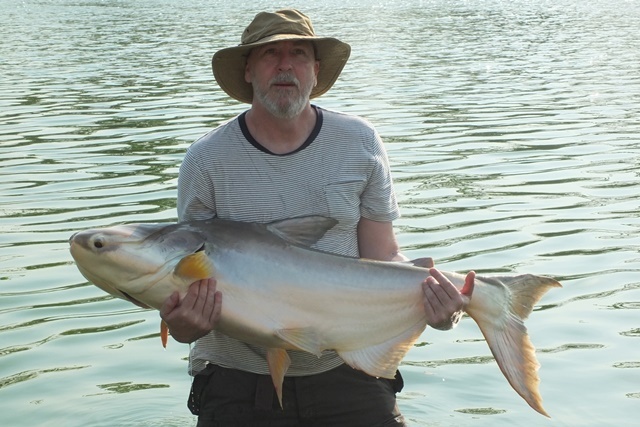 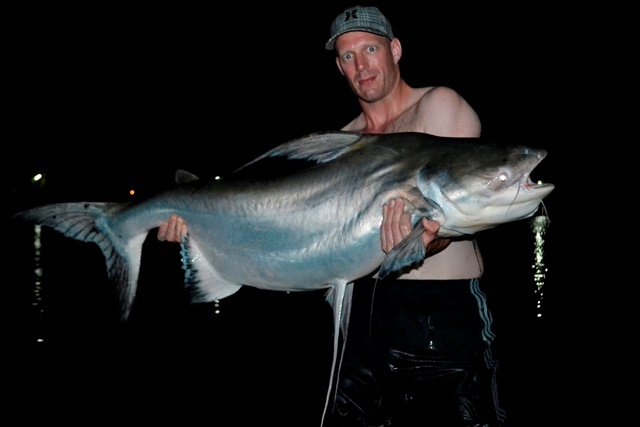 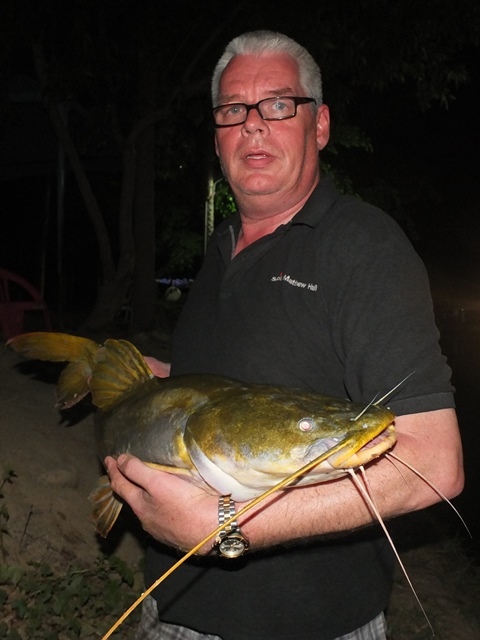 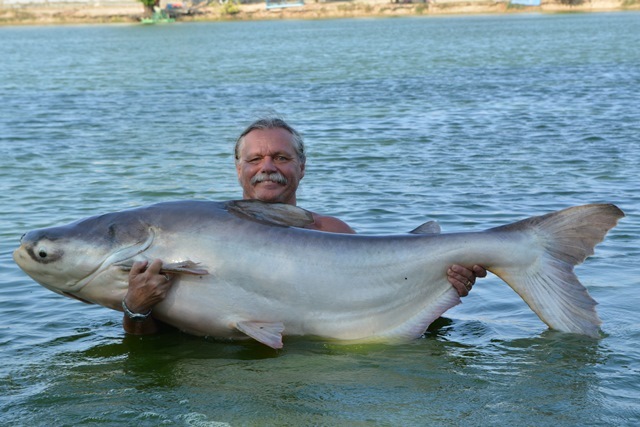 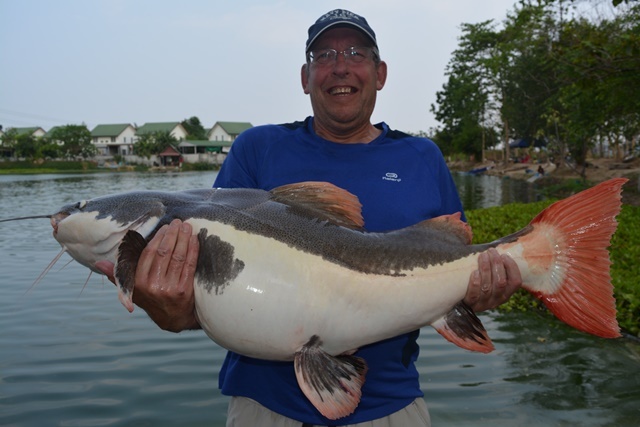 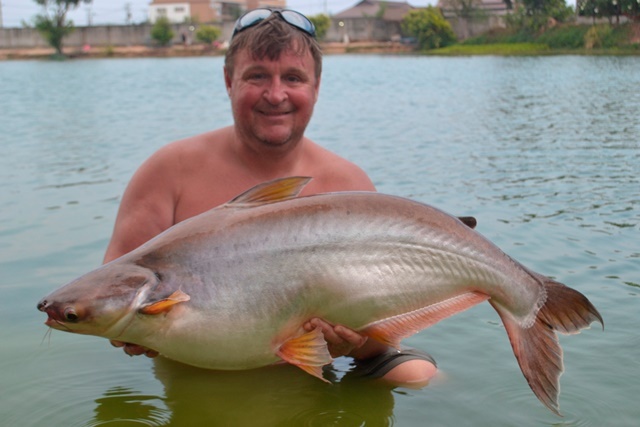 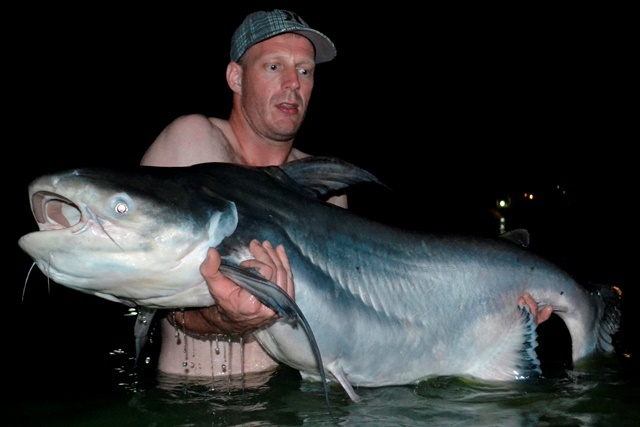 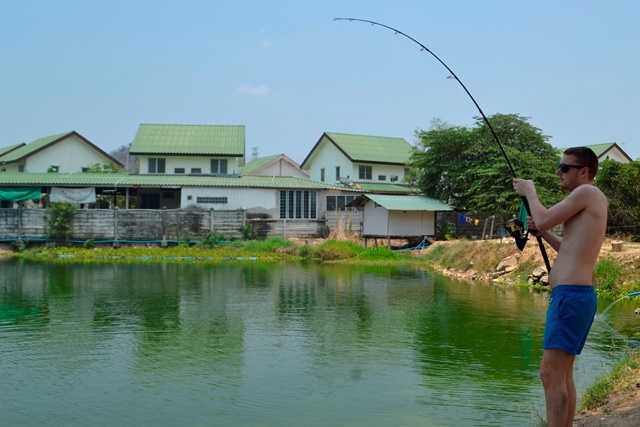 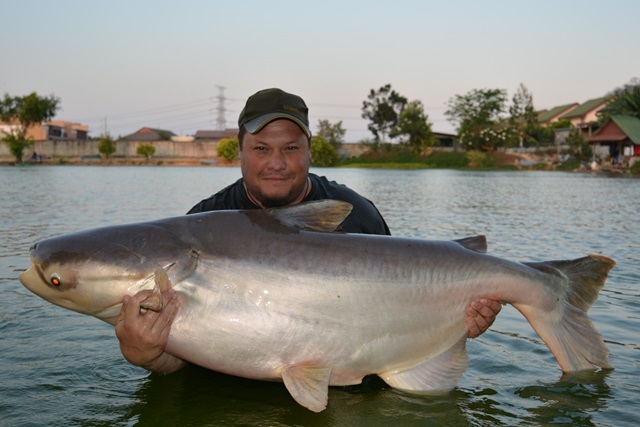 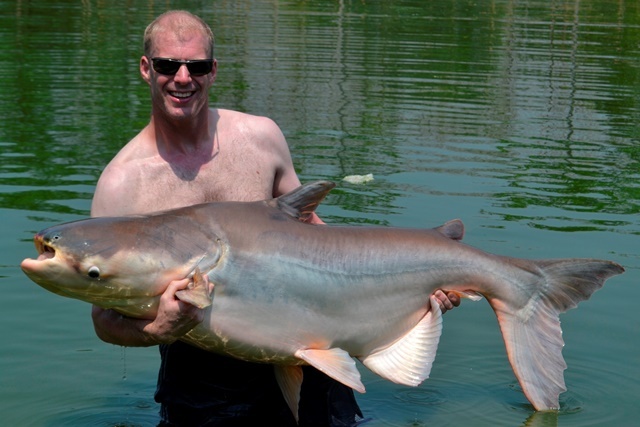 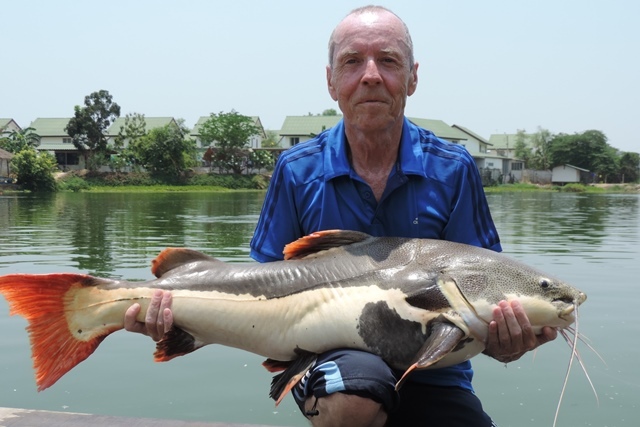 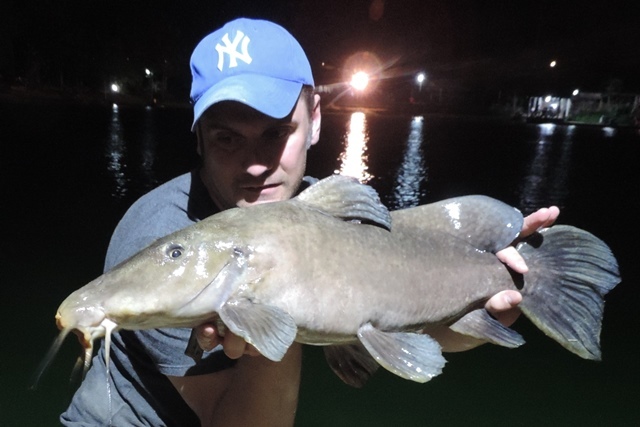 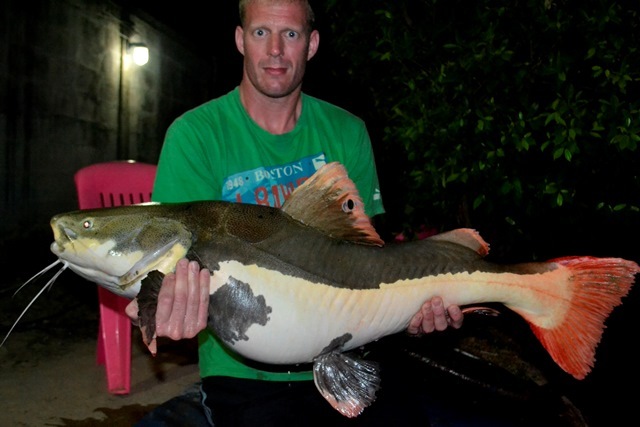 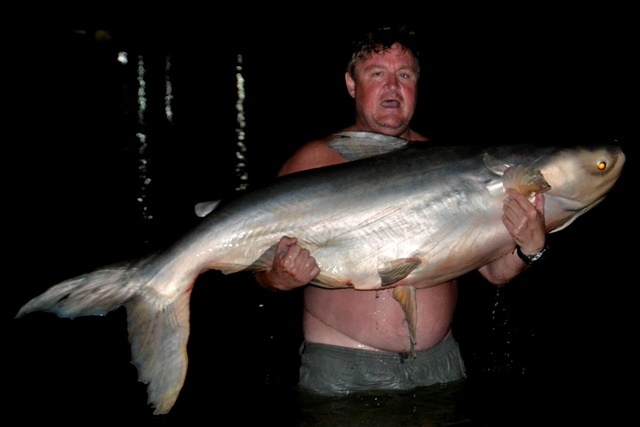 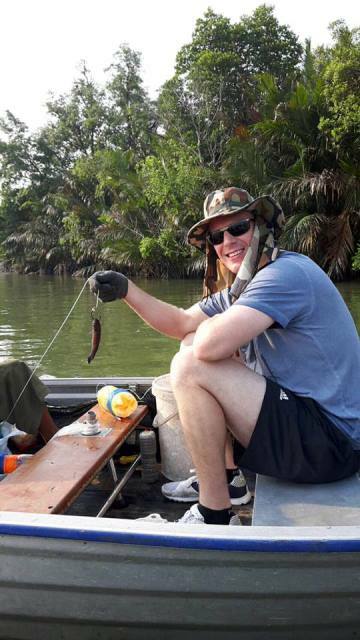 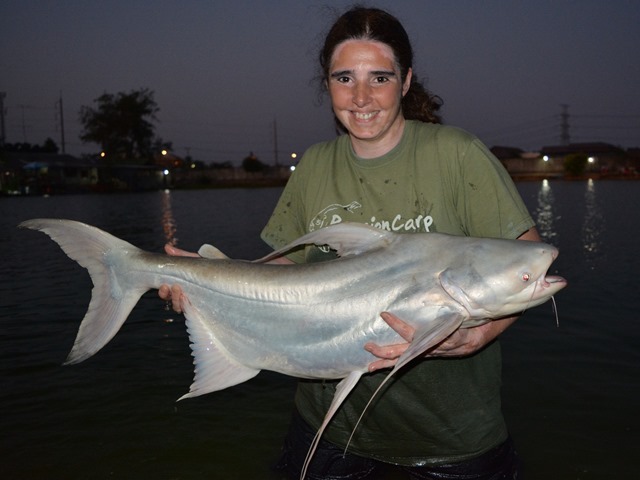 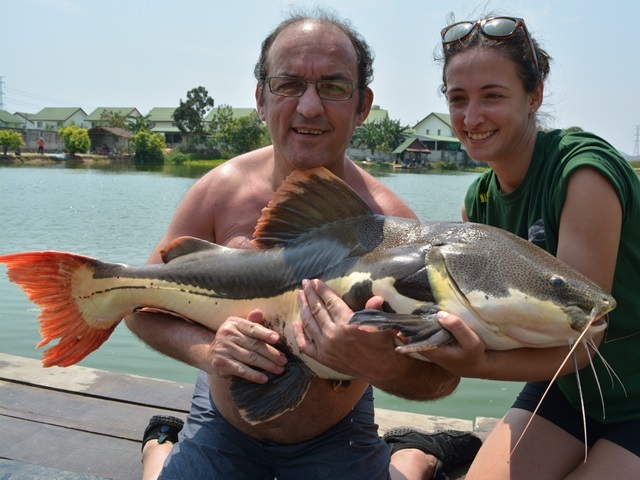 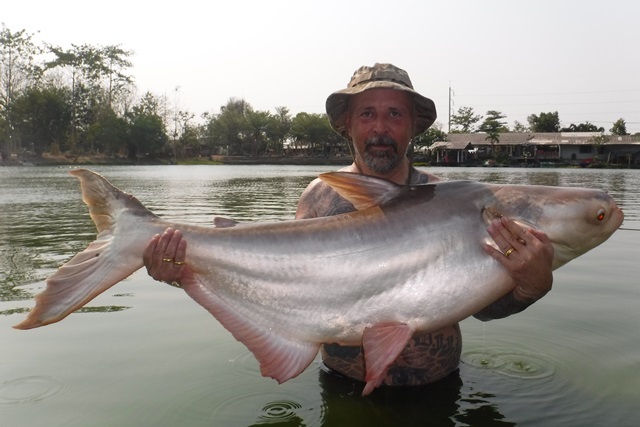 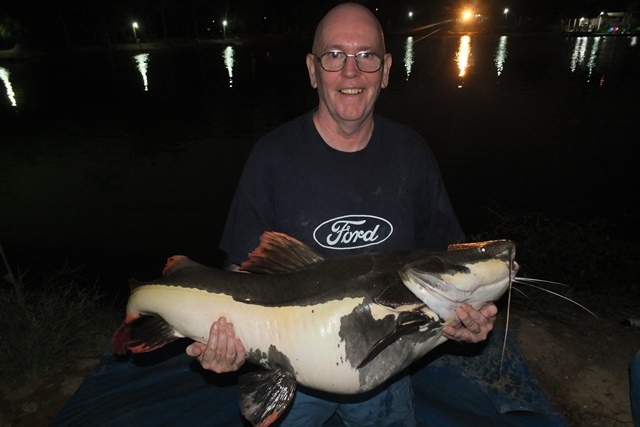 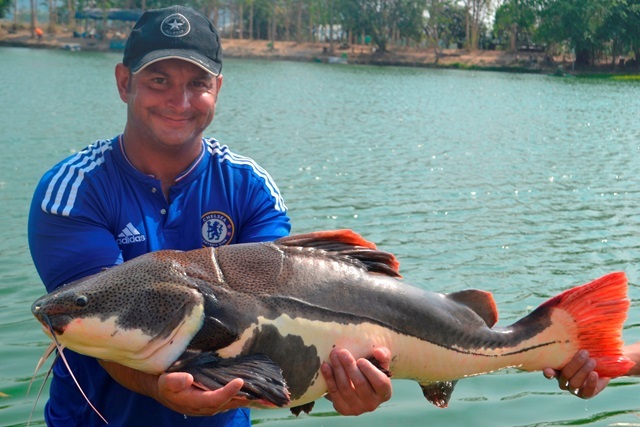 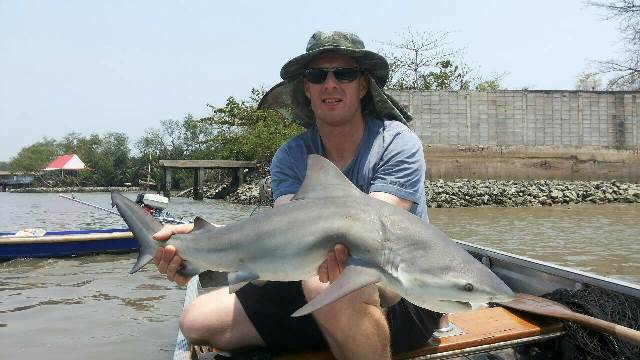 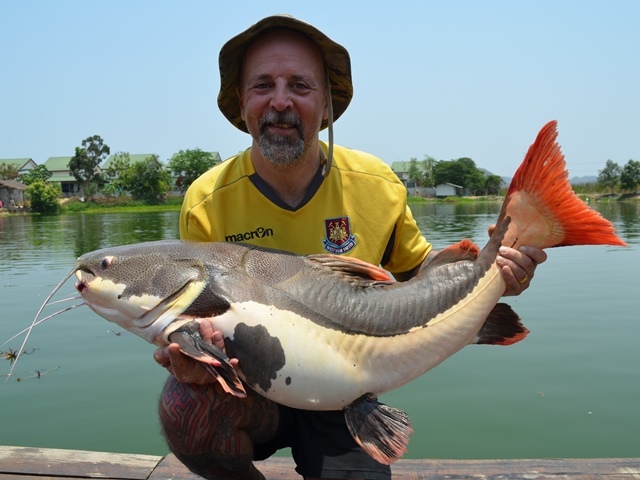 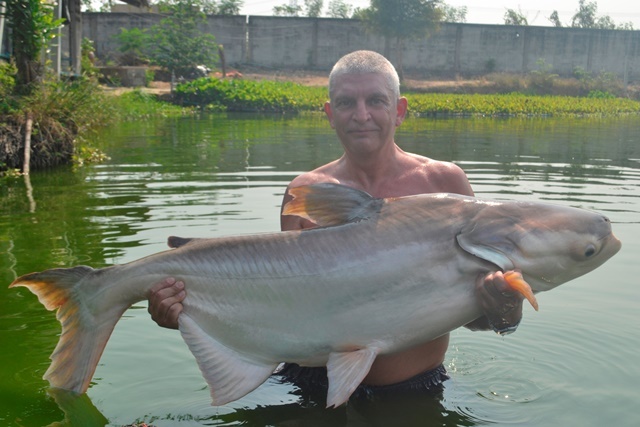 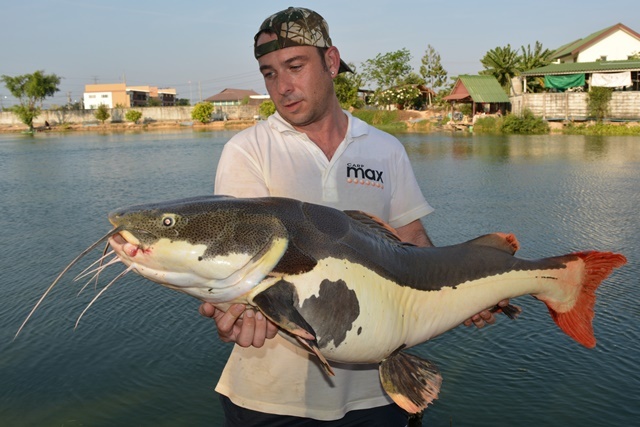 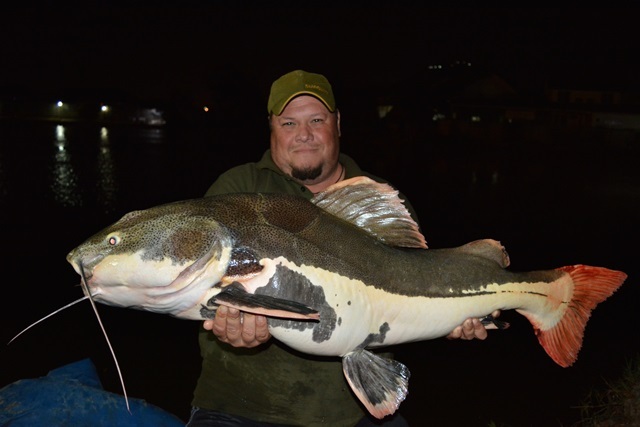 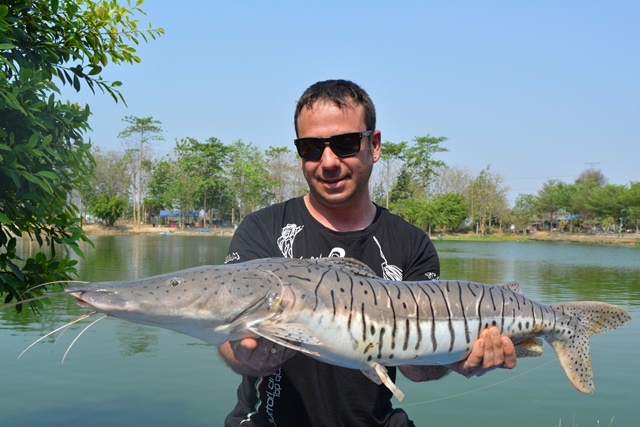 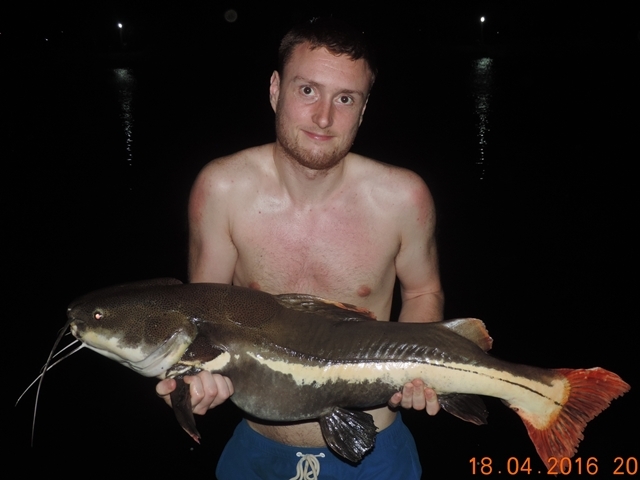 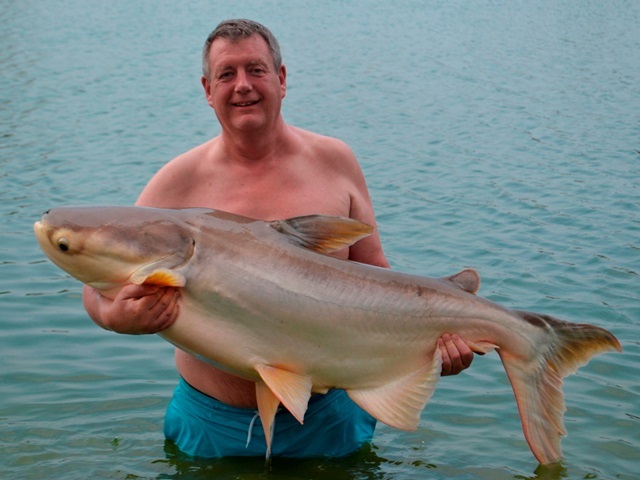 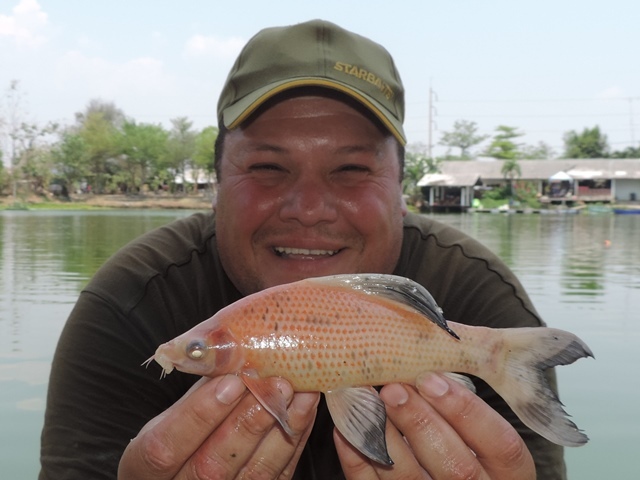 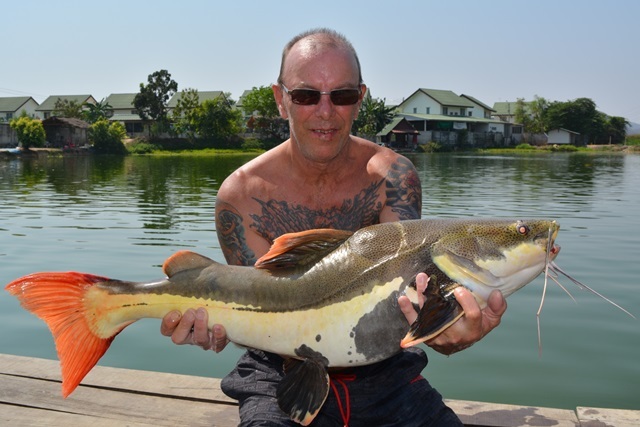 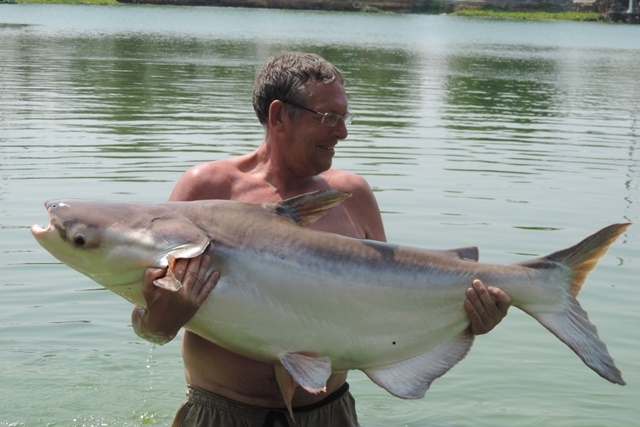 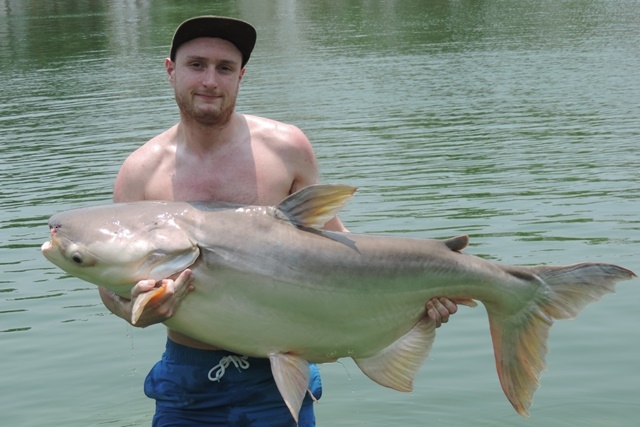 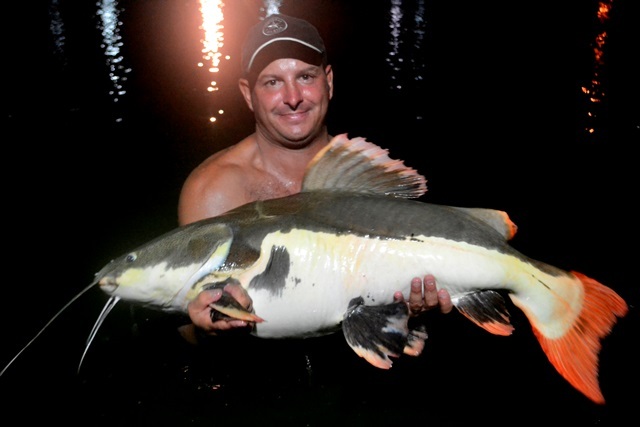 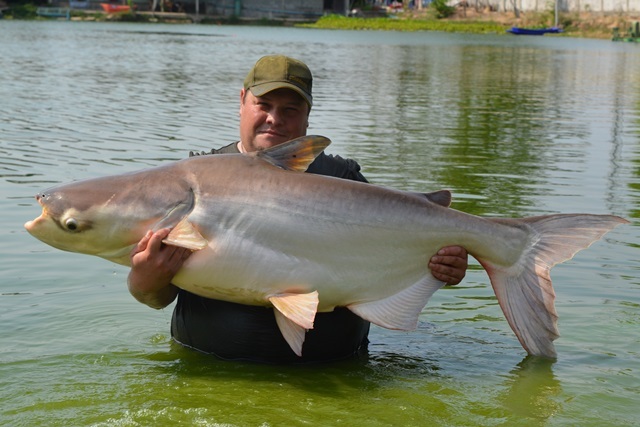 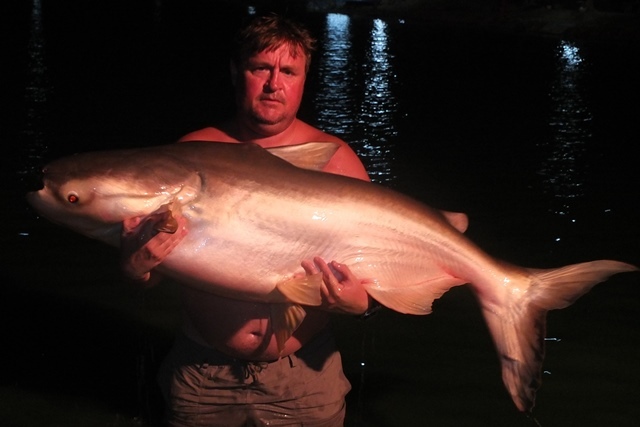 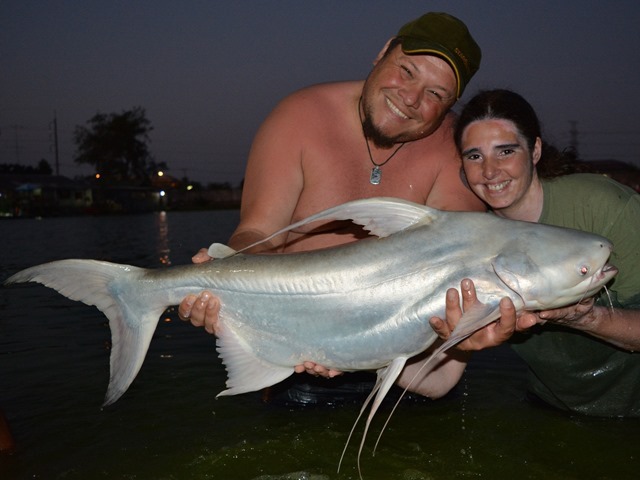 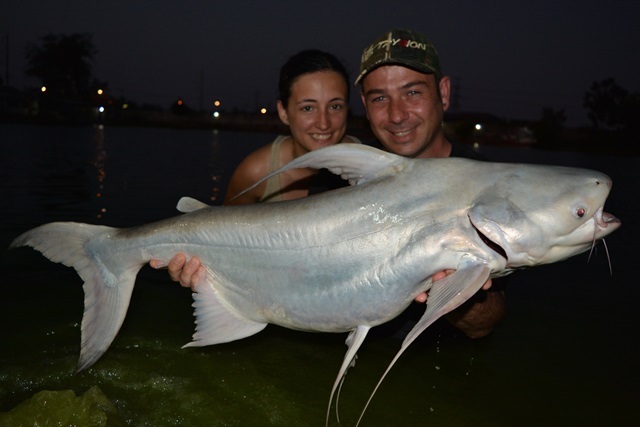 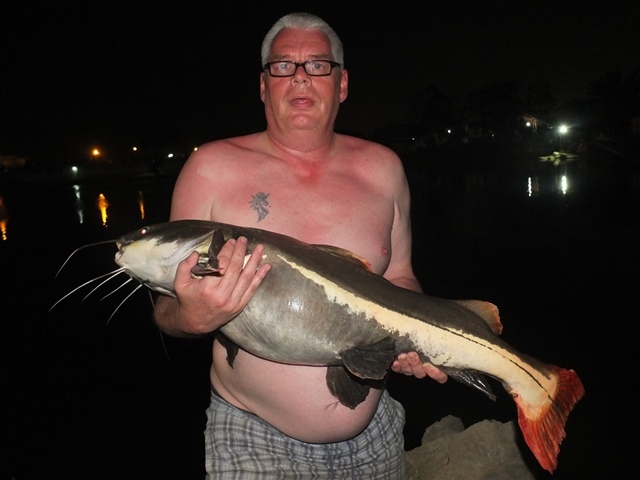 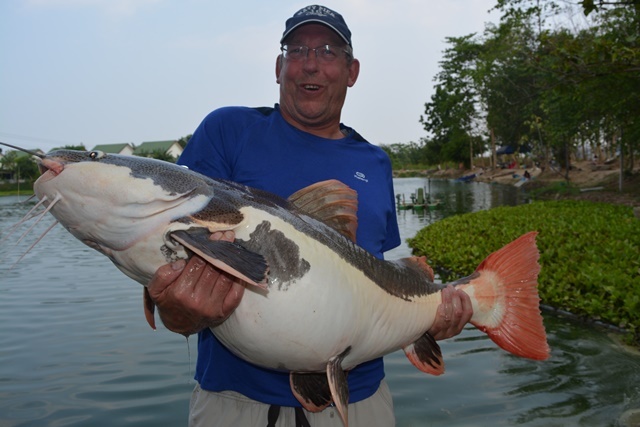 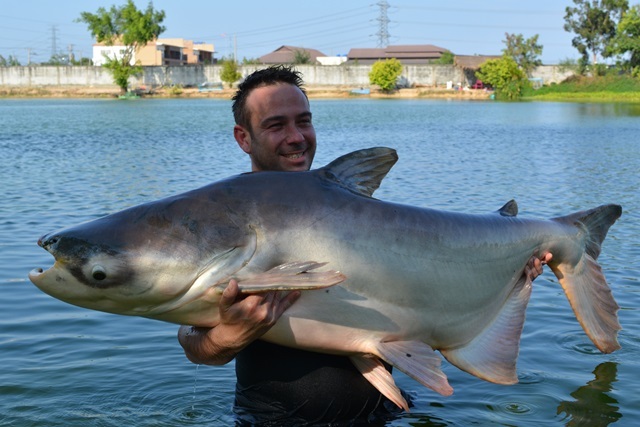 Regular Rick Moore who resides in Bangkok caught a nicely coloured tambaqui as well as a rarely caught giraffe catfish. 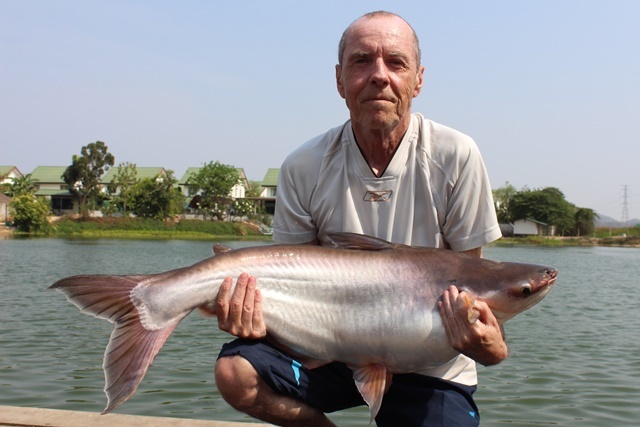 Tap of Bangkok Fishing Guide Service customers from his second visit of the month were satisfied with their catches of Amazon redtail, giant featherback, Mekong catfish and rohu. 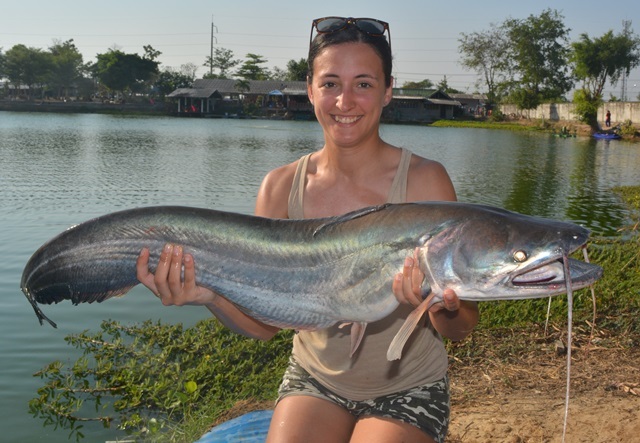 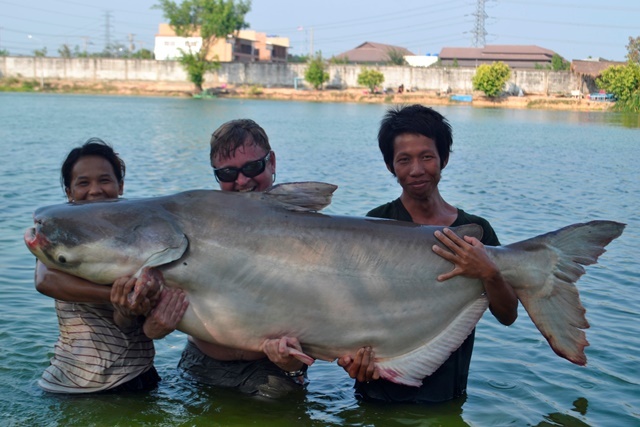 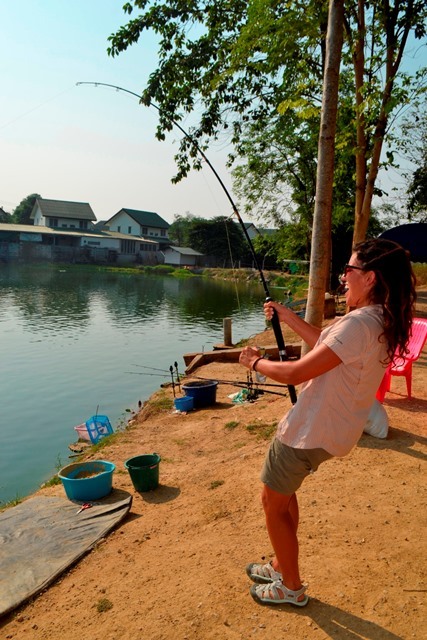 A group of returning mates from Bangkok seemed thrilled with their catches of Mekong catfish and alligator gar. 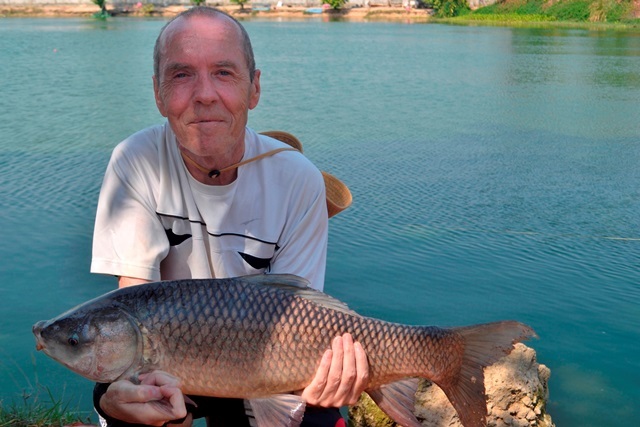 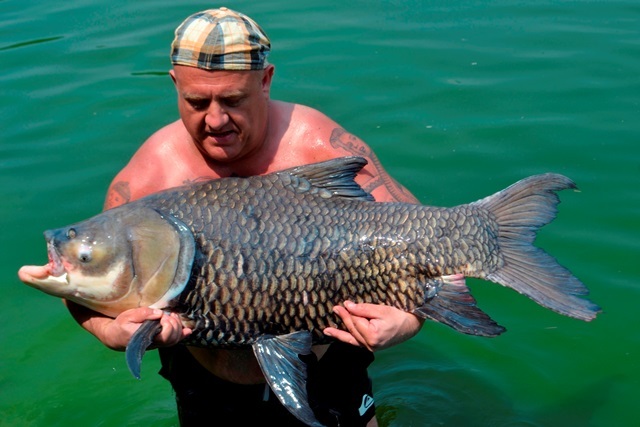 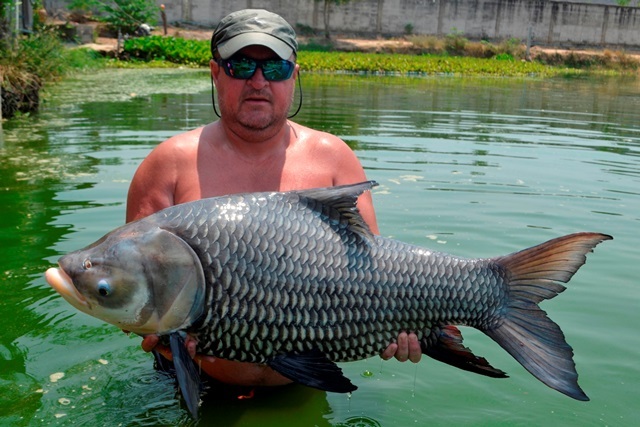 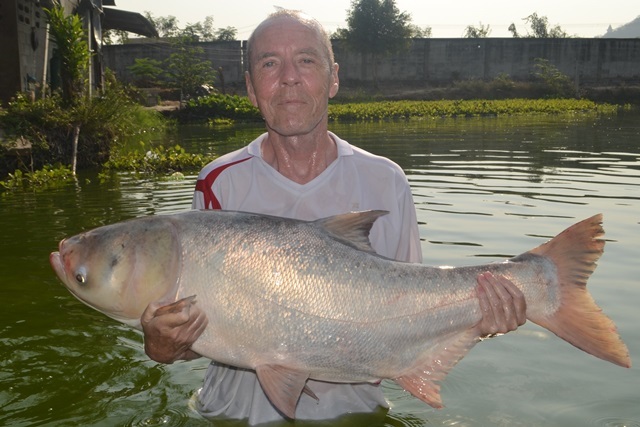 Keith Hand had a nice Siamese carp and vowed to be back later in the year. 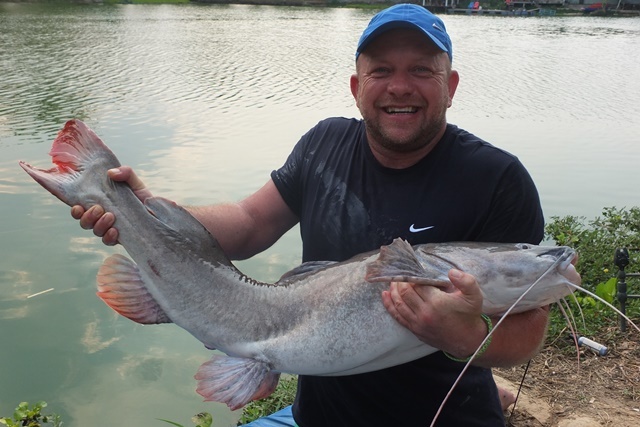 First time visitor Somchad Moore was happy with his Mekong catfish and mollycot. 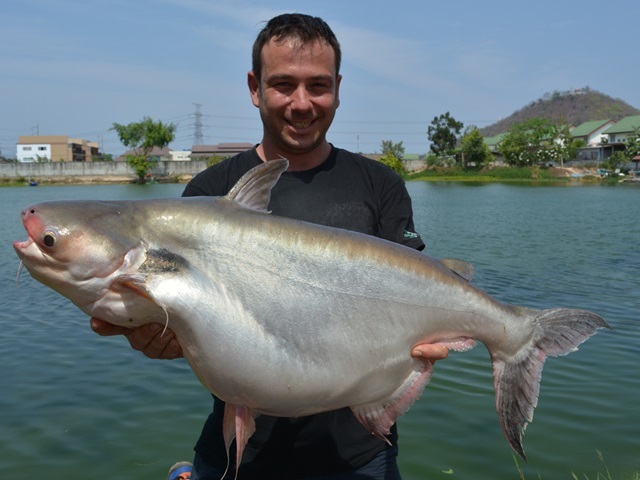 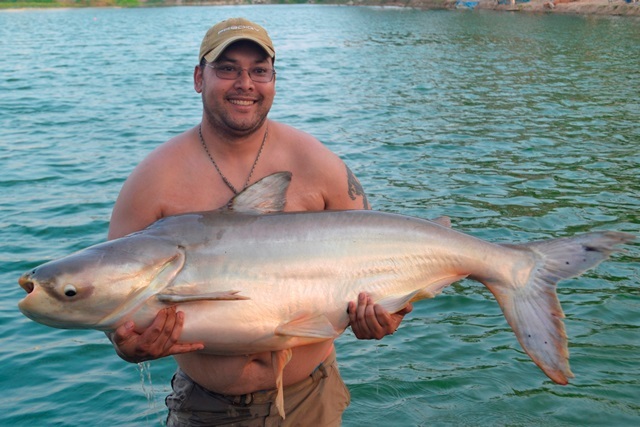 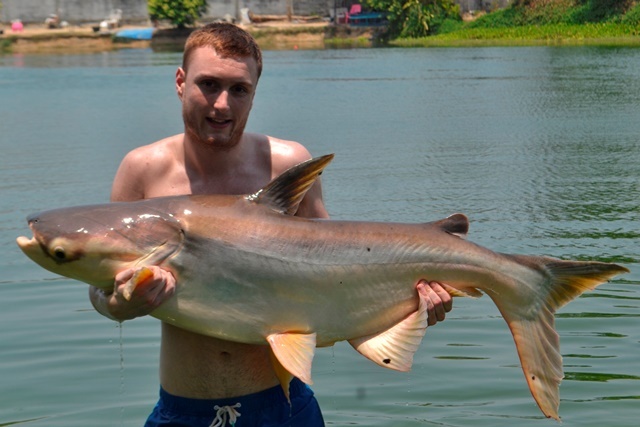 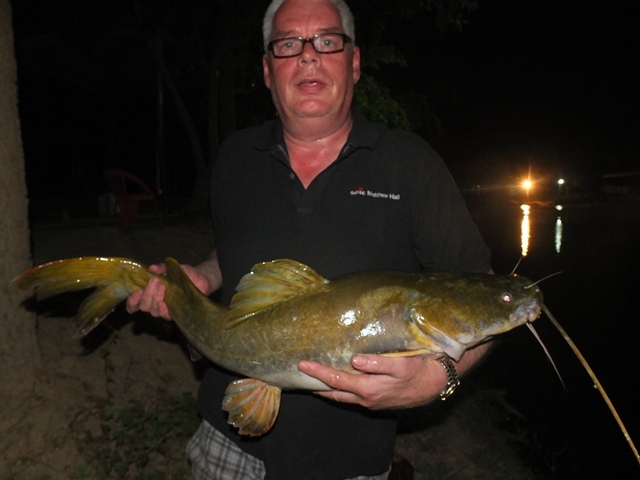 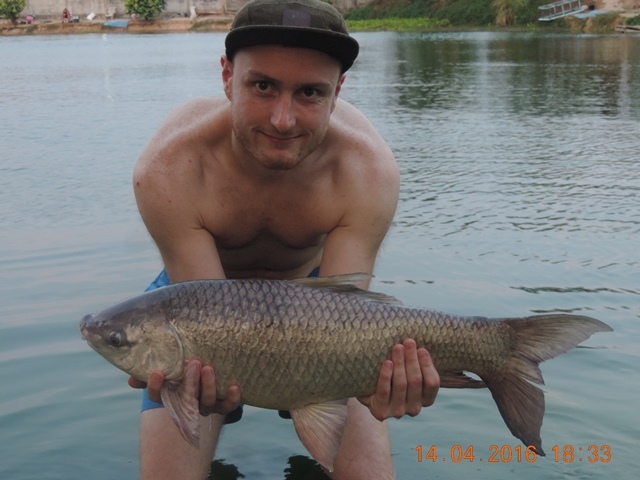 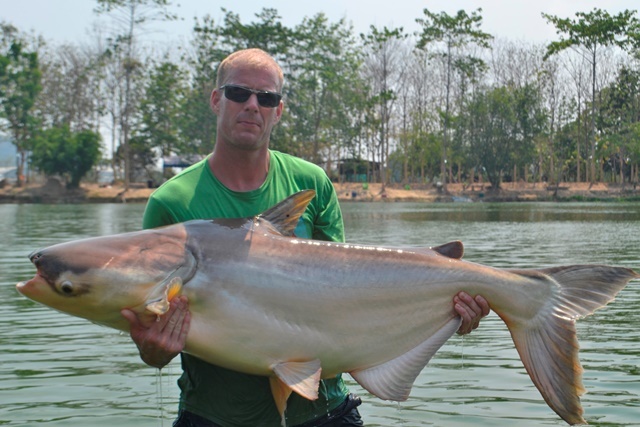 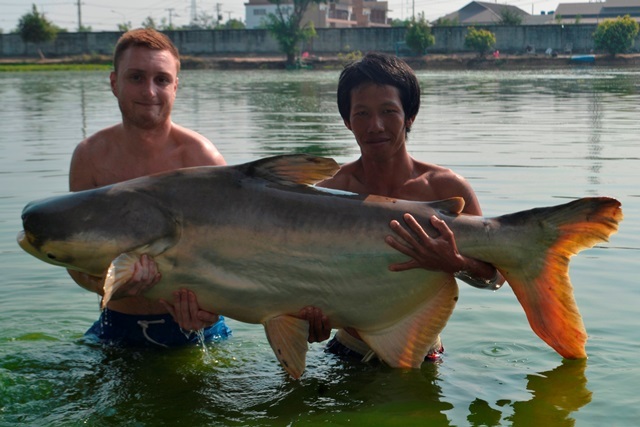 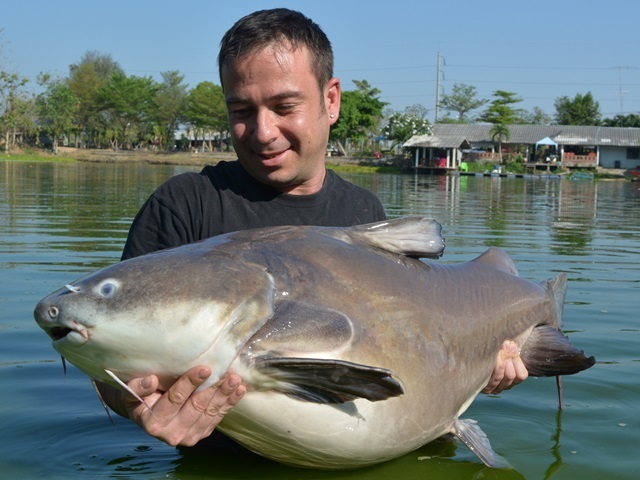 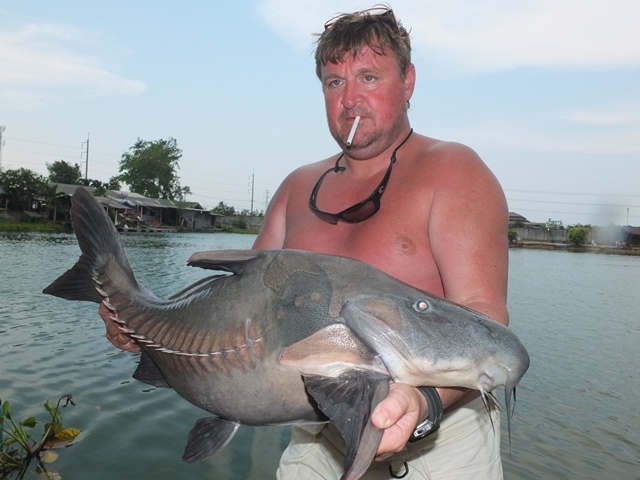 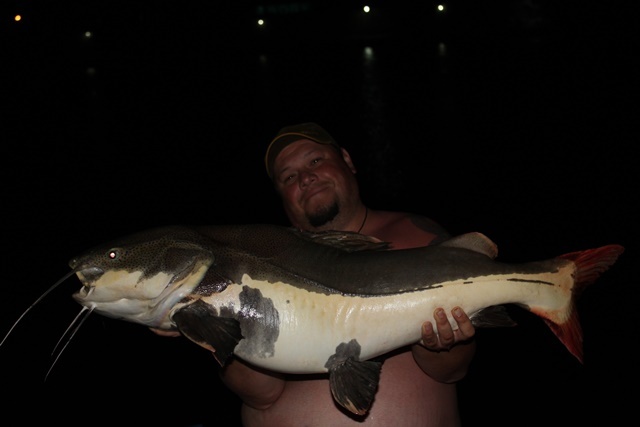 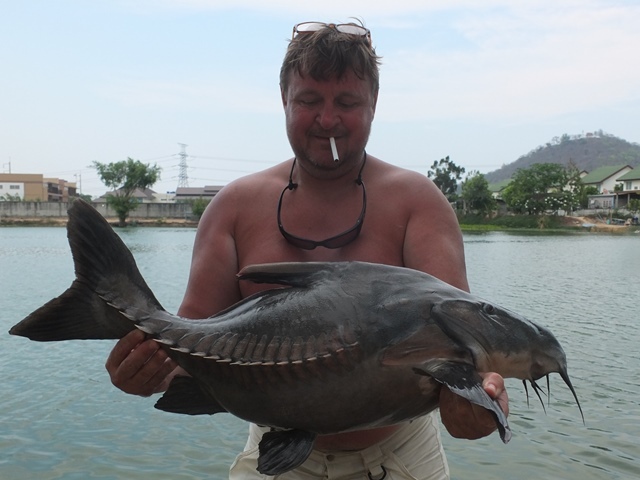 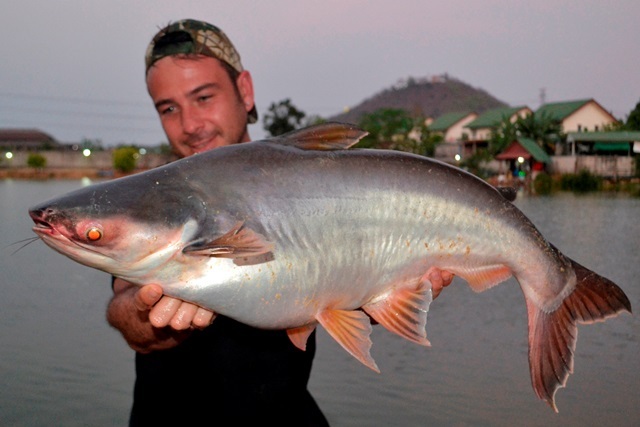 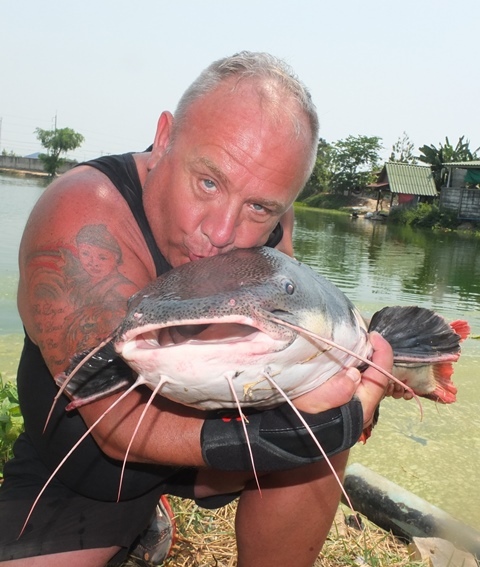 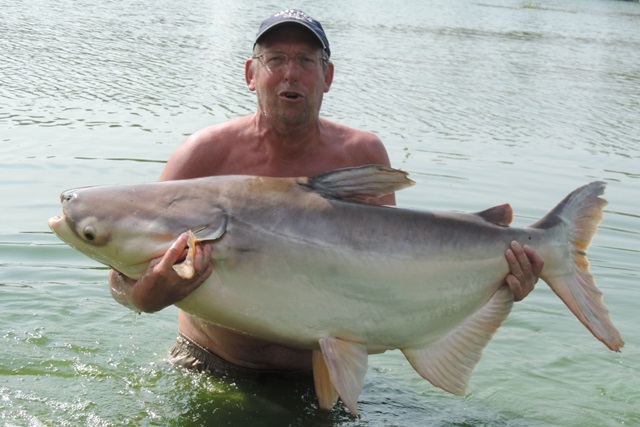 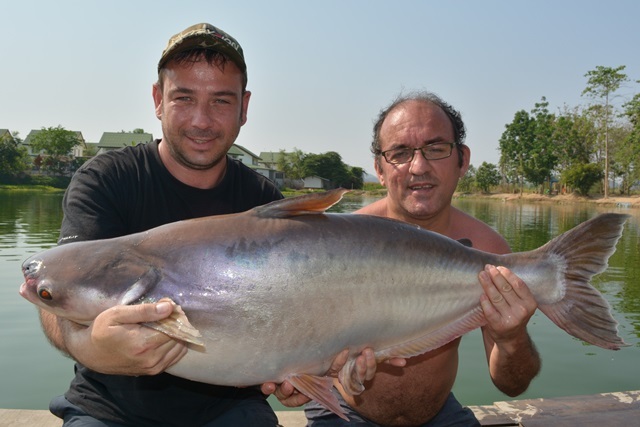 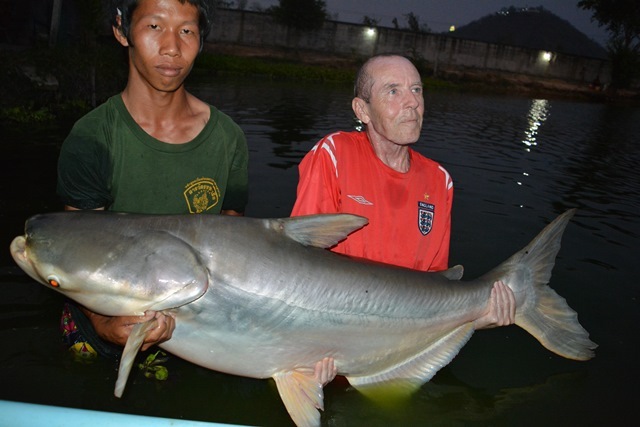 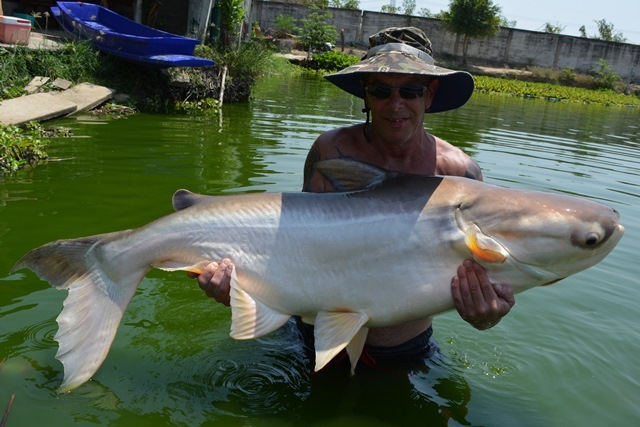 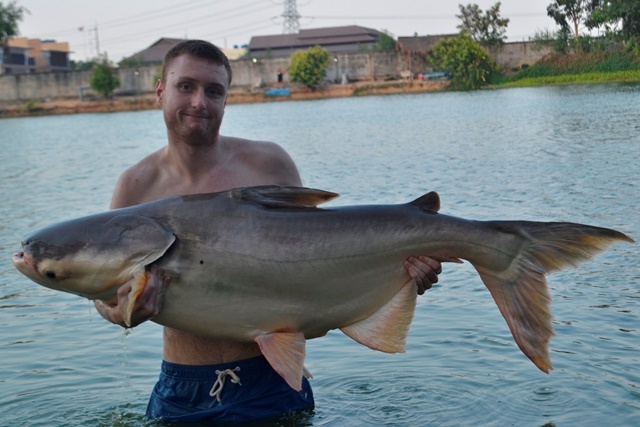 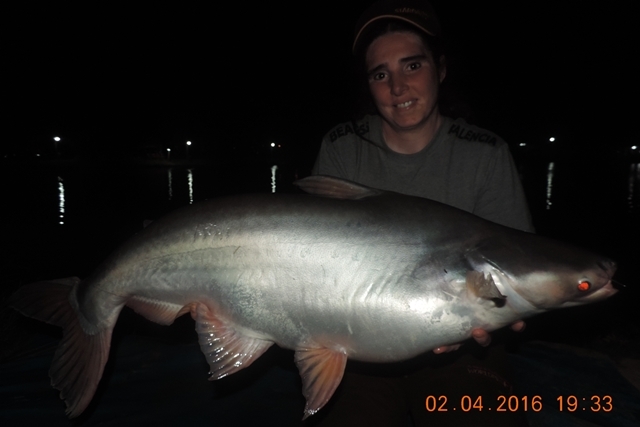 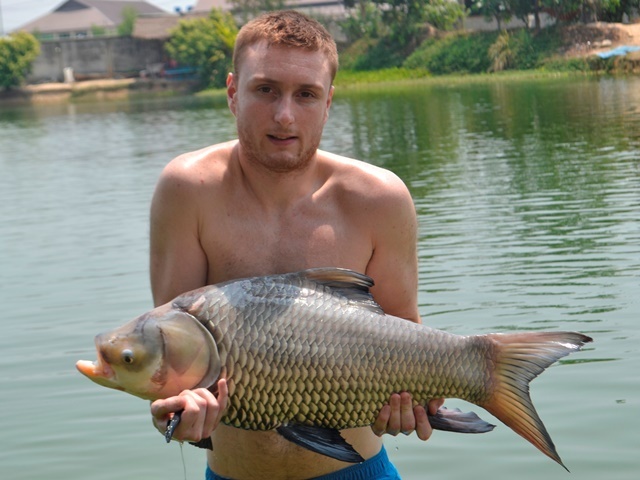 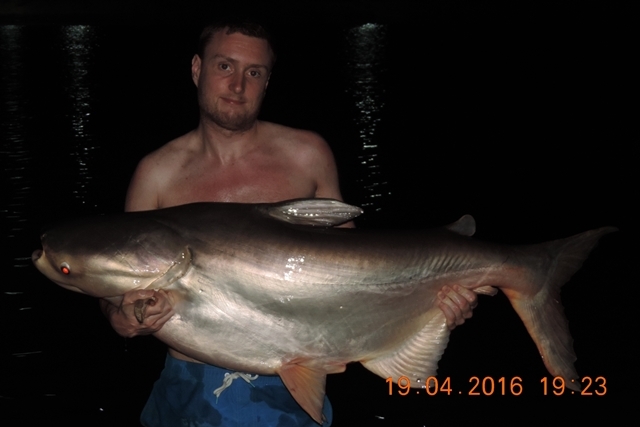 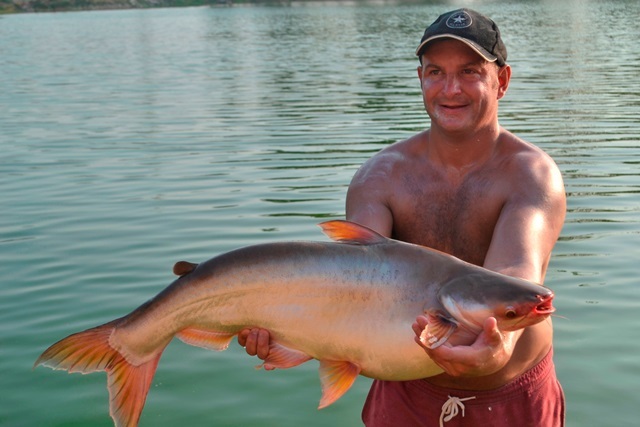 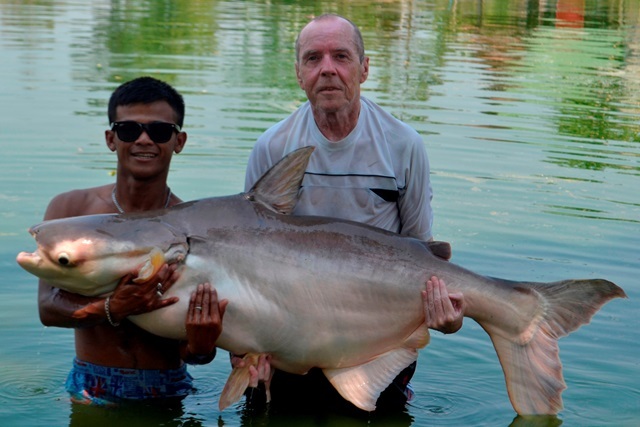 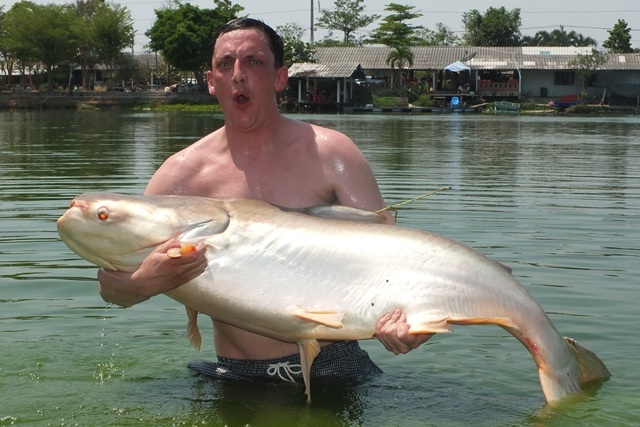 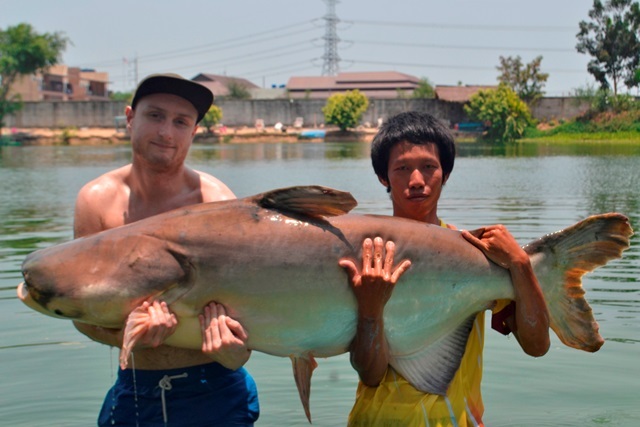 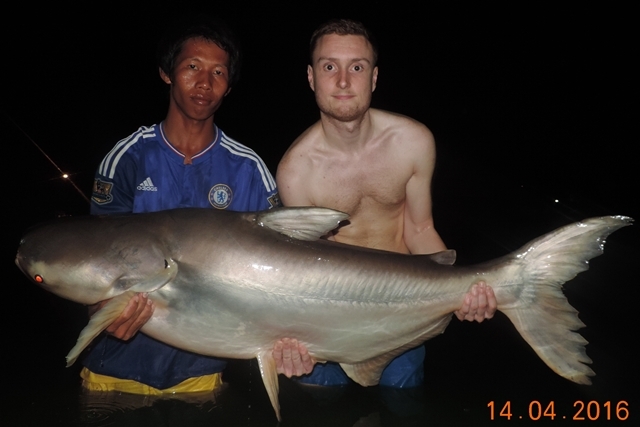 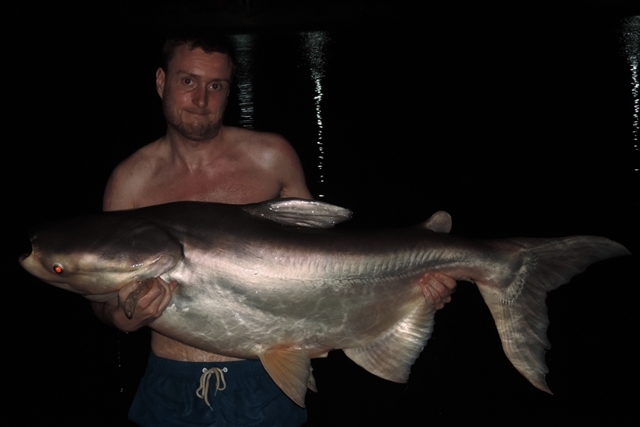 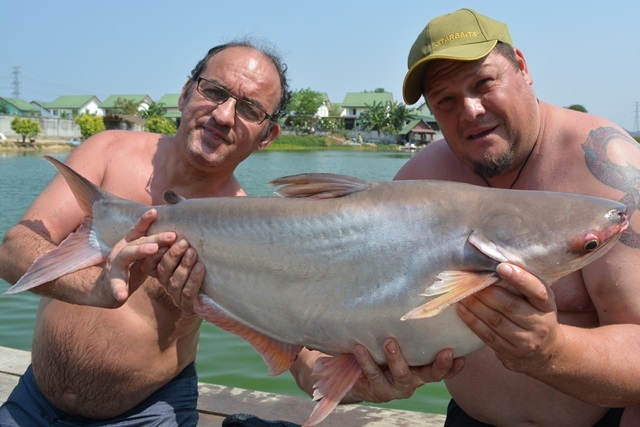 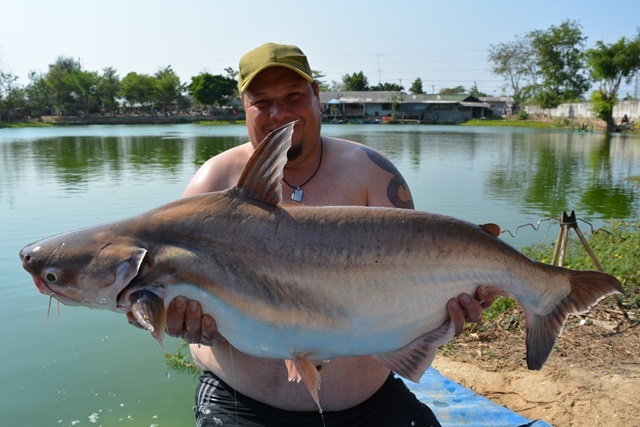 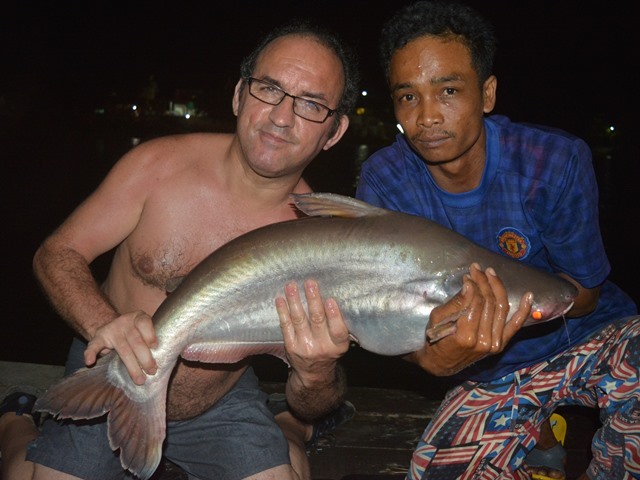 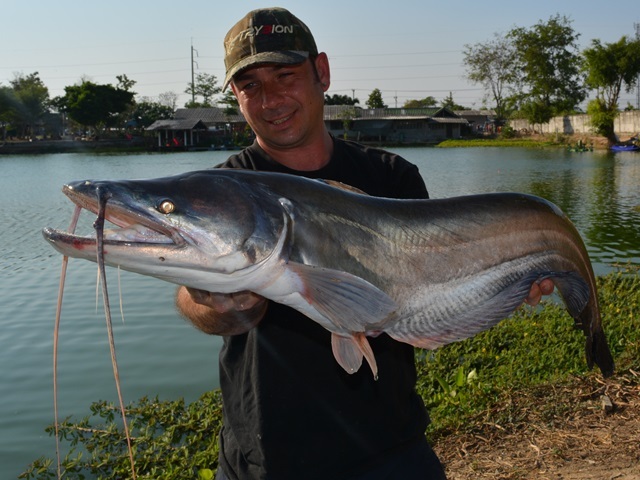 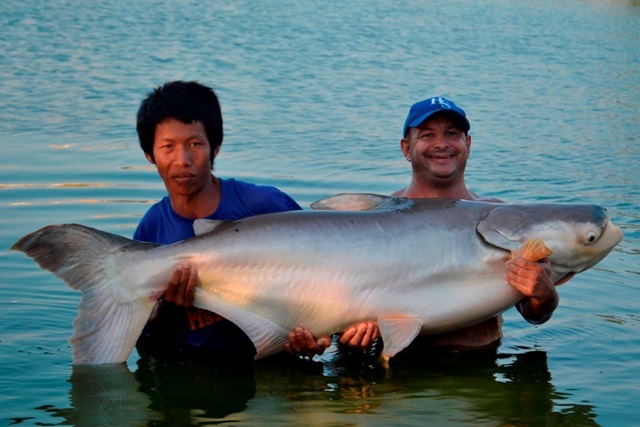 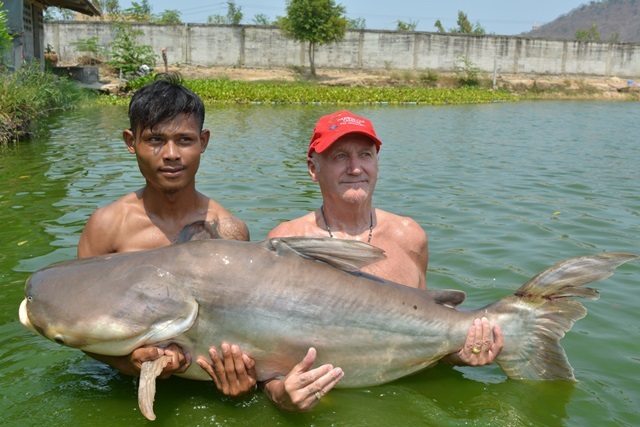 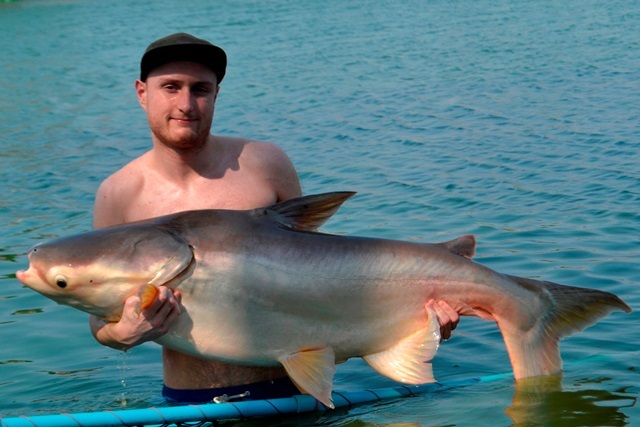 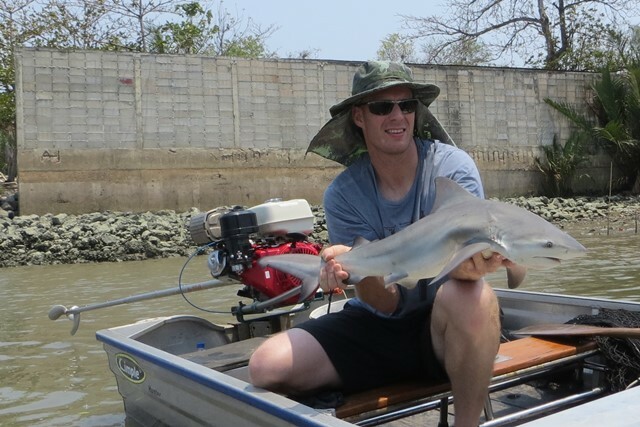 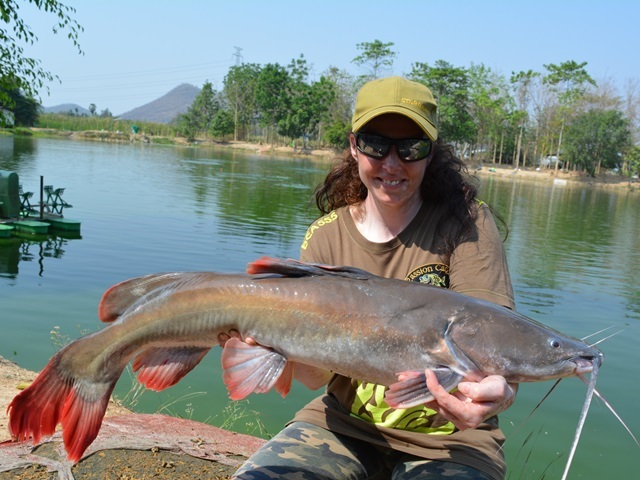 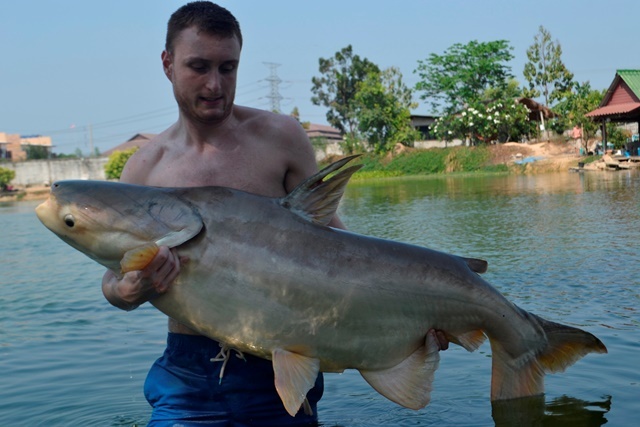 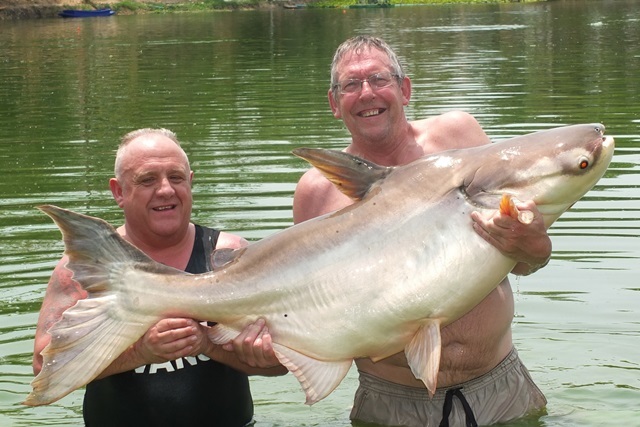 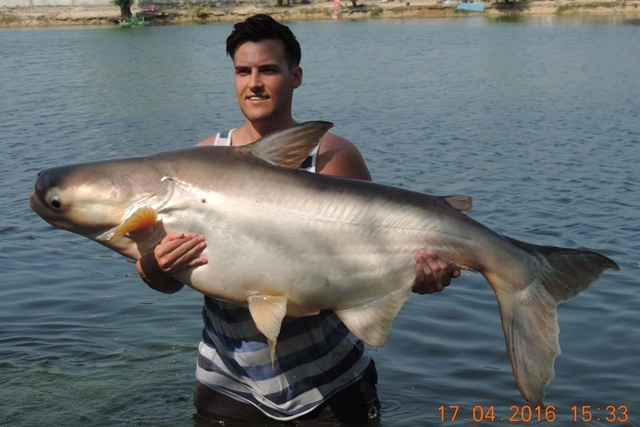 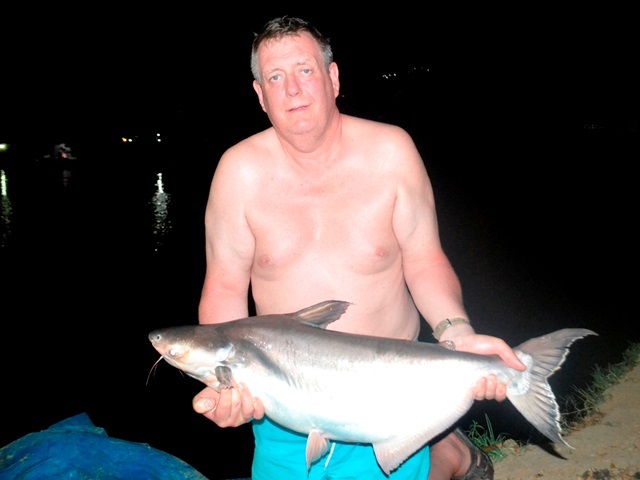 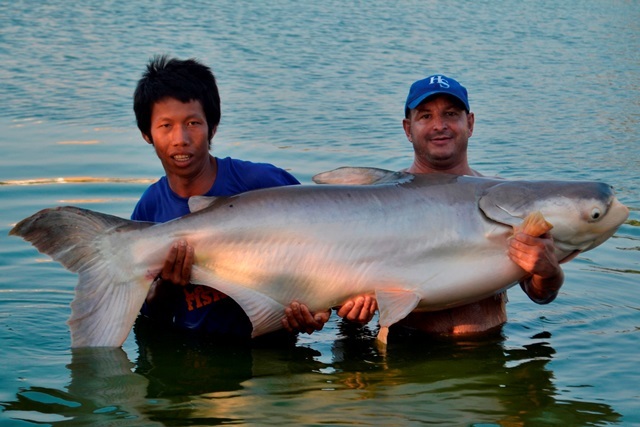 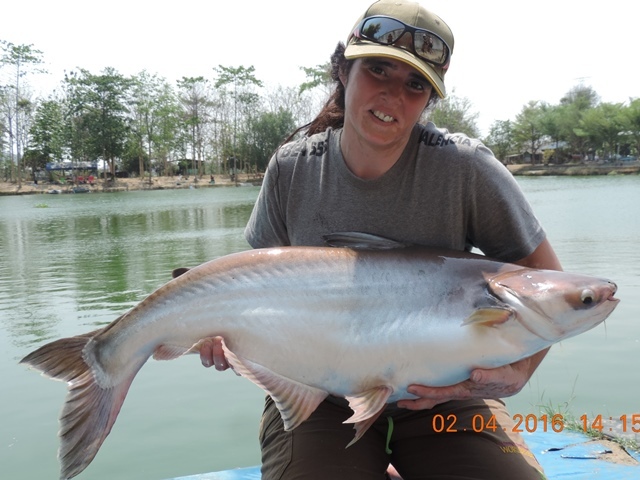 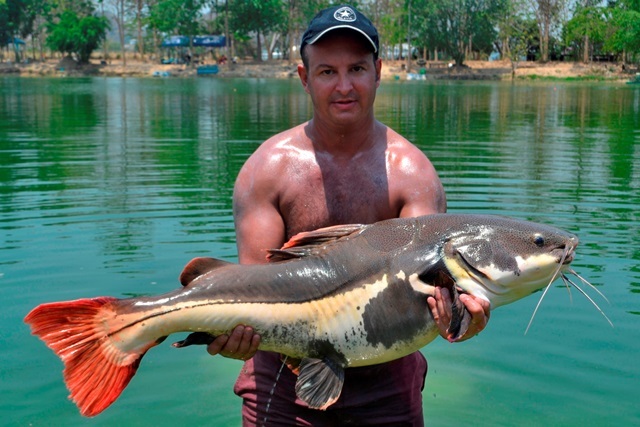 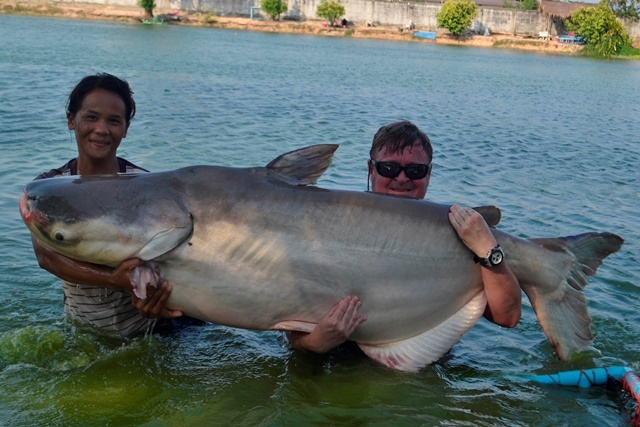 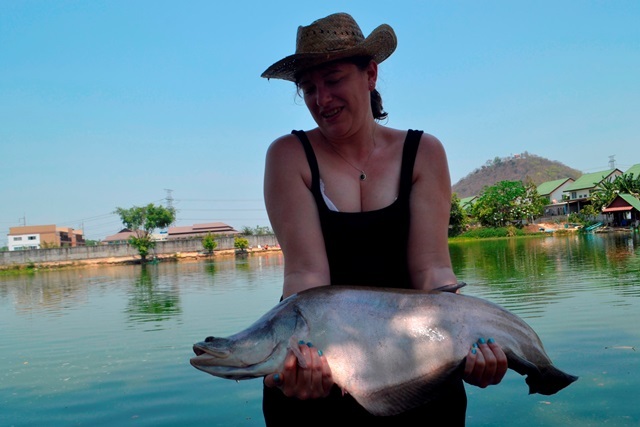 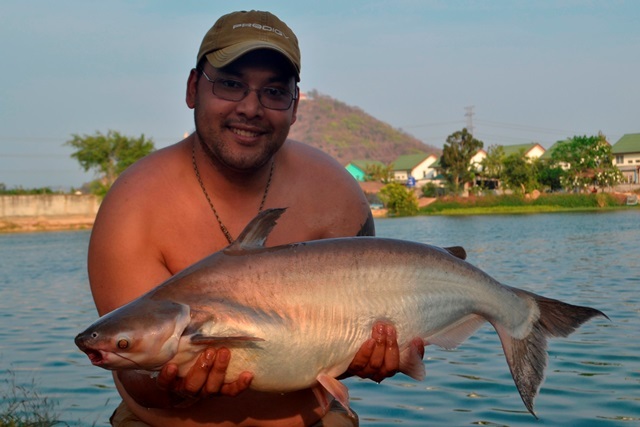 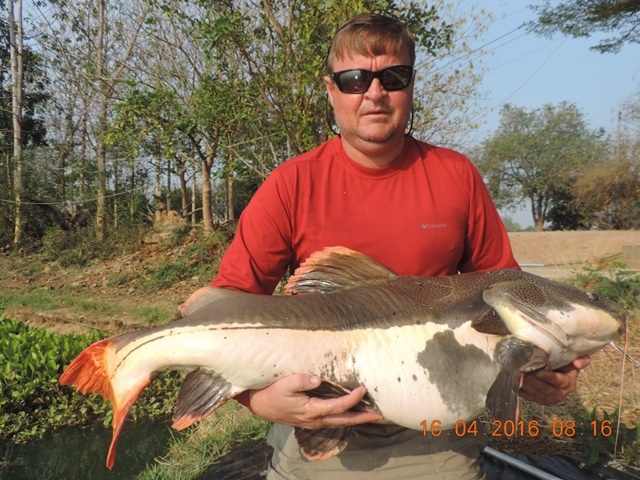 Chris Reynolds and his fishing mate also visited during the month catching some nice Mekong catfish. 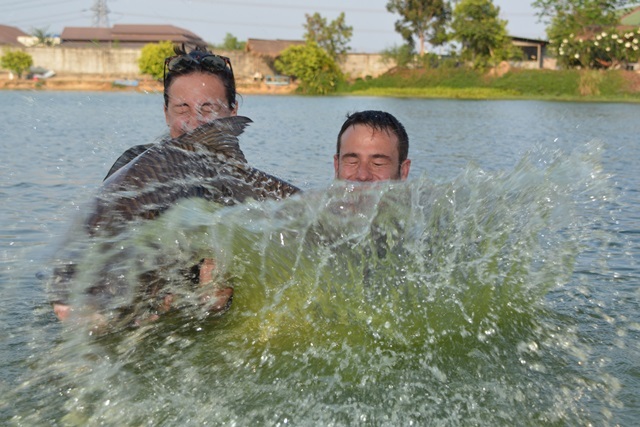 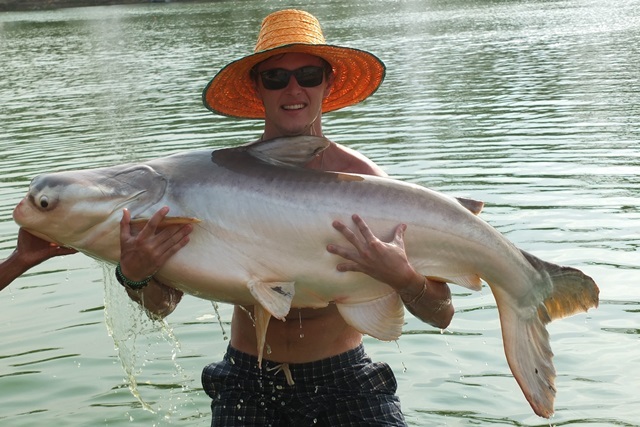 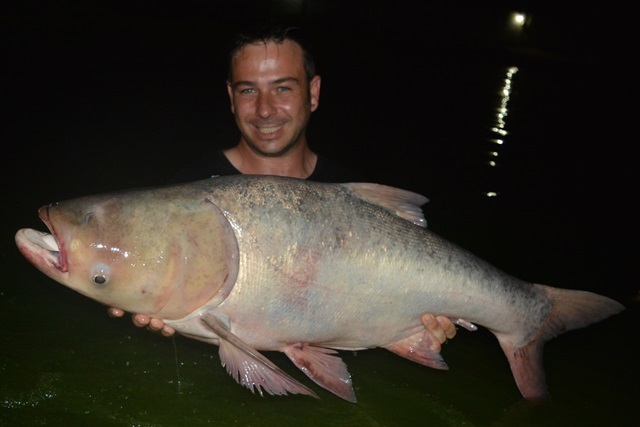 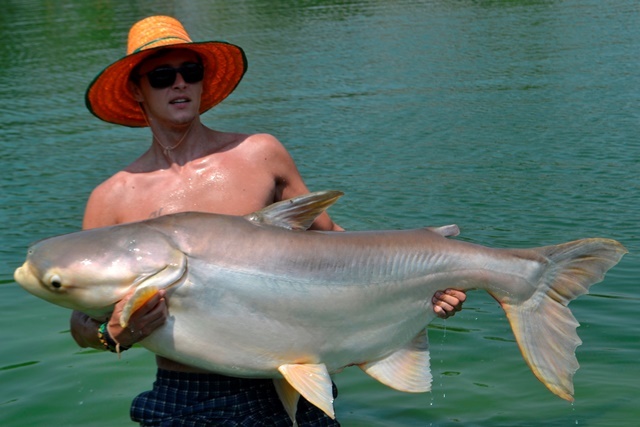 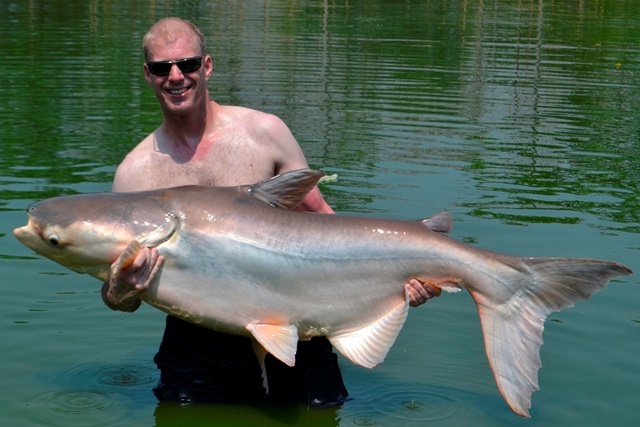 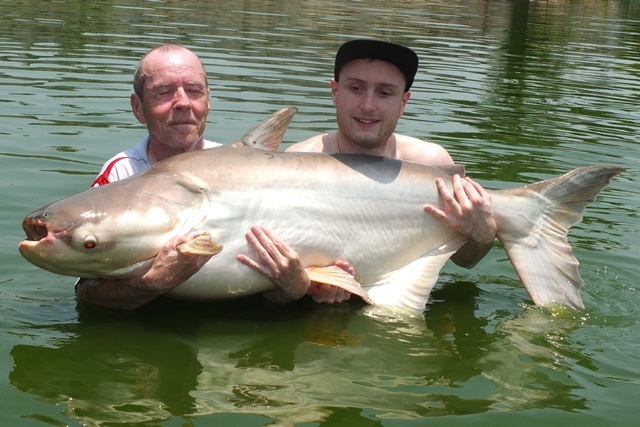 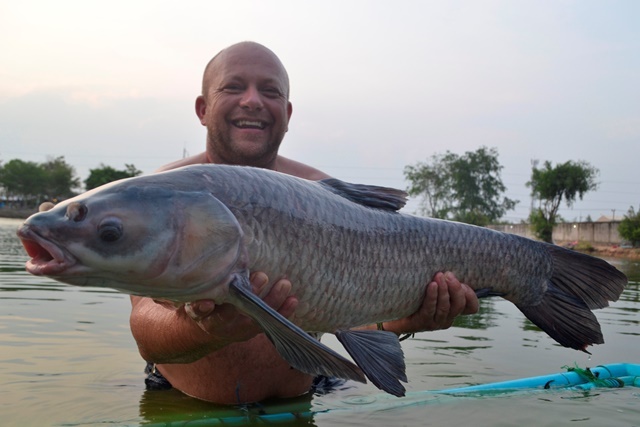 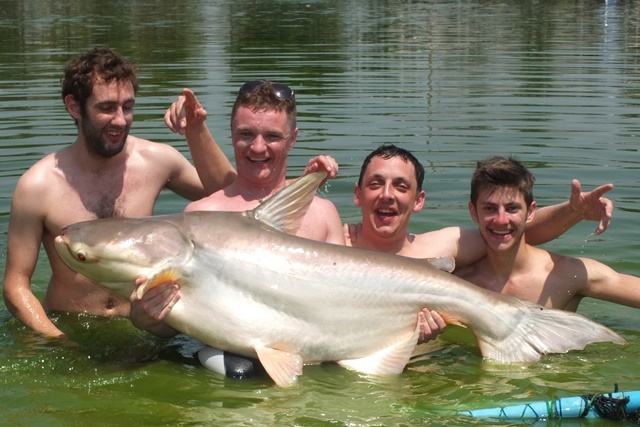 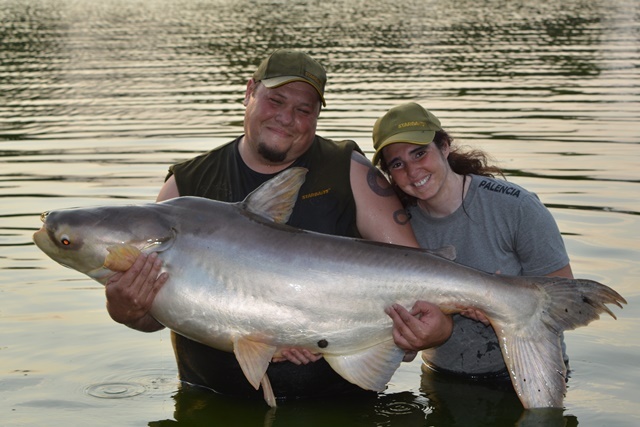 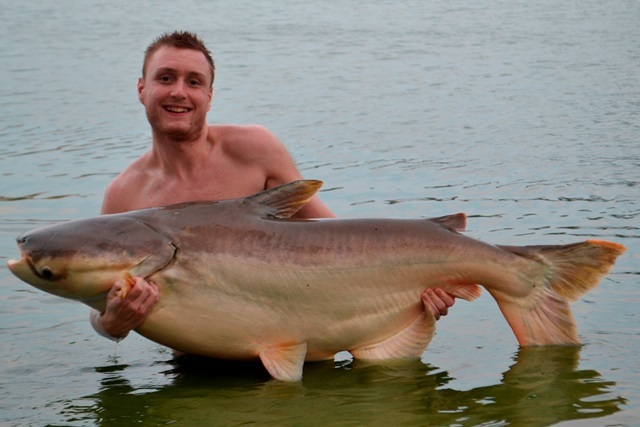 Nathan and Chris Cobb make their first visit during the month catching big-Y catfish and Siamese carp.